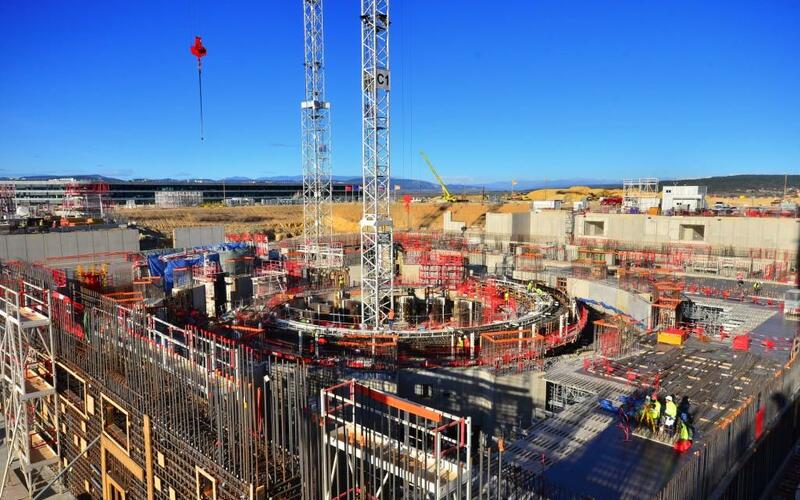 30 tonnes of abrasive sand projected with high pressure on the inside wall of the Tokamak Pit have created the rough surface that optimizes nuclear paint adherence. 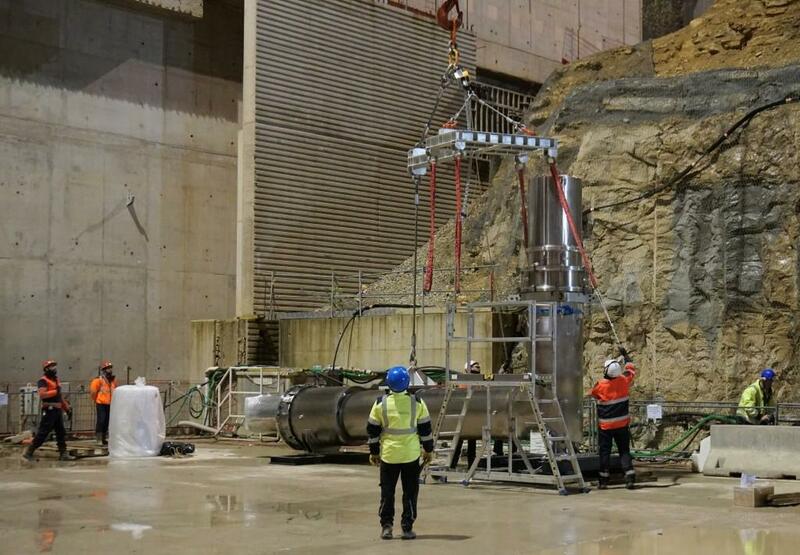 The application of decontaminable "nuclear paint" will begin as soon as hot air blowers have brought the vast volume of the Pit (25,000 m³) to the required temperature of ~20 °C. 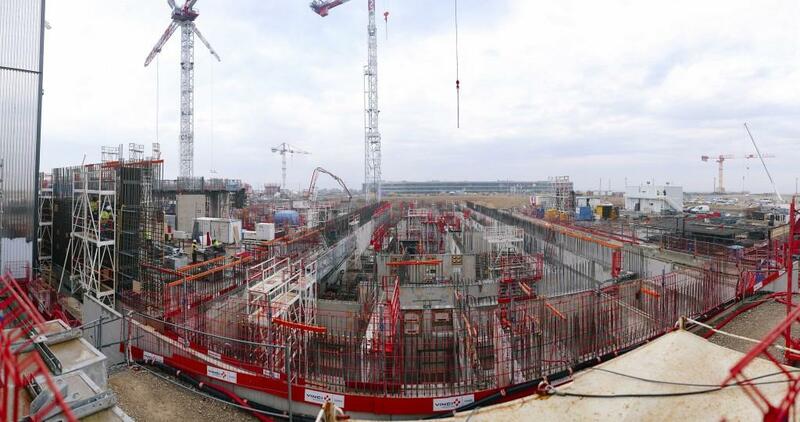 In the Tokamak Building, contractors are preparing to pour the last concrete slabs that will cover the open galleries to the left and right of the machine well. 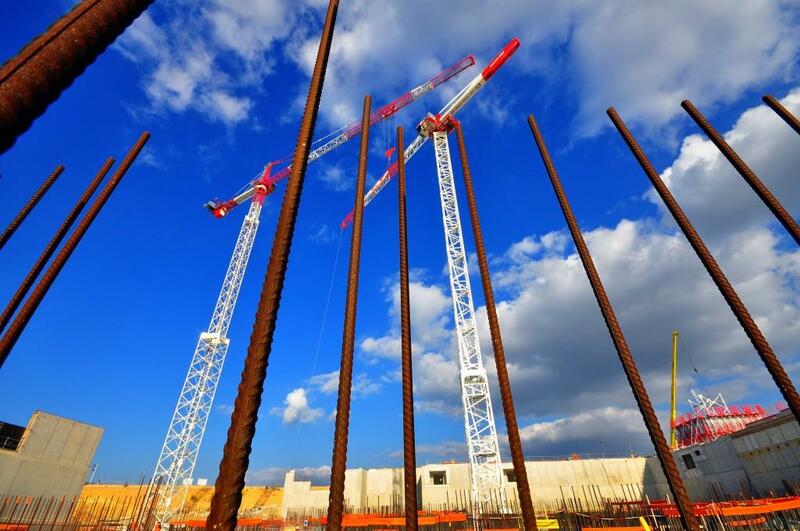 By summer, the first metal pillars will be rising for the Tokamak Crane Hall. 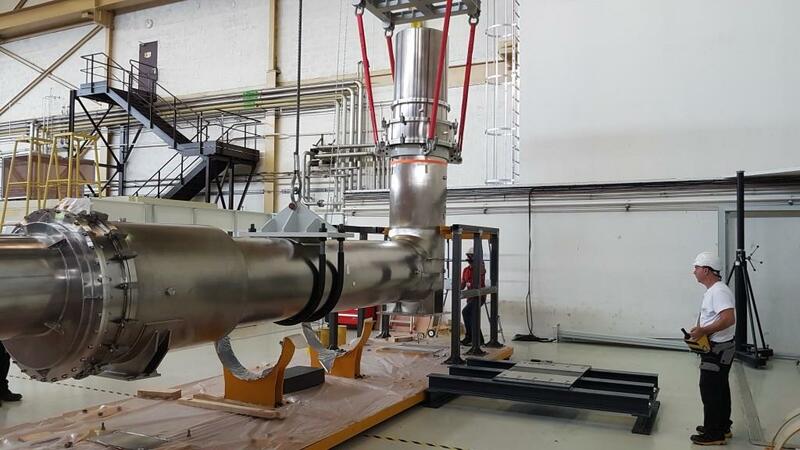 The first massive machine component—the cryostat base—is schedule for installation in March 2020. 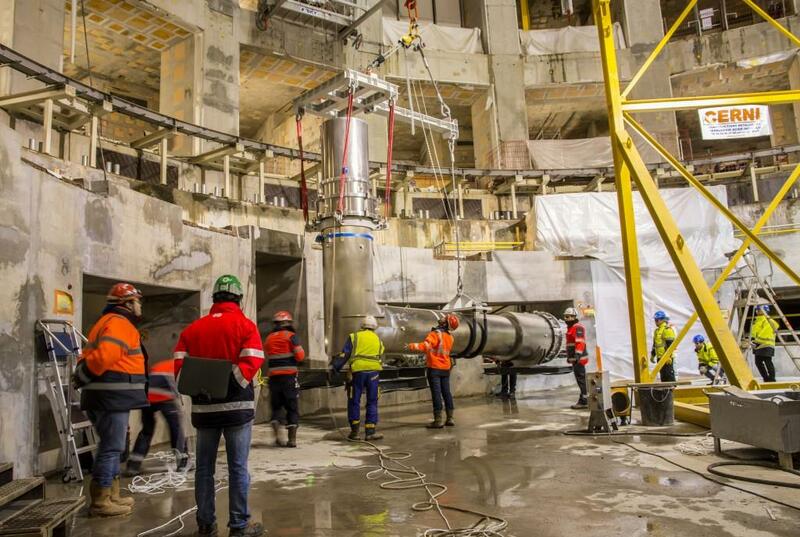 European contractors are installing massive support pieces for the pillars of the Crane Hall. 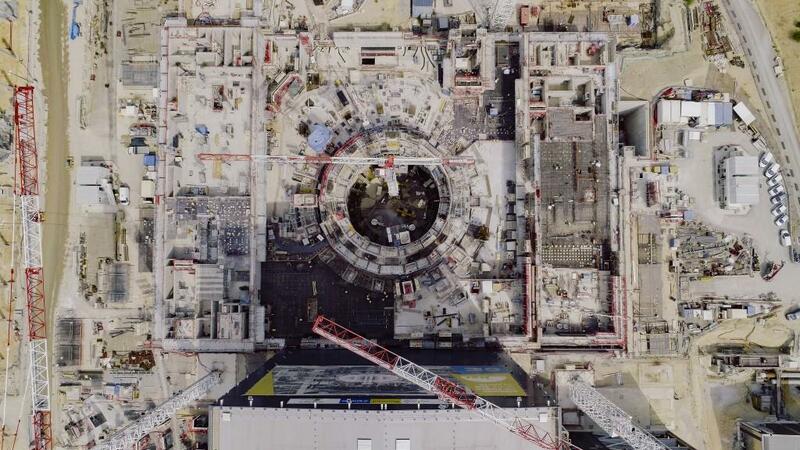 The first examples can be seen by visually tracing a line that extends from the wall of the Assembly Hall (right side) to the end of the Tokamak Building. 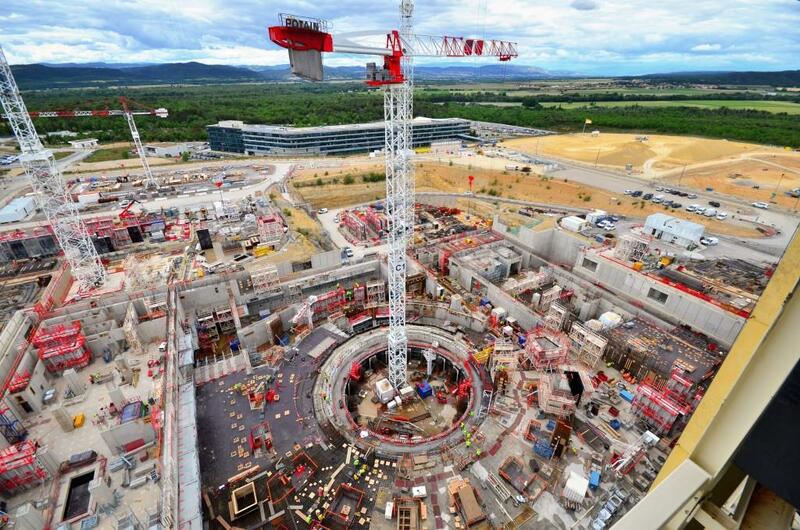 Photo taken from the roof of the ITER Headquarters building. 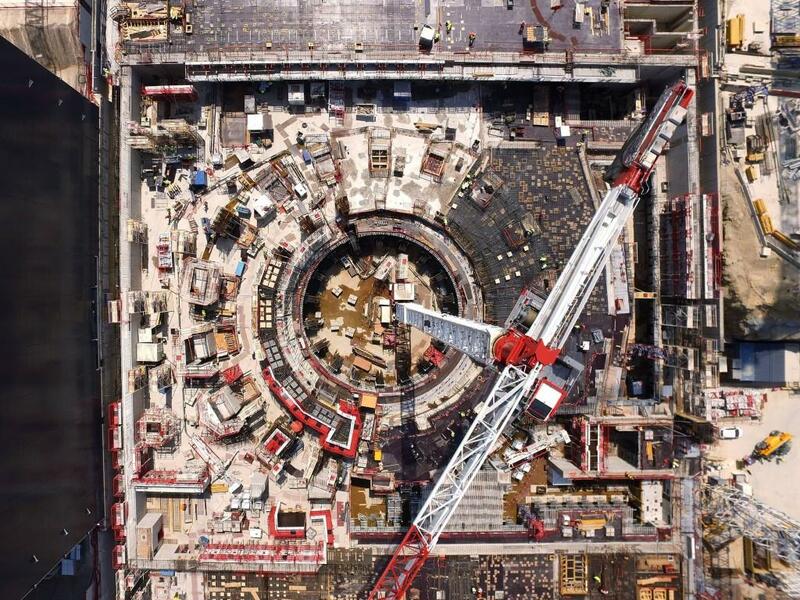 The Tokamak Complex, with a cut-out in the centre for machine assembly. 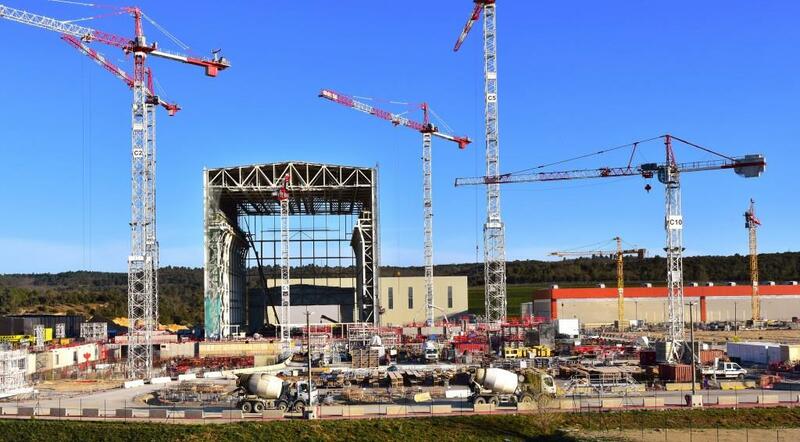 Large cranes will begin travelling from the Assembly Hall over the Tokamak Pit (centre) with their heavy component loads in one year—March 2020. 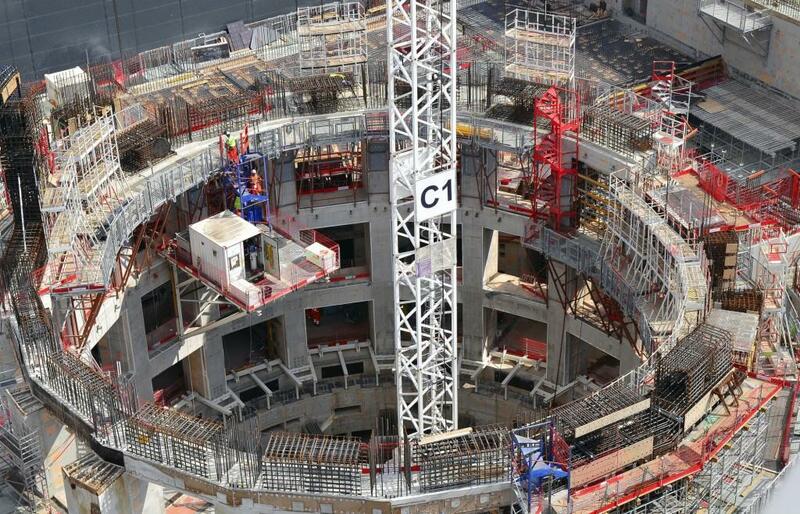 The Tokamak Building has reached its maximum height ... in terms of concrete that is. 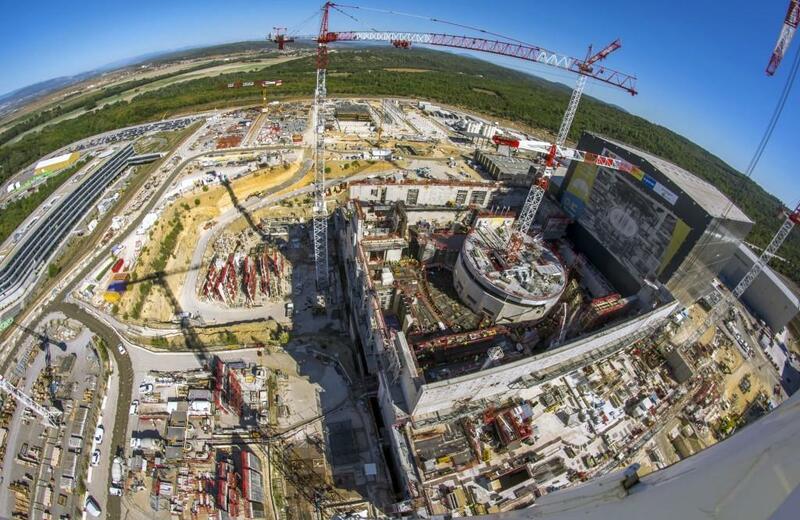 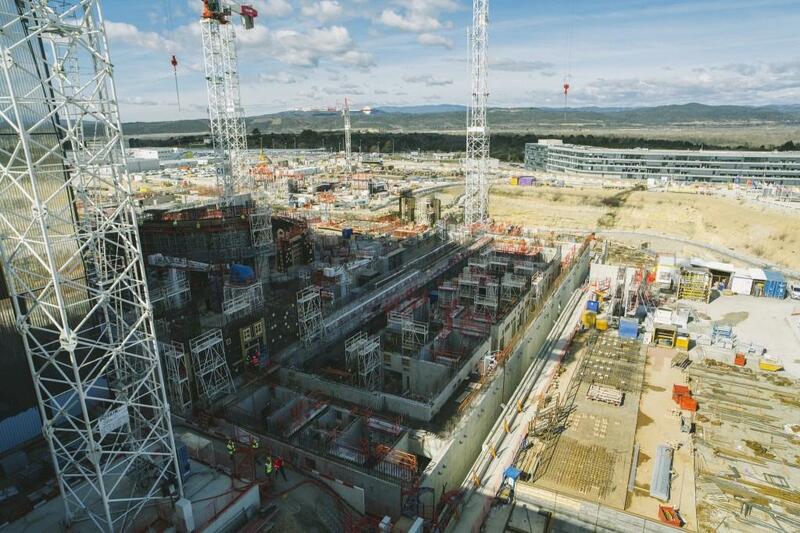 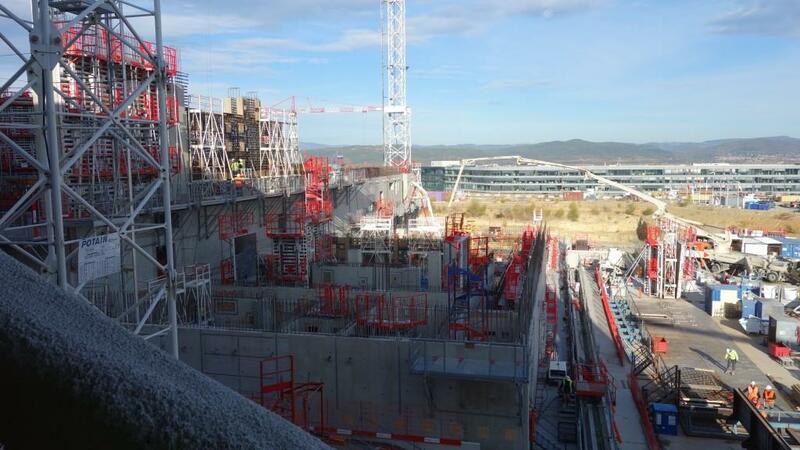 The tallest corner in this image represents the last concrete level of the building that will house the ITER machine. 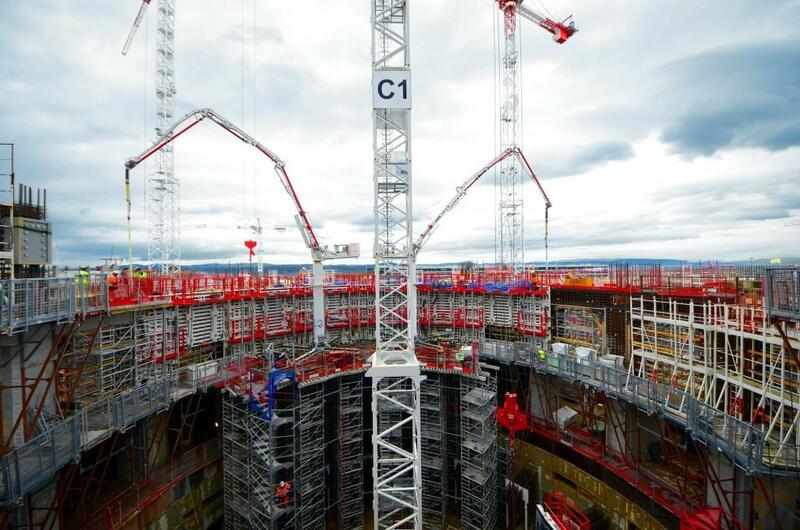 Above that, a steel structure will enclose the area used by the overhead cranes as they deliver their component loads to the Tokamak Pit. 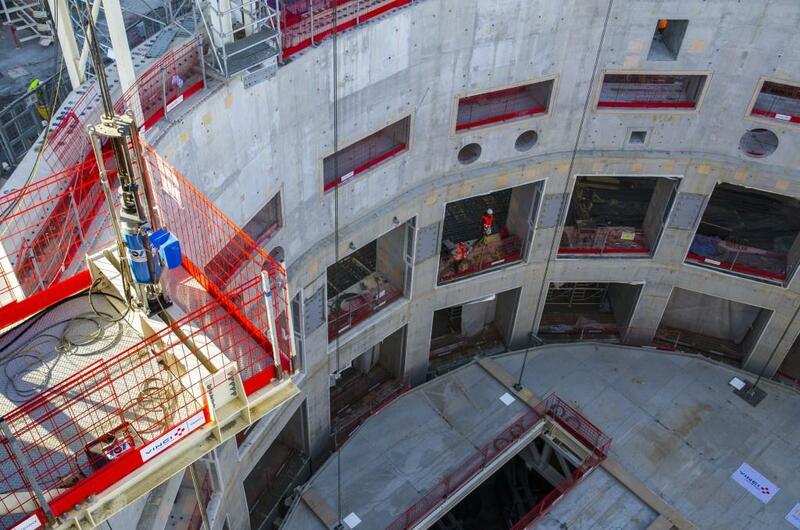 This welder is working on the installation of one of the Tokamak Building's 46 nuclear doors. 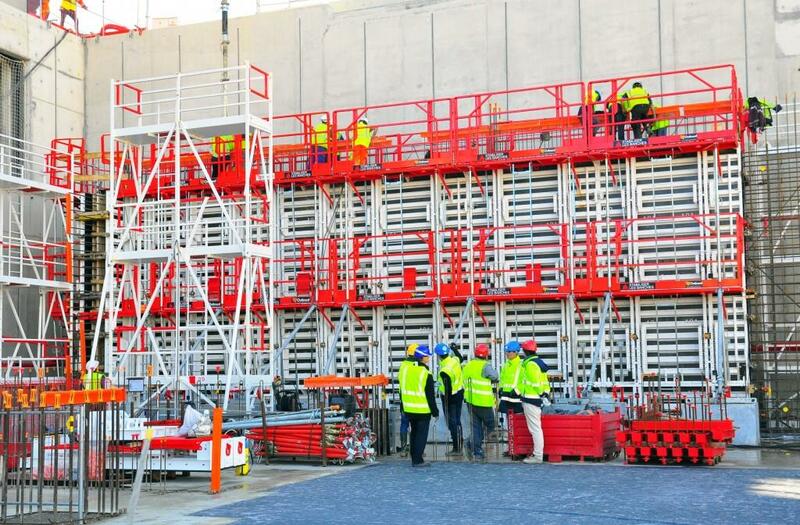 The port cells have been closed off by temporary "curtains" in order to prepare the Tokamak Pit for painting. 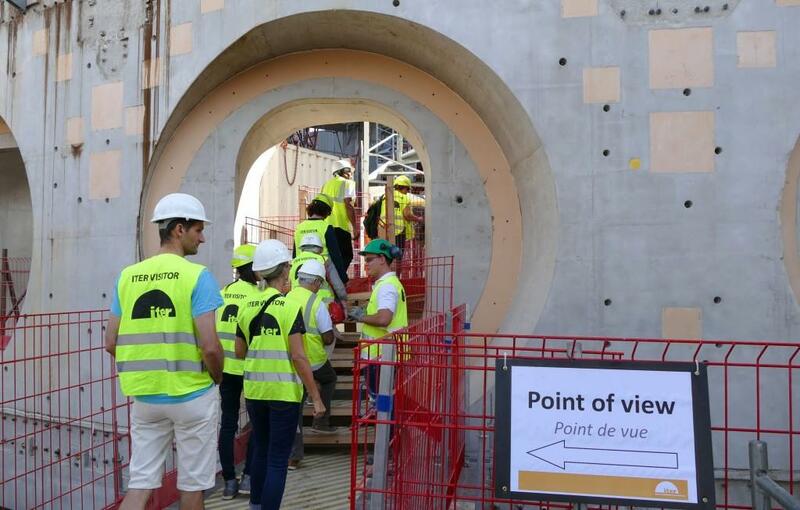 Between two very different worlds—the concrete labyrinth of the Tokamak Building and the vast open volume of the Assembly Hall—this small door has been created to facilitate VIP visits. 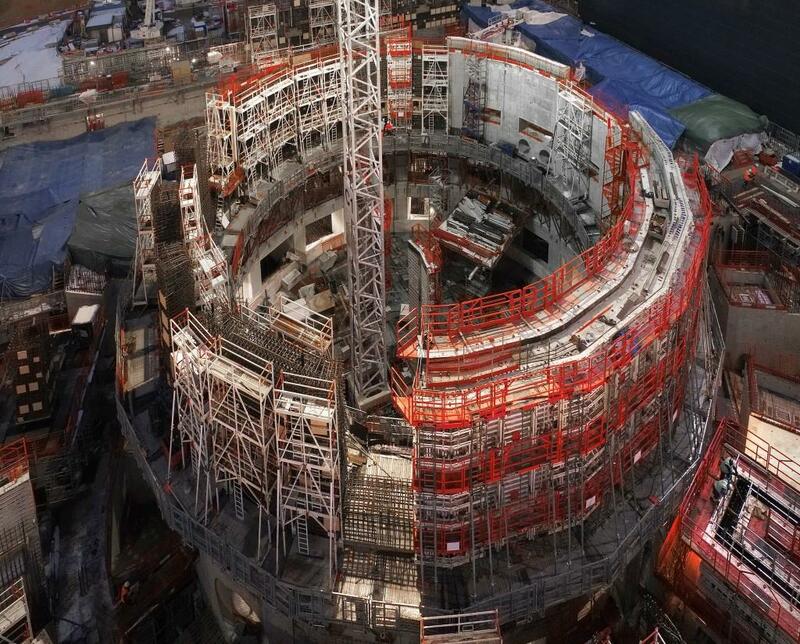 Replicating a 40-degree section of the Tokamak crown—a challenging structure characterized by unique geometry, high-density steel reinforcement and high-performance concrete—this mockup was built on site to demonstrate crown constructability. 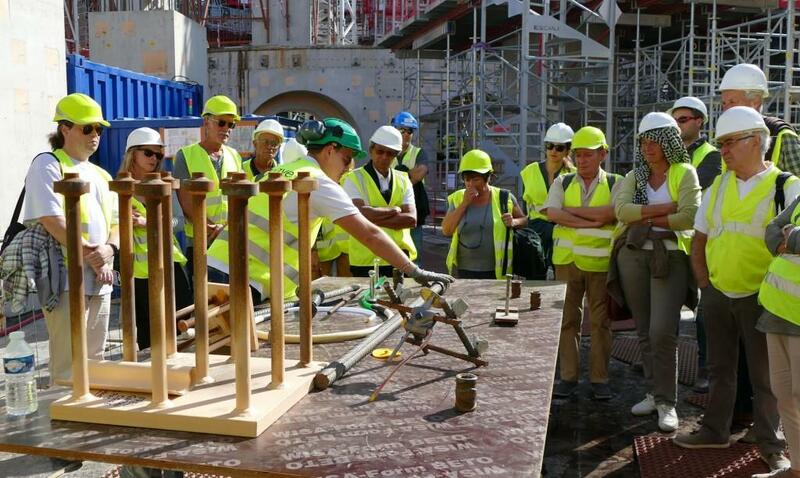 Now that its mission has been fulfilled, the teams are leaving a trace of their participation by "signing" the work. 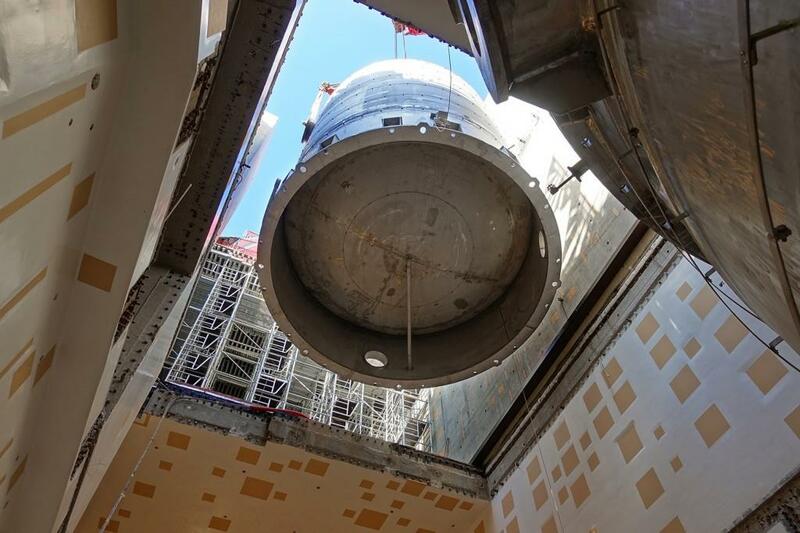 This opening in the 3.5-metre-thick bioshield was specially designed to house the part of the feeder that crosses through the bioshield and cryostat—the feedthrough. 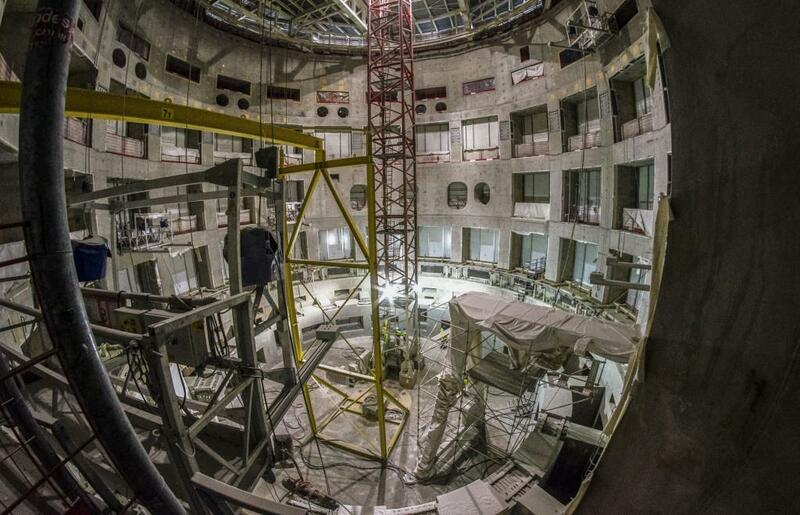 Thirty-one feeders in all will find their way through galleries like this to reach the ITER magnets. 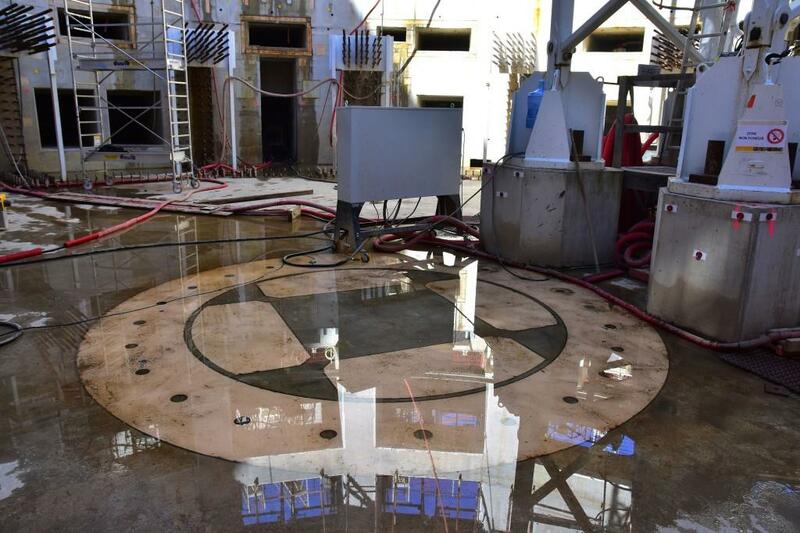 Into the slim opening of the cryostat crown: a break in the concrete had been left by building contractors for the installation of the cryostat feedthrough for poloidal field coil #4. 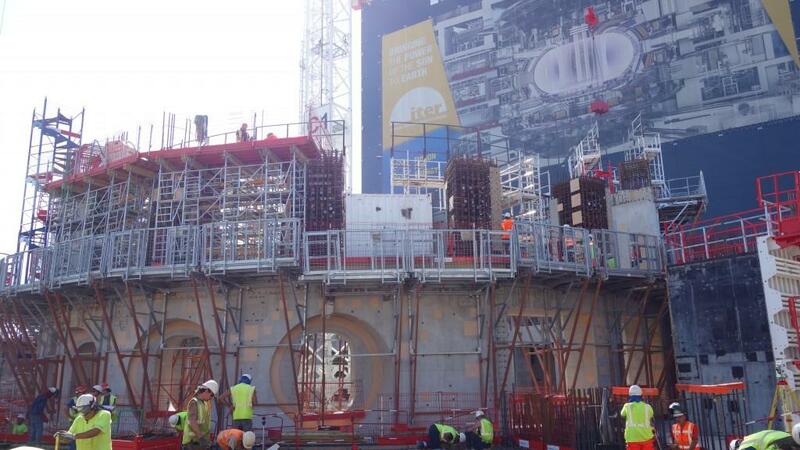 The operation was successfully carried out on 6 December. 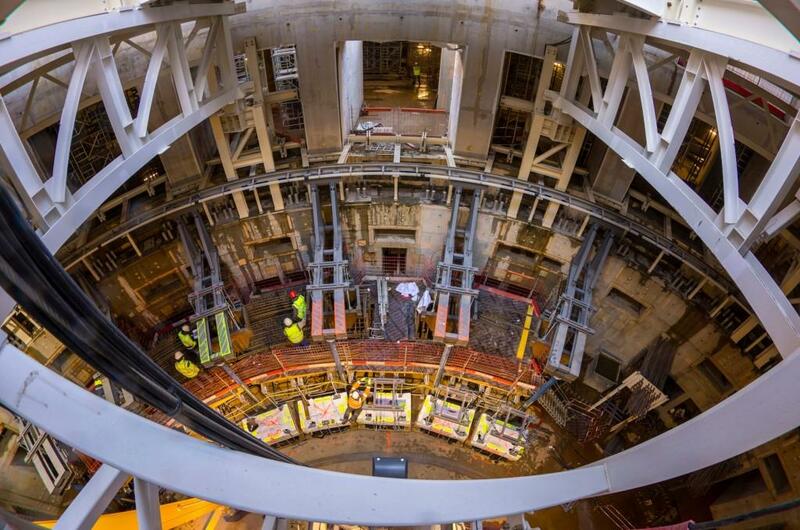 At the bottom of the machine assembly pit, the first metal component has been inserted into its bay. 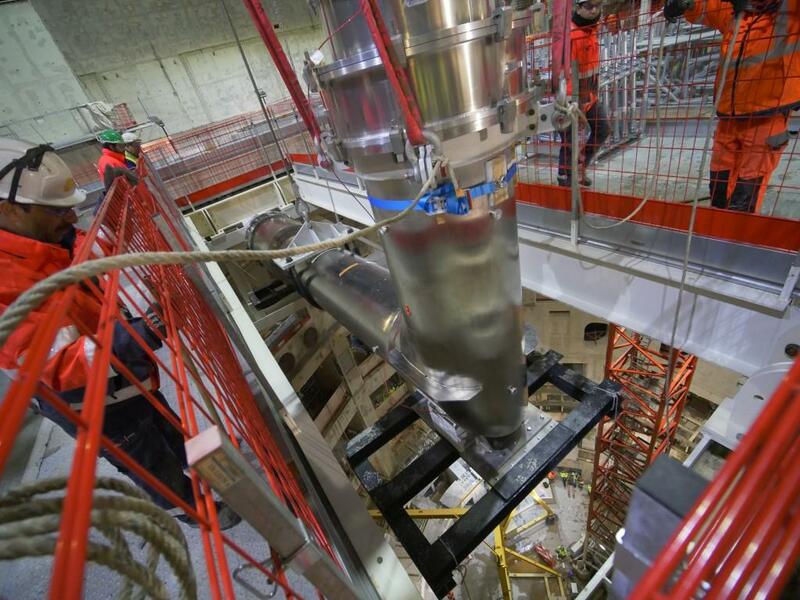 Metrologists are recording its "as-installed" position, as this component will be assembled with two other sub-assemblies to form the full magnet feeder for poloidal field coil #4. 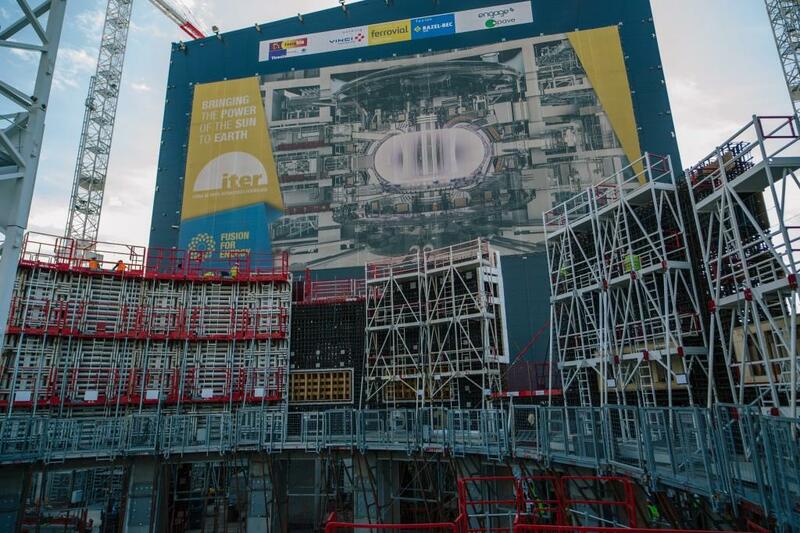 Thirty-one feeders in all will deliver electricity, cryogens and instruments to the ITER magnets. 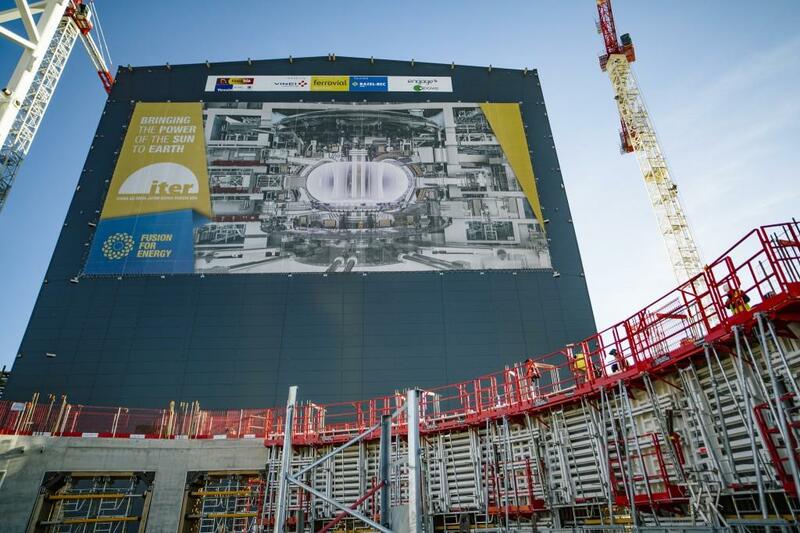 Standing now on the tall north-facing wall of the Tokamak Building, the ITER photographer is able to capture all of the activities going on around the machine well at L3 level. 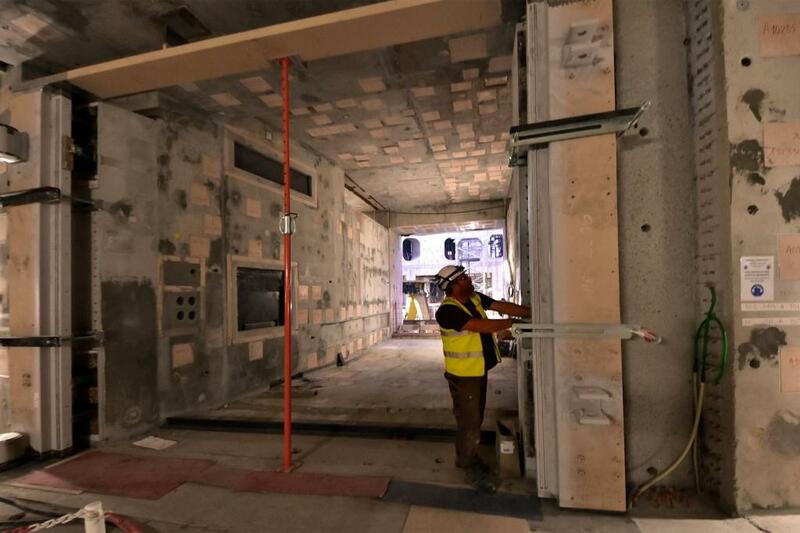 The space in these outlying galleries will be completely filled with equipment and systems. 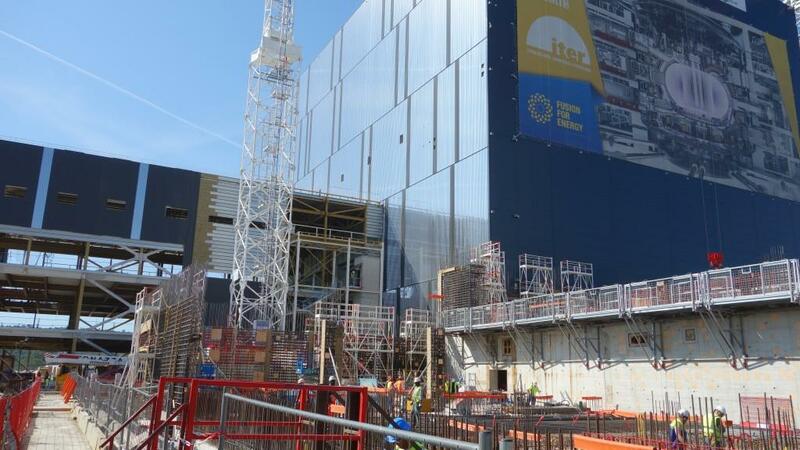 The Tokamak Building, seen rising alongside the metal-clad Assembly Hall. 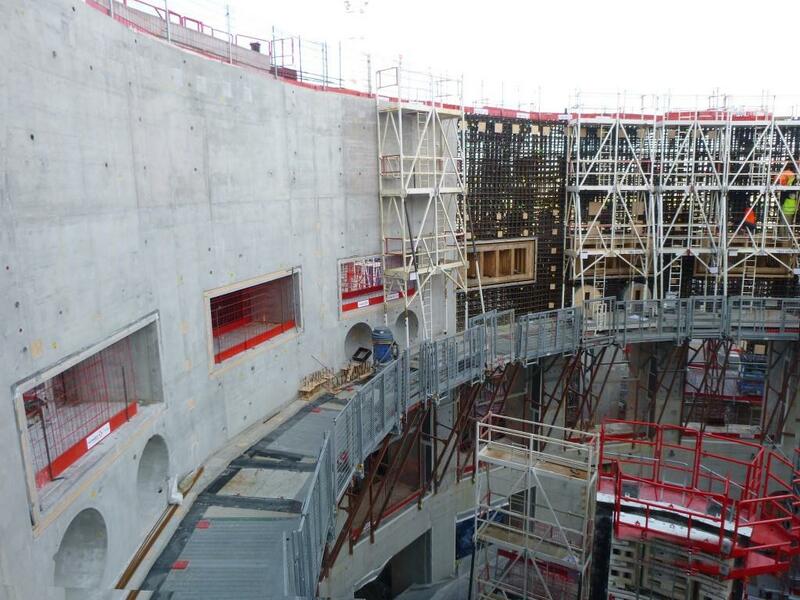 On the other side of this north-facing wall is the circular well where the machine will be assembled. 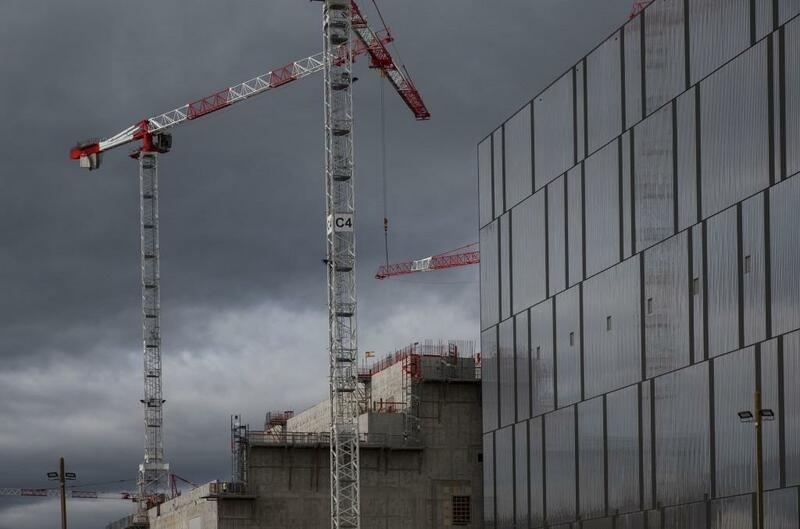 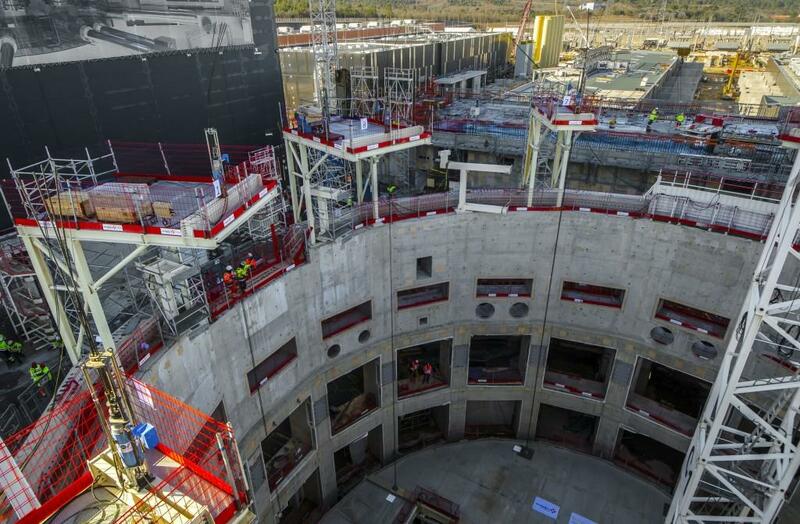 European contractors are working to close up the building over the Tokamak Pit in time for heavy assembly works to begin in March 2020. 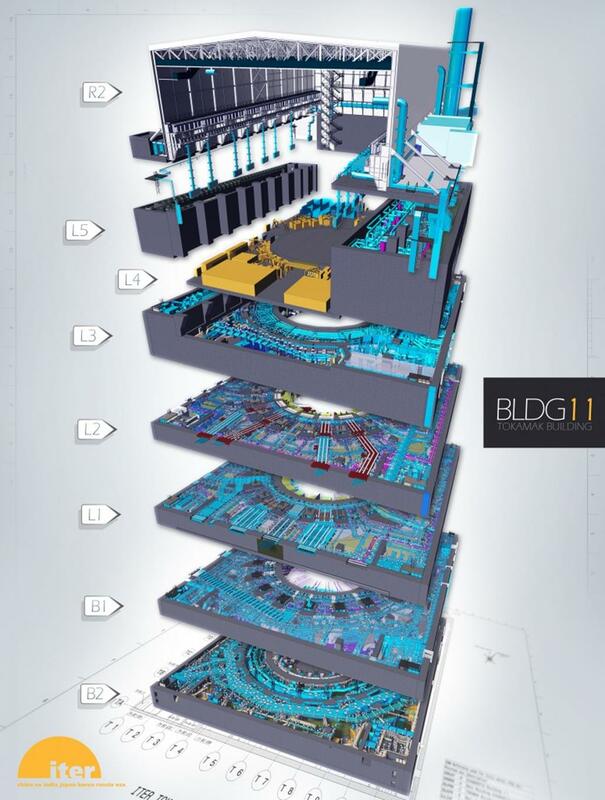 The feeder array for the ITER magnets is composed of over 100 main components. 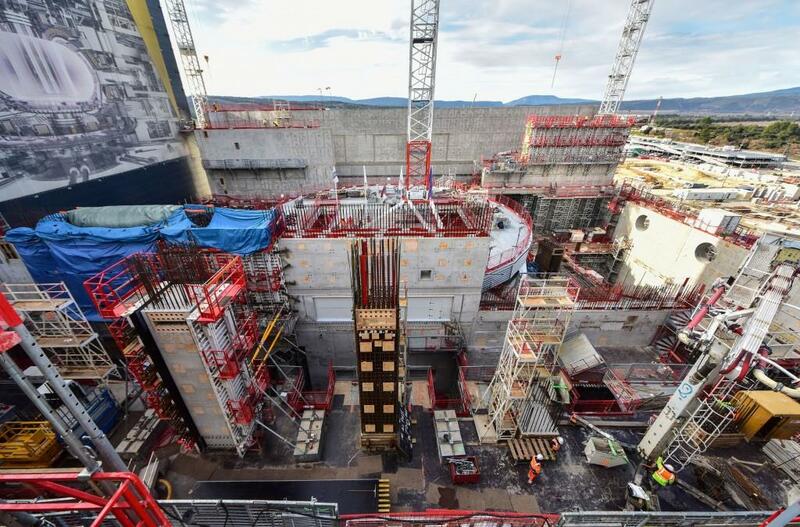 This one was scheduled for delivery ahead of the others because of its particular shape and its installation configuration at the lower level of the Tokamak Pit. 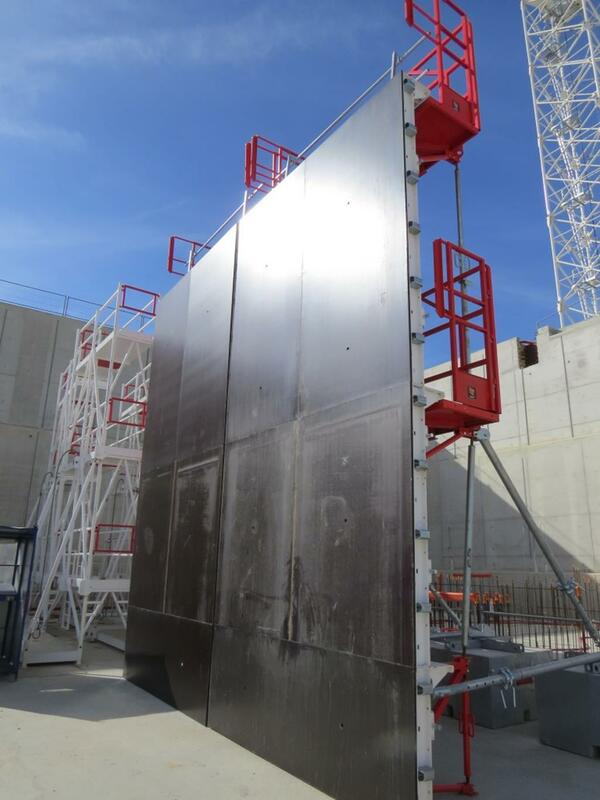 The magnet feeder component passes through one of the openings of the temporary bioshield lid. 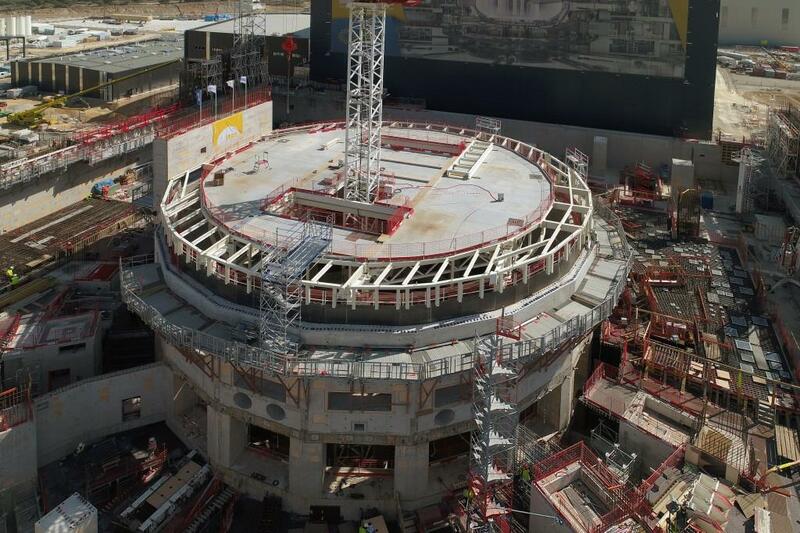 This lid will remain in place until the Tokamak Building roof is completed. 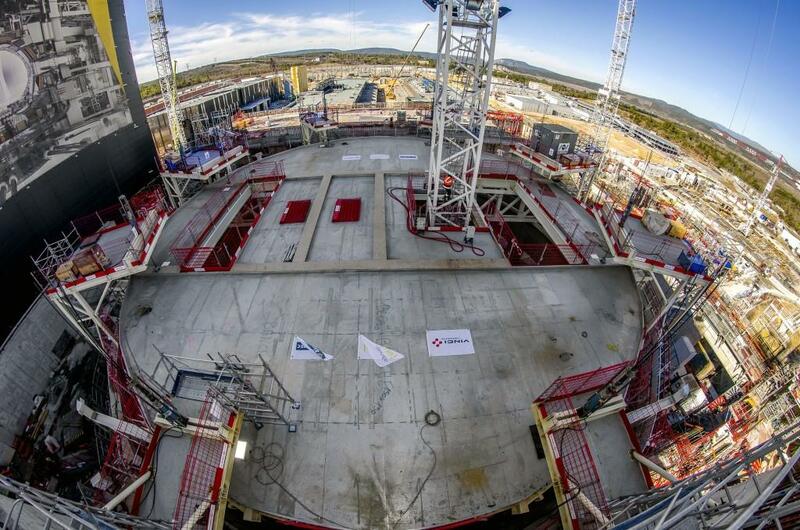 The cryostat feedthrough begins its 30-metre descent—the first metal component of the ITER machine to enter this space. 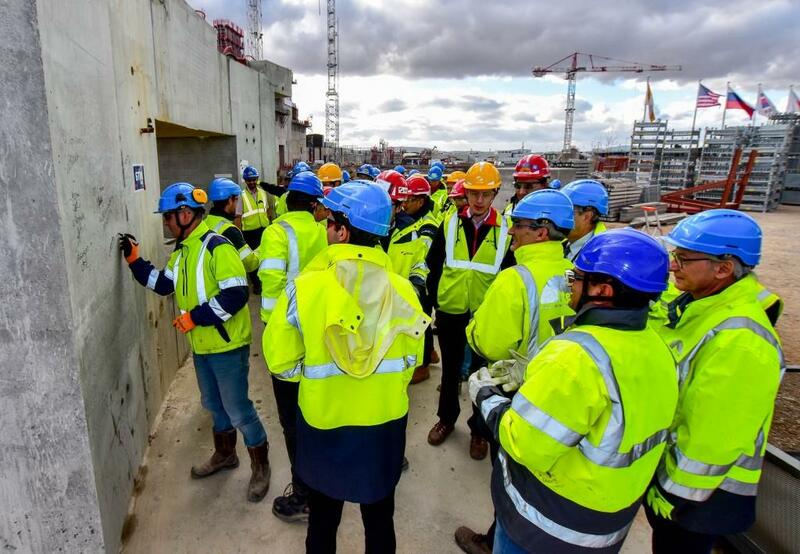 A quick halt near the bioshield, up at the top of the Tokamak Complex, as the team organizes the equipment for the final lift. 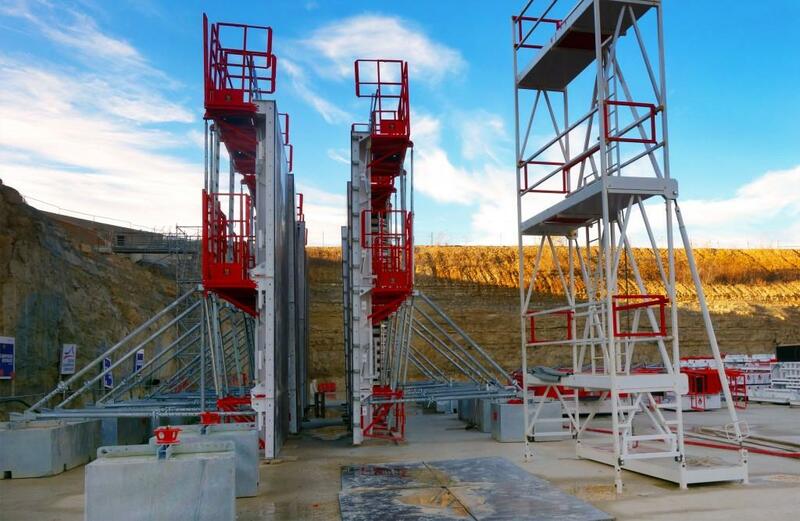 Feeders will reach the magnets by either crossing through the lower level of the bioshield—passing under the machine—or through the top level, passing over. 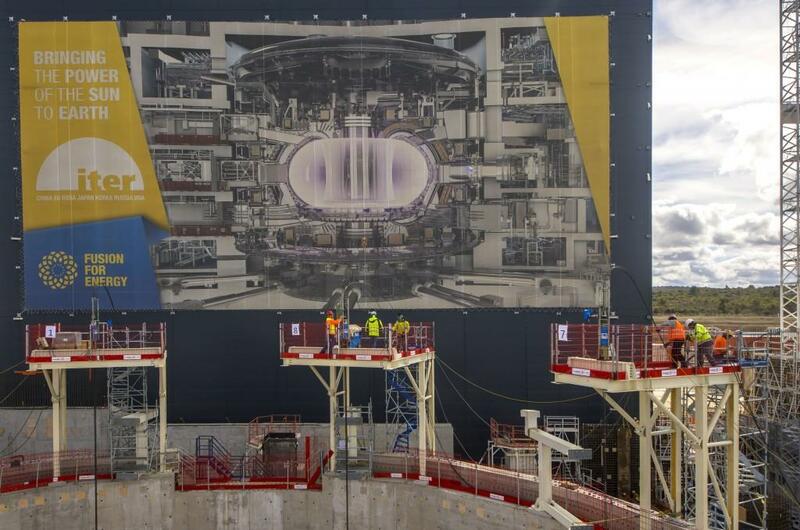 The 10-metre, 6.6-tonne component (part of a magnet feeder for poloidal field coil #4) is slowly lifted up and over the wall of the Tokamak Complex, to be posed near the top of the ITER bioshield. 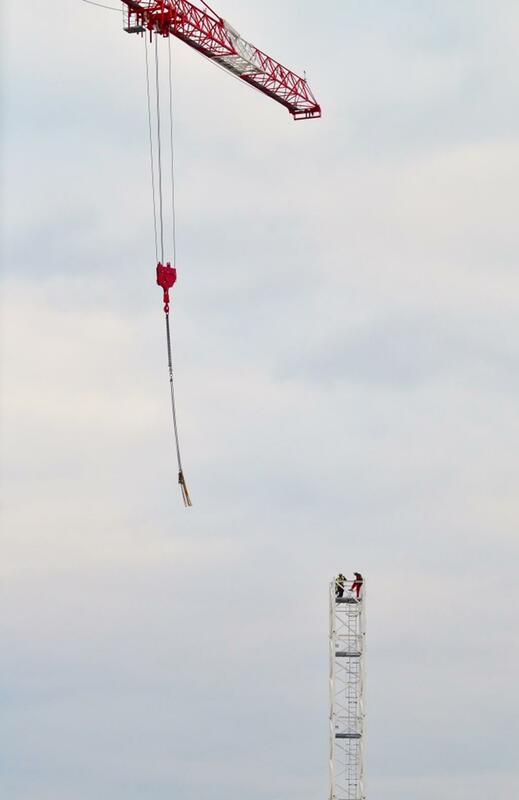 From there, it will be lowered into the pit. 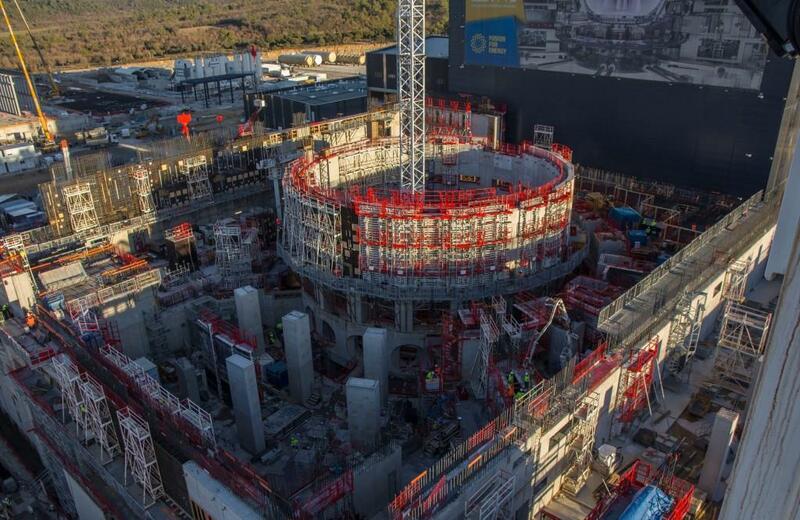 The Sun had just set on the ITER worksite when the cryostat feedthrough for poloidal field coil #4—a big, shiny stainless-steel pipe bent at a 90° angle—was slowly lifted from the Hot Cell zone to be deposited on the third level of the Tokamak Building. 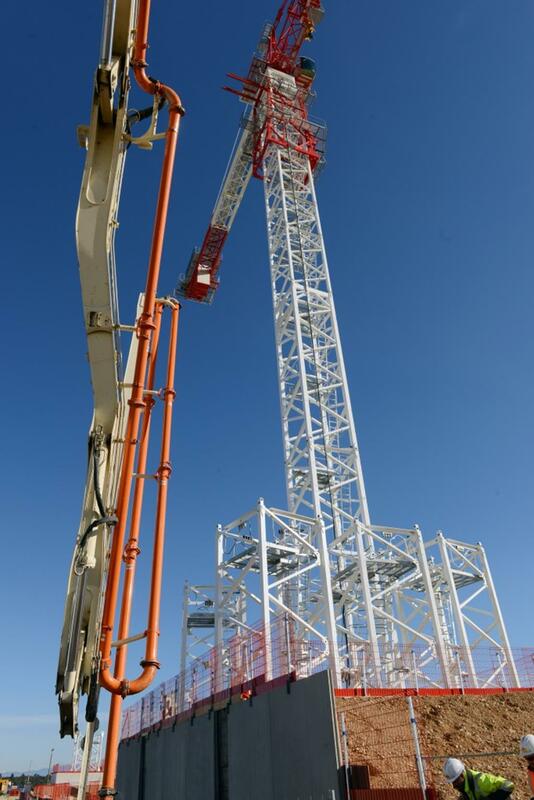 In light grey, a special handling frame that was designed and procured by the Korean Domestic Agency specifically for this operation. 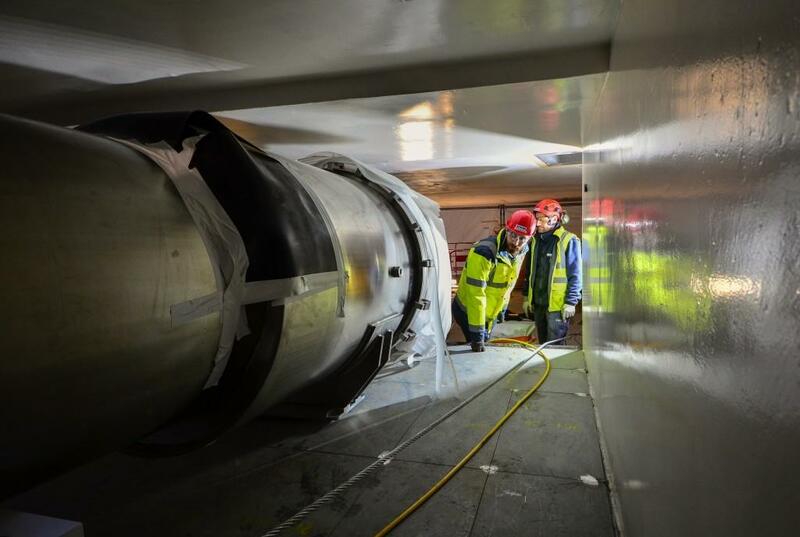 The first metallic component to be installed in the machine pit—a feeder component—had been delivered by China for testing to the Magnet Infrastructure Facilities for ITER (MIFI), next door on the CEA site, one year ago. 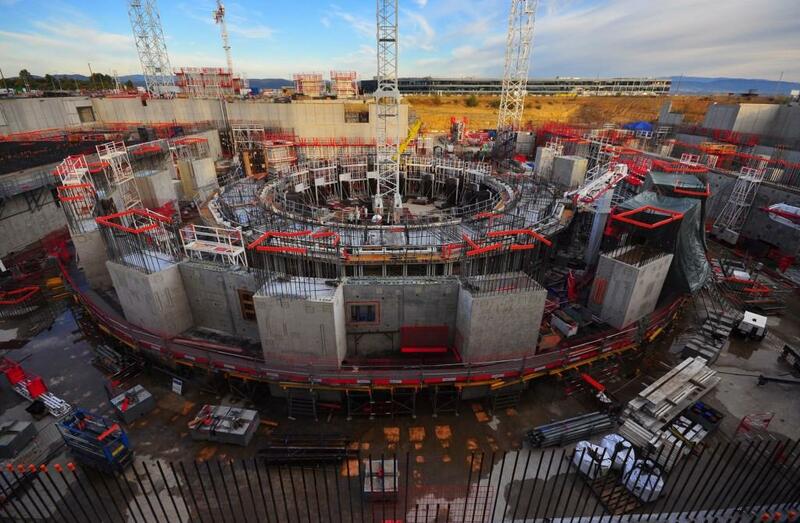 On 26 November, it was positioned outside of the Tokamak Complex for lifting. 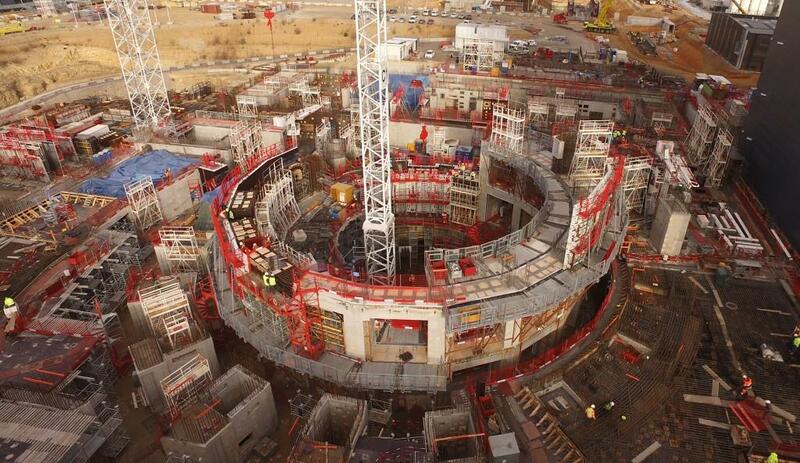 One of 46 nuclear doors is lowered by crane into the Tokamak Building. 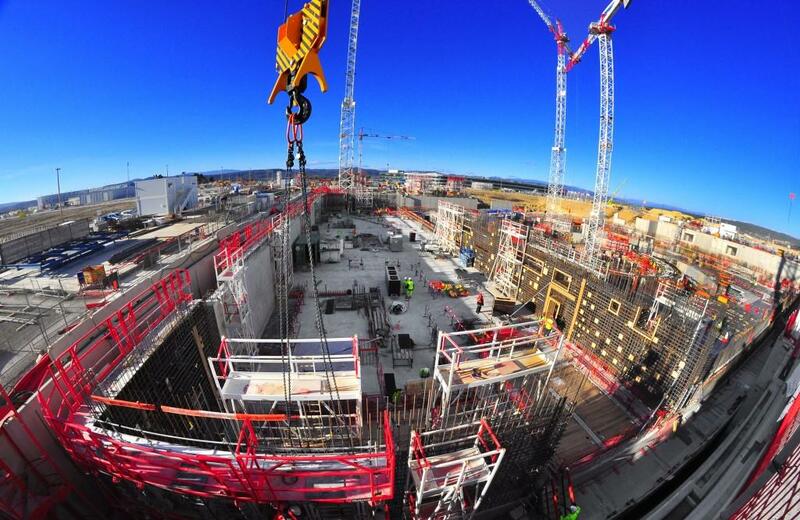 Photo courtesy of Thomas Body, IPP. 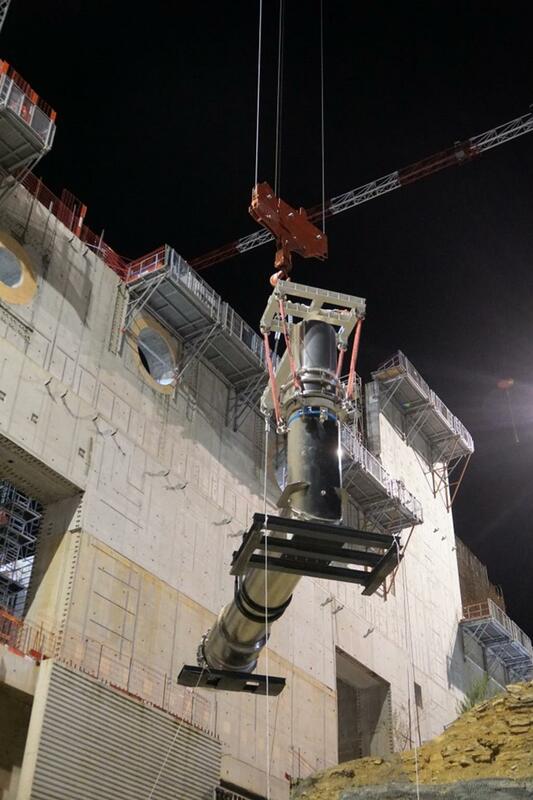 This "leaf mounting tool" has been specially conceived to manoeuvre the nuclear doors that will seal off the 46 individual galleries (port cells) that spoke off from the machine pit. 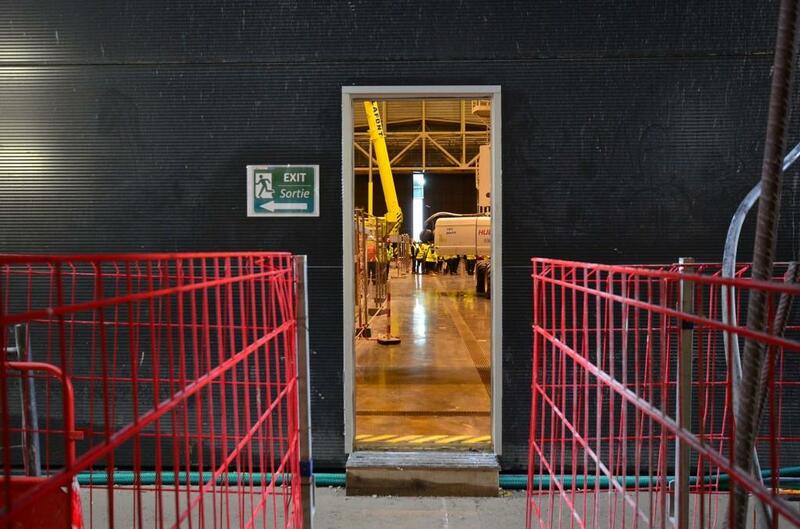 The doors weigh 30 tonnes on delivery, and 30 more after they have been filled with concrete. 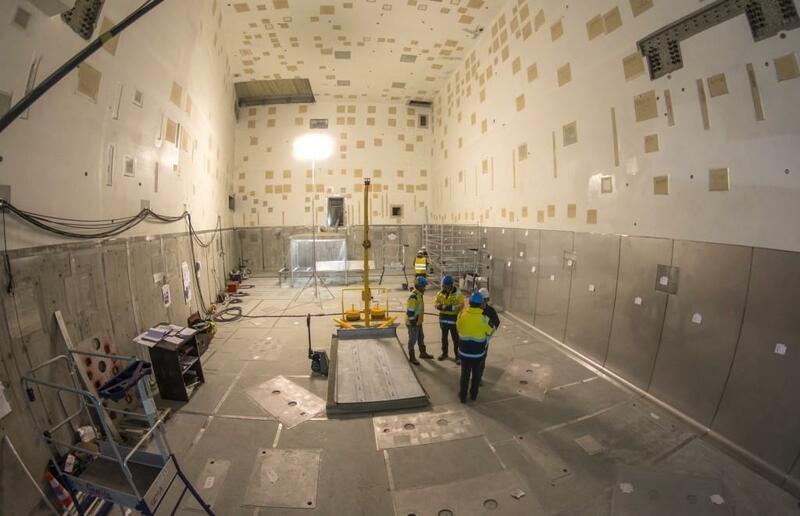 At the end of each nine-metre port cell gallery, teams are creating frames to receive heavy nuclear doors. 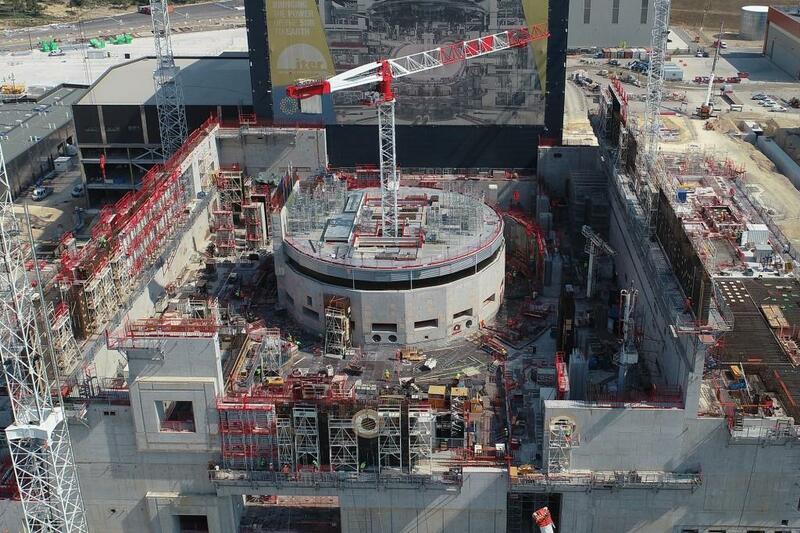 Filled with heavy concrete, the doors will play a role in shielding workers and the environment from fusion-generated radiation. 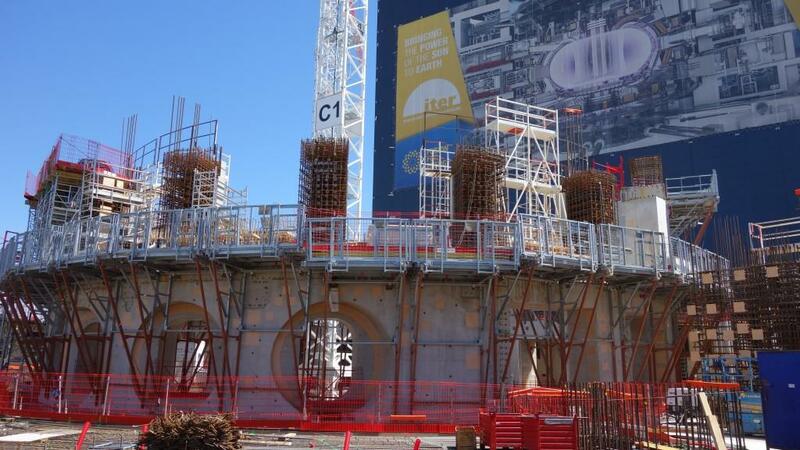 Extending out radially from the concrete bioshield—like so many spokes around a central hub—are nine-metre-long chambers called port cells. 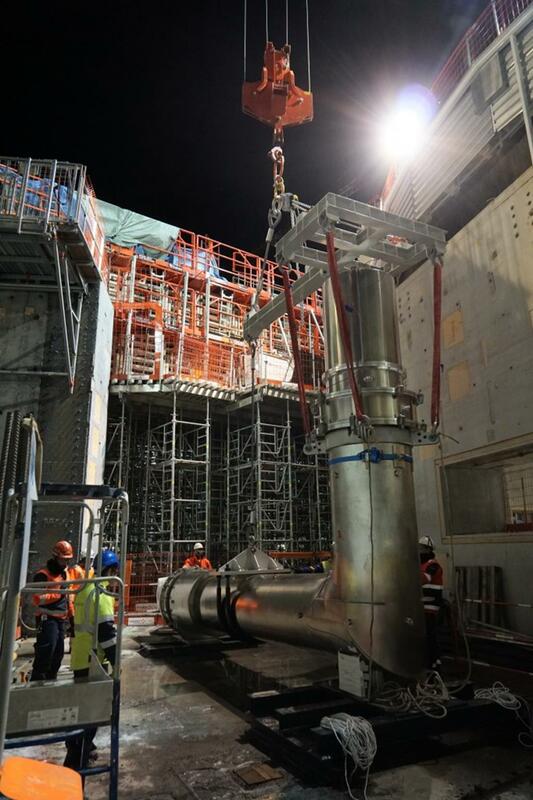 The port cells will accommodate heating pipes, electricity cables, diagnostic lines and maintenance systems as they pass through to the vacuum vessel from outlying galleries. 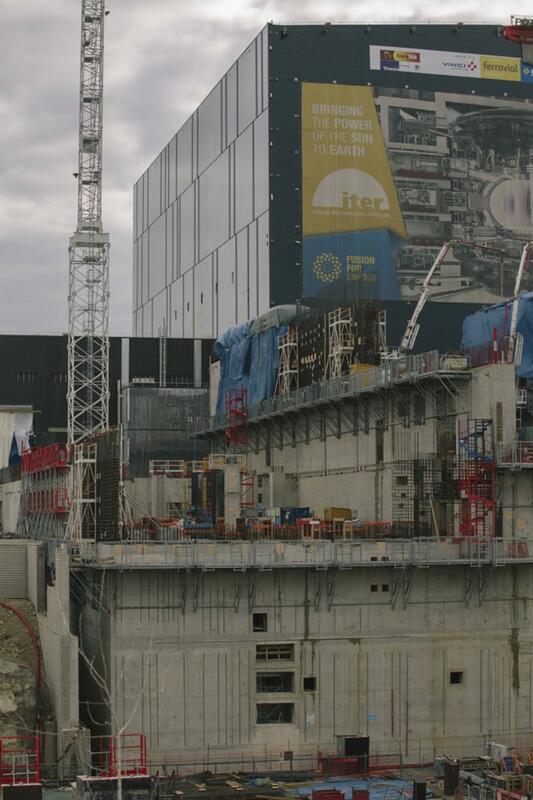 Seen from the main ITER office building, the facade of the Tokamak Complex is changing at a fast pace. 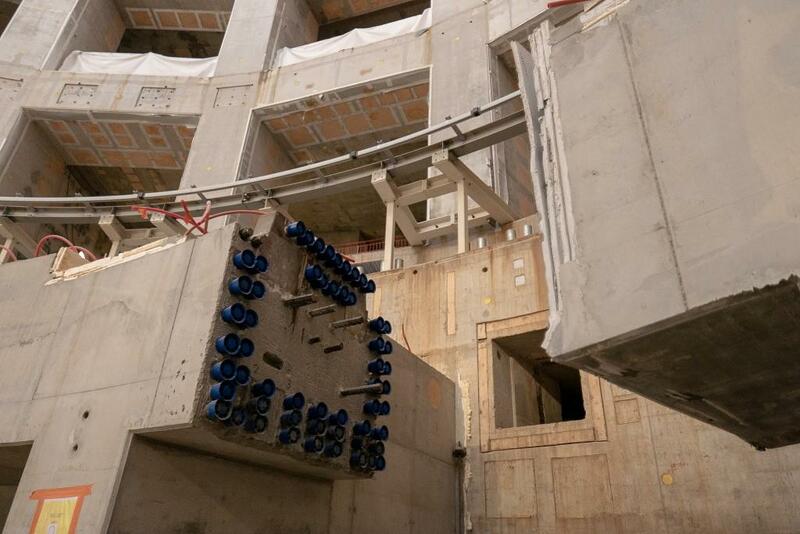 The column of openings to the left shows where the cask and plug robotic system will move components between the Hot Cell Facility and the port openings at different levels of the machine. 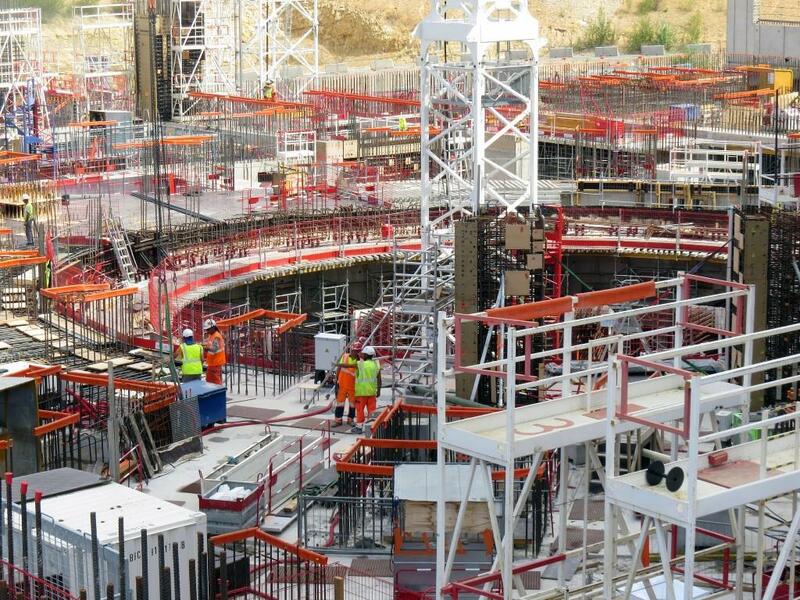 The four circular openings will allow the passage of the high voltage transmission lines for the neutral beam systems (diagnostic neutral beam far left, neutral beam heating three on right). 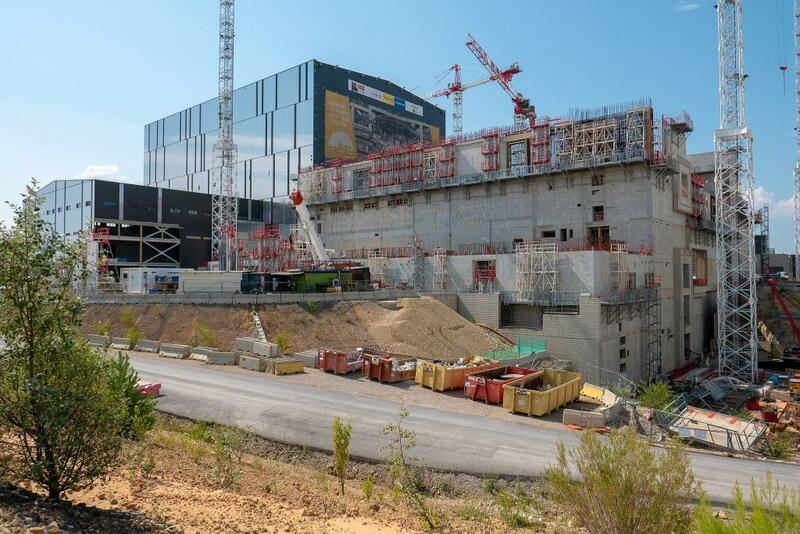 The ITER Organization is based in this five-storey, 215-metre-long building in Saint Paul-lez-Durance, France. 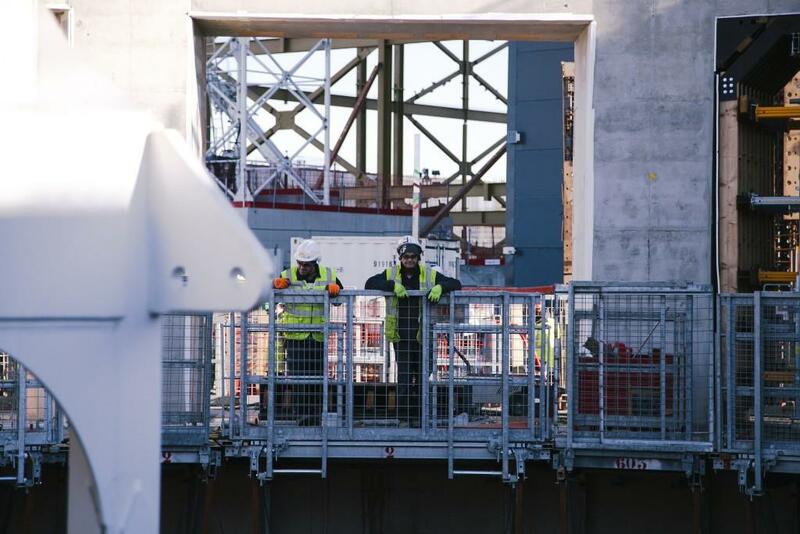 Through the bridge that connects the building to the construction worksite, machine operators will be able to pass directly on to the Control Room. 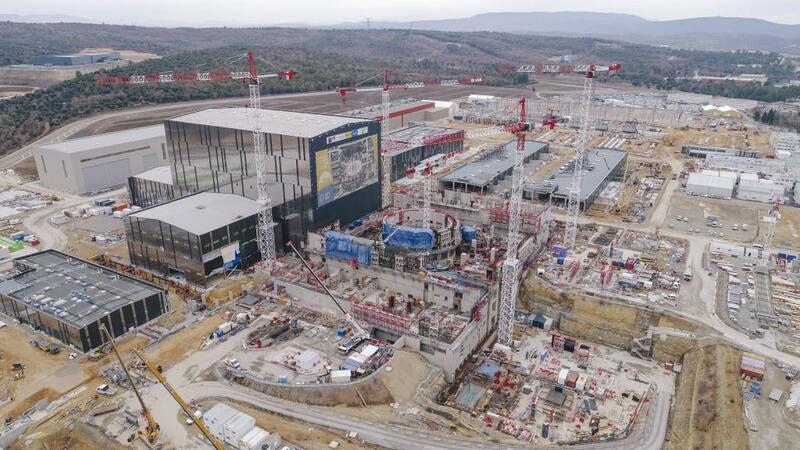 From the C5 crane, we can see a small town booming with activity: to the left, the 60-metre-high Assembly Hall and the circular bioshield ressembling a jewel in its box; to the right, part of the industrial infrastructure (power conversion, cryoplant, electrical switchyard) that will support machine operations. 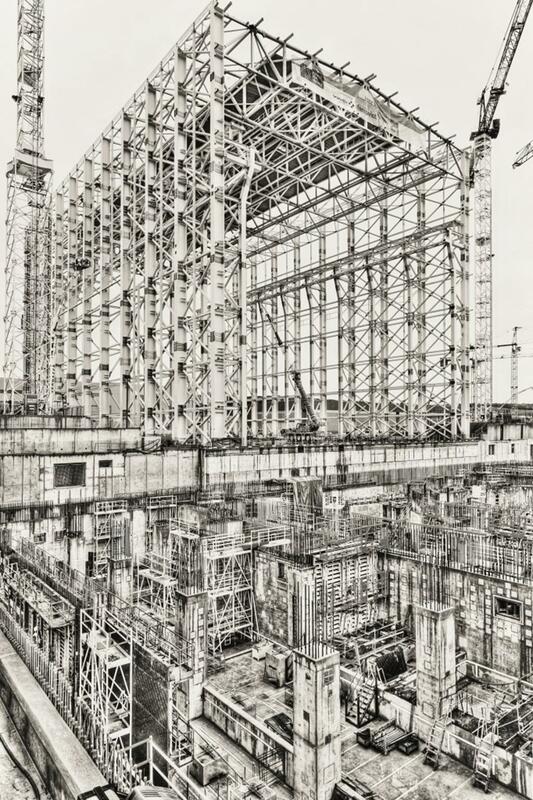 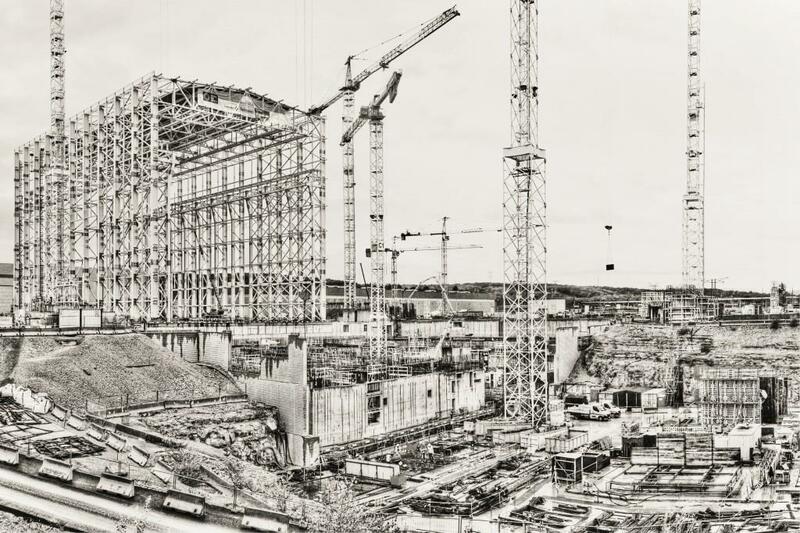 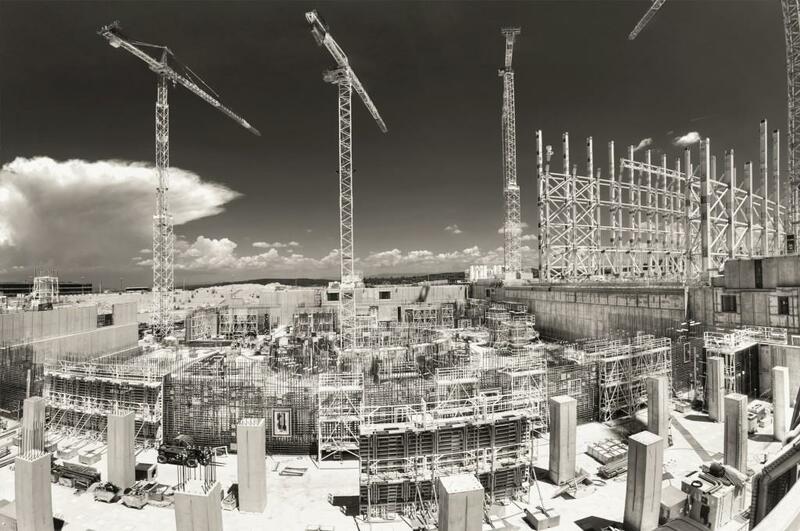 The nuclear concrete structure around the ITER machine will contain 30,000 tonnes of rebar and 150,000 m³ of concrete. 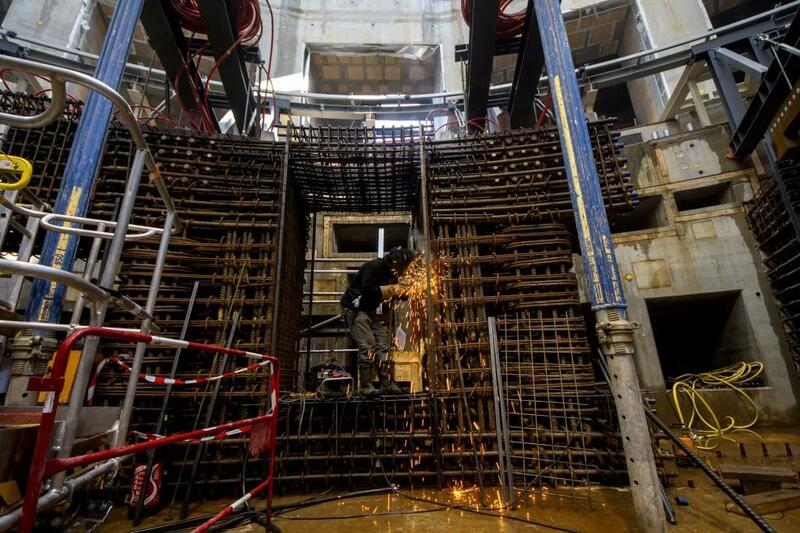 The densest, thickest and most intricate rebar arrangements are located under the machine, in the concrete floor (basement), the recently completed crown, and the crown's radial walls. 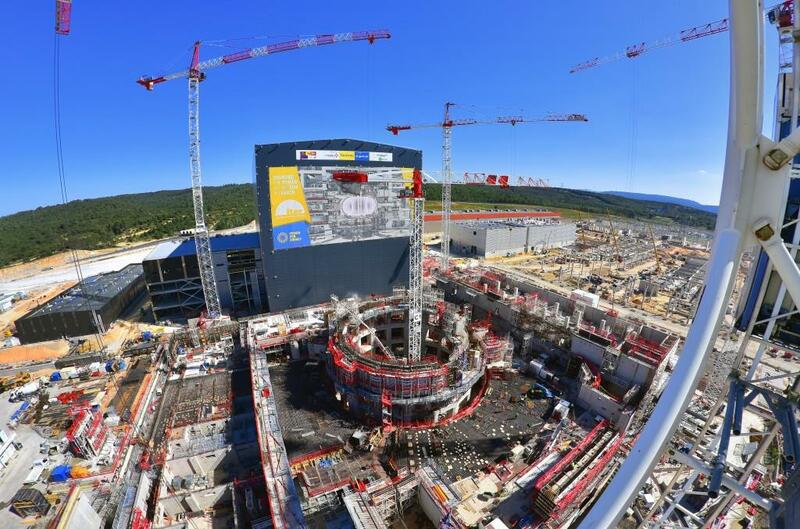 The ITER Organization and the seven Domestic Agencies are working to very detailed and closely monitored schedules to reach First Plasma in 2025. 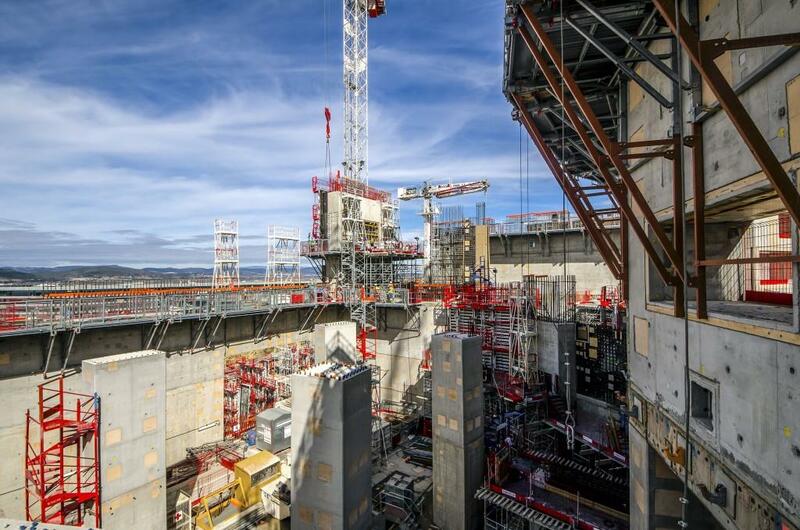 Project control metrics show that 57 percent of total First Plasma work scope has been completed (a figure that includes design activities, component manufacturing, building construction, shipping and delivery, assembly and installation). 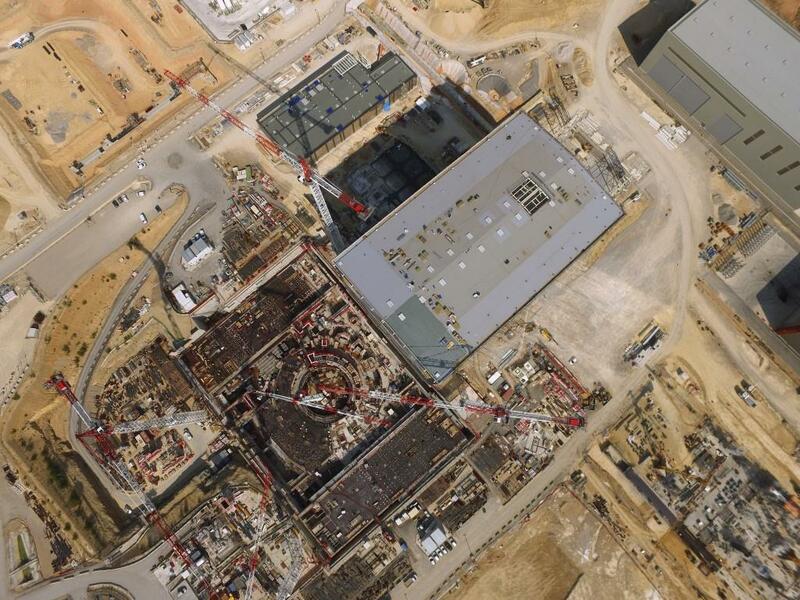 In March 2020 the Tokamak Building will have a roof and the first limited crane access will be possible between the Assembly Hall and the machine assembly pit. 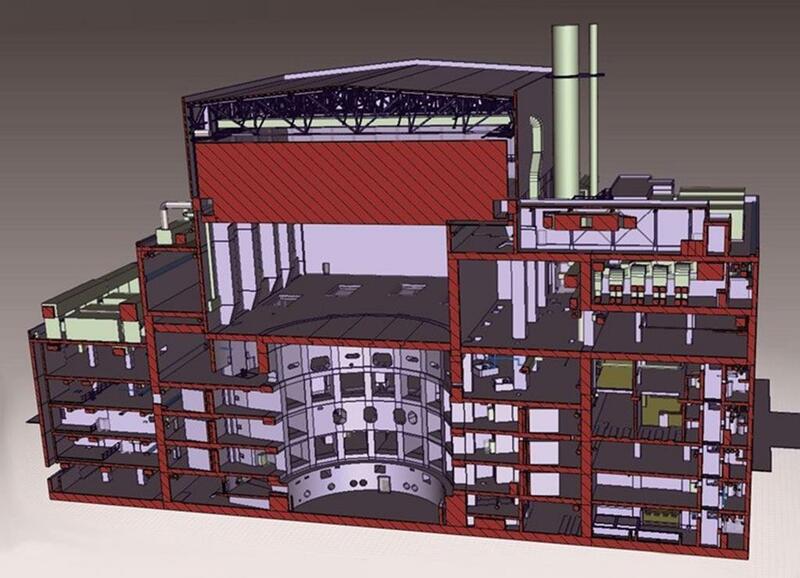 Some 30 plant systems will be installed to support the machine. 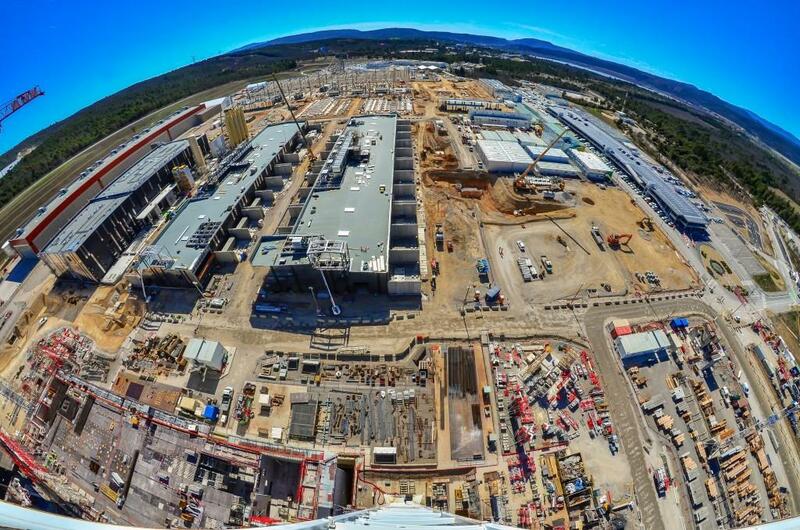 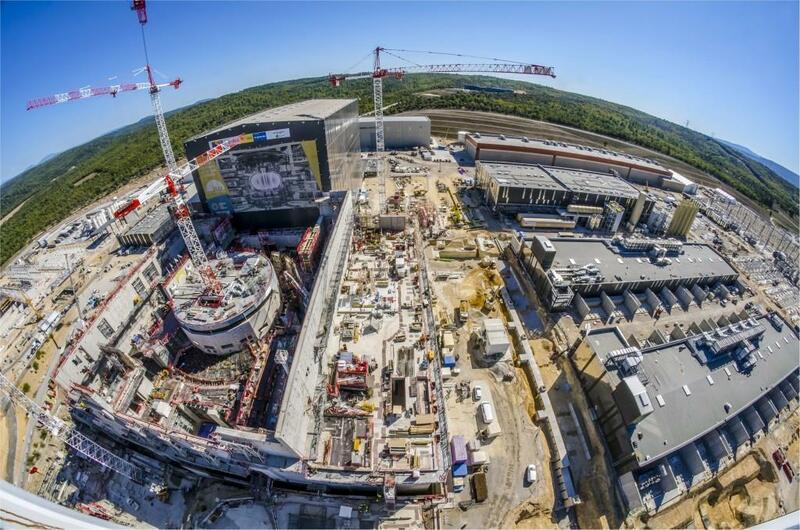 On the one-kilometre-long ITER construction platform, infrastructure and buildings rose in 2018 for cryogenics (second from left), magnet power supply (twin buildings in centre), power distribution and heat rejection (not pictured). 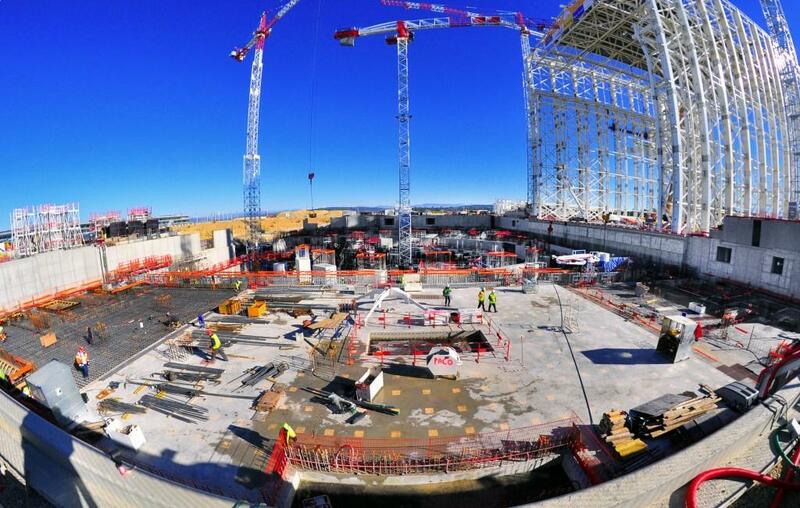 Looking across the 30-metre-wide assembly arena for the ITER machine. 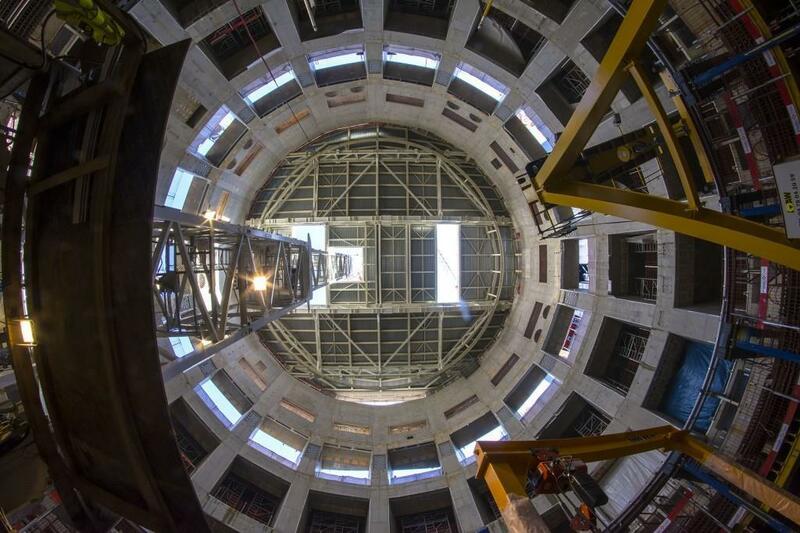 800 tonnes of concrete and 224 tonnes of steel went into the concrete structure (circular and radial walls) that will support the combined mass of the machine and the enveloping cryostat. 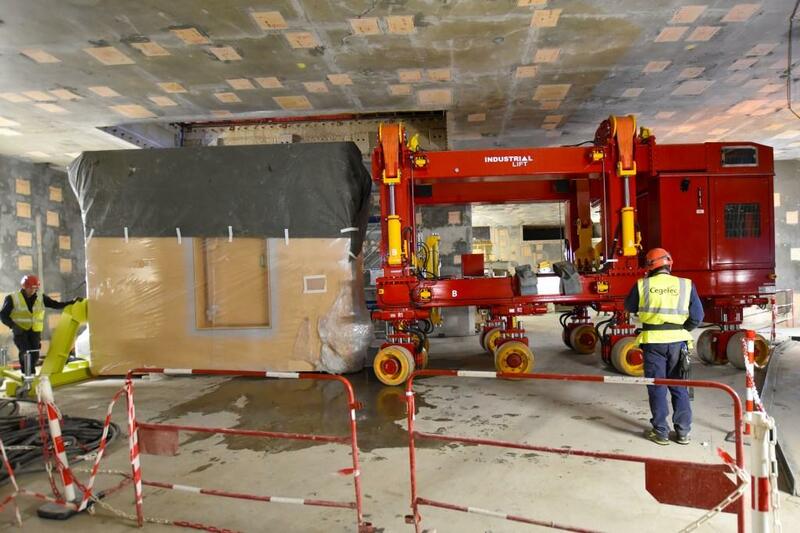 The realization opens the way to machine assembly. 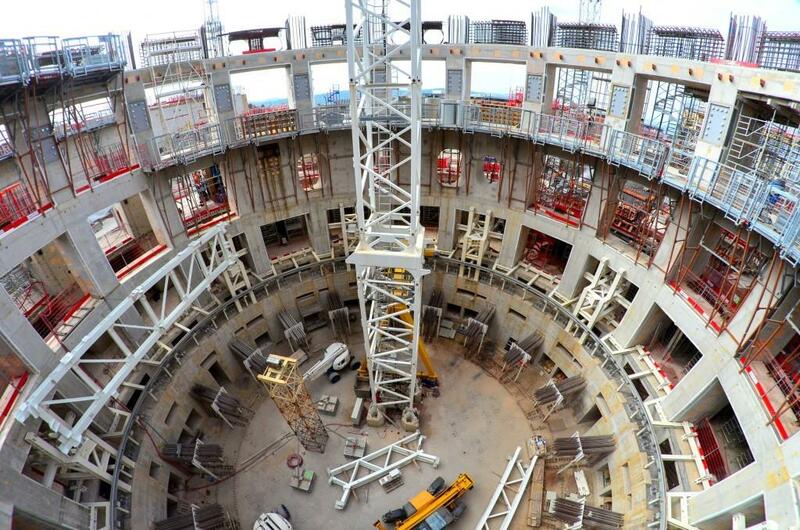 Under the 23,000-tonne machine a crown with 18 points will be hidden. 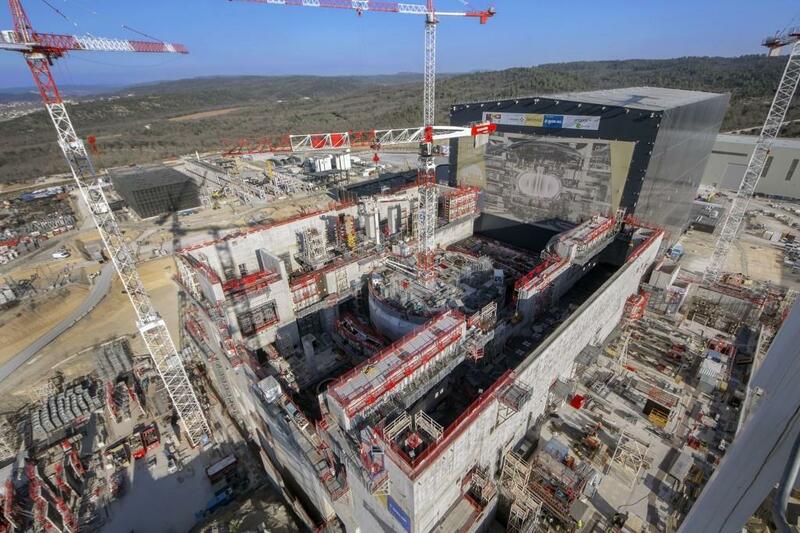 The crown was completed in four pours over four months. 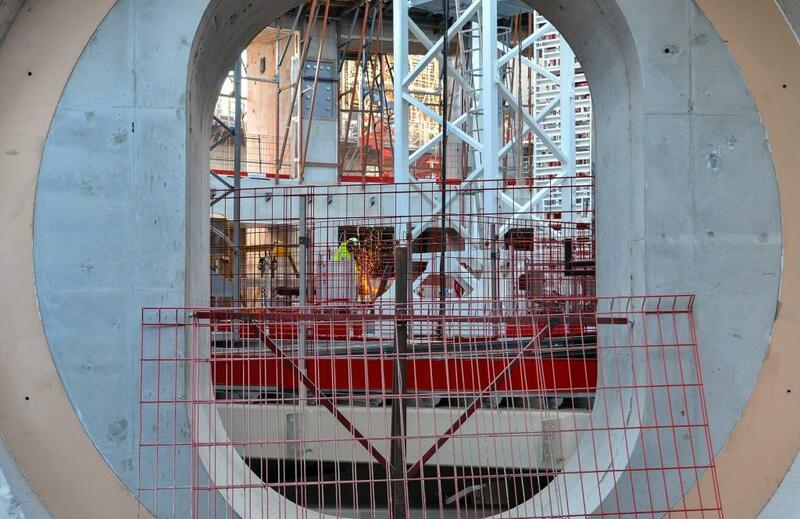 Only one small opening remains in the circular wall for the passage of a magnet feeder. 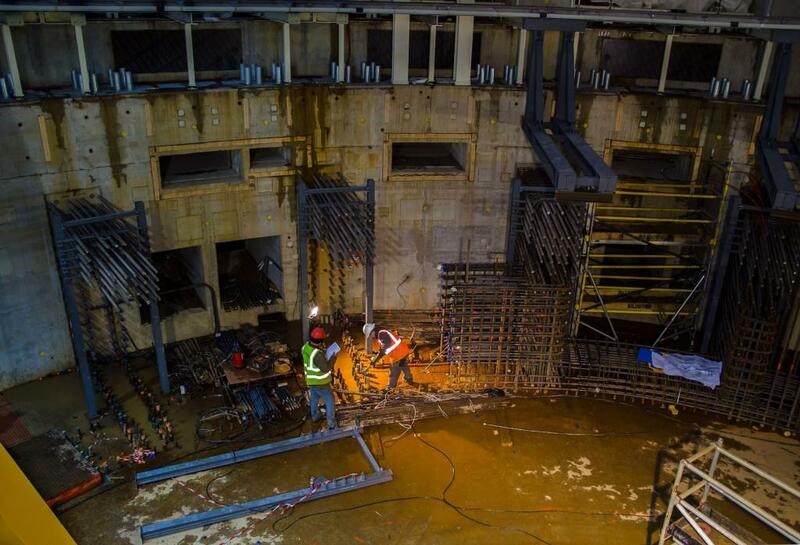 In August, seven tanks were introduced through the roof of the drain tank room at B2 (lower basement) level. 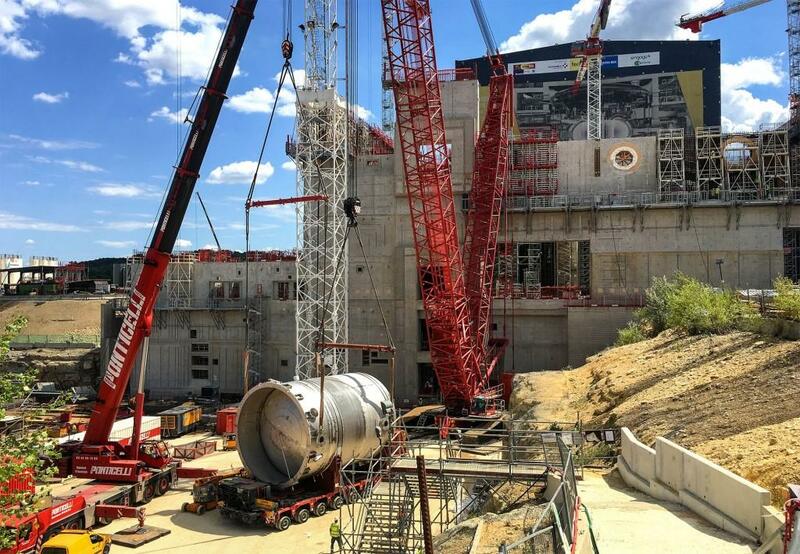 This tall tank for the Tokamak cooling water system had to be raised from its horizontal storage position before it could be lifted by crane up and into the Tokamak Complex. 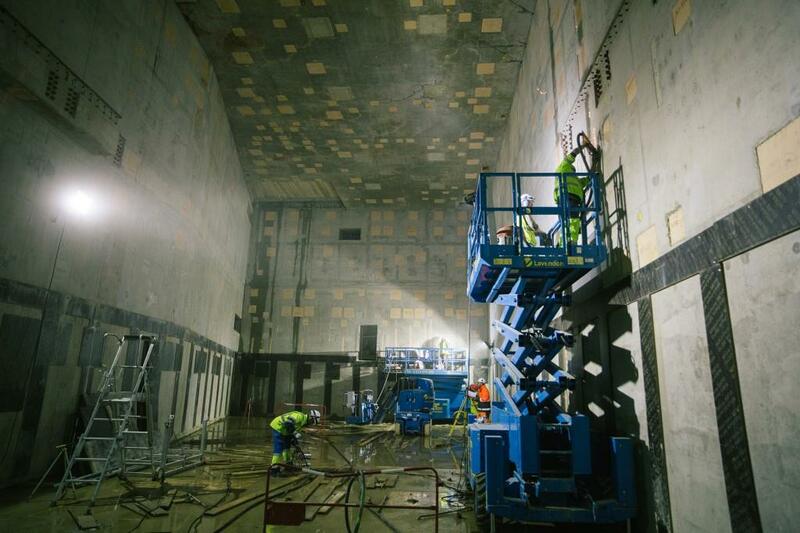 Painting and finishing works in the drain tank room were finalized before the tank installation. 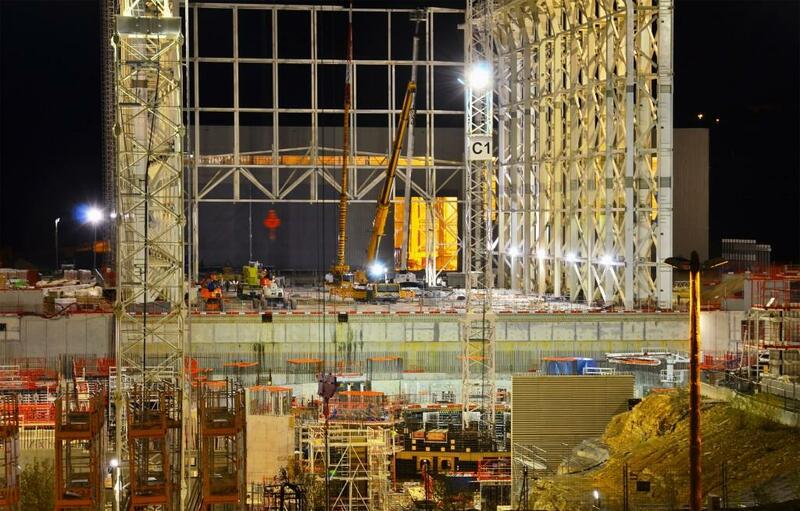 It only remains to now close the roof opening. 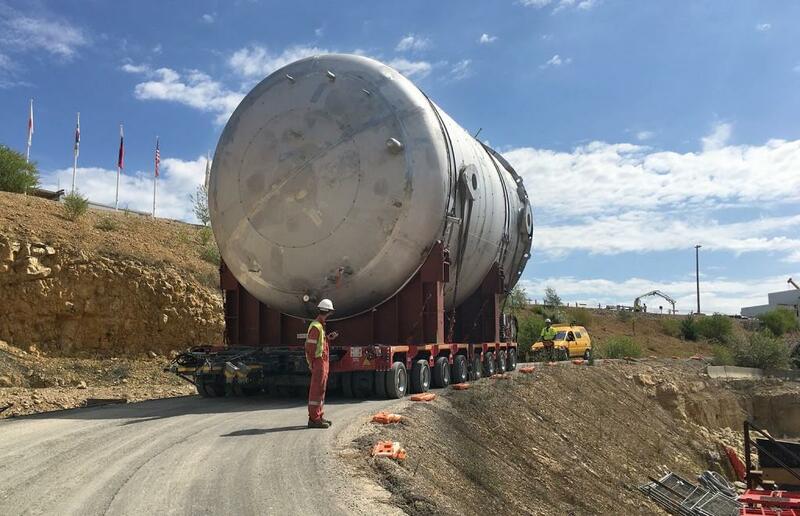 One of the Tokamak cooling water system drain tanks is transported from temporary storage to the lifting point outside of the Tokamak Complex. 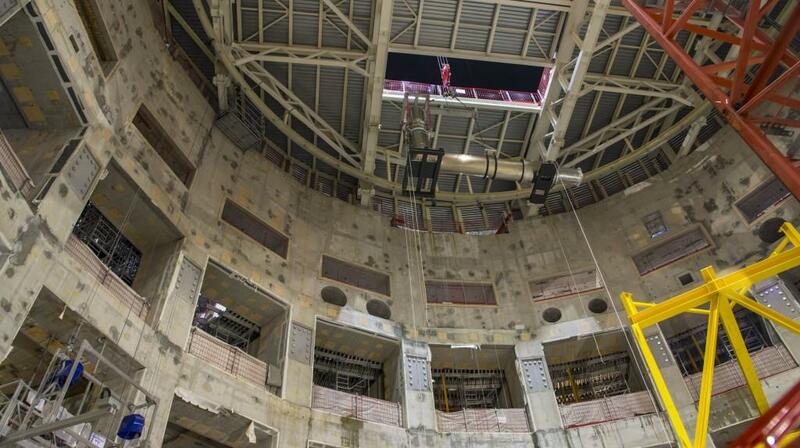 One after another, the tanks were lowered through an opening preserved in the ceiling of the drain tank room. 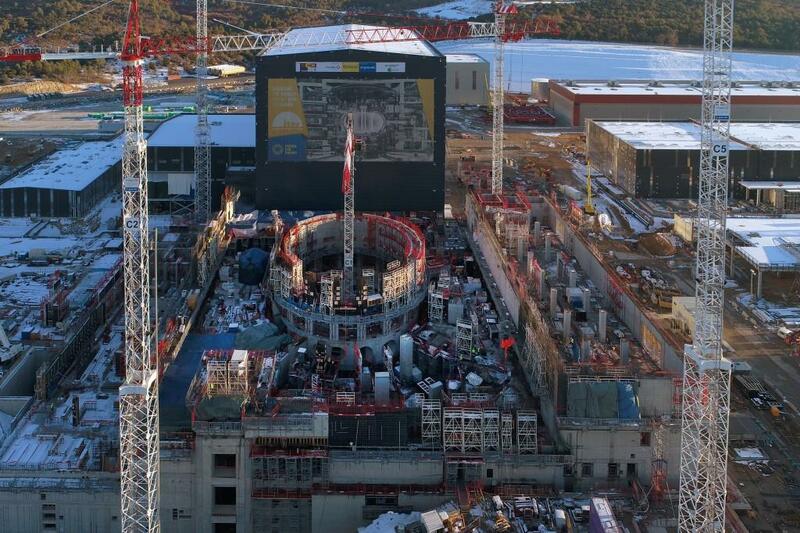 In one of the most spectacular installation activities performed yet in the Tokamak Complex, three drain tanks and four vapour suppression tanks were installed during the week of 14 August—some 600 tonnes of equipment in all. 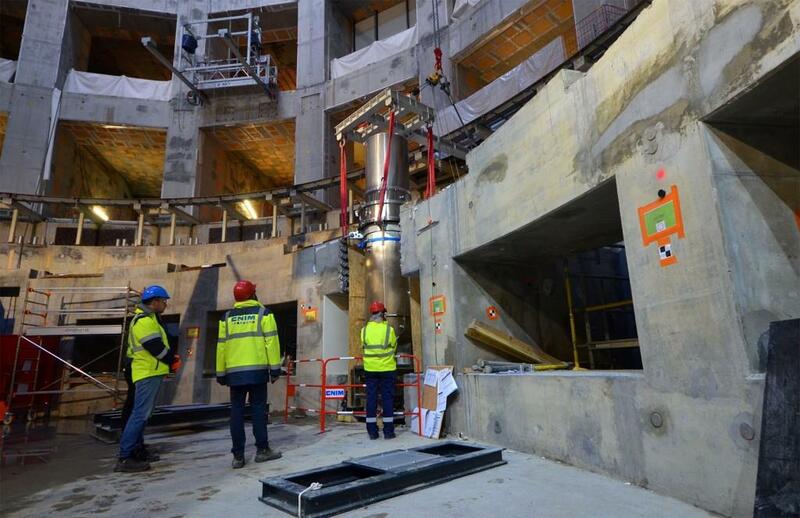 Once a cavernous open space, the drain tank room is now completely filled by the seven tanks. 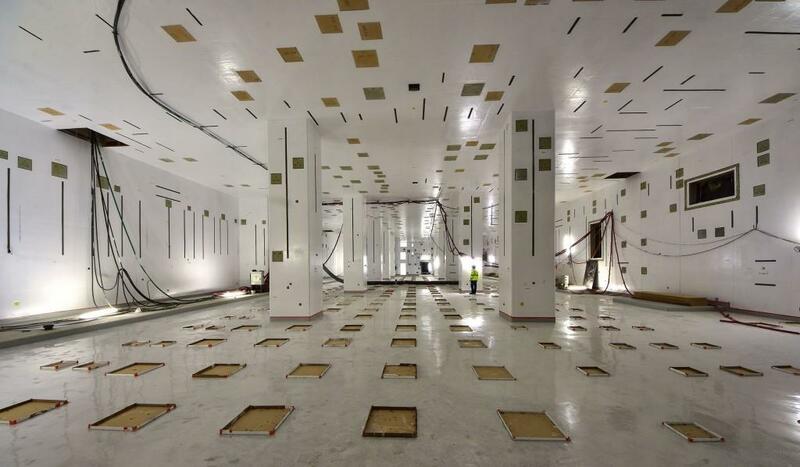 The space above the smallest tank, in the middle, will be taken up by a mezzanine supporting piping, pumps and exchangers for the vacuum vessel's primary heat transfer system. 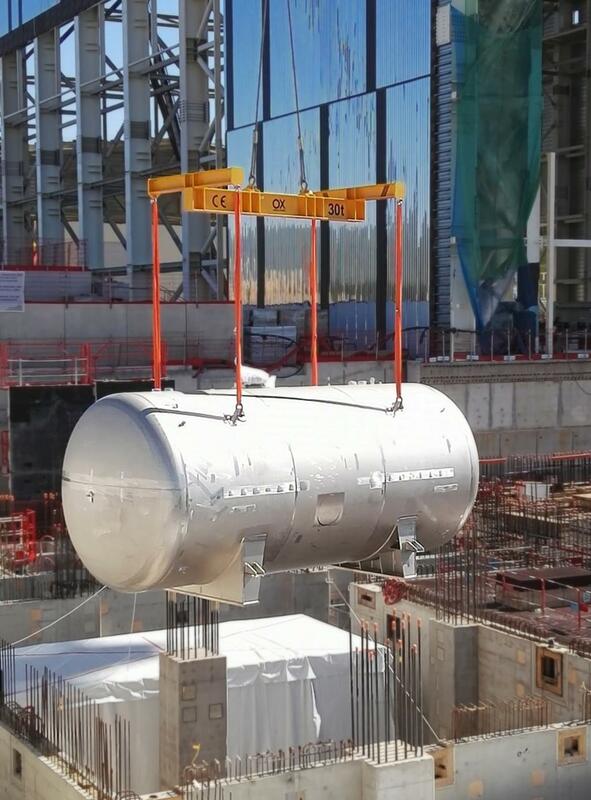 Moving components in the 100-tonne range does not require tremendous force ... provided that the loads are placed on air pads. 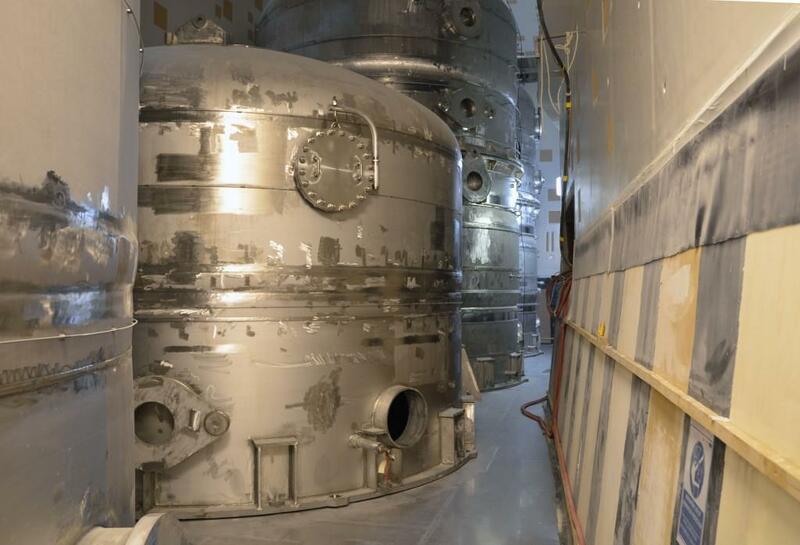 Once deposited on the floor, each tank (or pair of tanks) was gently drawn into its final position by manually operated cables anchored in the walls. 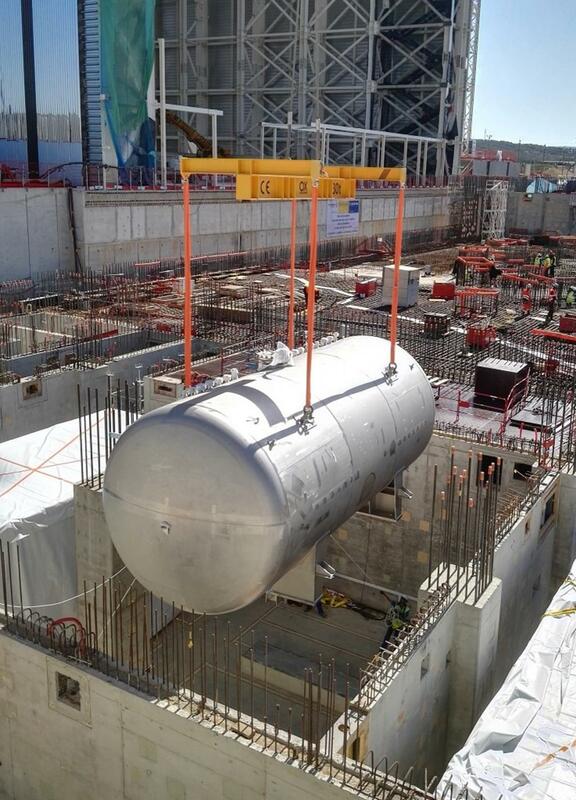 The first vapour suppression tank has been deposited and a second is being lowered through the opening in the ceiling. 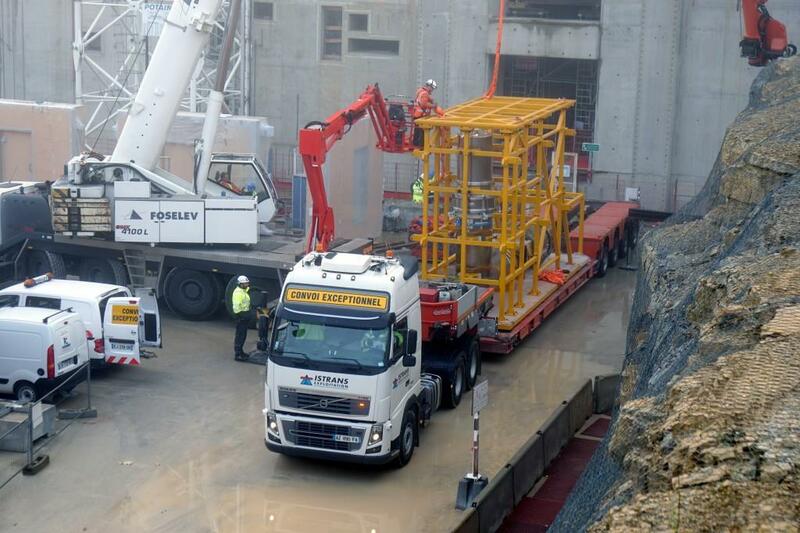 Once paired (one on top of the other) they will be moved to the side to make room for the next delivery. 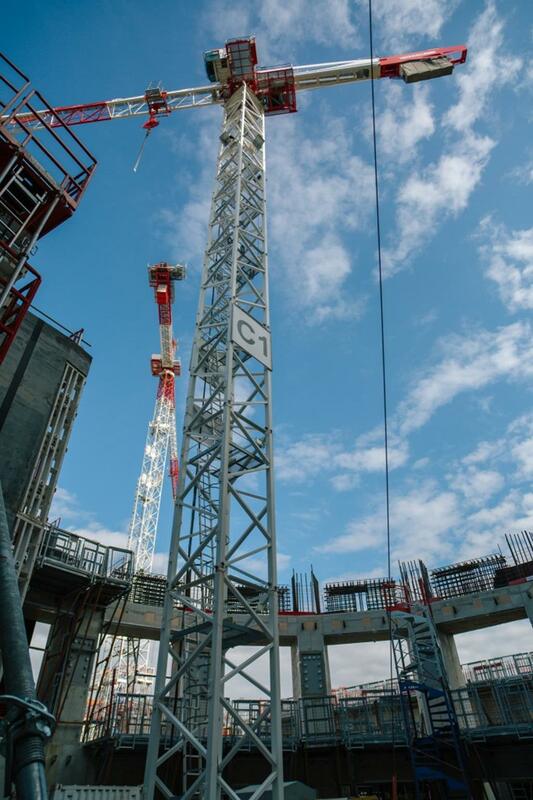 The red-and-white crane beam spins slowly over the capped bioshield in late July. 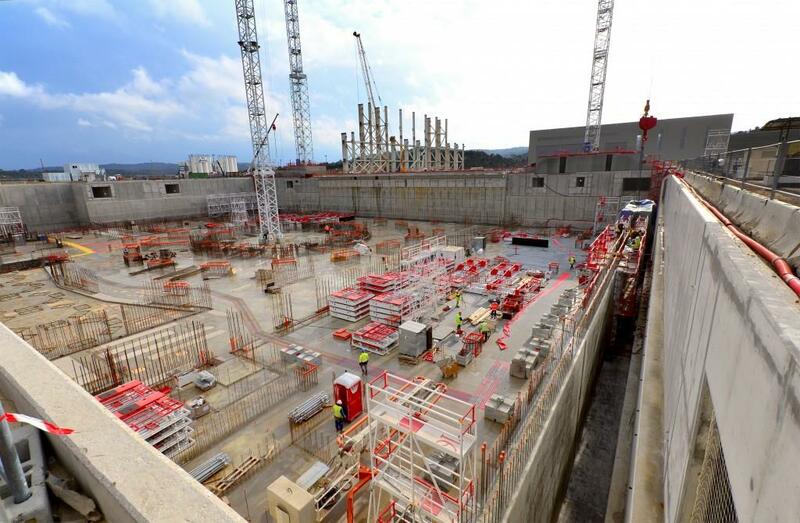 Down below, teams are continuing to pour concrete for the crown wall; outside, at level 3, they are laying a special type of "neutron-absorbing" borated concrete. 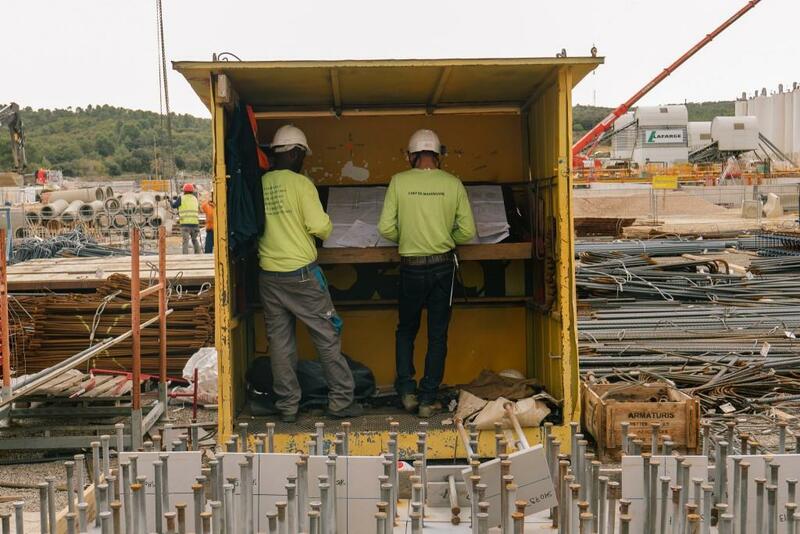 In this central arena of the construction site, teams are active three shifts a day—two full work shifts and a third, at night, dedicated to moving scaffolding and formwork in preparation for the next day's tasks. 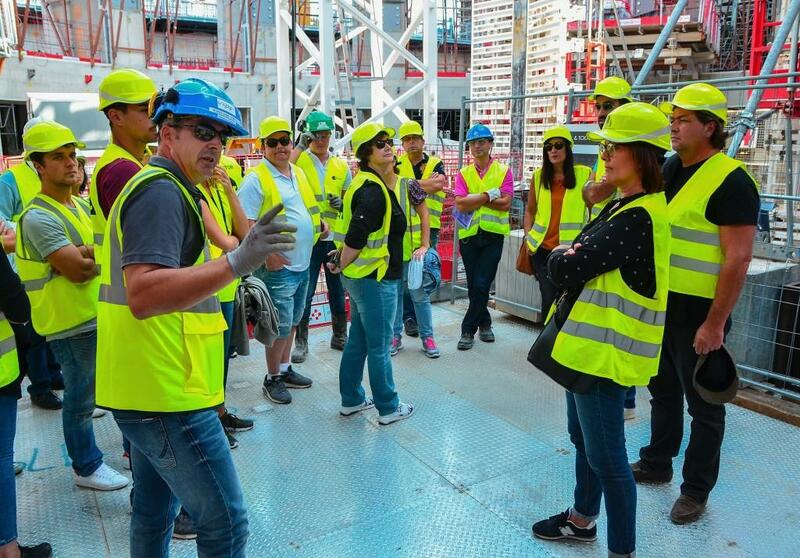 Work will continue through the traditional August holiday in France. 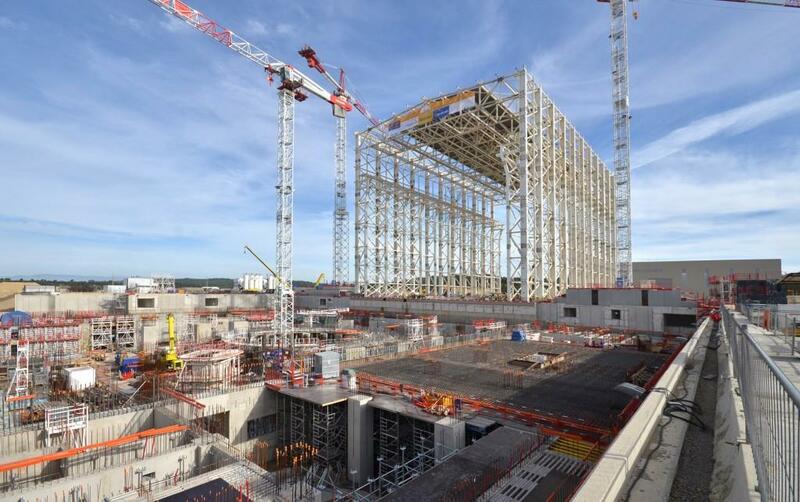 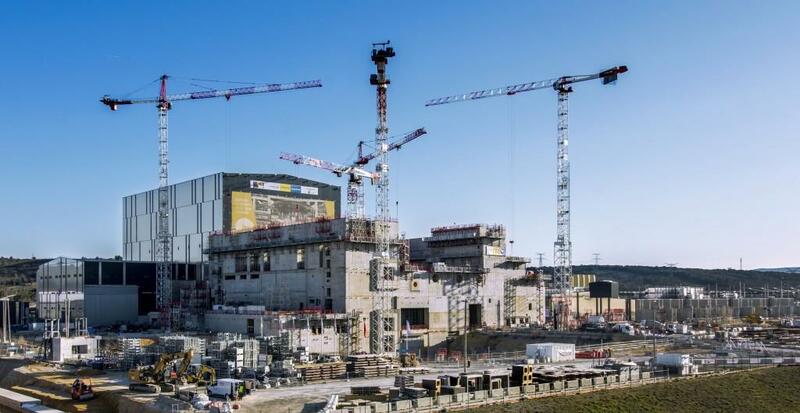 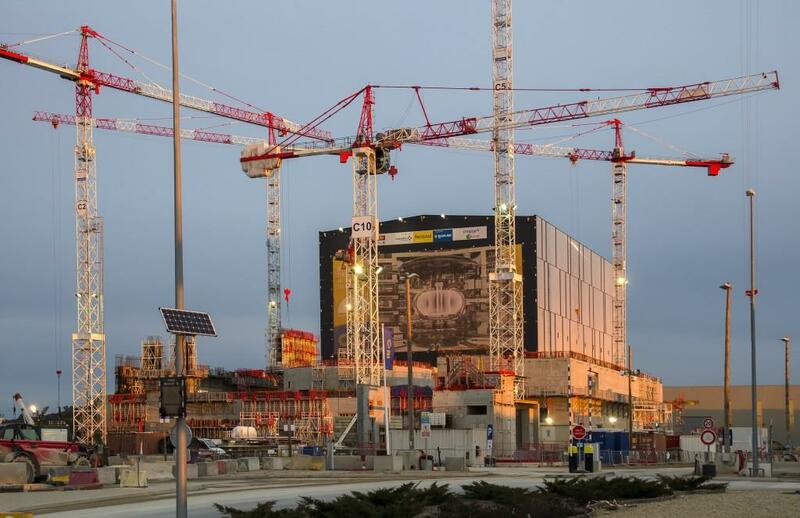 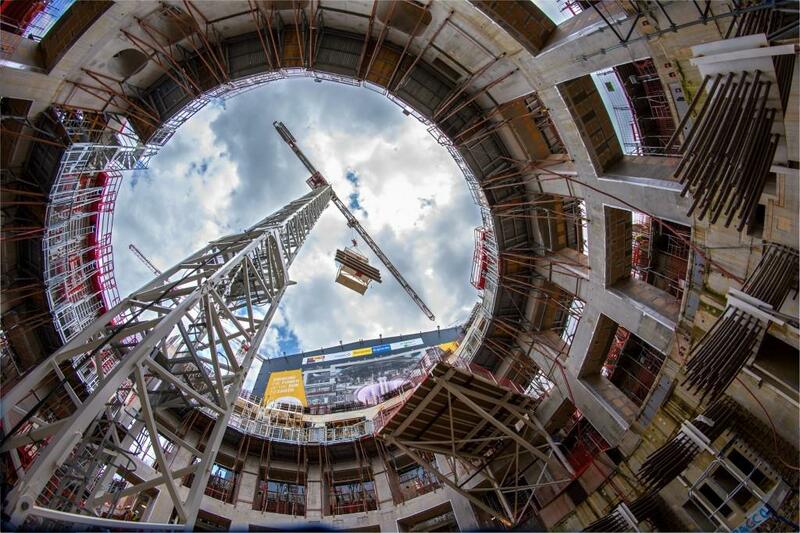 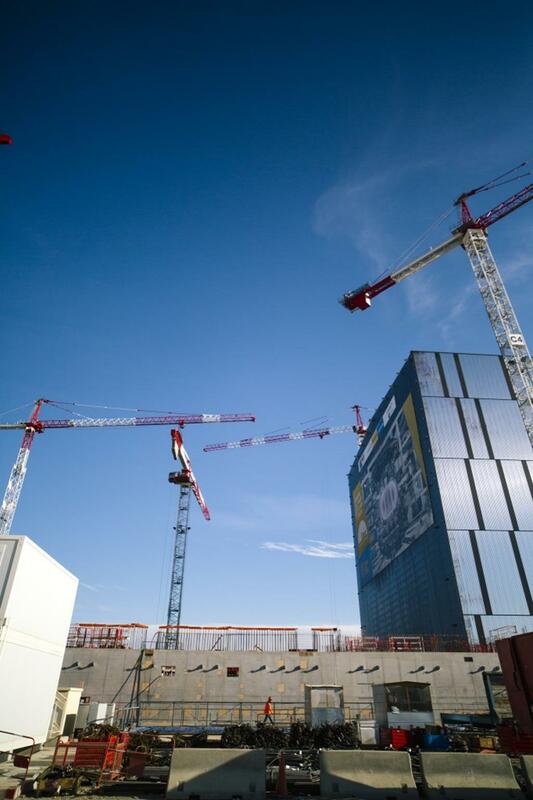 Responsible for civil engineering and construction, the European Domestic Agency is working to meet an important date on the ITER calendar—March 2020, when the first limited crane access between the Assembly Hall and the Tokamak Building is needed for major installation activities. 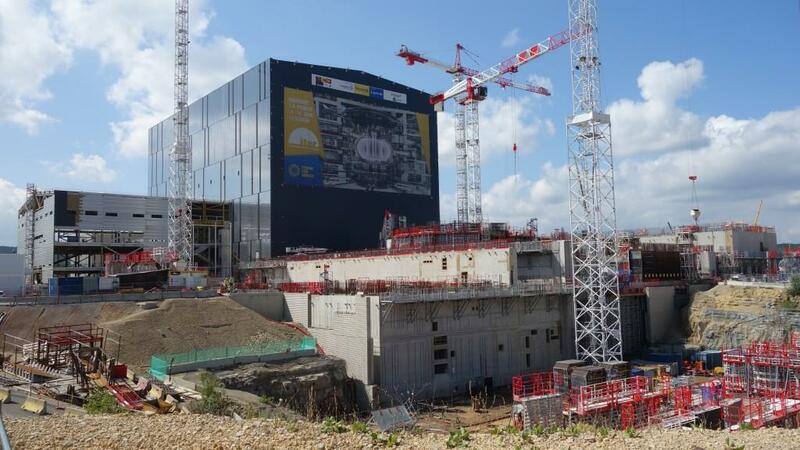 Most of the openings of the bioshield are 4 x 4 metres, Near the top, though, the penetrations change shape. 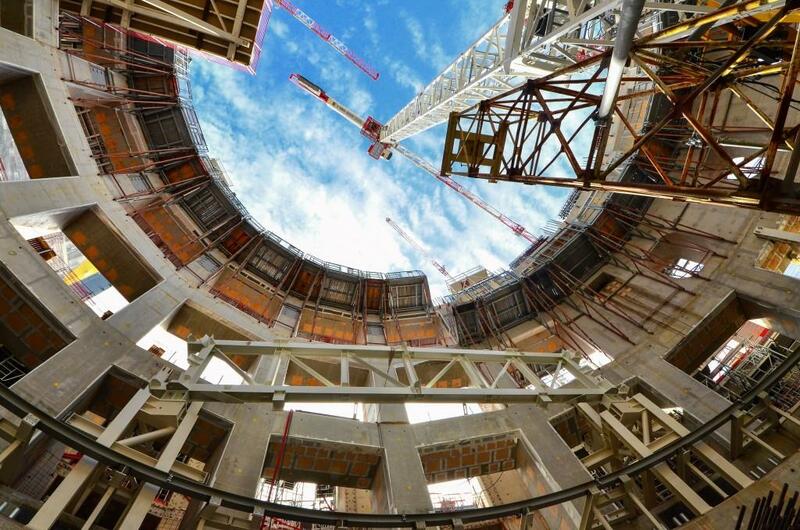 The concrete "crown" will support the machine from below and transfer forces generated during operation to the massive bioshield and the ground. 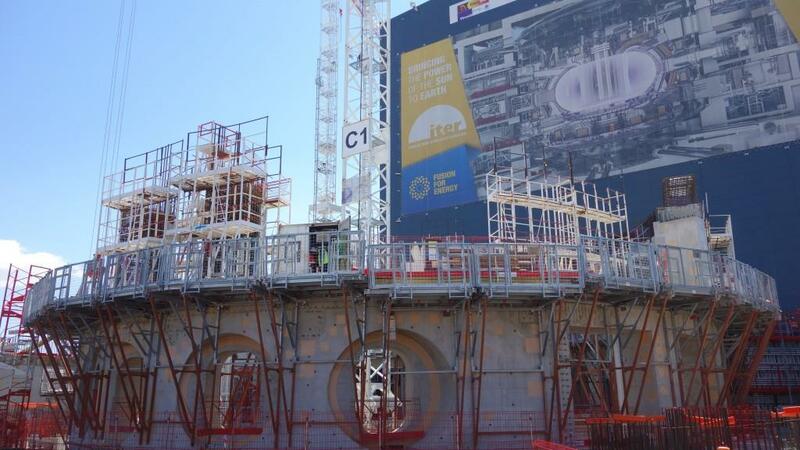 The cryostat base—the first major "piece" in the assembly puzzle of the ITER machine—will "sit" on this wall, with the deep bottom of the base occupying the inner circle while the outer pedestal rim will be supported by the wall and also on the "lip" of concrete now hidden by rails for the circular crane. 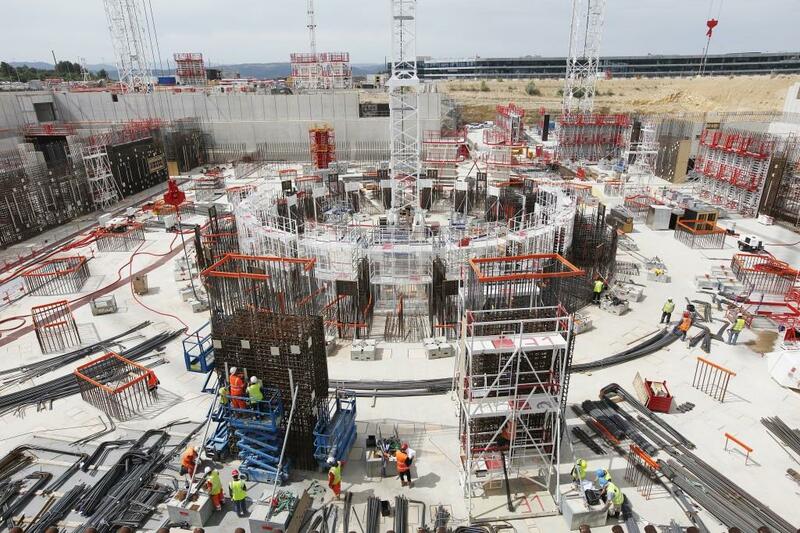 At the bottom of the Tokamak Pit, the crown circle and radial walls are being poured in segments. 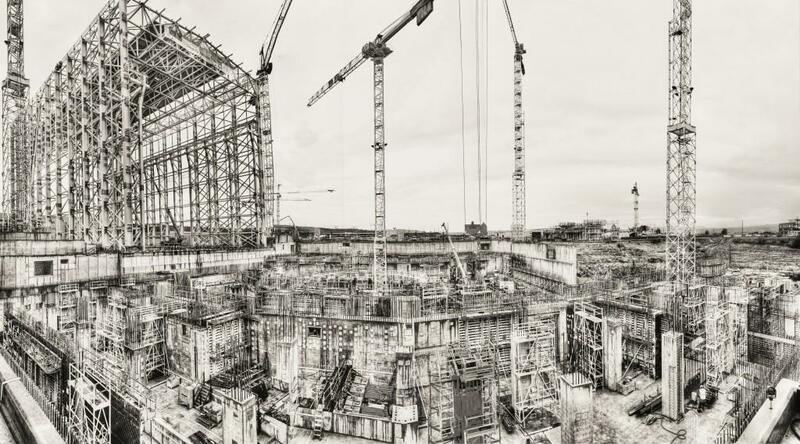 A third pour is planned later this month. In the bowels of the Tokamak Building the drain tank room was designed to house seven water storage tanks required for the operation of the machine's cooling water and vacuum vessel pressure suppression systems. 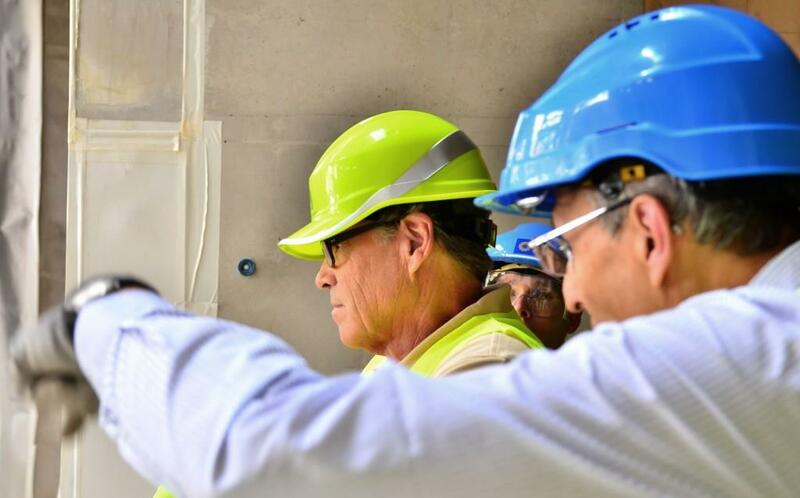 The United States Department of Energy head, Secretary Rick Perry, visits ITER on 11 July as part of a US review of ITER Project progress. 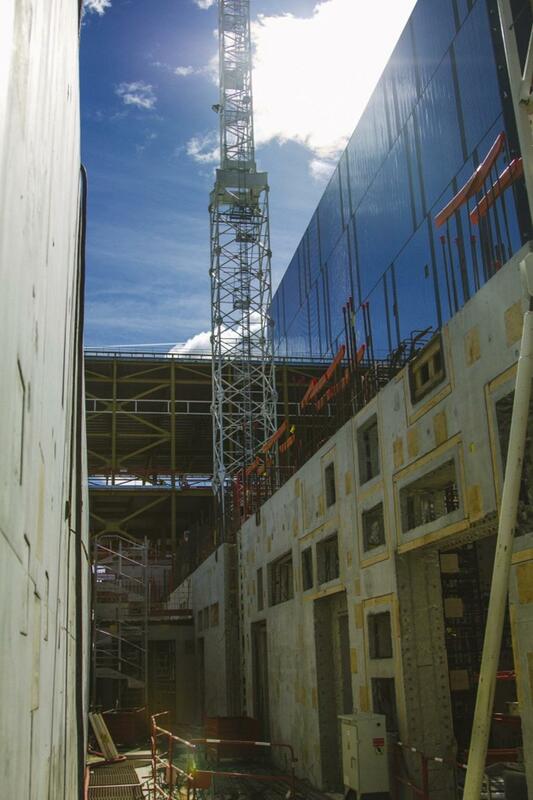 This wall going up on one side of the bioshield will support the crane rails that will be extended out from the Assembly Hall. 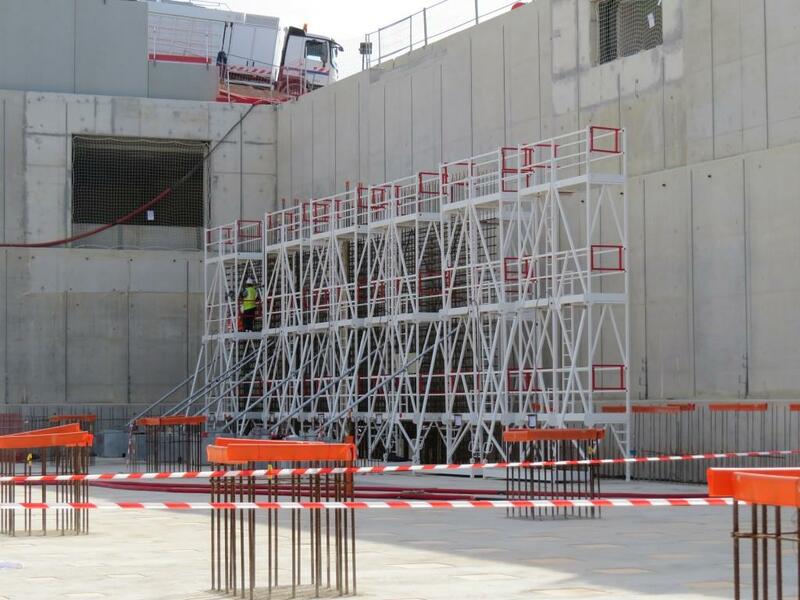 A similar wall will be built on the opposite side. 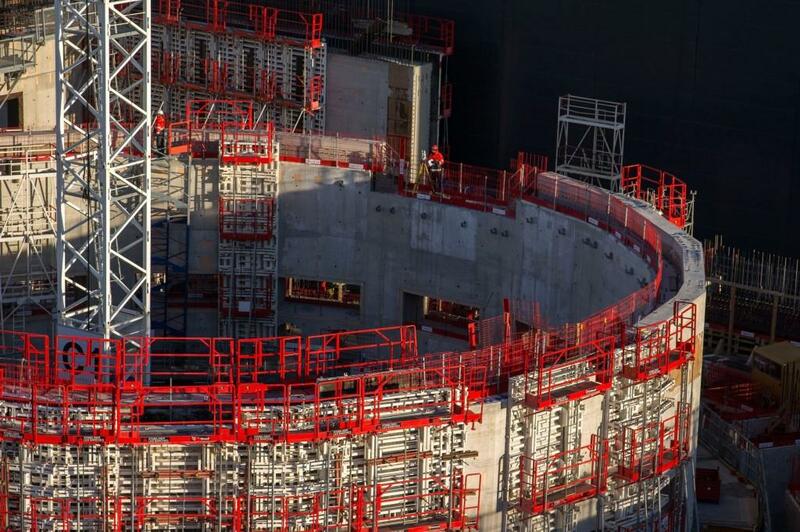 Two perfectly circular structures, looking a lot like archery targets, have been installed on the west-facing wall of the Tokamak Complex. 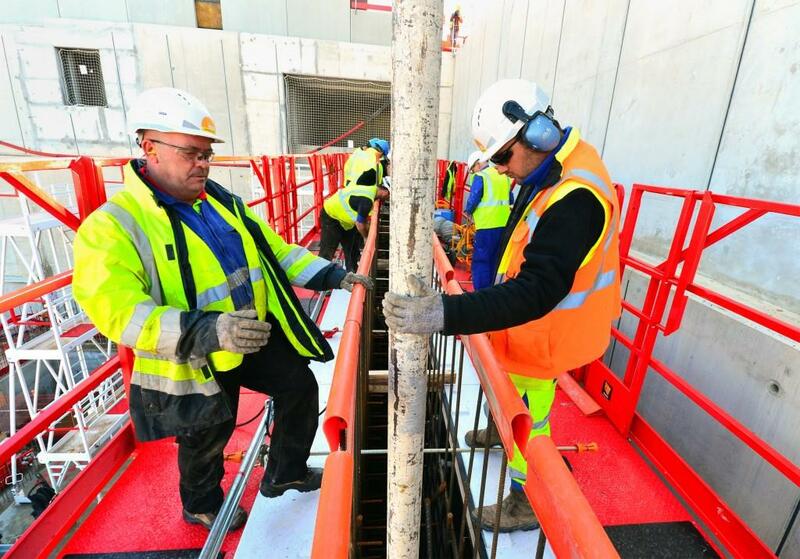 They mark the location of circular openings in the concrete for the passage of electrical cables. 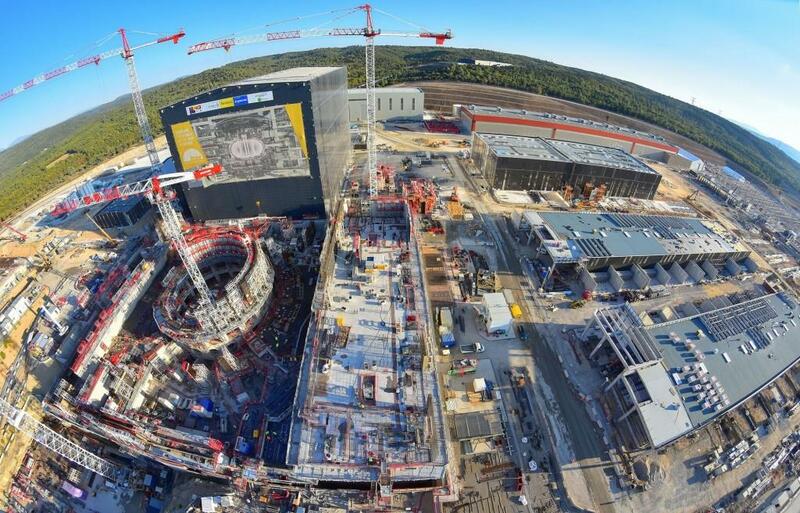 The Tokamak Complex is evolving rapidly, as the Tritium, Tokamak and Diagnostic buildings have risen to L1, L2 and L3 levels respectively. 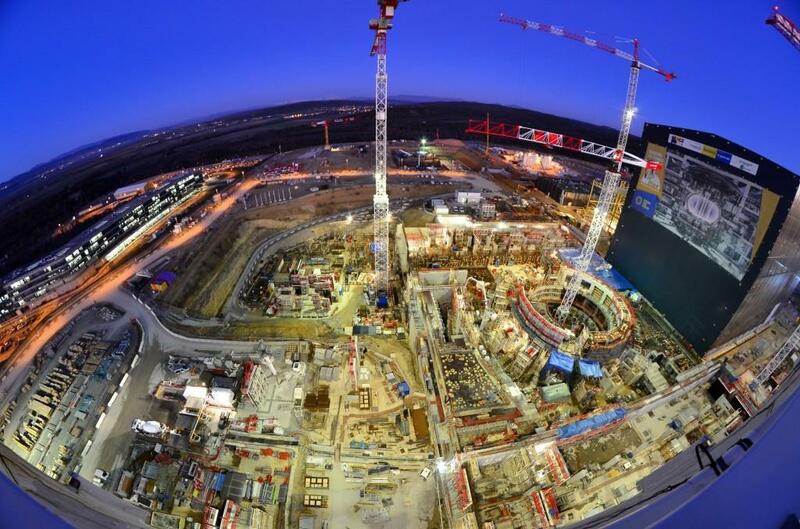 There is activity on the worksite night and day, as nearly 2,000 workers participate in ITER construction in two shifts. 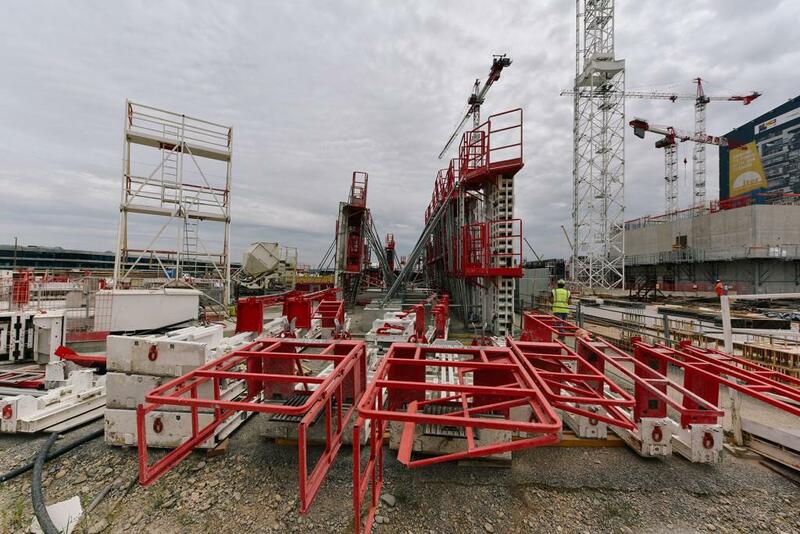 A test is underway to verify if the concrete that is about to be used to pour the radial walls and crown at the bottom of the machine well has the required fluidity characteristics. 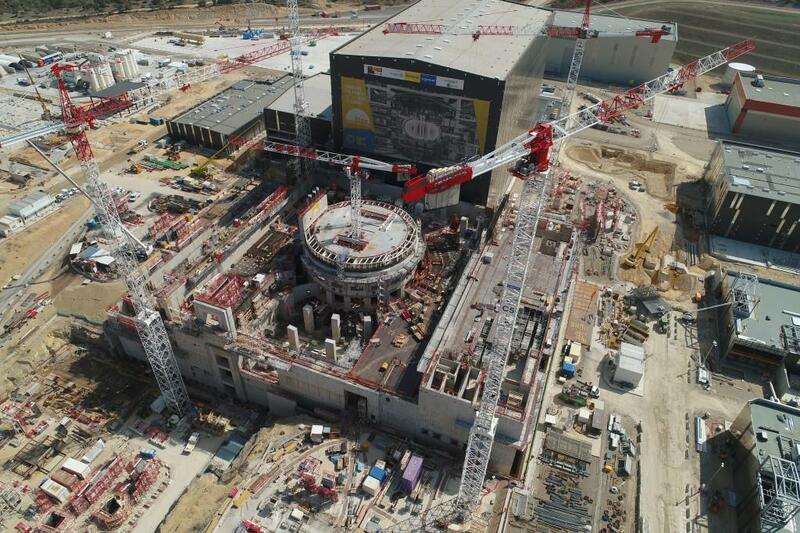 The first plot of the Tokamak "crown" is poured on 22 May. 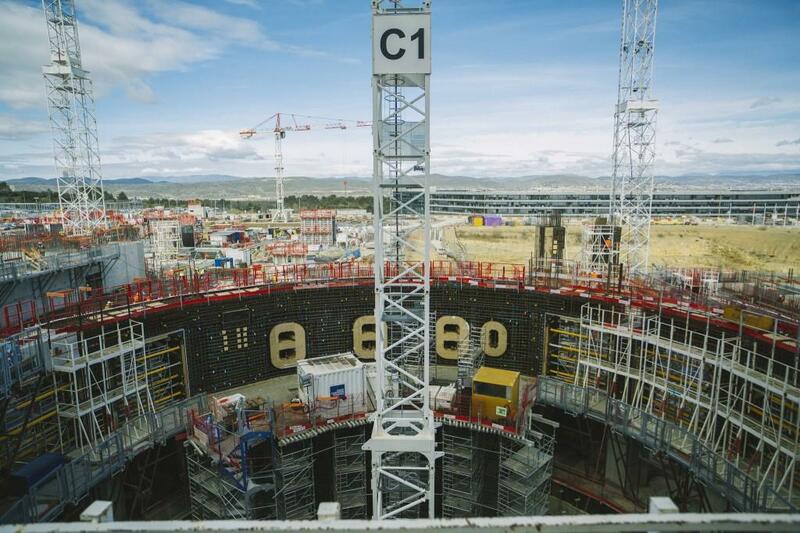 The crown will support the combined mass of the Tokamak and its encasing cryostat (23,000 tonnes) while transferring the forces and stresses generated during plasma operation to the ground. 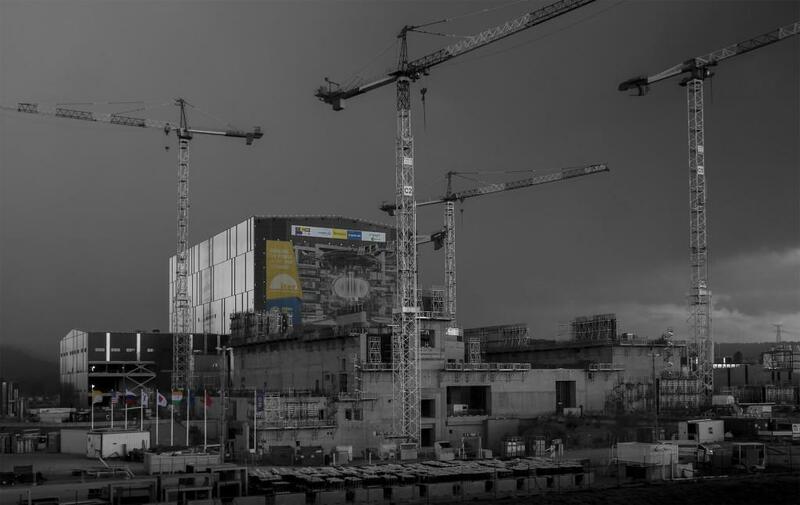 The ITER construction site on a stormy day, with a bit of added colour. 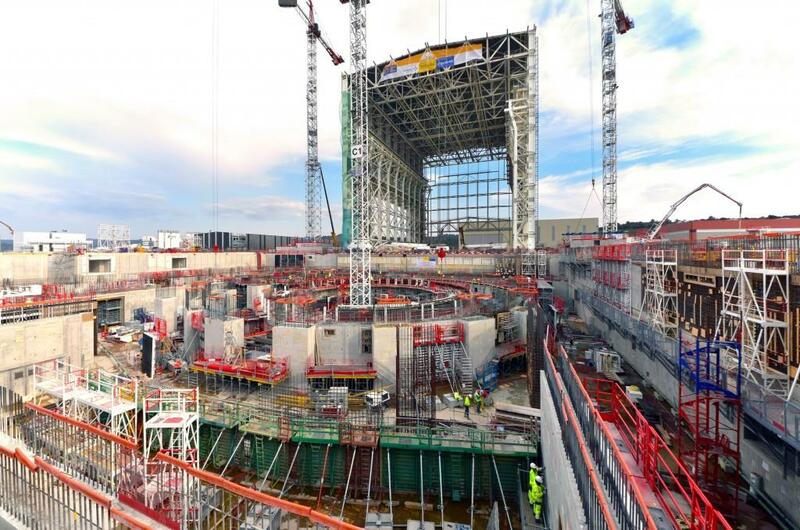 Down on the floor of the Tokamak Pit the steel reinforcement for about one-fourth of the crown has been set into place. 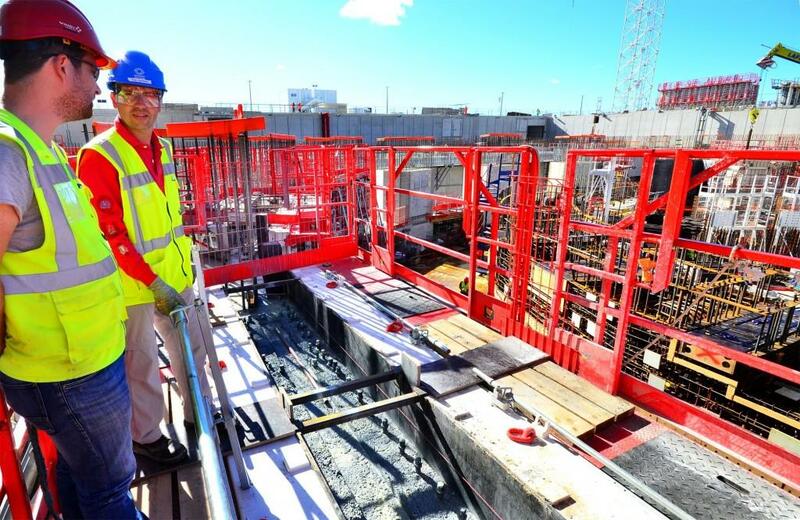 Pouring will start in May. 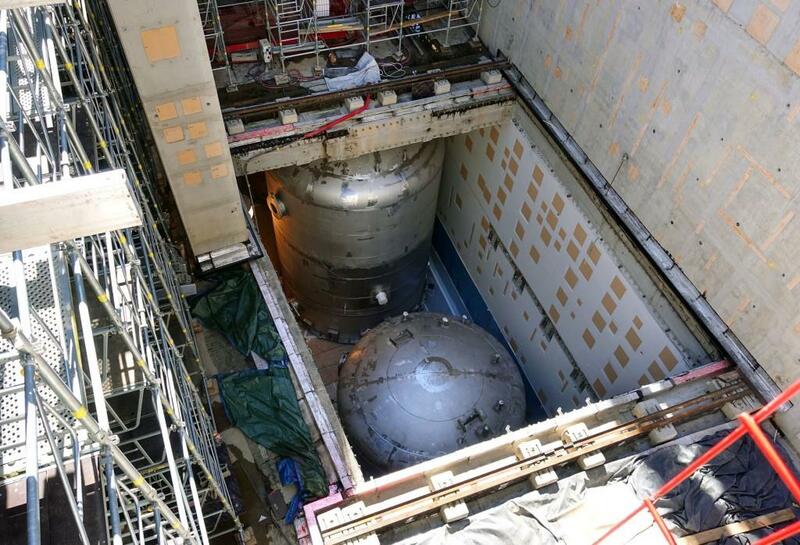 18 radial walls will transfer loads from the cryostat crown to the bioshield. 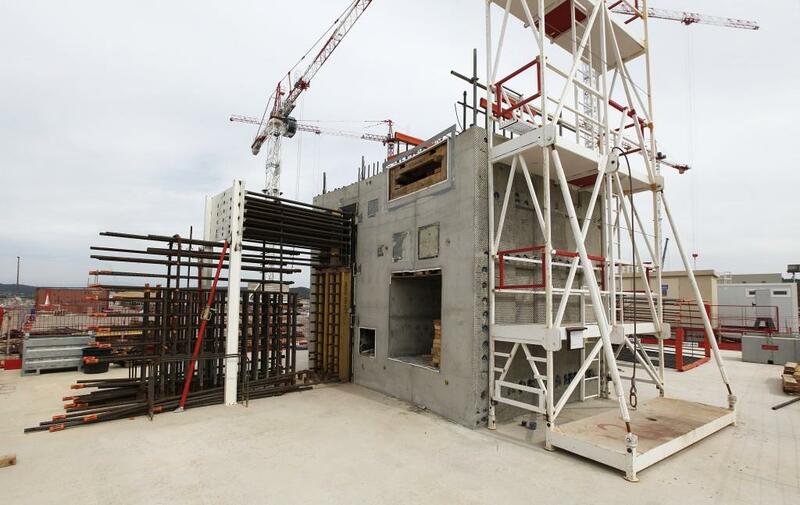 Two rectangular openings in the lid allow the equipment needed for the construction of the radial walls (formwork, rebar, etc.) 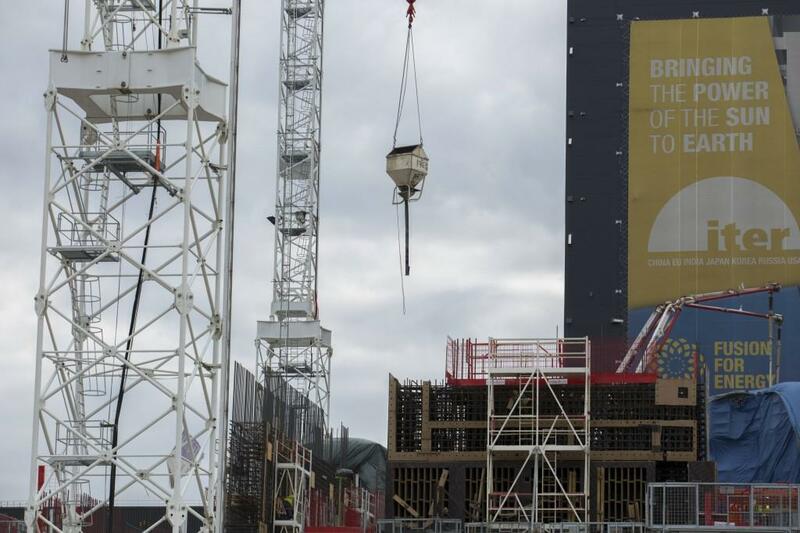 to be delivered to the floor of the amphitheatre and dispatched by the circular crane visible on the right of this image. 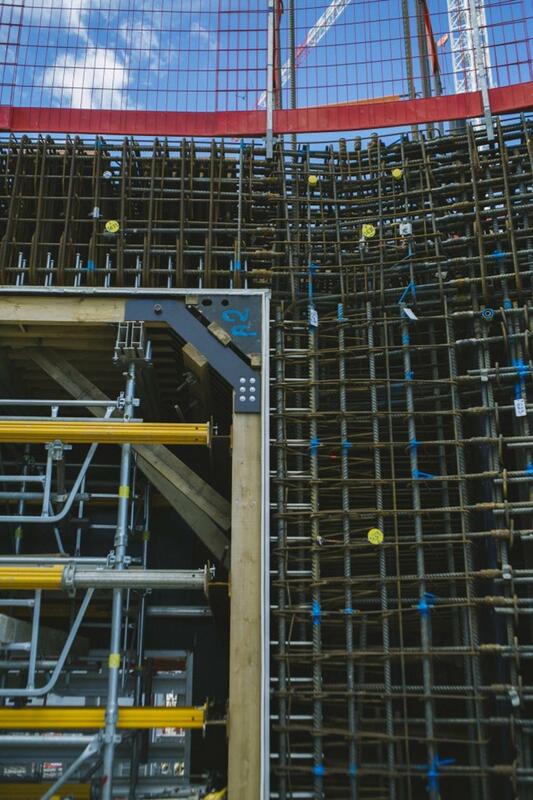 Connected to the dense rebar of the radial wall, this 3.5-tonne "steel transition piece" provides a pathway for the transfer and distribution of the loads to the surrounding concrete structure. 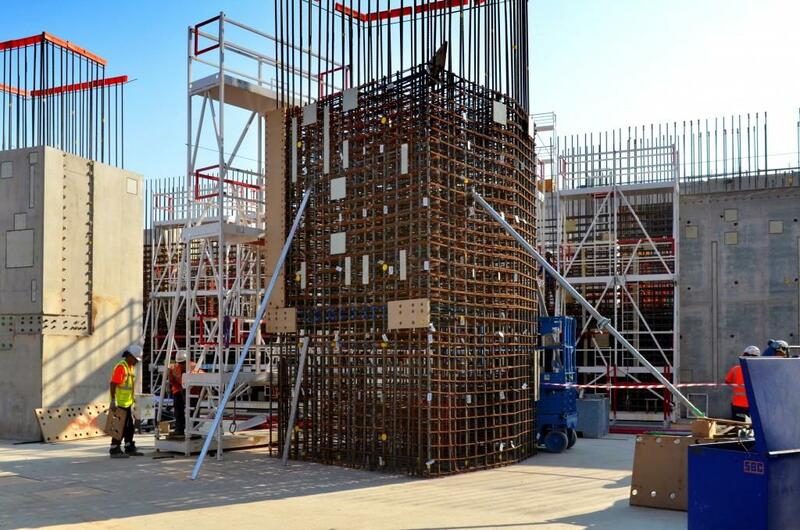 A "fire mesh" is being welded to the outer rebar of each radial wall. 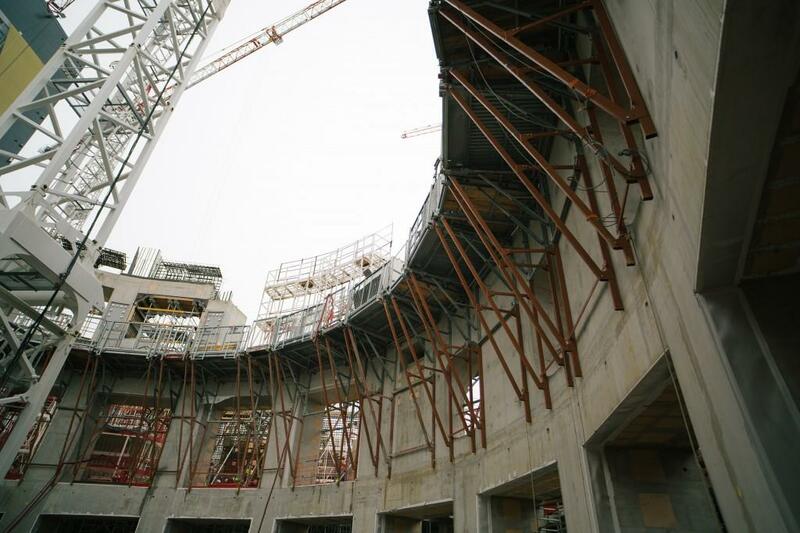 The mesh will sit just under the "skin" (15 to 20 millimetres) of the concrete surface and prevent spalling (splintering) in the case of fire. 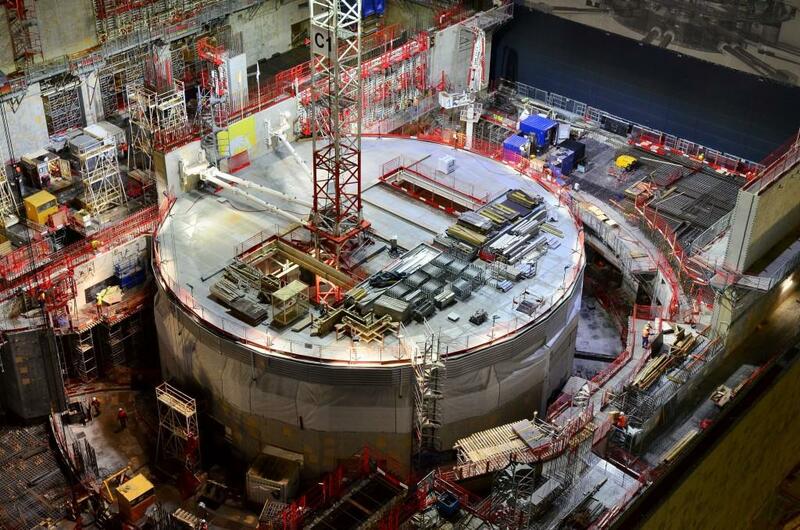 A steel-lined drain tank room in the bowels of the Tokamak Complex. 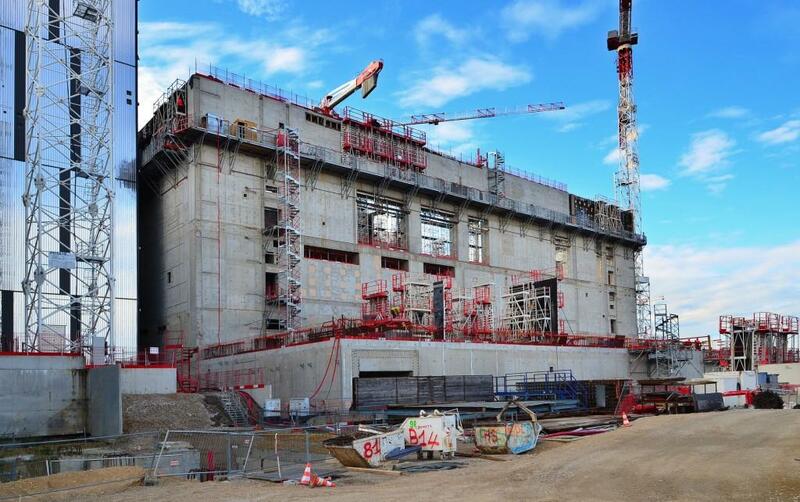 Seven steel tanks will be introduced through the roof of the room for the storage of Tokamak cooling water. 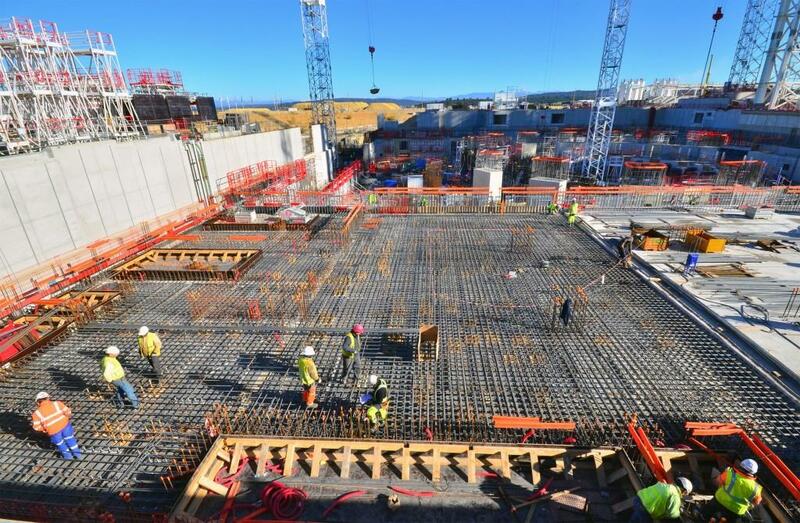 The first pour for the concrete crown that will be situated under the cryostat base is scheduled for early May. 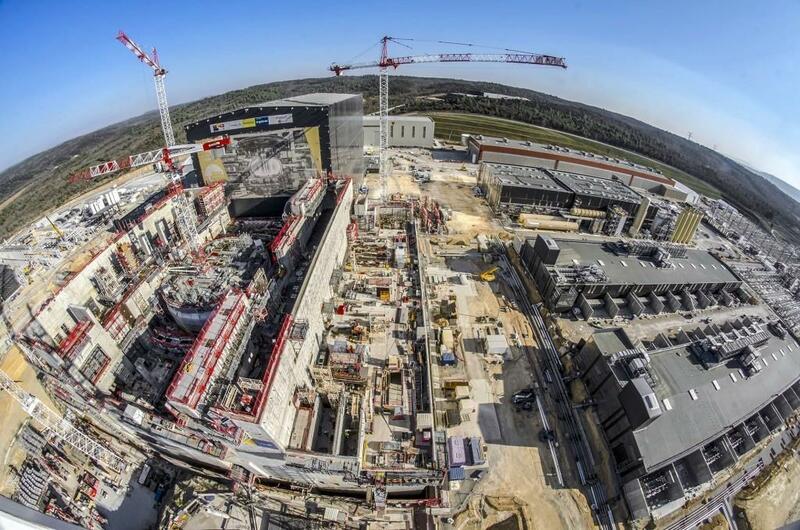 The rebar in this part of the Tokamak Complex is particularly dense. 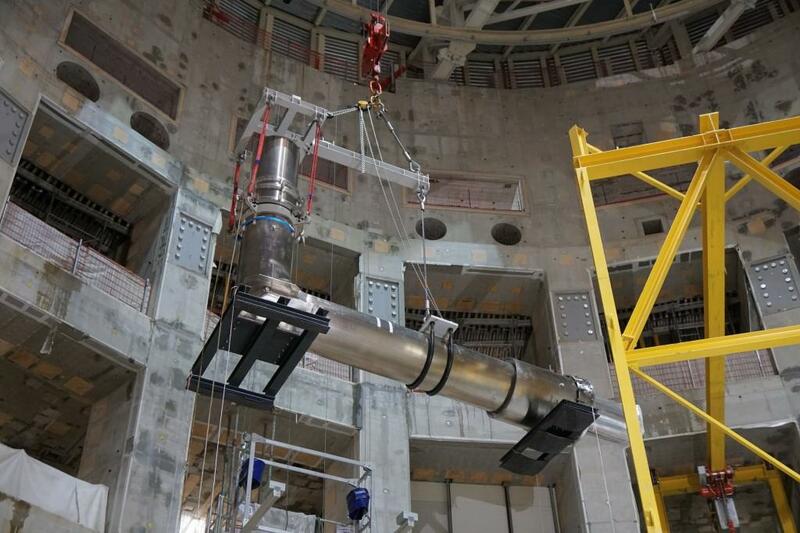 To prepare for the first pour of the cryostat crown, teams are integrating 500 metres of cooling tubes. 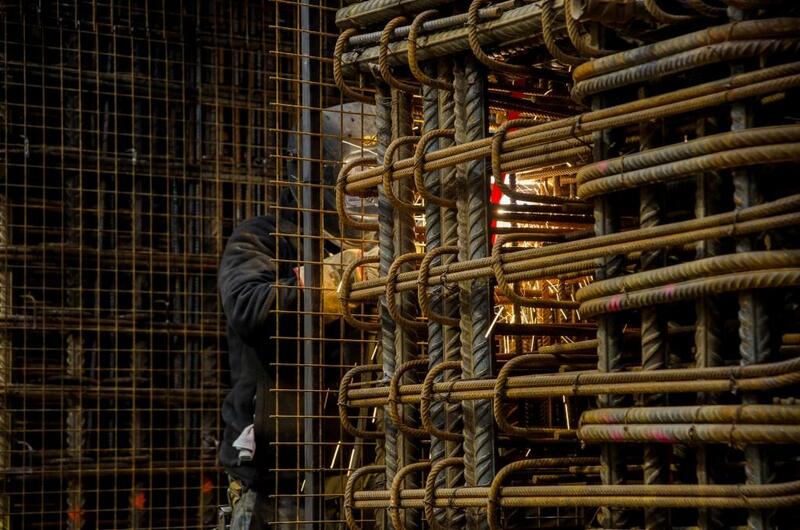 The temperature of the concrete during the hardening process will be regulated and homogenized by cooling water circulating inside these tubes and monitored by sensors distributed throughout the structure. 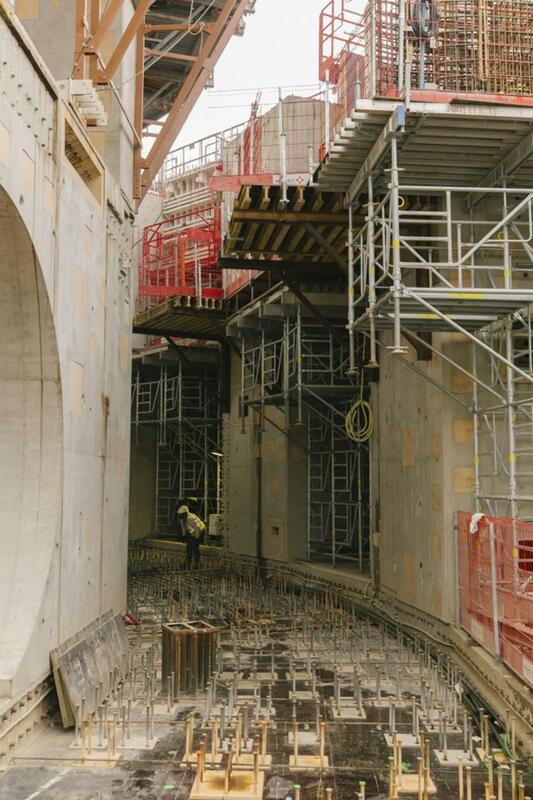 Two rectangular openings in the bioshield lid will allow rebar and formwork to be delivered to the lower region, where work is underway on the "crown" that will support the cryostat. 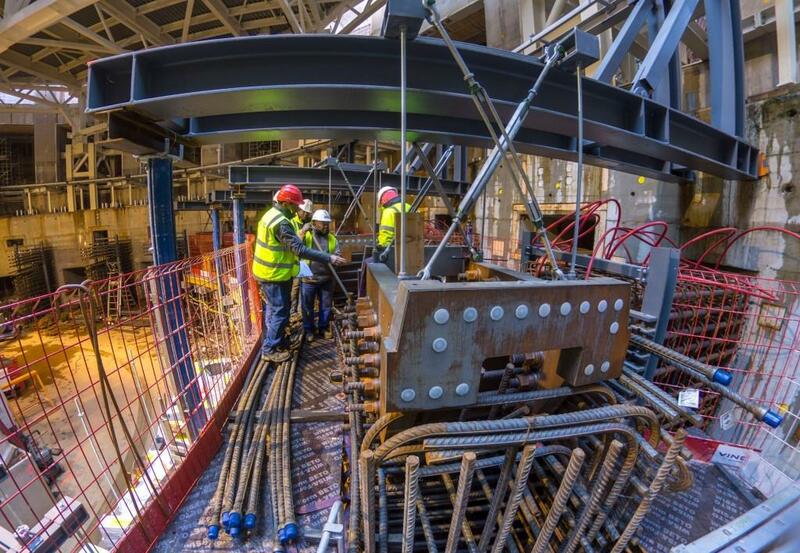 The first machine component will be introduced through these openings in the autumn. 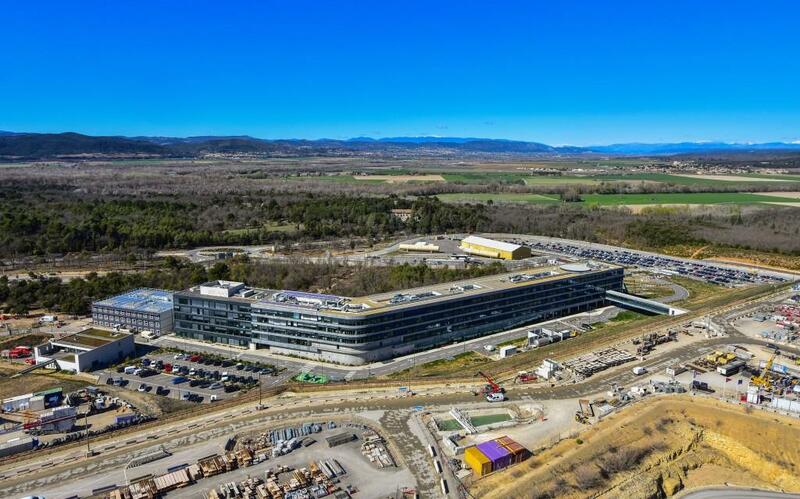 To the left of the ITER Headquarters building, additional office space will soon be made available to ITER Organization staff and direct contractors, bringing the total capacity of this main office area to approximately 1,250 people. 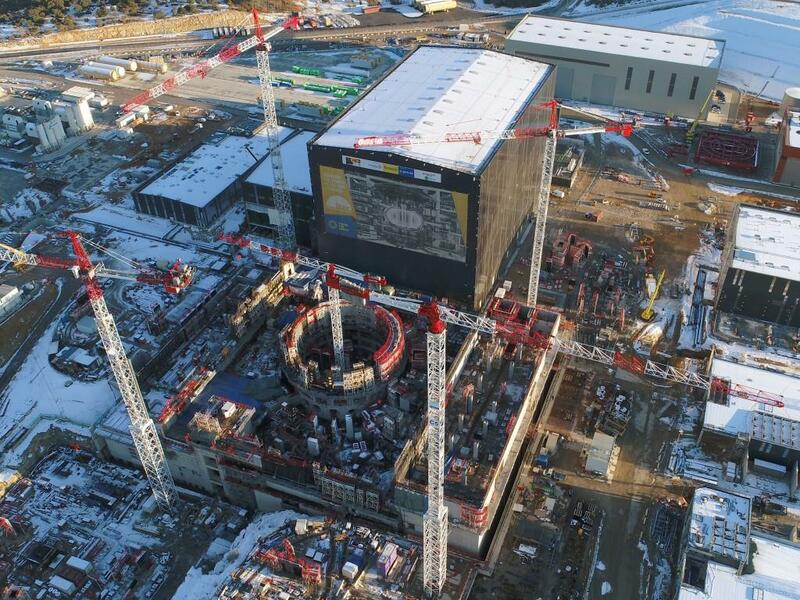 From 70 metres above the worksite, the "box" of the Tokamak Building stands out clearly, with the machine well at its centre. 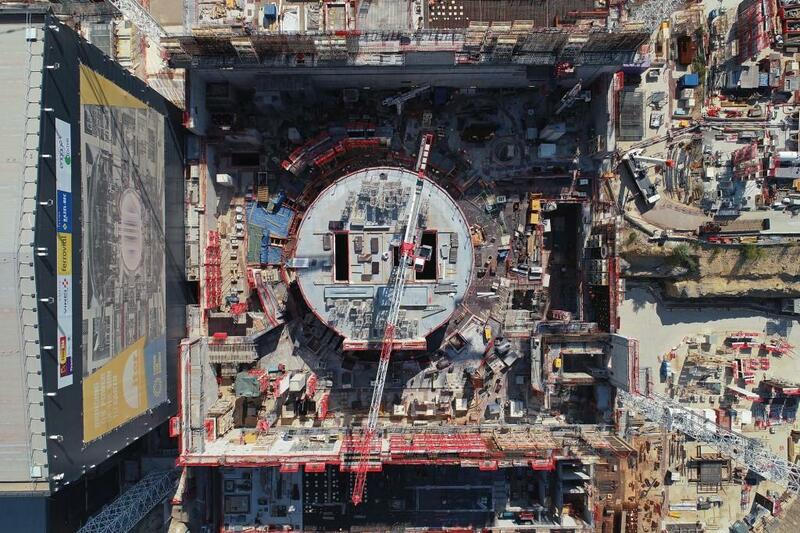 The Diagnostics Building (at the bottom of the frame) and the Tritium Building (beyond the bioshied) complete the Tokamak Complex, which will be fully closed over in 2020. 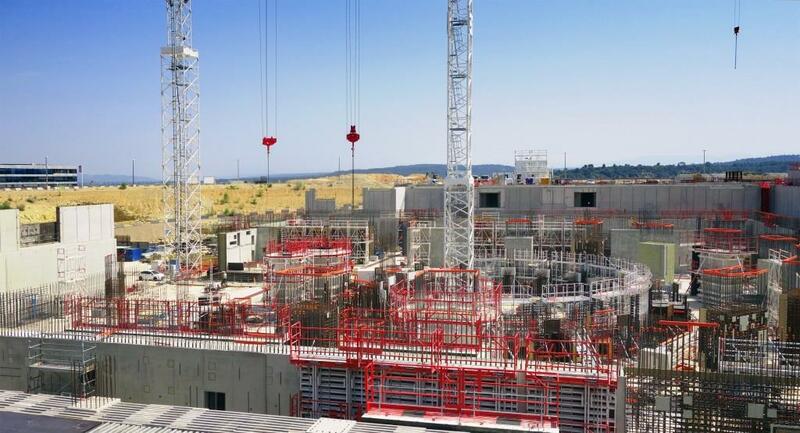 Looking south across the ITER platform a new feature has emerged: the vertical storage tanks that have been installed along the cryoplant at left. 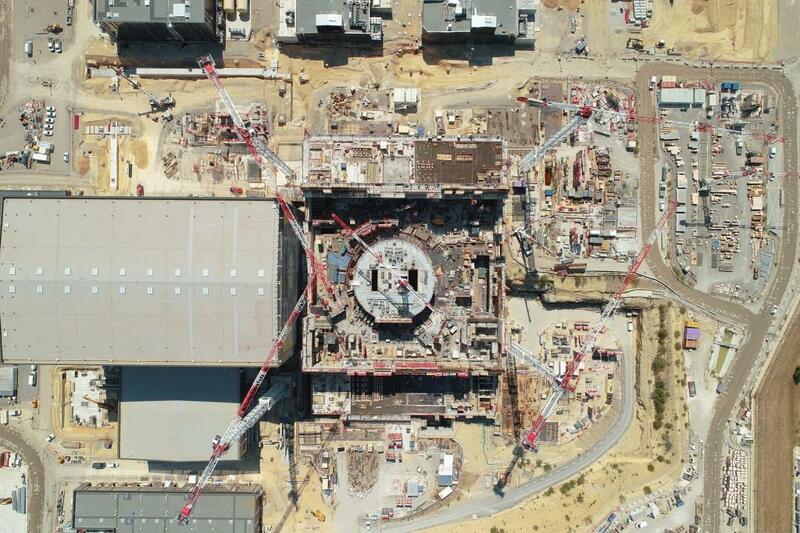 The status of Tokamak Complex construction in mid-March. 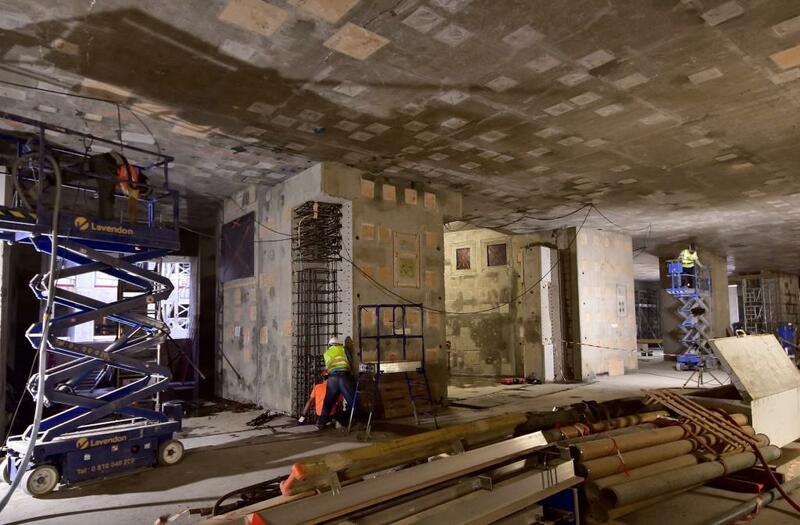 The elevator shaft for the "cask and plug" remote maintenance system stands out at left. 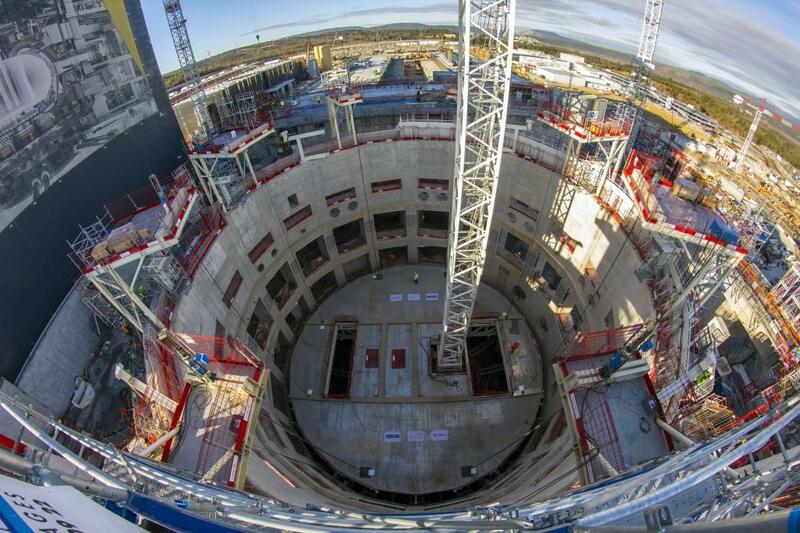 The ITER machine will be assembled here, in this 30-metre-tall "Tokamak Pit." 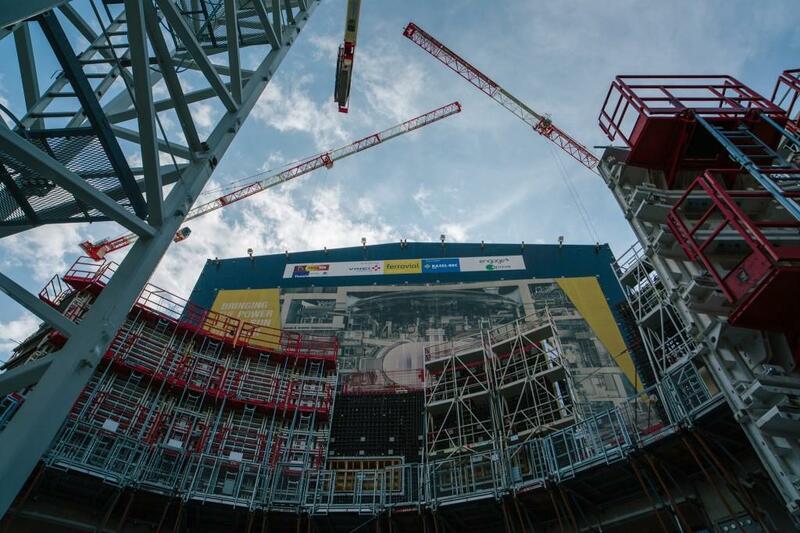 From both a structural and safety perspective, the crown and its radial walls are one of the most strategic parts of the ITER installation. 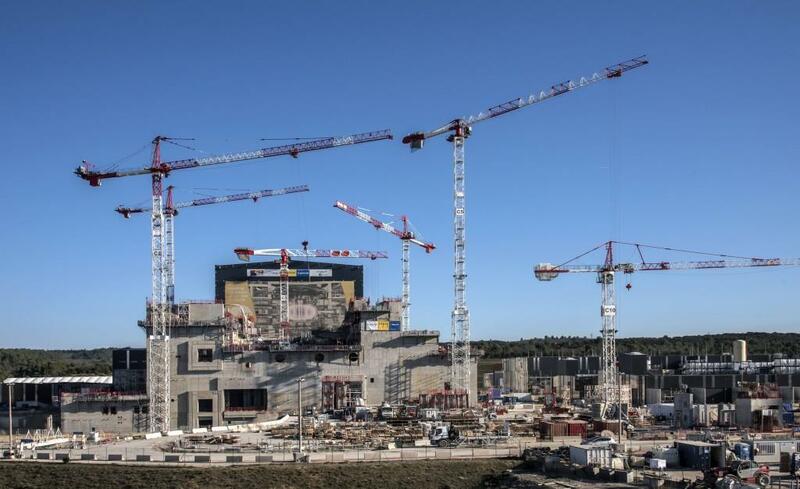 They should be finalized by the end of the summer. 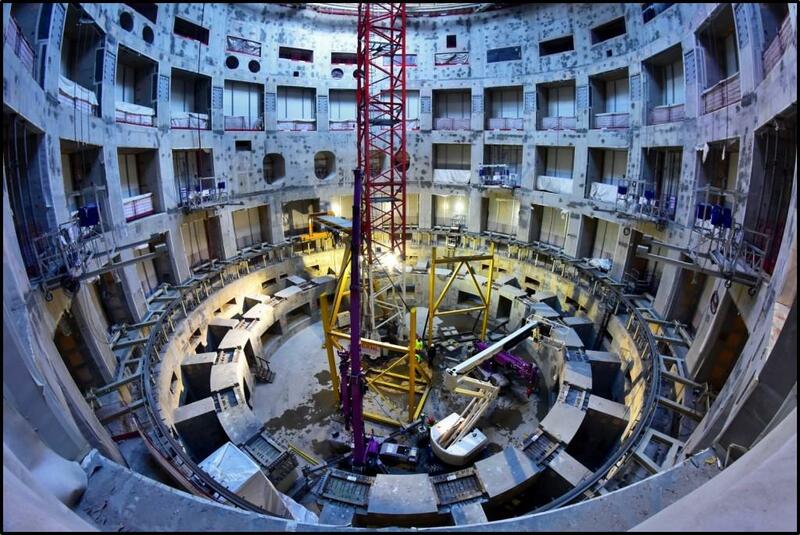 At the bottom of the "pit" work is underway on the 18 radial walls that will transfer forces from the cryostat crown to the thick bioshield. 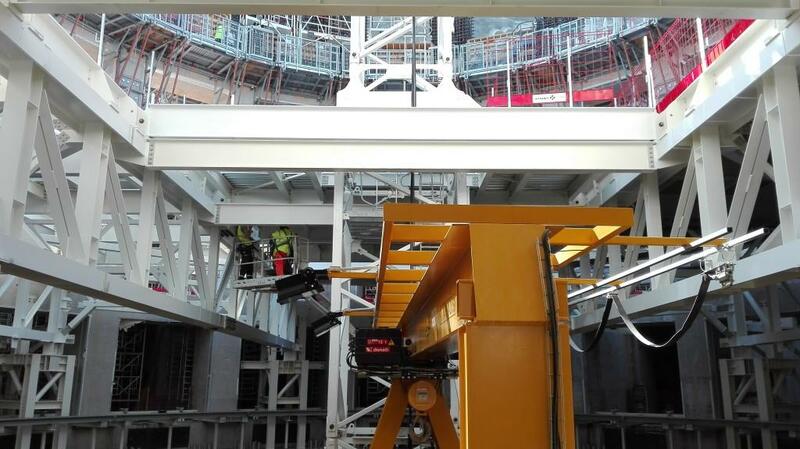 A gantry crane (in yellow) covers the complete circle of the "pit" to deliver the heavy steel transition pieces (3 tonnes) that are on top of each wall. 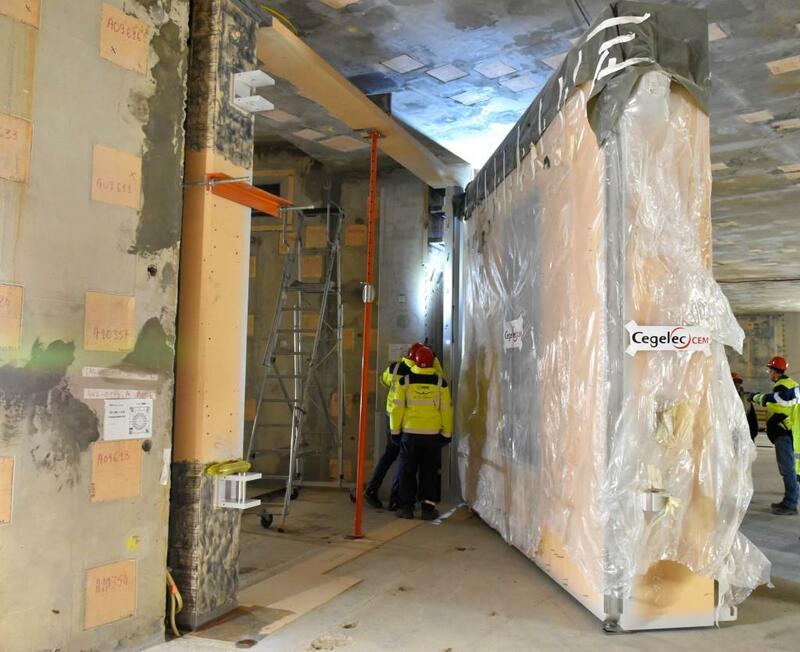 From its position at the top of the bioshield, the lid creates a protected work space below. 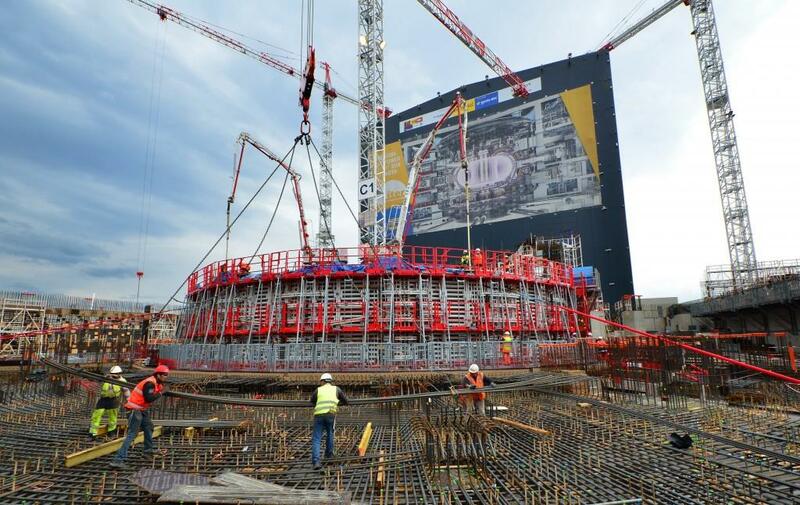 When a steel rim is added to fill in the gap around the lid, the structure will weigh approximately 200 tonnes. 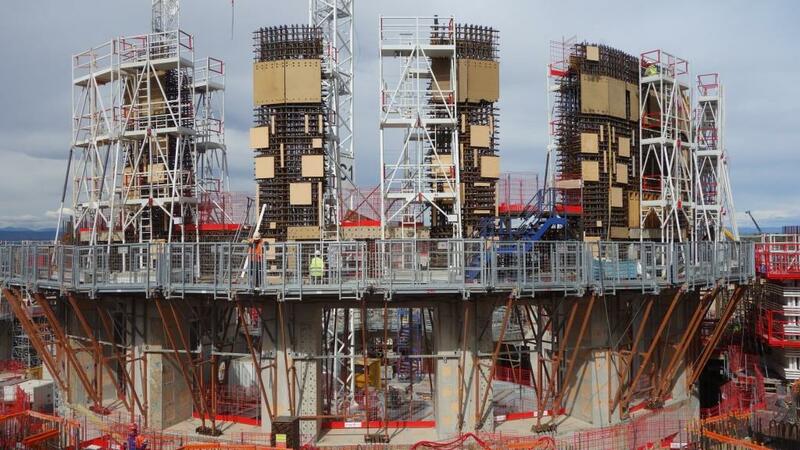 As the cables are pulled up, technicians on each platform cut away the excess. 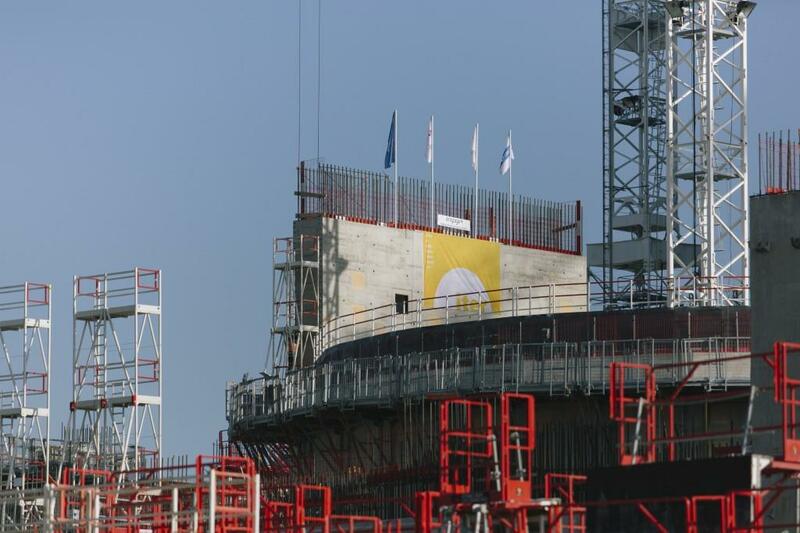 Participants to the lifting operation stand in front of the "Fusion for Energy" flag on the worksite. 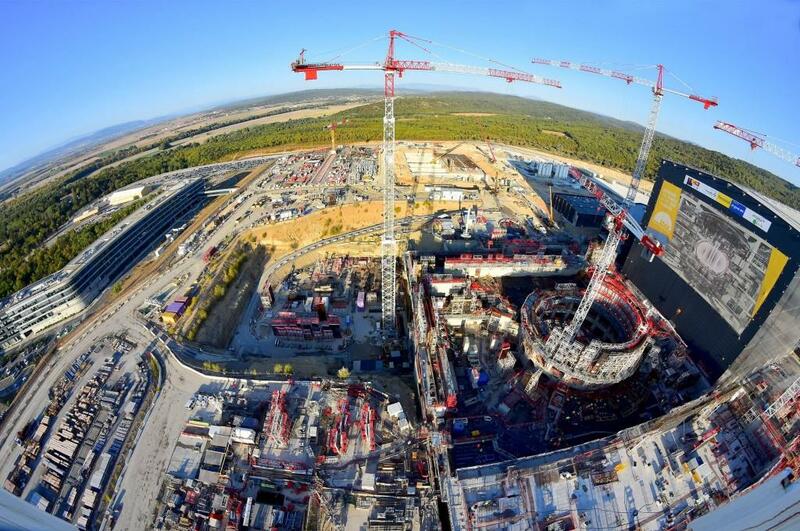 "Fusion for Energy" is another name for the European Domestic Agency for ITER, which has been charged with the construction of all site buildings and infrastructure. 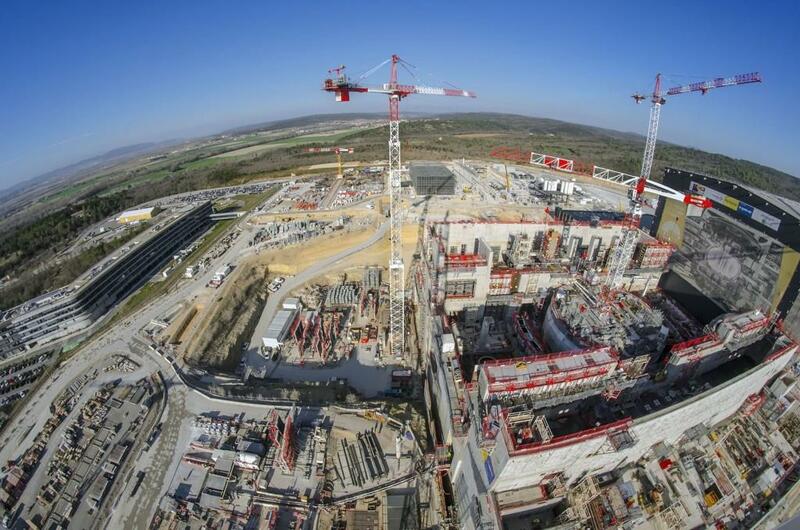 The view of the French countryside is becoming spectacular, up at the top of the Tokamak Complex works. 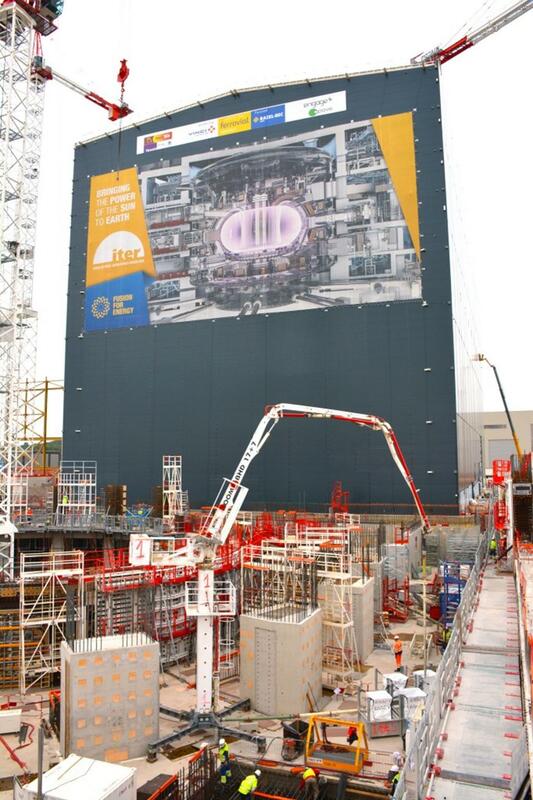 The lid has already been lifted 1 metre and all is proceeding smoothly. 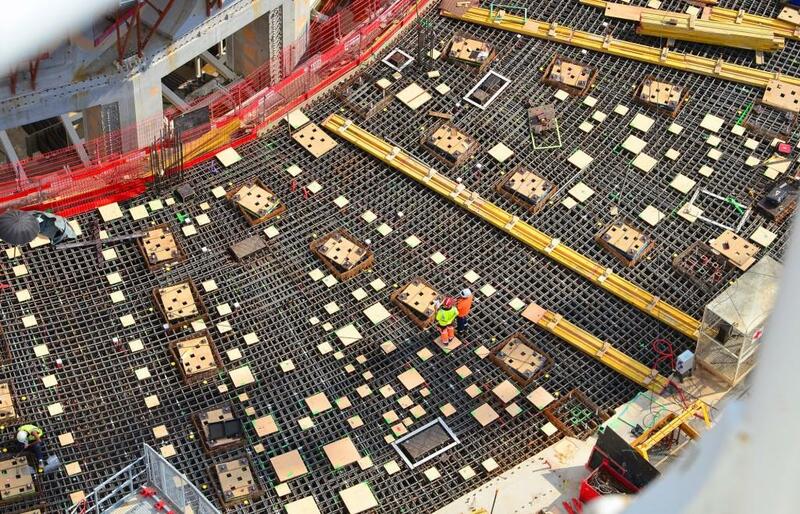 The black cables are slowly lifting the temporary lid—or floor, depending on your perspective. 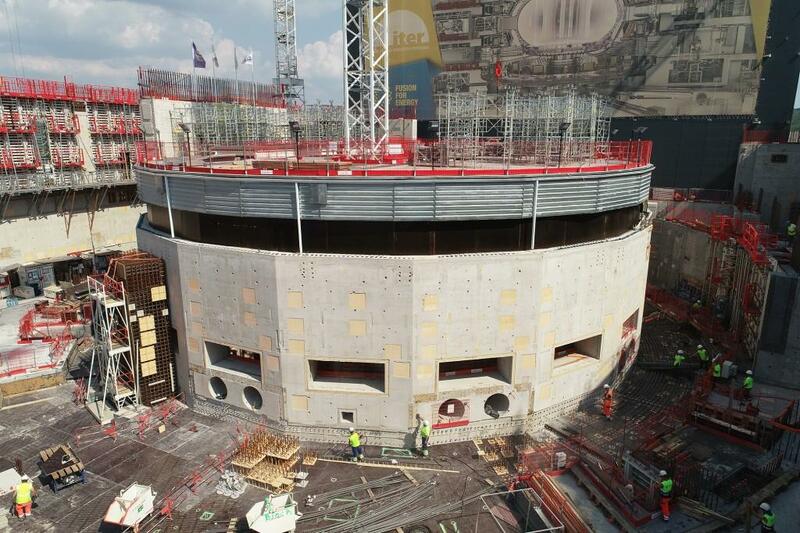 Until the Tokamak Complex is completed, the lid will remain at the top of the bioshield. 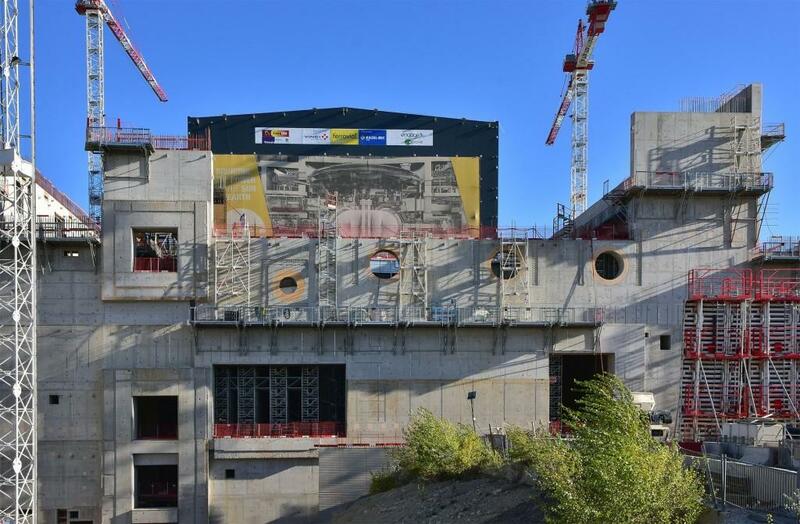 To lift the 150-tonne lid, eight hydraulic jacks were positioned on eight evenly spaced metallic structures. 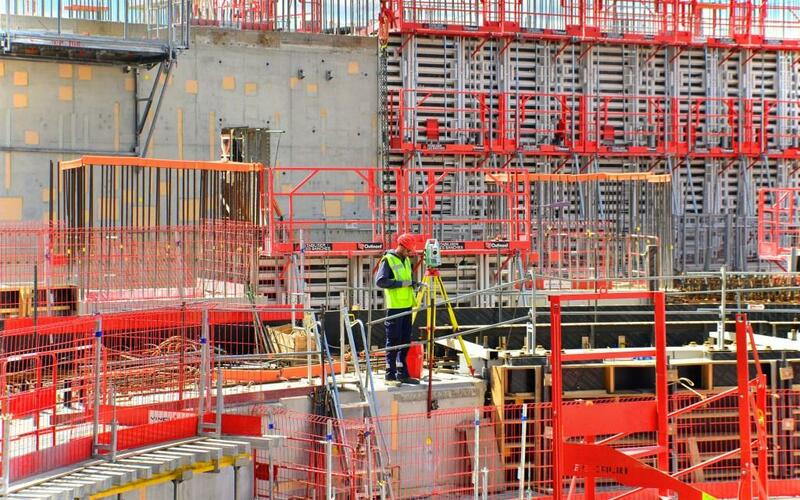 The worker in yellow standing on the lid gives a sense of perspective. 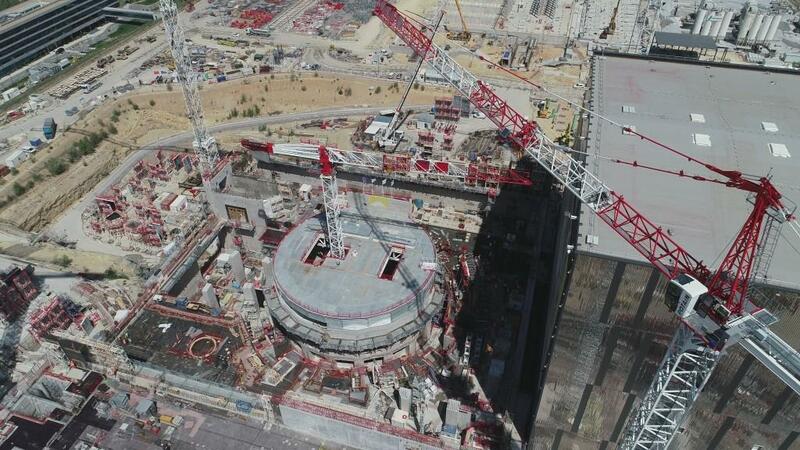 The lid is 30 metres in diameter. 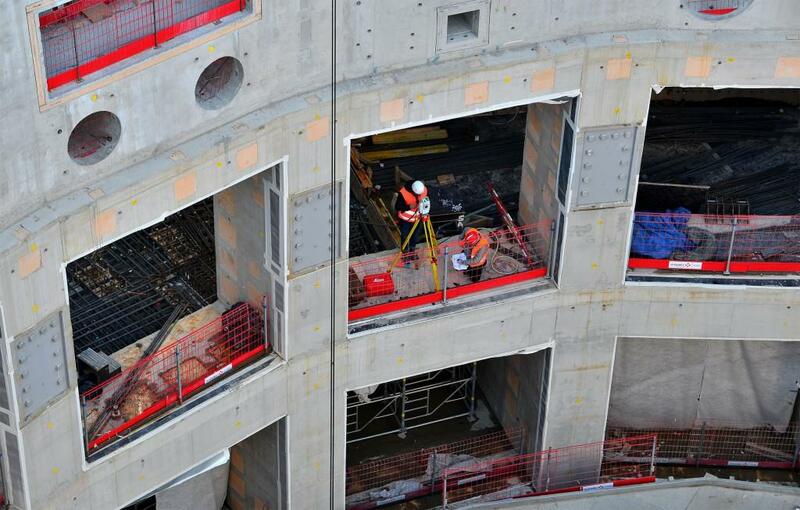 The two gaping doors visible in the wall of the Tokamak Building are reserved for the cask and plug remote handling system. 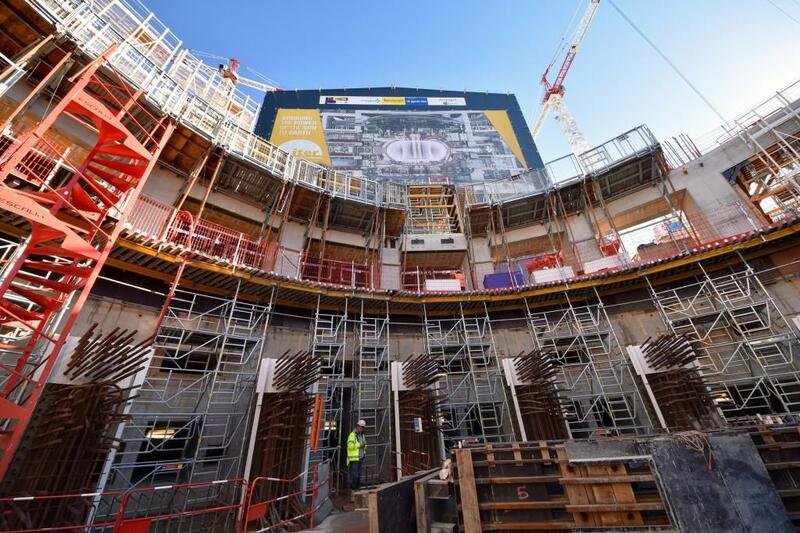 Bus-size containers will travel through these openings between the Tokamak and the Hot Cell, carrying components for refurbishment or replacement. 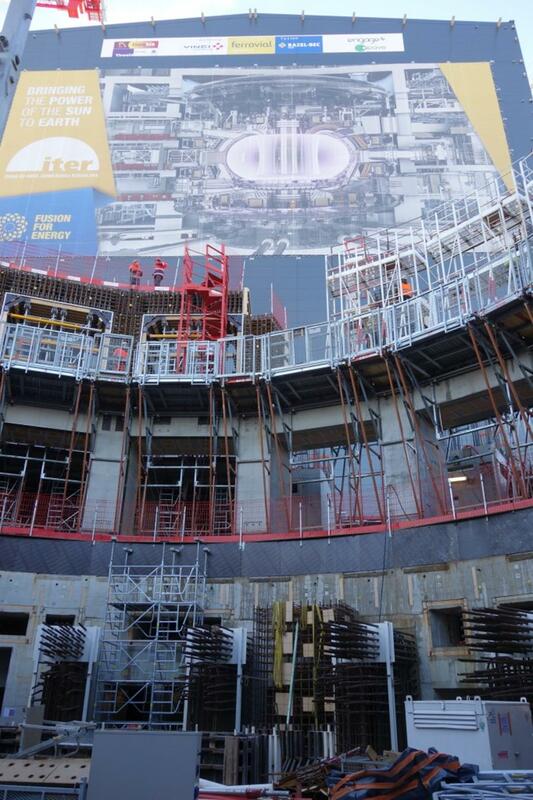 A cutaway of the Tokamak Complex, seen from the perspective of someone standing in ITER Headquarters. 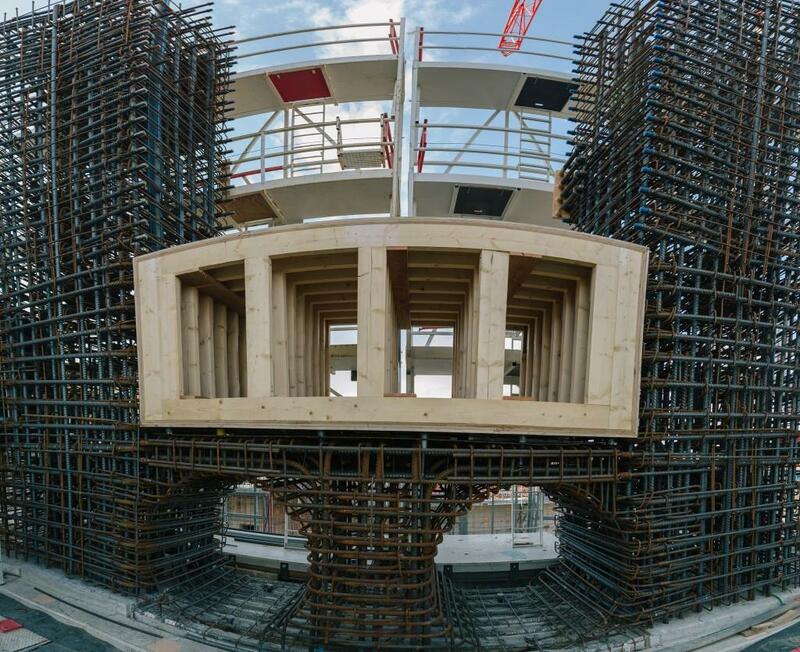 Note the floating foundation contained within retaining walls and the central machine assembly well formed by the bioshield. 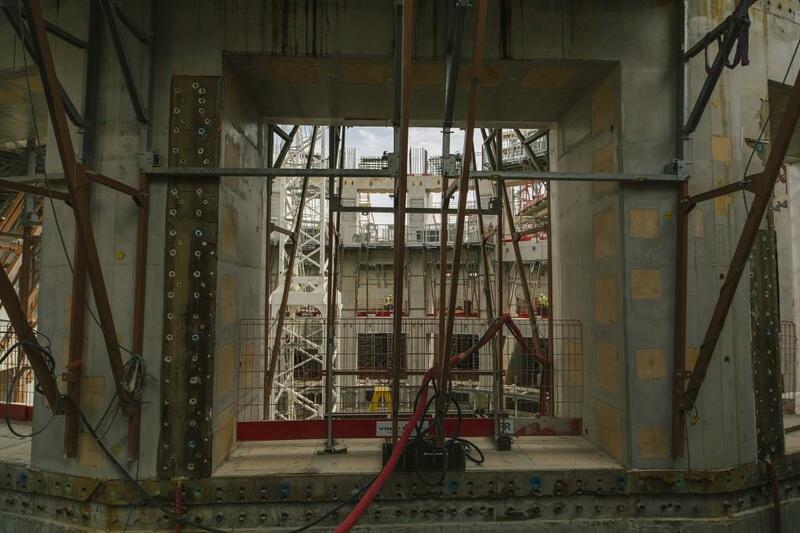 Peeking through the columns at levels 1 (round penetrations), 2 (square penetrations) and 3/4 of the bioshield. 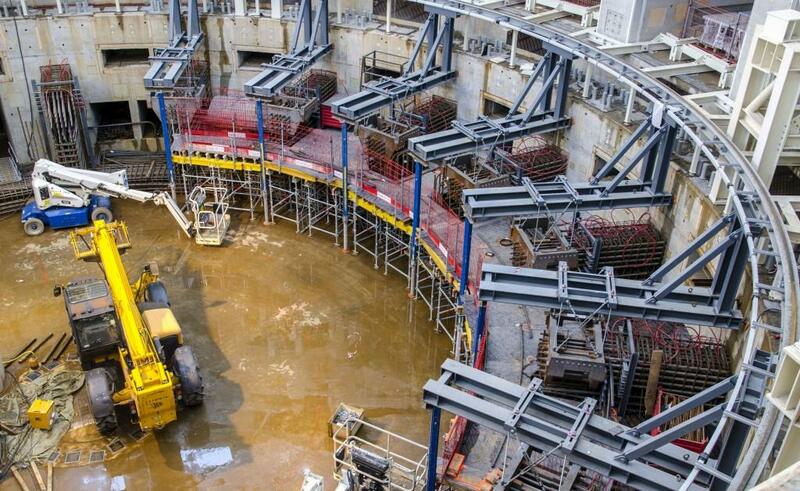 Two basement levels are hidden from view. 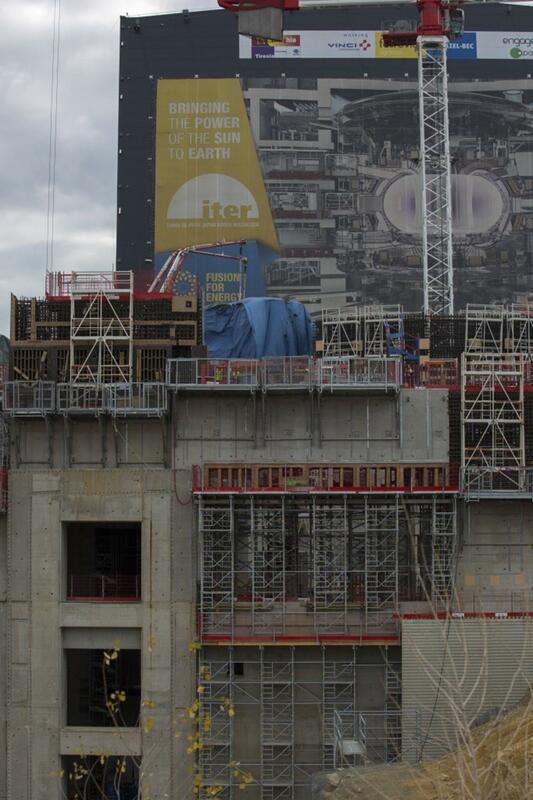 The worker in yellow gives a sense of scale. 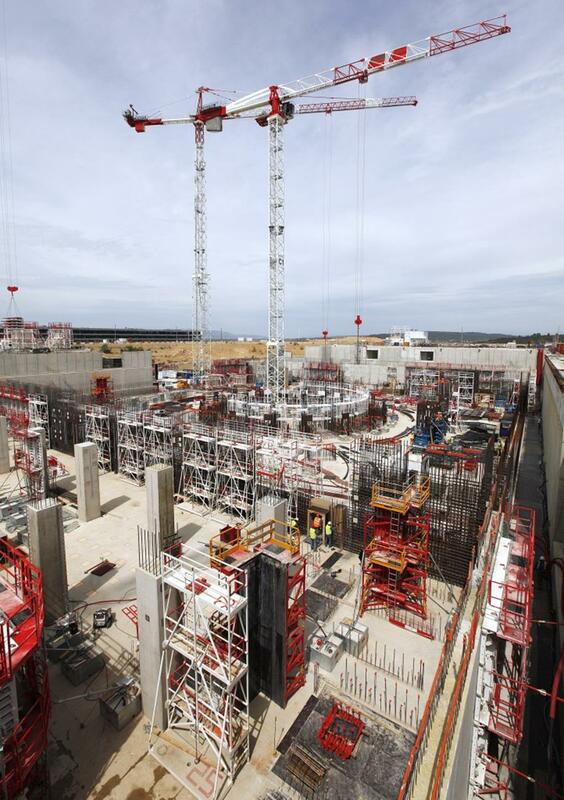 Each level of the Tokamak Building will be completely filled with plant equipment and systems supporting operation. 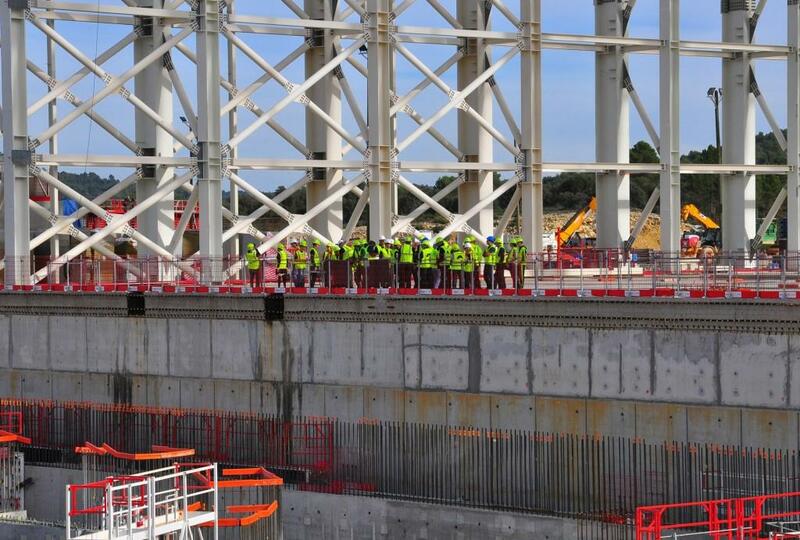 Here, workers are walking at L2 level. 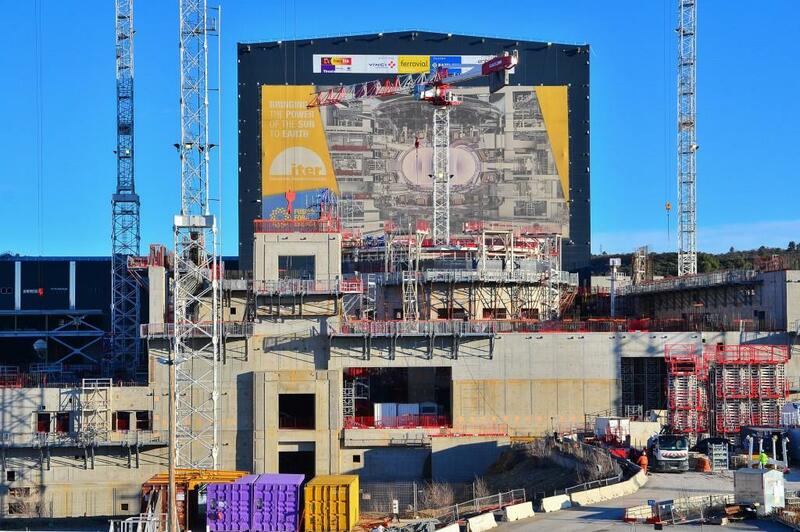 The Tokamak Complex and Assembly Hall, framed by a half dozen tall cranes, are painted pink and gold in the late afternoon sun. 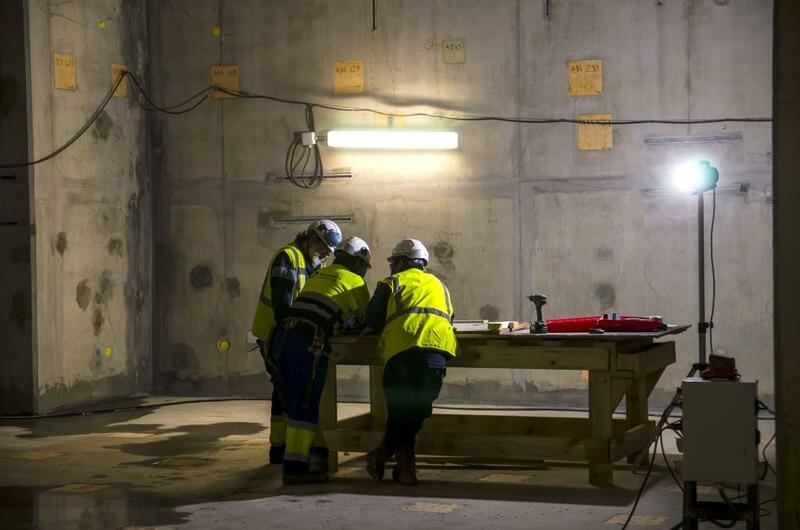 This steel-lined basement room will house water tanks for the Tokamak's cooling water and pressure suppression systems. 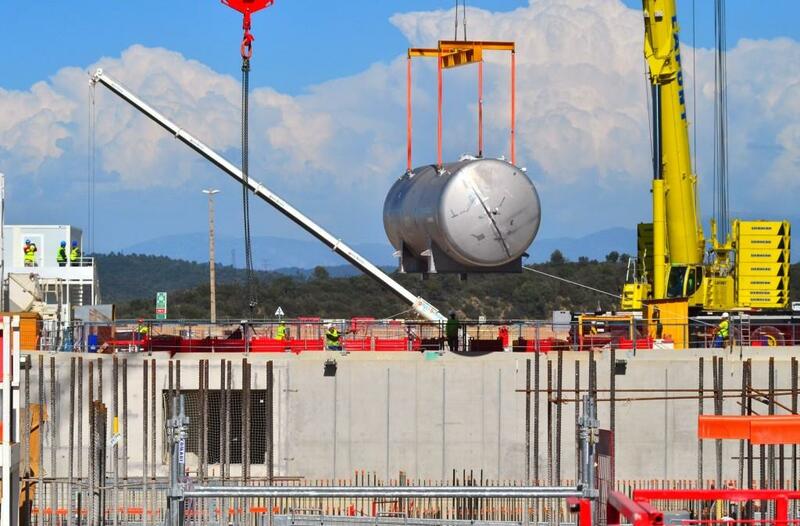 The tanks will be introduced through the roof. 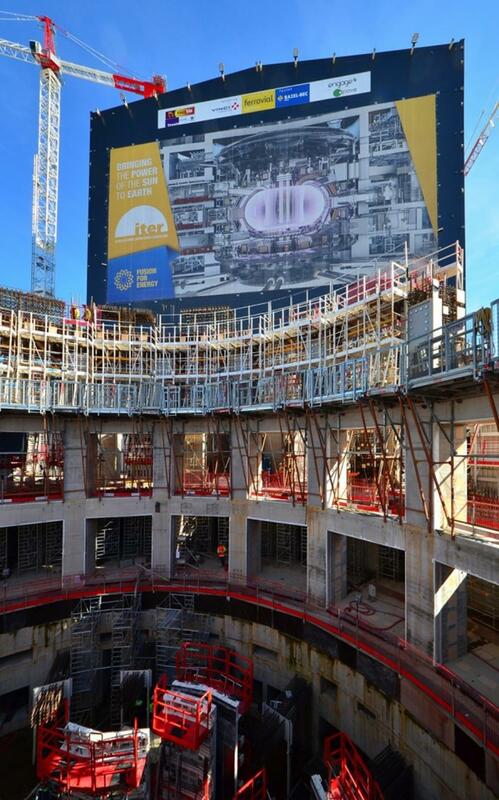 In January, the last plot of the bioshield level 4 was poured. 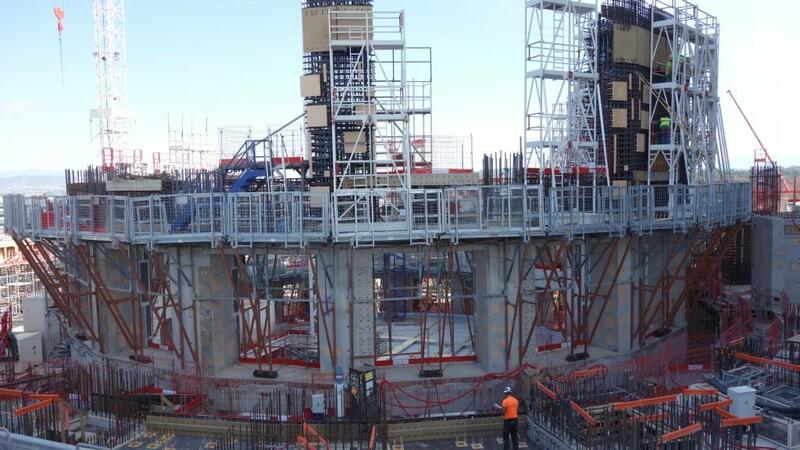 The structure rises 30 metres from the basement (B2) level to the top (L4). 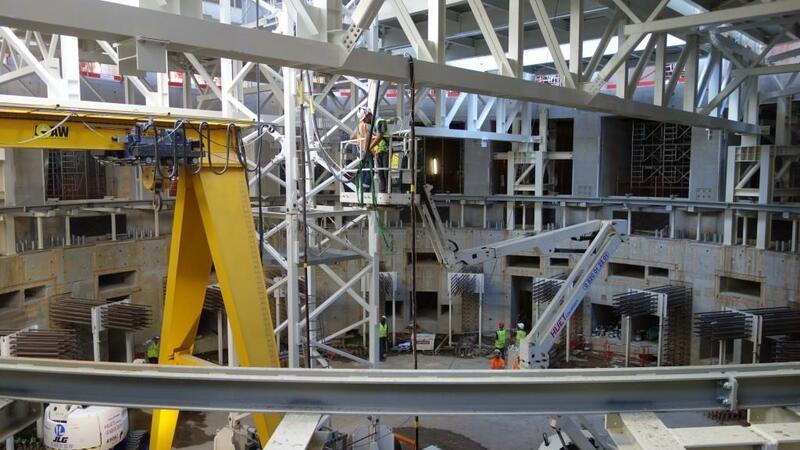 These columns going up in the foreground will support the roof of the neutral beam area. 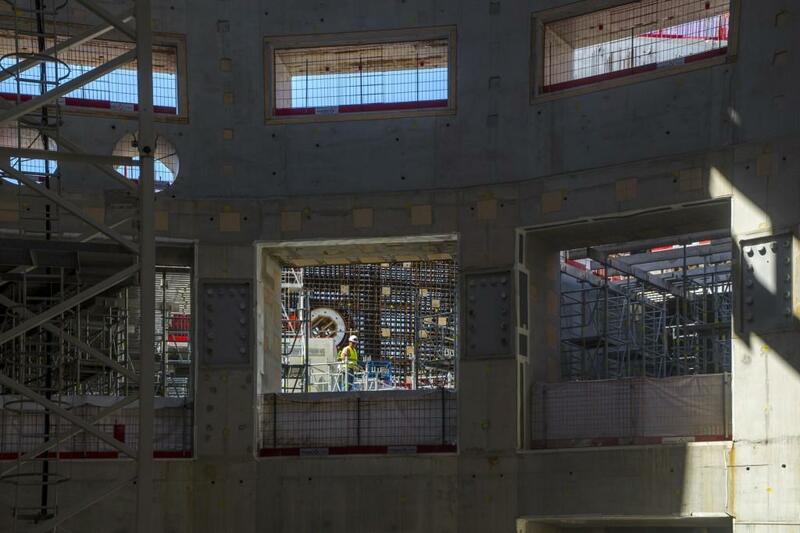 Large bus-sized injectors will be positioned in this space with access to the Tokamak through the round/oval windows visible in this photo. 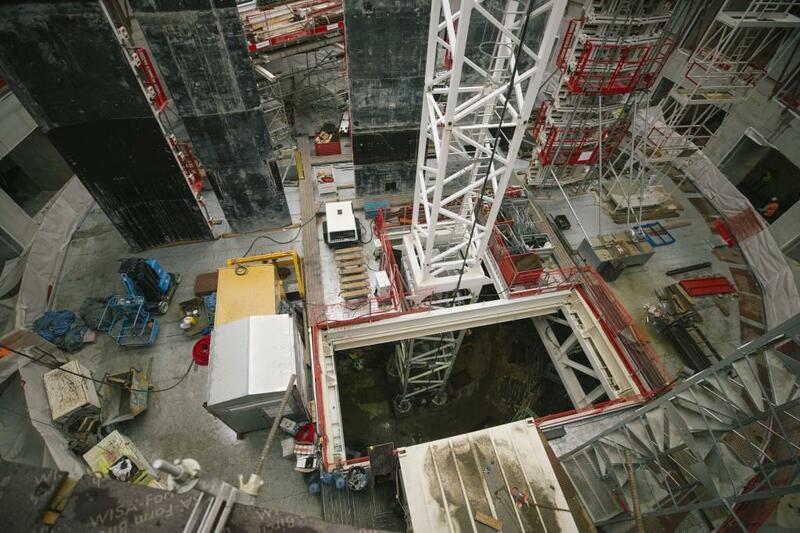 Once the bioshield has been capped with a temporary lid, work can proceed safely below. 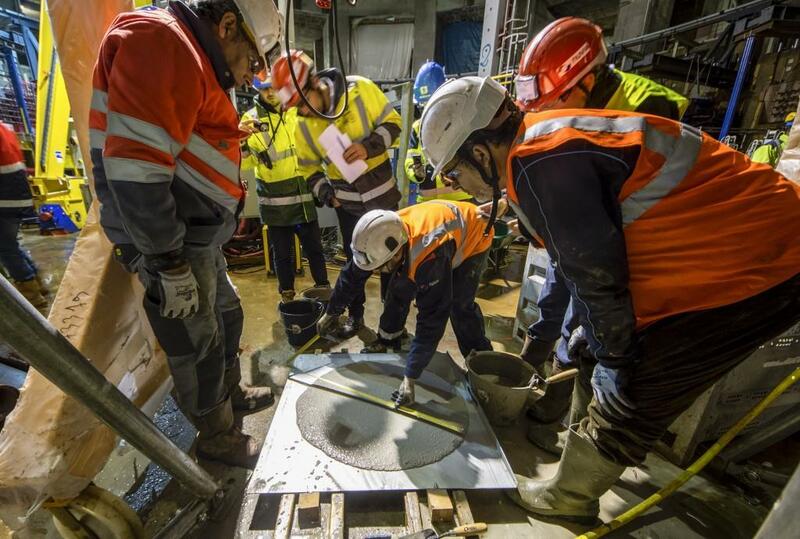 One of the upcoming tasks to be carried out is the positioning of "topographic benchmarks" to serve as guides in the installation of the cryostat sections. 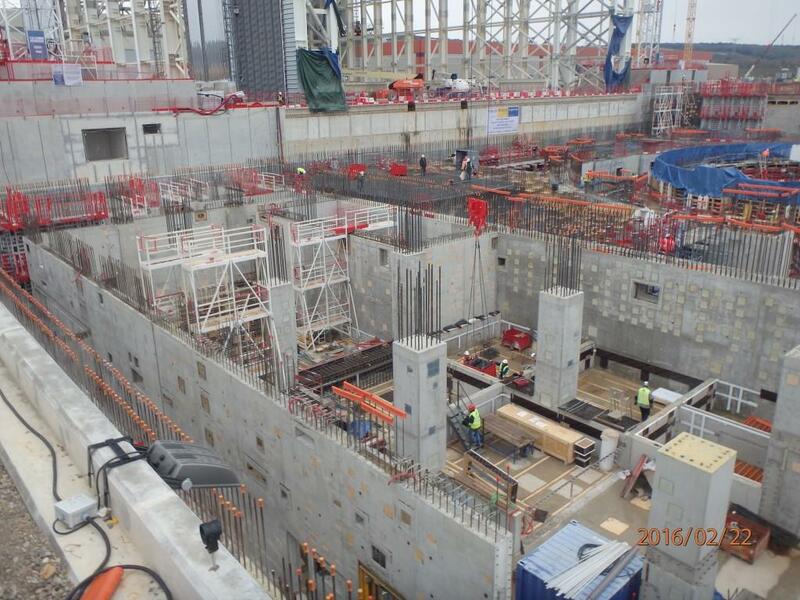 Formwork is in place and pouring is underway for one of the inner walls at L1 level. 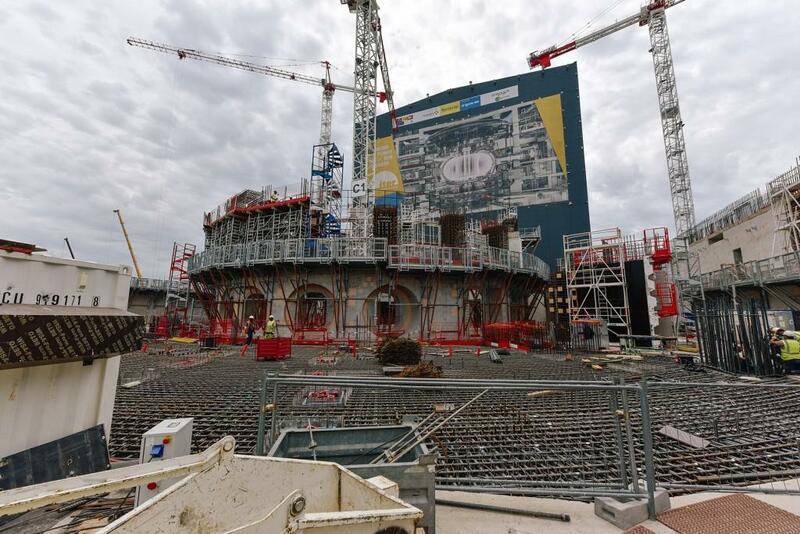 For the moment the two lower levels of the bioshield are closed off. 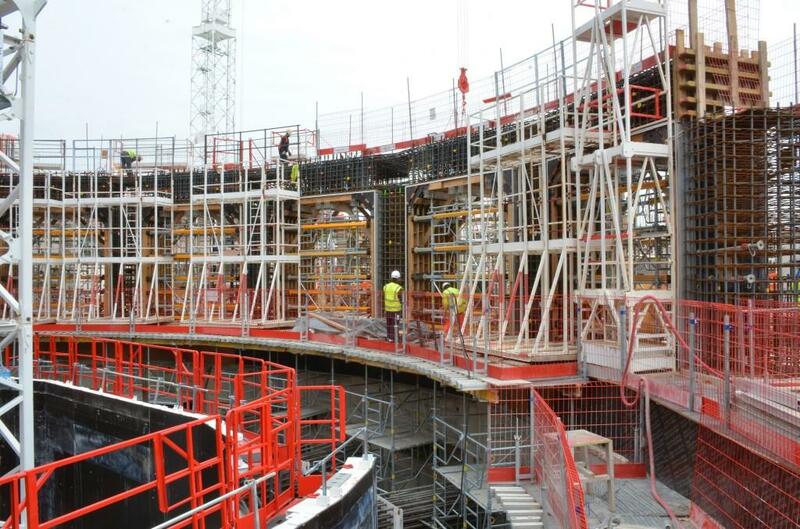 Soon, the lid will be repositioned at the top of the structure and workers will have unrestricted access to the entire volume of the Tokamak Pit. 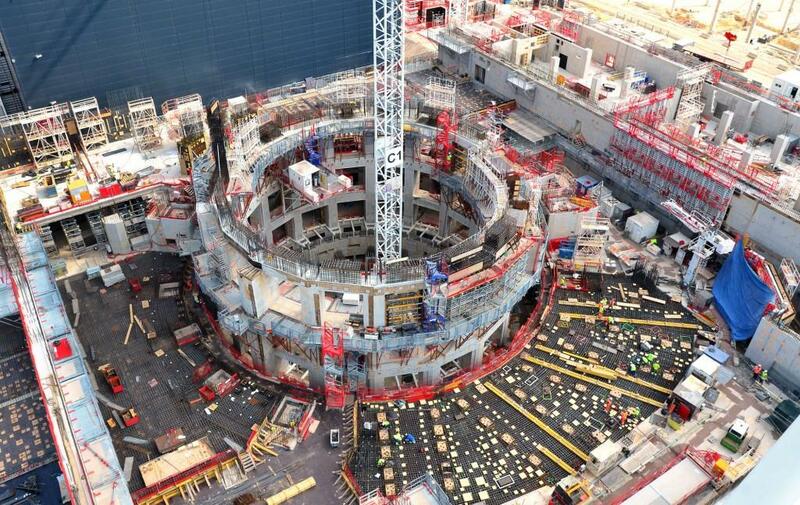 Radial walls will permit the machine's support structure to transfer some of the "force" experienced during machine operation to the bioshield wall and Tokamak Building basemat. 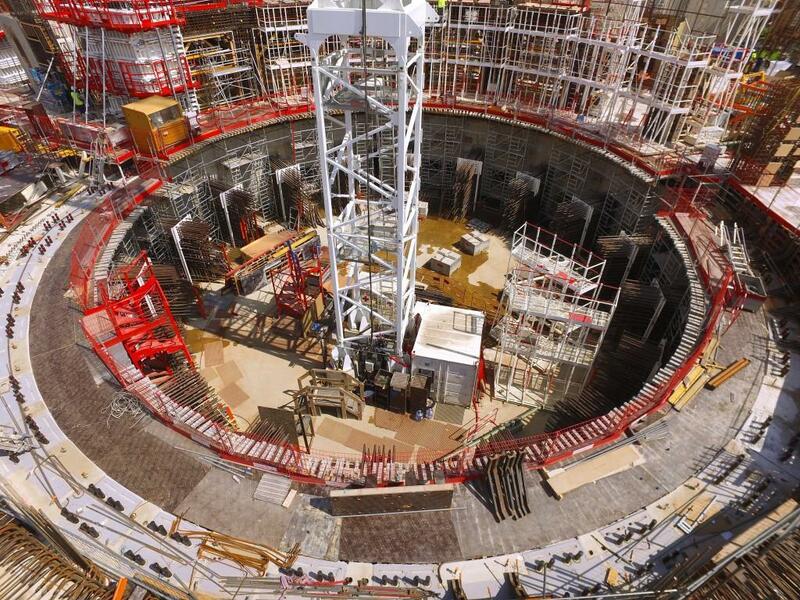 In the bottom of the Tokamak Pit, a concrete crown will support the base of the cryostat. 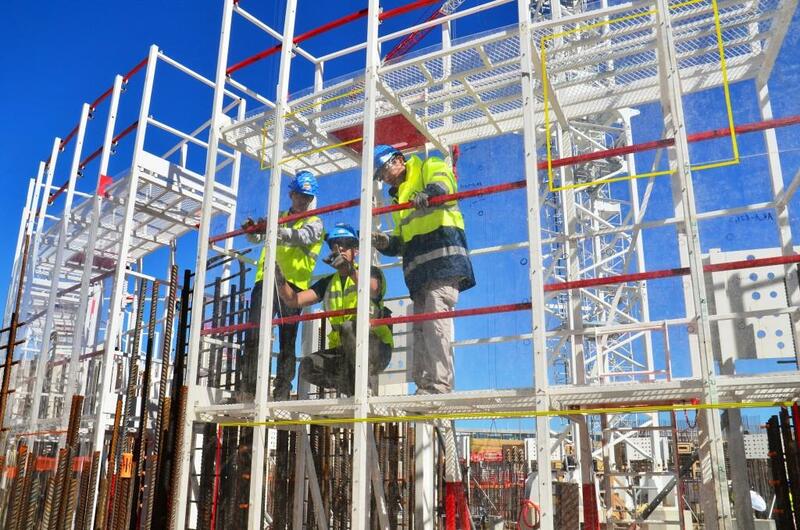 After realizing a full-size mockup to validate constructability, workers are now carrying out the first steps. 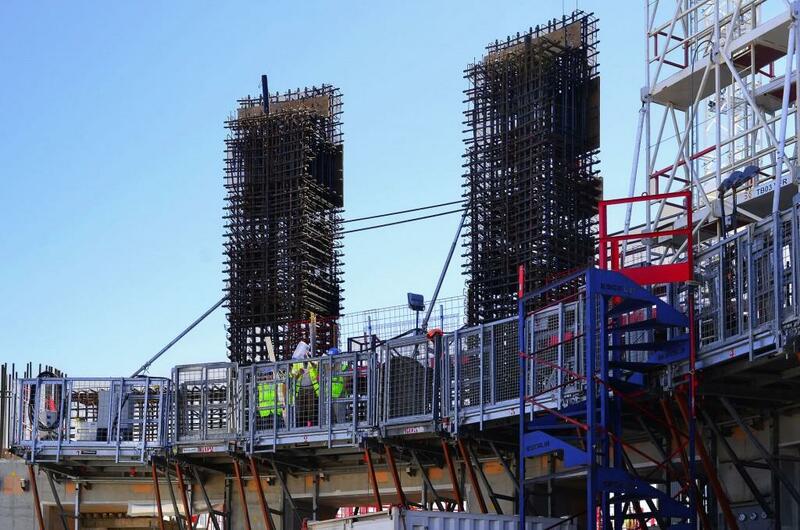 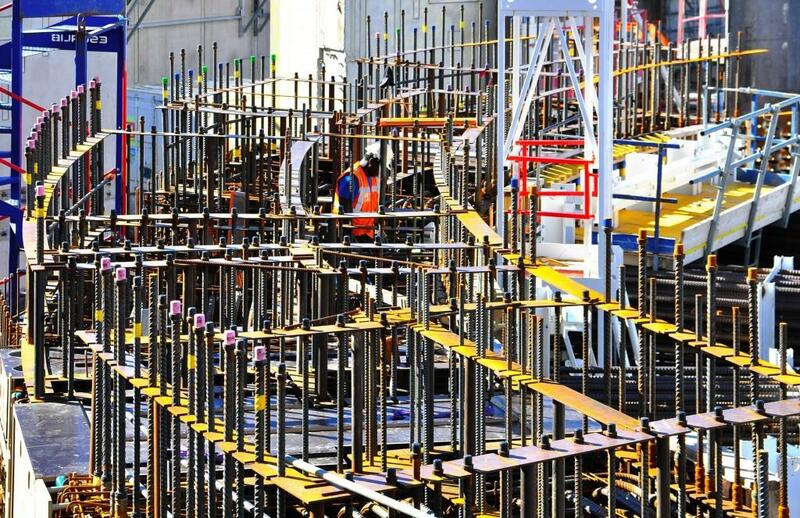 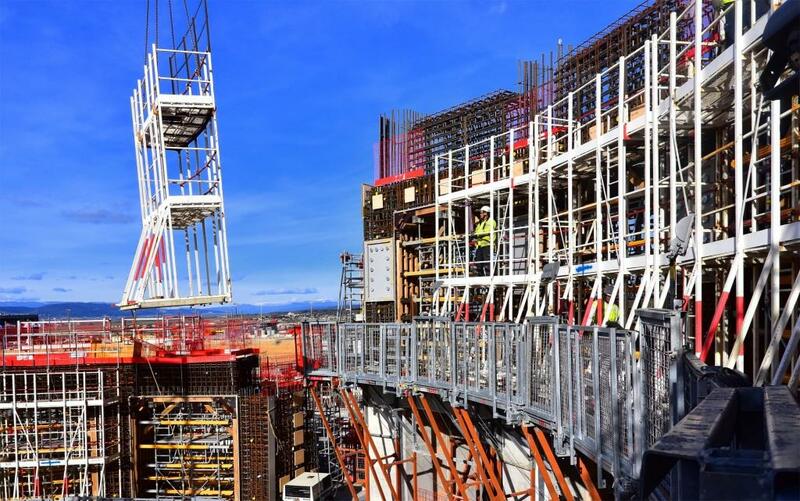 One of the most strategic parts of ITER construction, the crown and radial walls necessitate the densest, thickest and most intricate rebar arrangements of the entire installation. 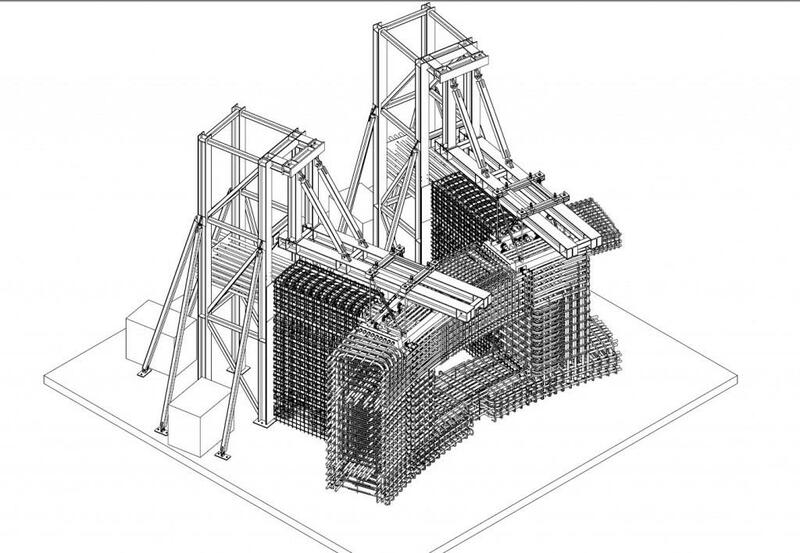 This machine support structure should be finalized by the end of the summer. 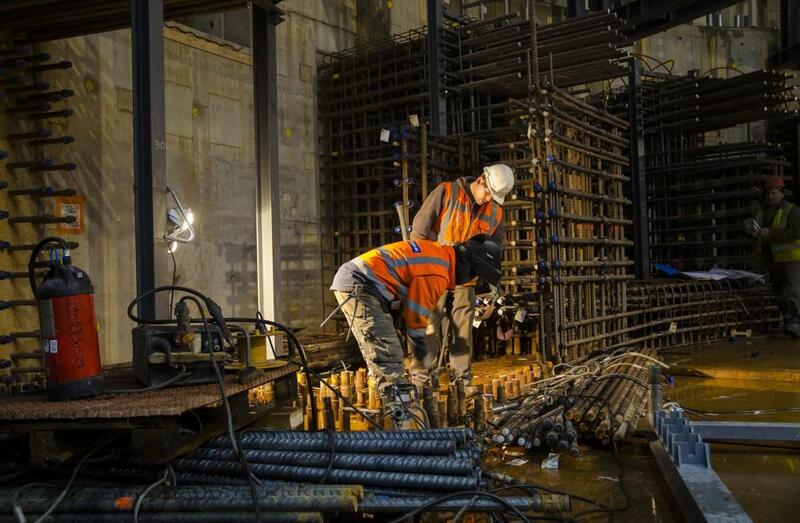 Workers are busy installing the steel reinforcement for each radial wall: thick rebar (up to 50 millimetres in diameter) arranged in a complex geometry, and massive steel transition pieces (3 tonnes each) that will transfer and distribute the loads to the concrete civil work. 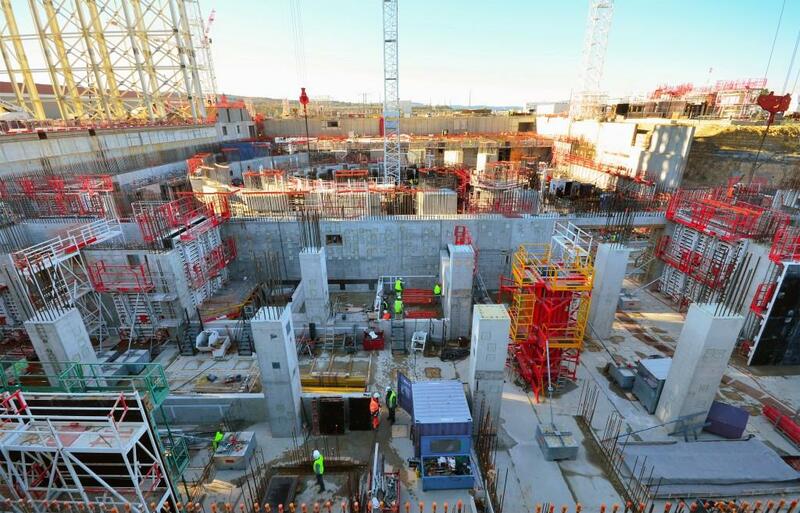 At the close of 2017, the last levels of the bioshield (L3 and L4) have been framed out and concrete pouring is underway. 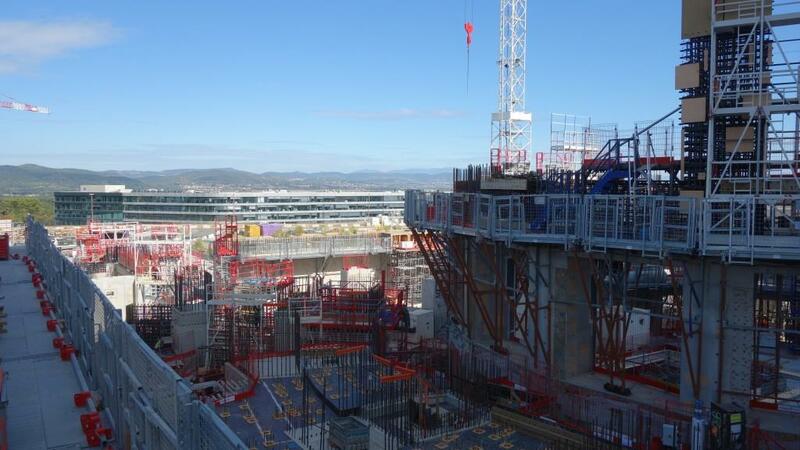 Work is also proceeding at level 3 (L3) of the Diagnostics Building (foreground). 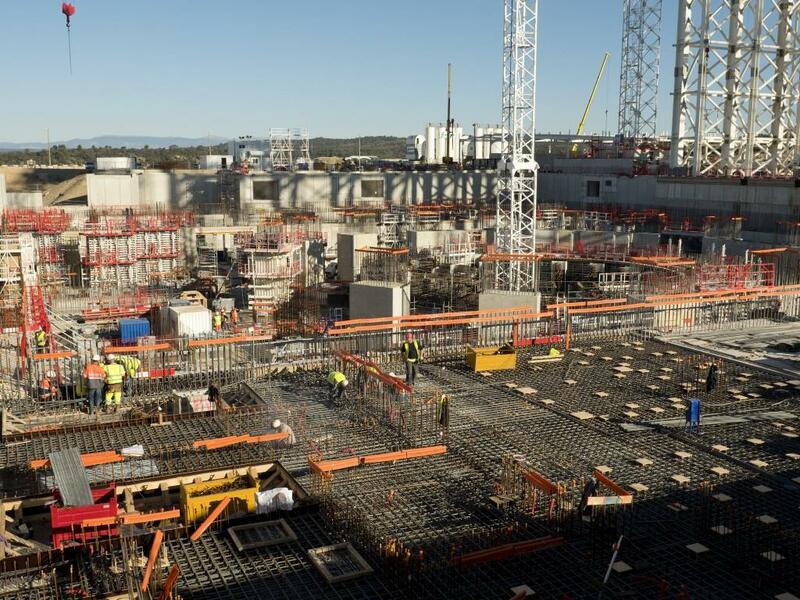 Work underway on the Tritium Building in November. 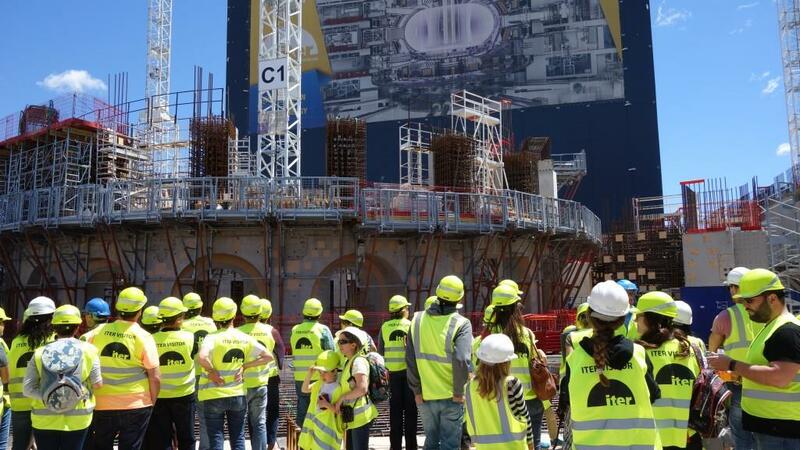 During the ITER Open Doors Day on 21 October visitors were invited to walk out into the centre of the bioshield, where European Domestic Agency contractors were on hand to give explanations. 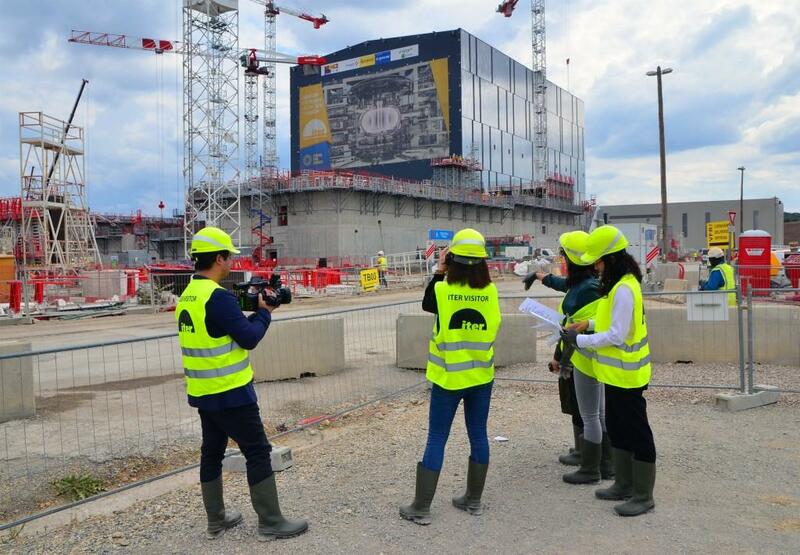 As part of explanations, visitors were shown the different elements used in Tokamak Complex construction ... including some of the thickest rebar on the market. 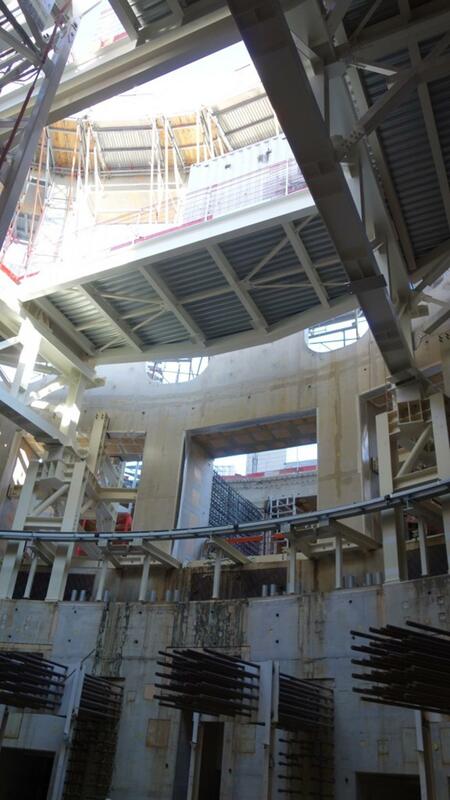 Visitors entered the bioshield through an opening that will accommodate one of the neutral beam injectors, used to heat the plasma. 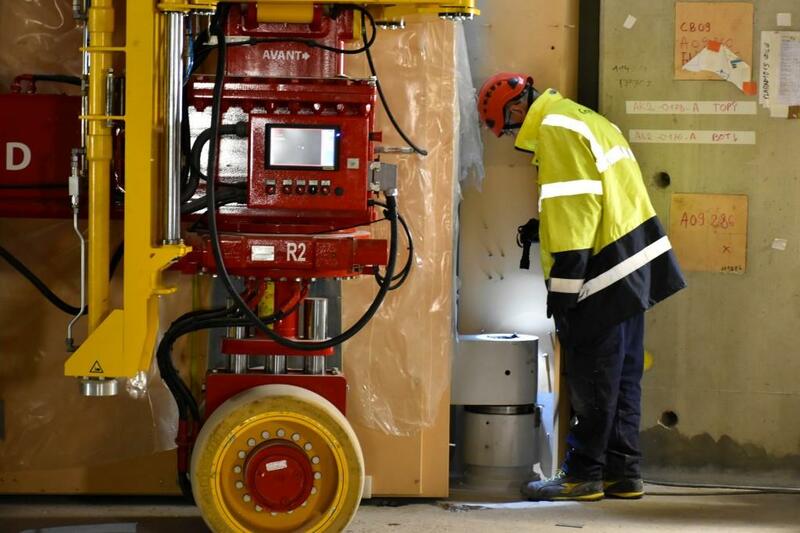 Each one of the embedded plates in the basement of the Diagnostics Building has been placed with care and its final position measured through laser techniques. 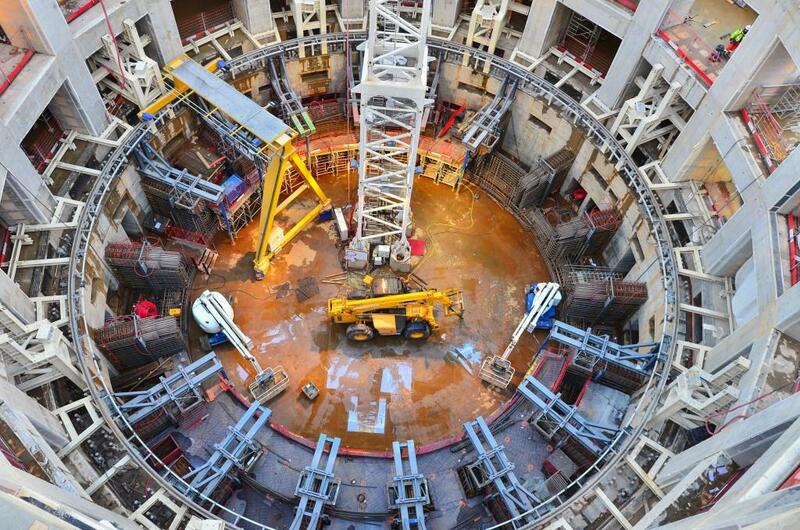 Position will be important when it comes to attaching the systems and components planned for this level. 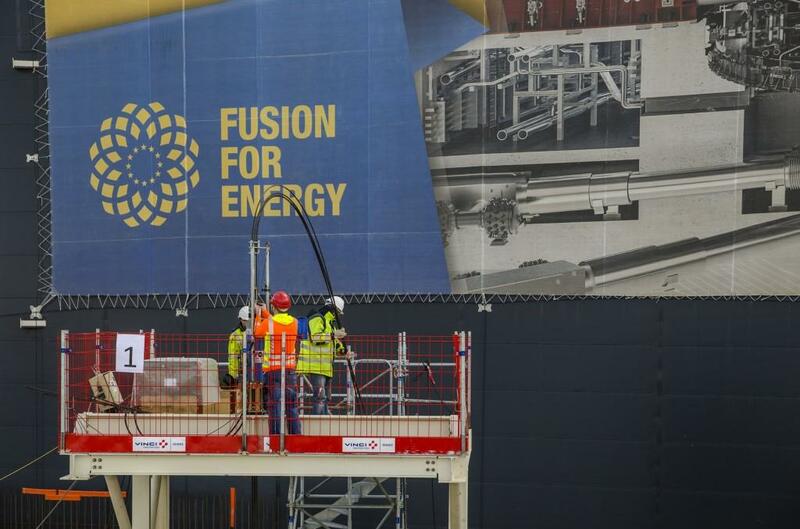 A reminder, in yellow, of what everyone on site is working for: FUSION! 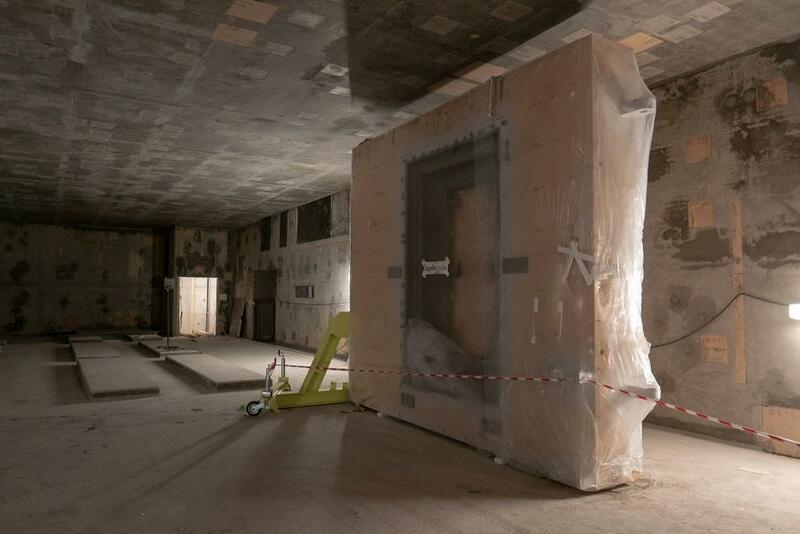 Most openings in the bioshield are perfect squares (4 m x 4 m). 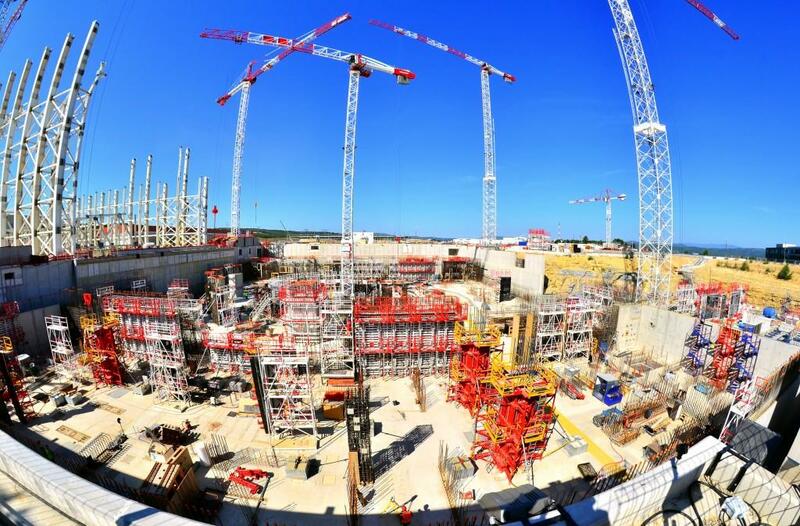 This one and three others, however, stand out due to their peculiar oval or round shapes—a distinctive sign that signals them out as the openings for the ITER neutral beam injectors. 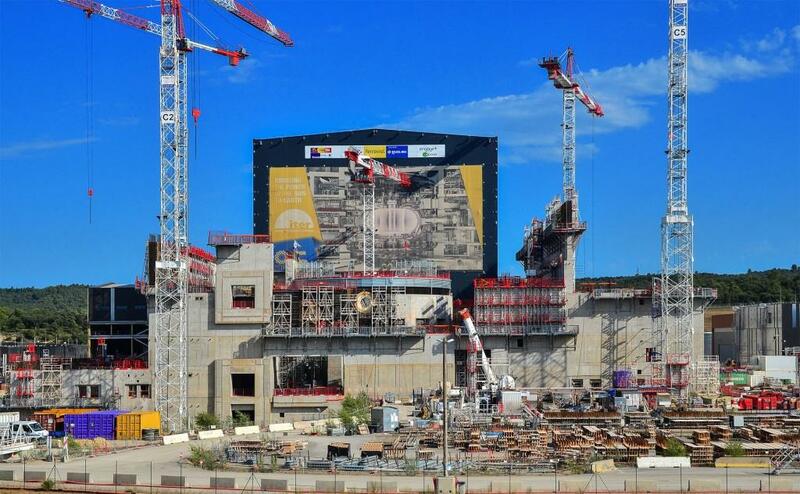 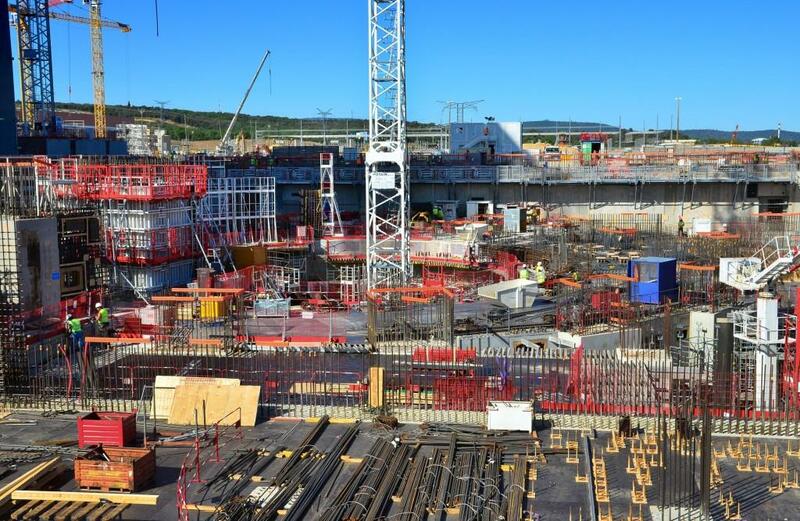 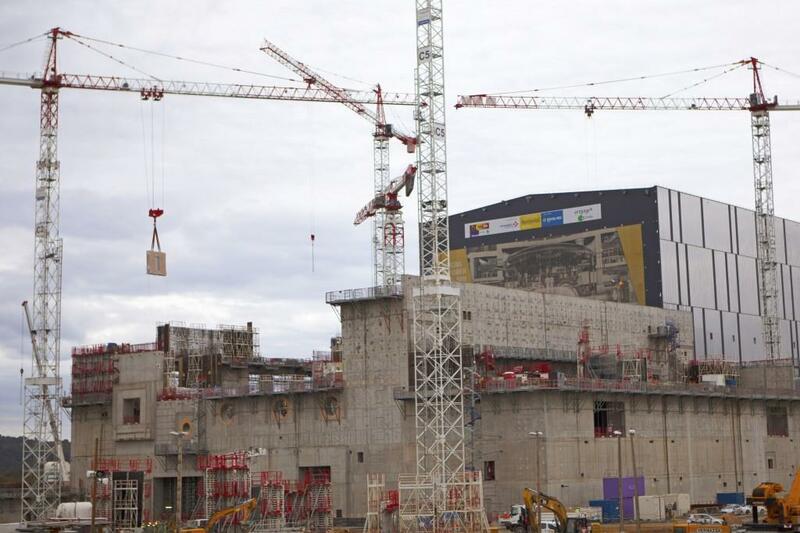 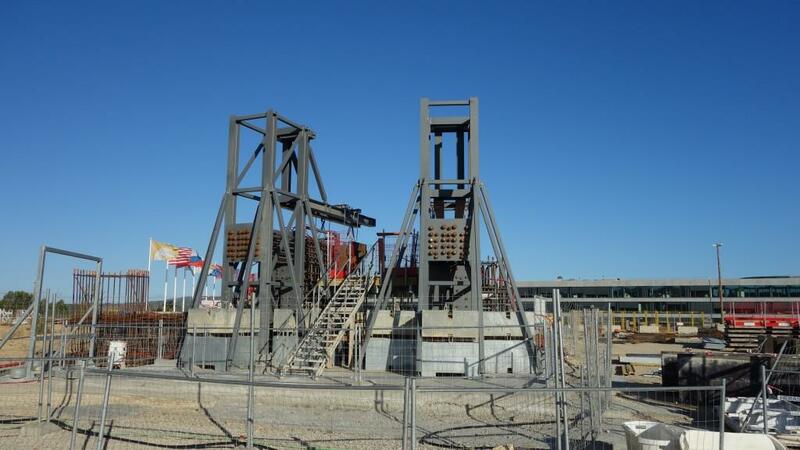 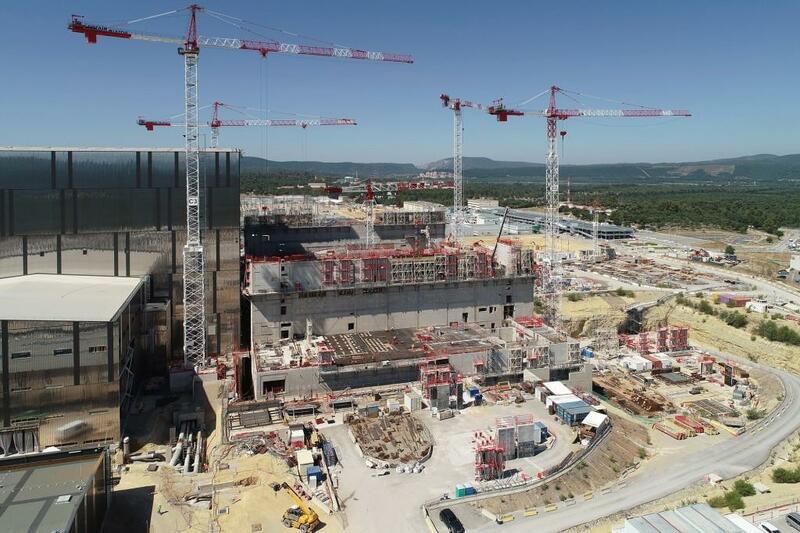 Concrete pouring is about to begin on the third above-ground level of the ITER bioshield (L3). Eighteen massive columns will provide structural support to the different levels of the Tokamak Complex; six among them will have the additional role of supporting the assembly crane rails. 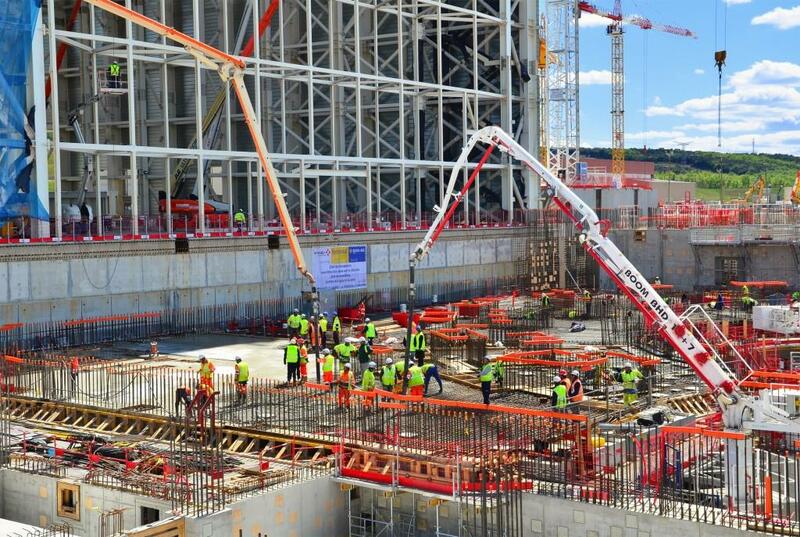 At the L2 level of the Tokamak Building, concrete is being poured into one of these "mega columns." 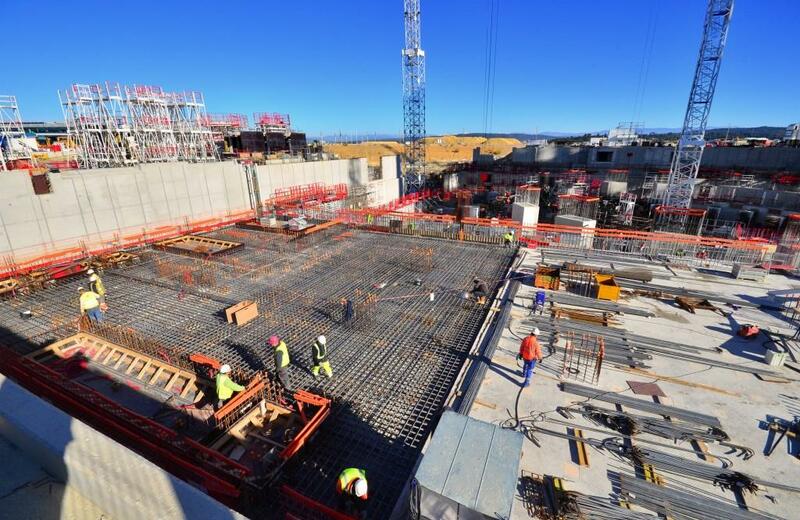 The ITER platform in early October, with work advancing on the Tokamak Complex, the twin Magnet Power Conversion buildings, and the cryoplant (counter clockwise). 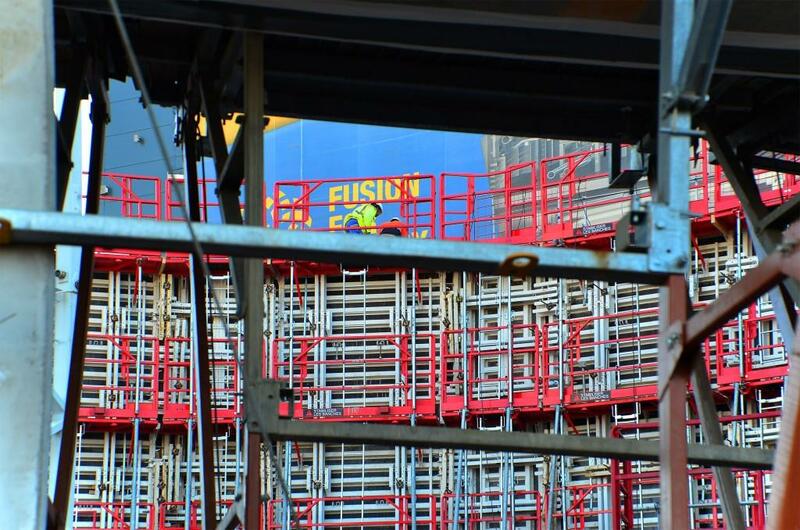 The Diagnostics Building (in grey) now stands two stories above platform level. 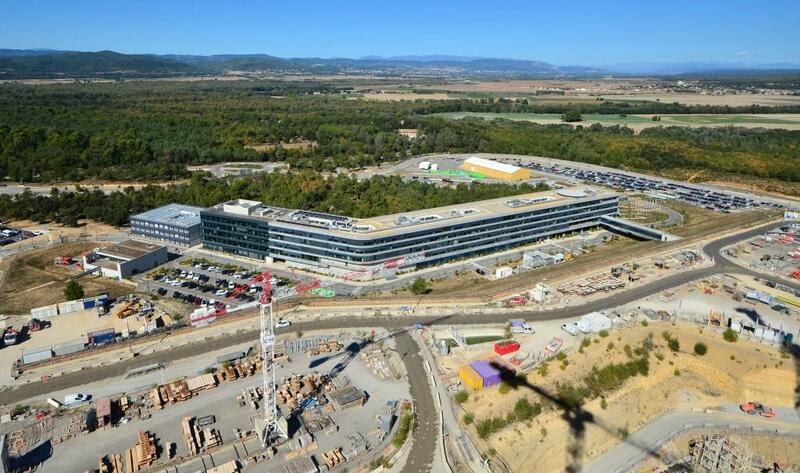 One more to go and the building is completed. 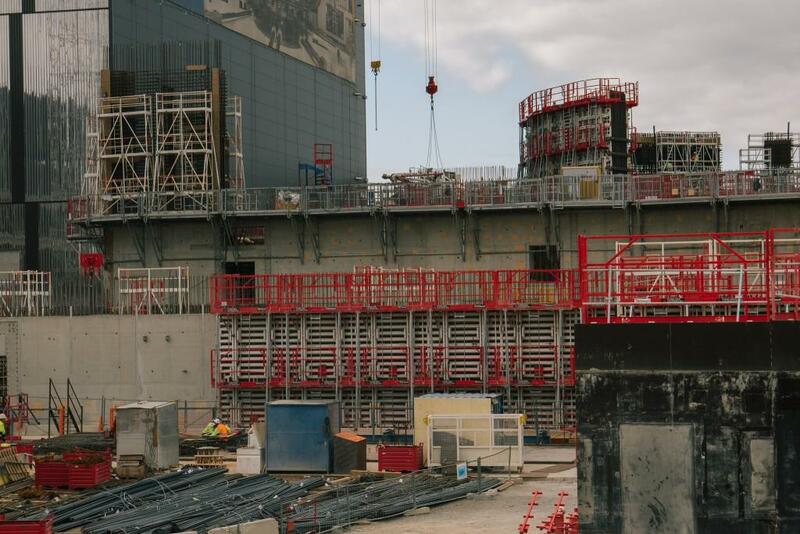 Between the Tokamak Building (under construction in the background) and the Hot Cell (excavated but not yet built) there will be a robotic system ensuring the remote transfer of in-vessel components between the vacuum vessel and refurbishment/disposal facilities. 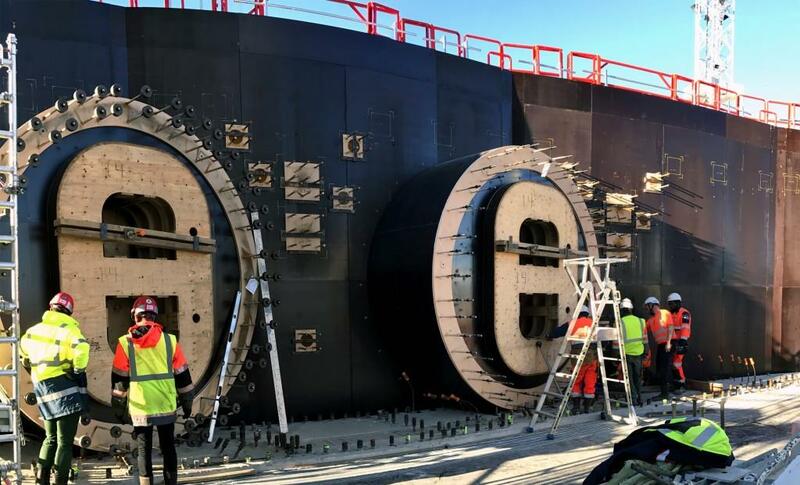 The three large openings in this photo are for bus-size casks that will be capable of servicing vacuum vessel ports on three levels. 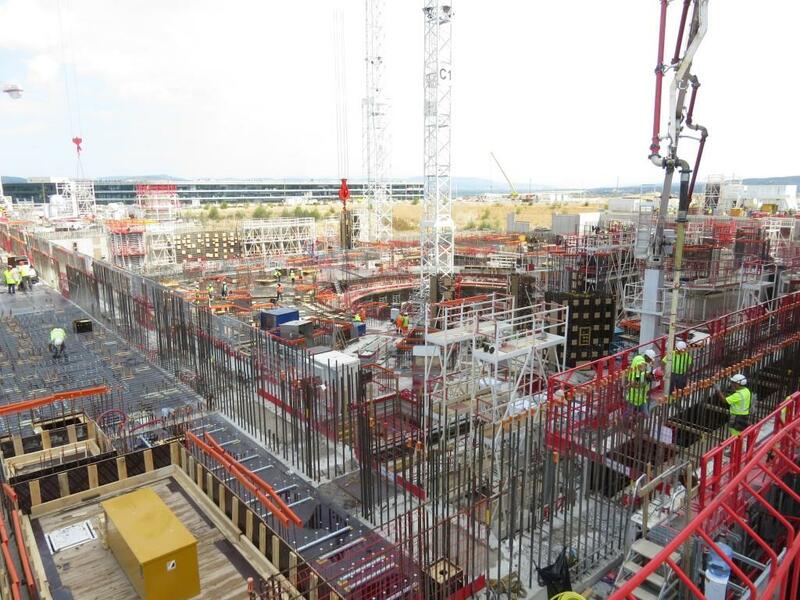 Teams are currently working at L3 level, installing the iron rebar and positioning the embedded plates before the walls get poured. 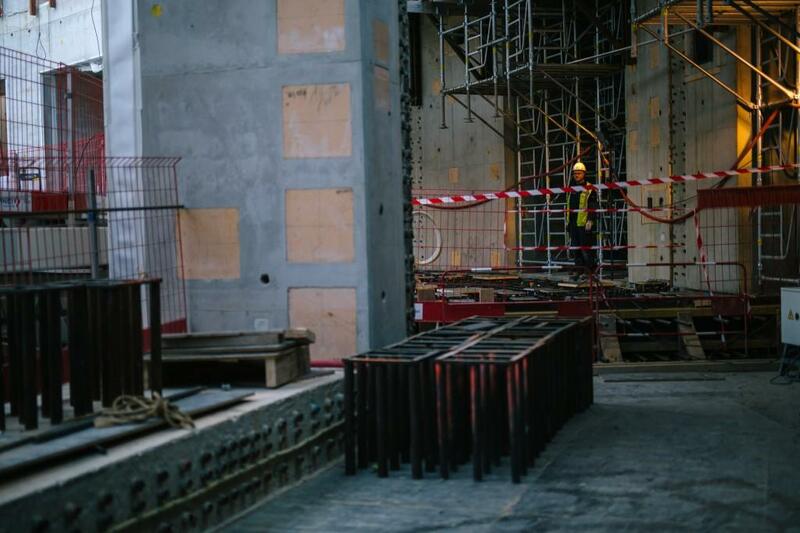 A peek into the basement levels of the bioshield, where work is scheduled to start this autumn on the heavily reinforced concrete crown that will support the weight of the machine. 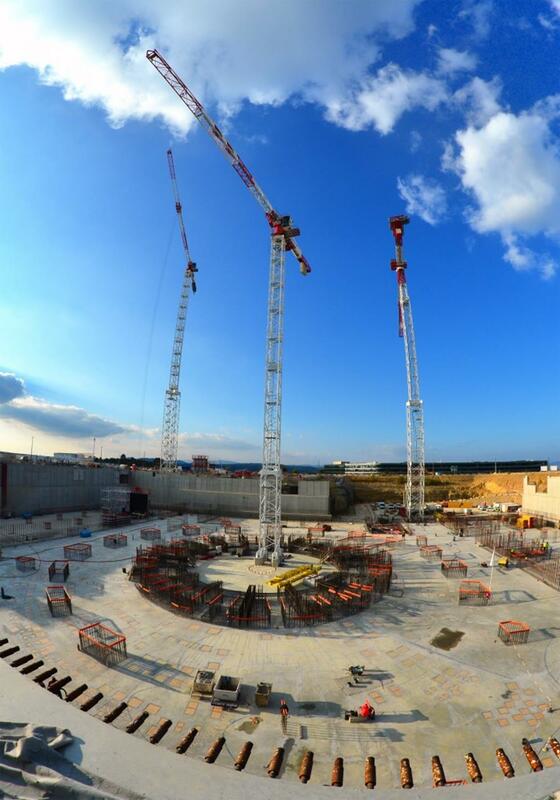 A 1:1 mockup is under construction on the ITER site that represents a 20-degree section of the cryostat crown and two radial walls. 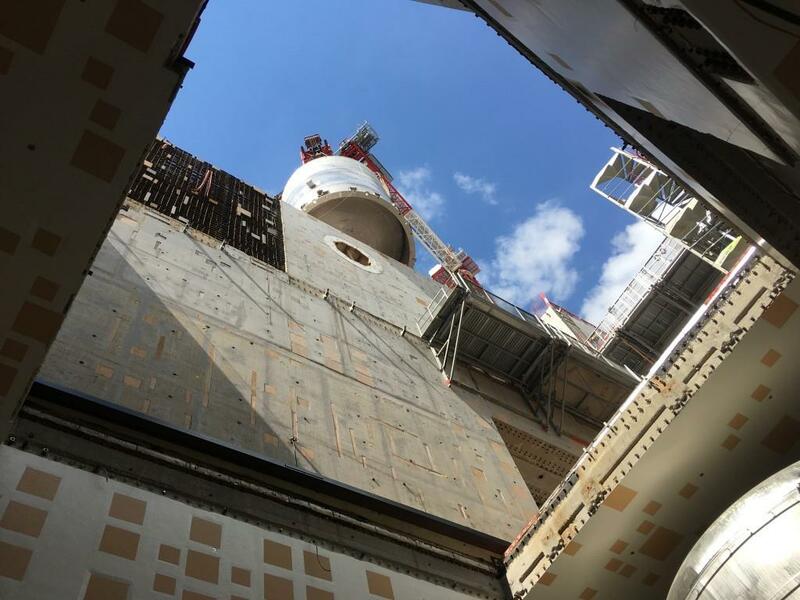 The concrete crown will support the weight of the full ITER machine—vacuum vessel, cryostat, thermal shield and superconducting magnets (23,000 tonnes). 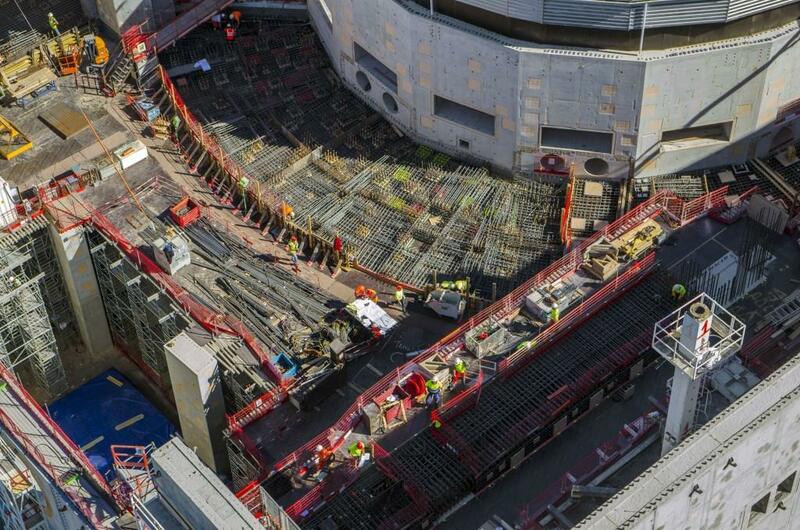 View from above: the ''lid'' is now in place. 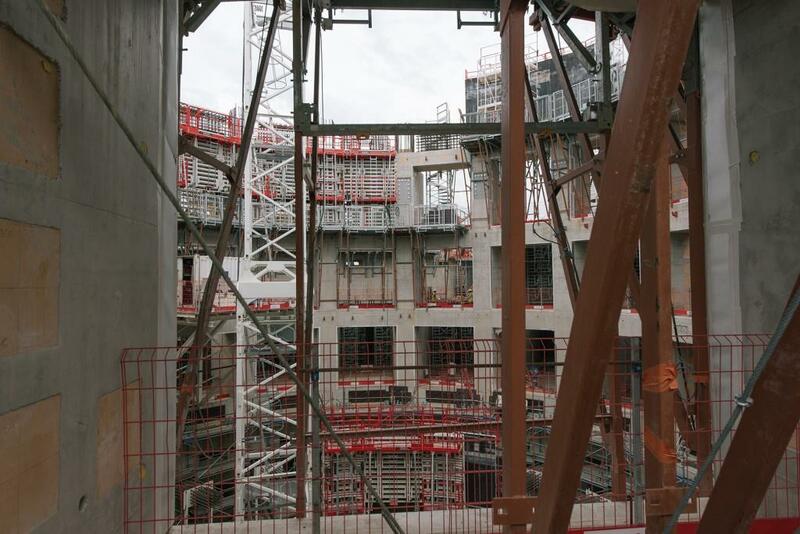 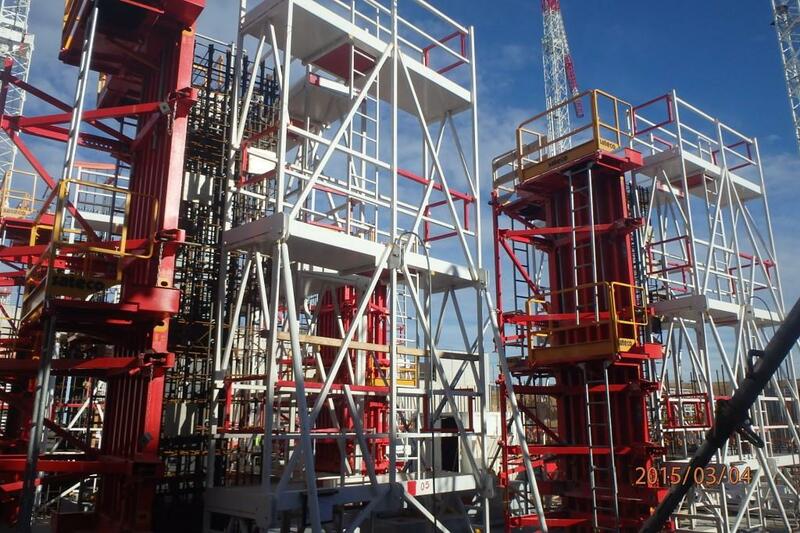 Two openings will allow material and equipment for the crown's construction to be delivered to the ground floor. 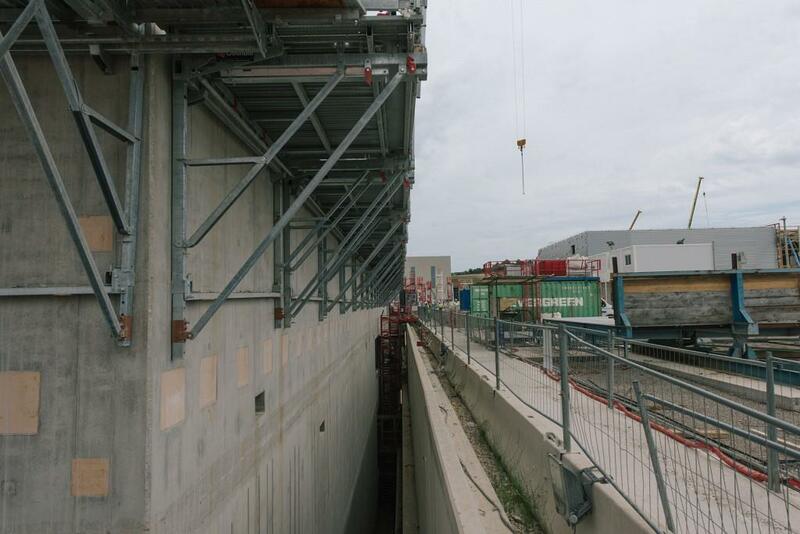 View from below: the steel structure will protect workers on the the lower-level of the machine ''well'' and will also be used as a storage platform. 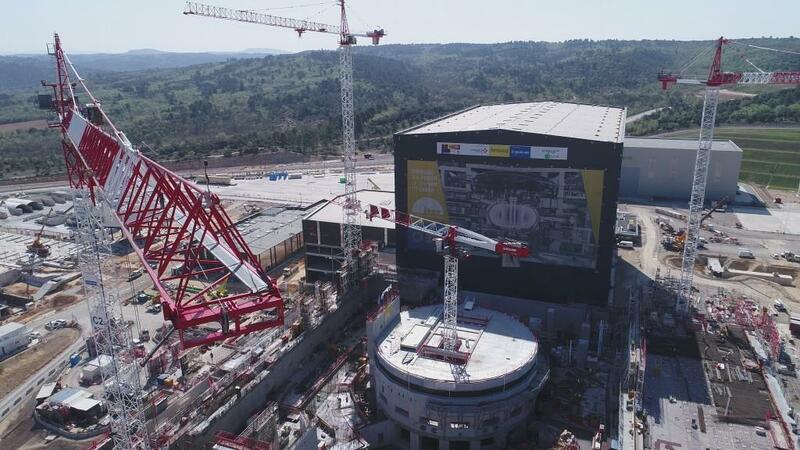 In order to demonstrate the full constructability of the massive crown structure that will support the machine, a 1:1 mockup is being erected on the ITER platform. 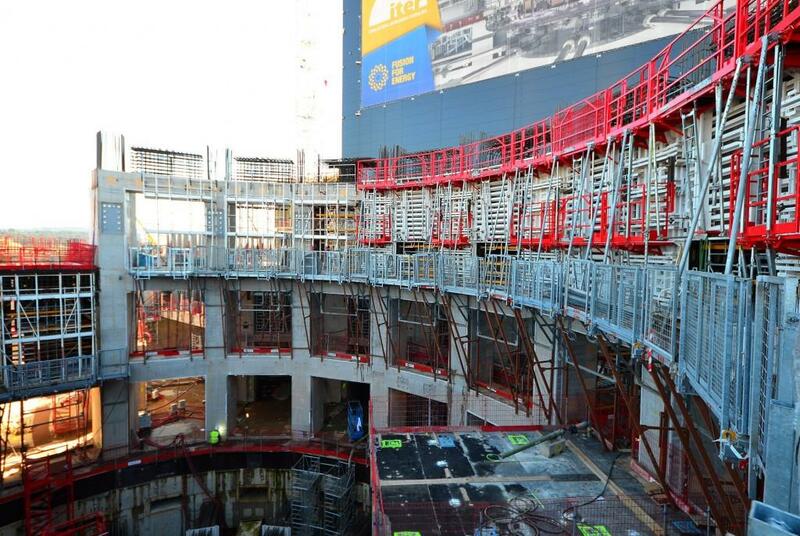 Work underway on level 3 (L3) of the bioshield. 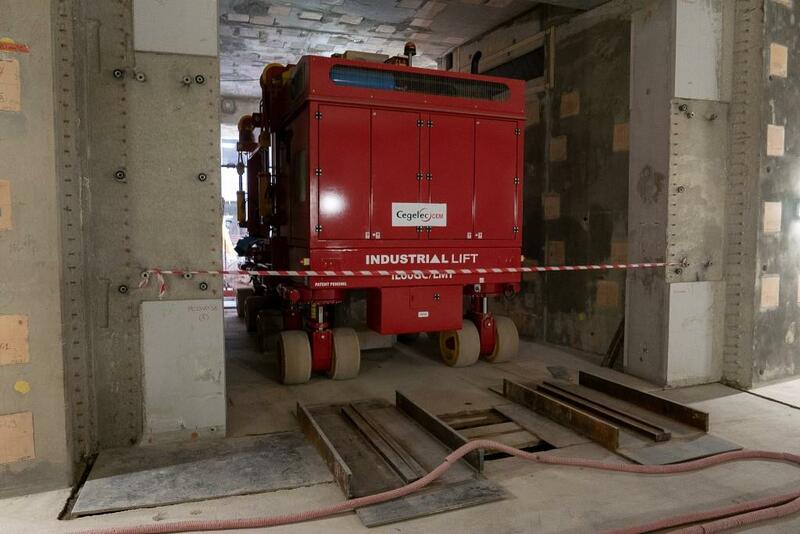 A small crane has been installed for the manipulation of building material under the temporary lid. 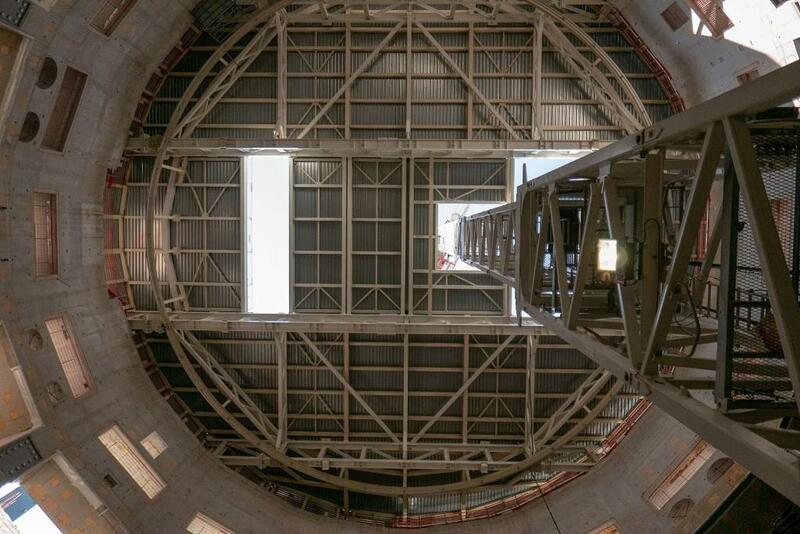 Lid installation, seen from below. 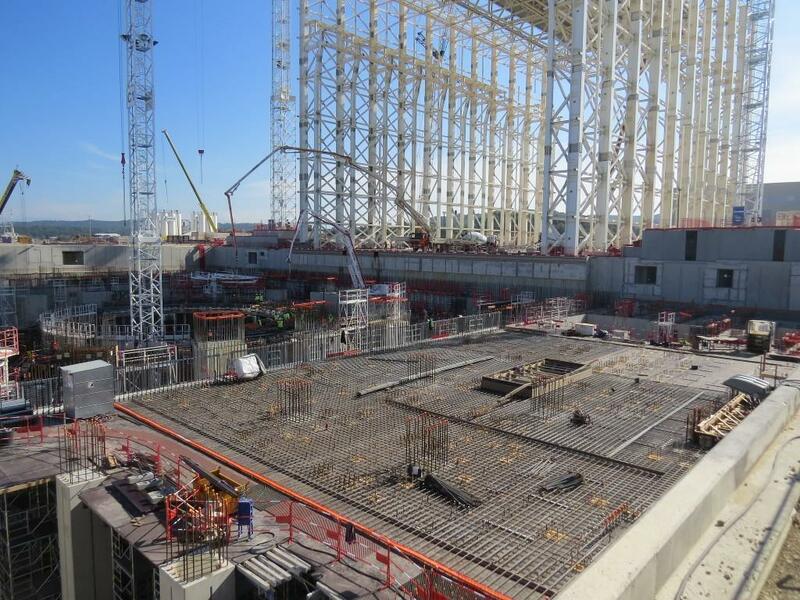 The first beams are installed at level B1 for the temporary lid. 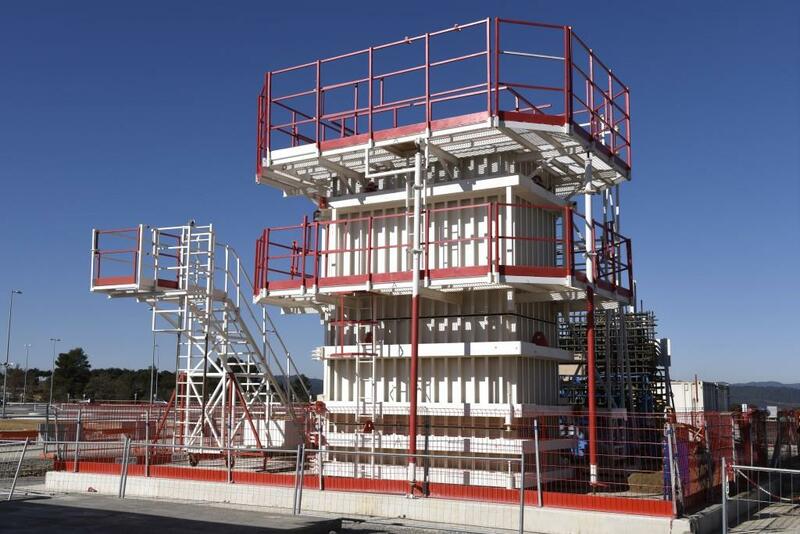 The lid is designed to be strong enough to act as a temporary storage platform for materials. 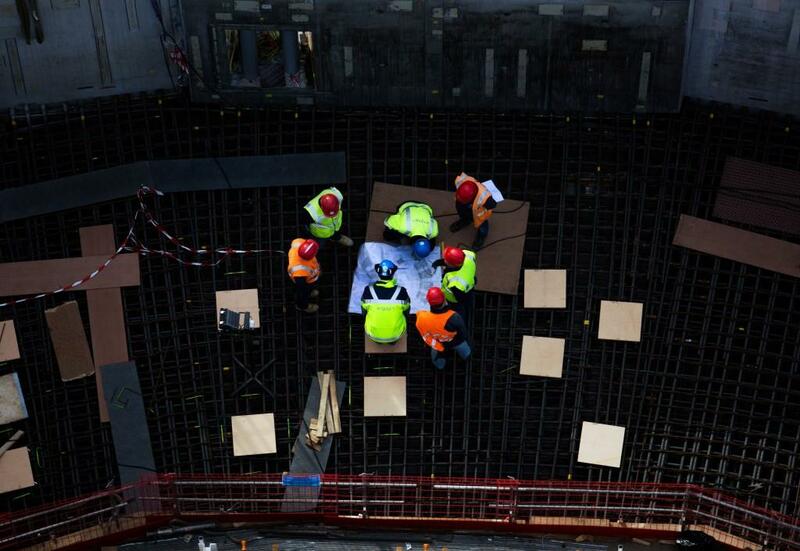 Work underway on the temporary lid, seen from above. 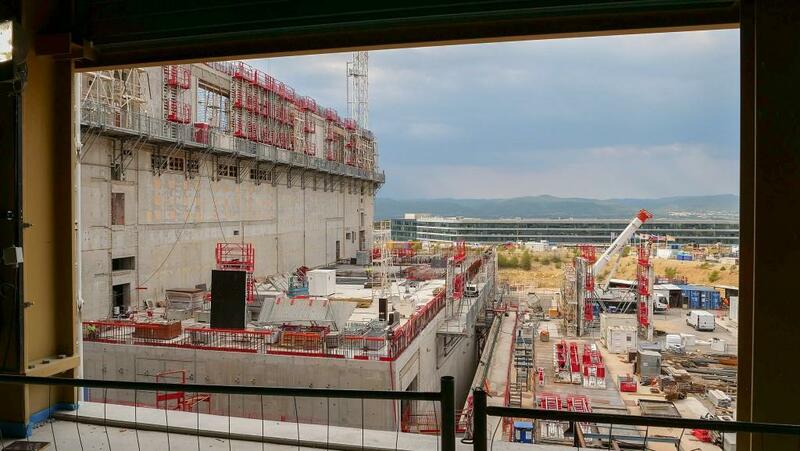 Taken from the first scaffolding elements at L4 level, this view takes in much of the south-southwest view, from the Magnet Power Conversion buildings under construction at left to ITER Headquarters at right. 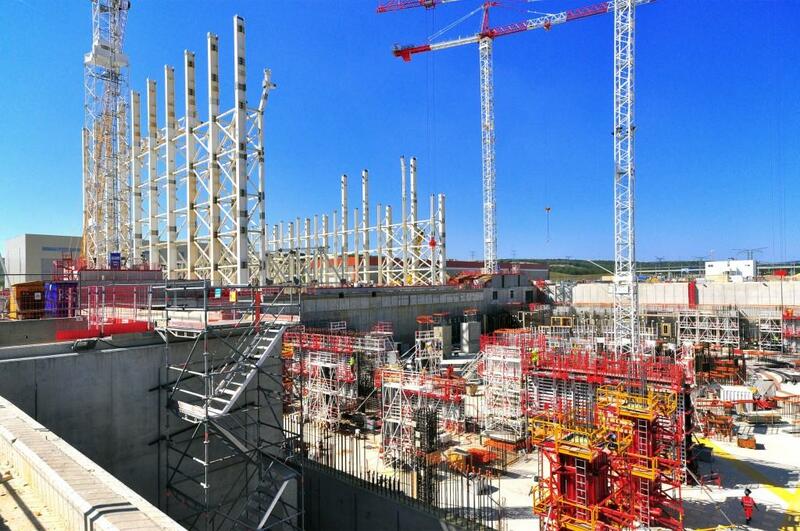 An incredible level of detail is discernible in this picture of the first four levels of the ITER bioshield. 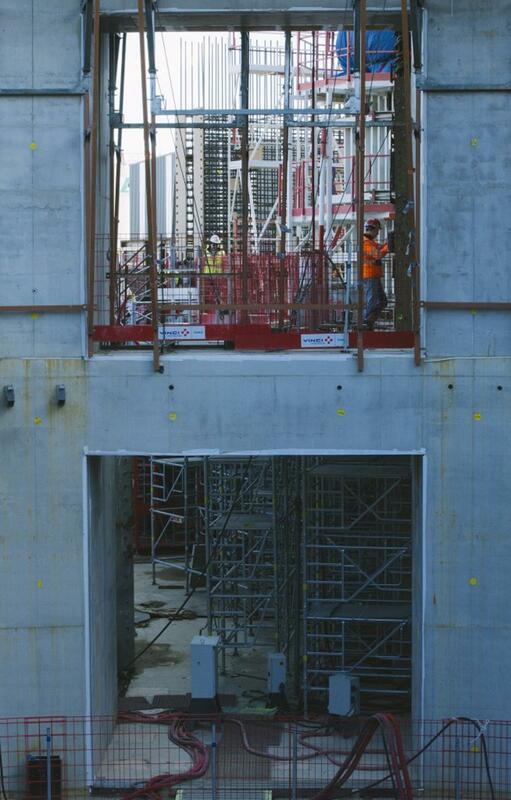 Soon, though, the basement levels will be hidden from view by a steel cap installed mid-way down. 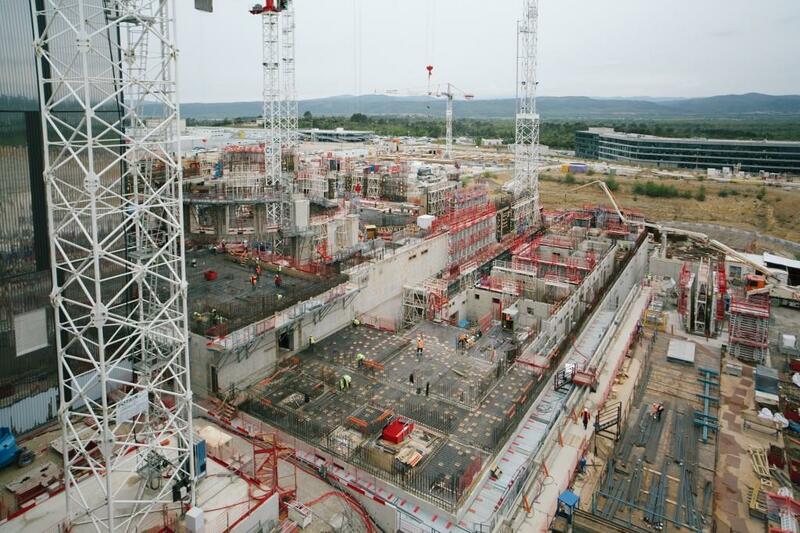 White beams are being set into place at the level of the L1 basemat. 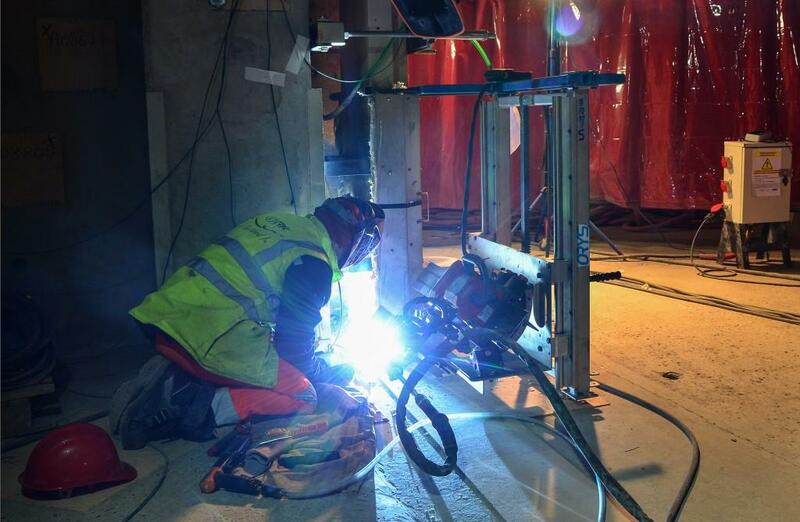 Once these beams have been installed all the way across, a steel "cap" will be installed. 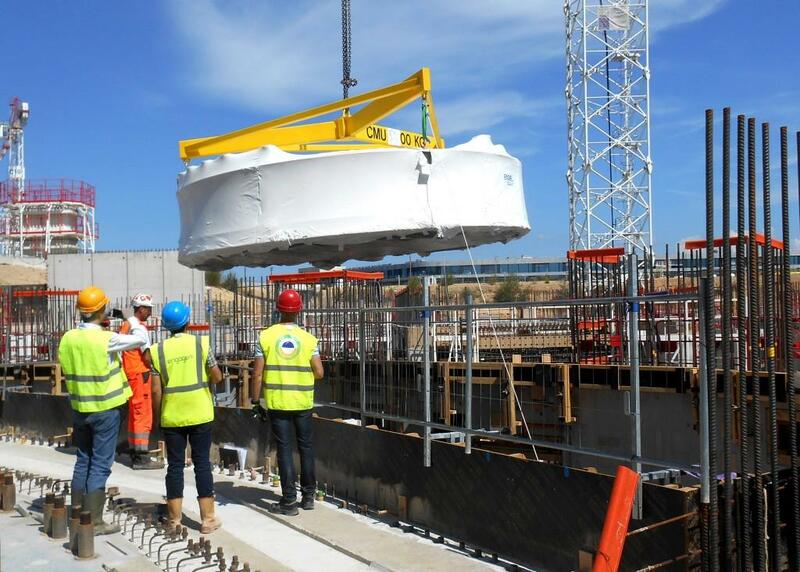 The cap will protect workers below and serve as a storage platform above. 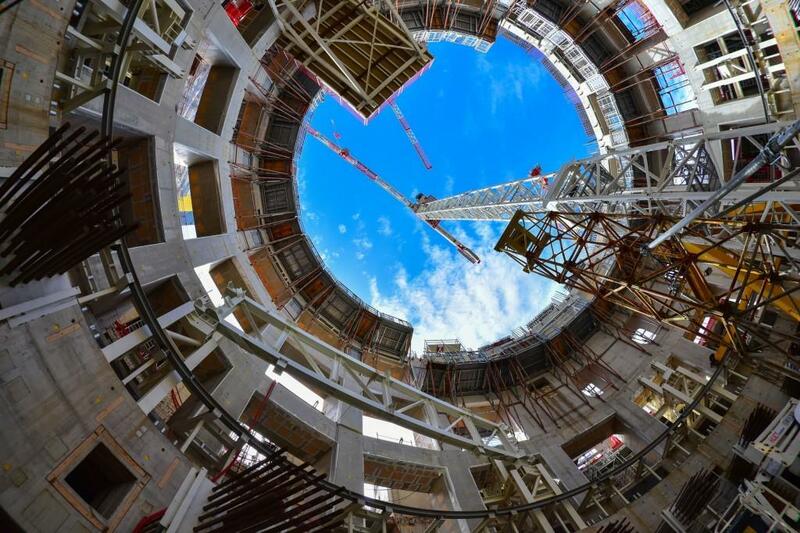 Looking up through the ITER bioshield in early August. 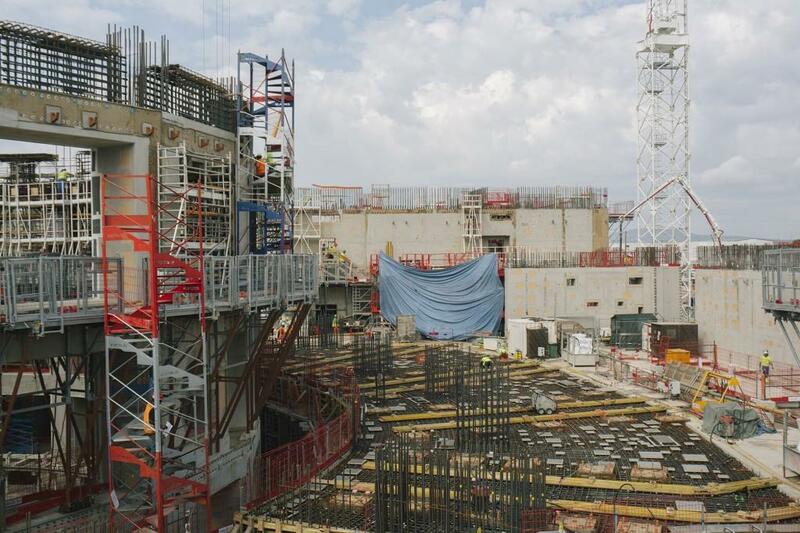 Teams are currently working on the L3 (or second-to-last) level. 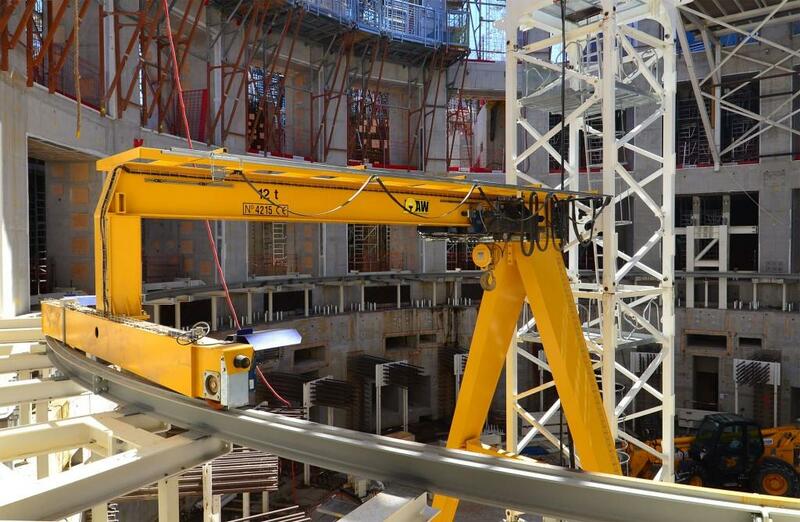 This crane has been specially designed to travel in a perfect circle at the bottom of the machine assembly well (B2 level). 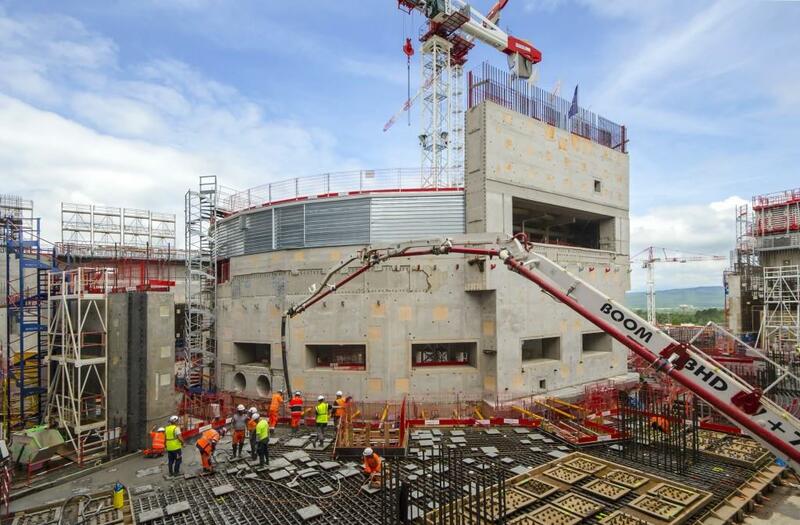 Its mission: to lift and deliver the loads for the construction of the concrete crown that will support the combined mass of the cryostat and Tokamak (23,000 tonnes). 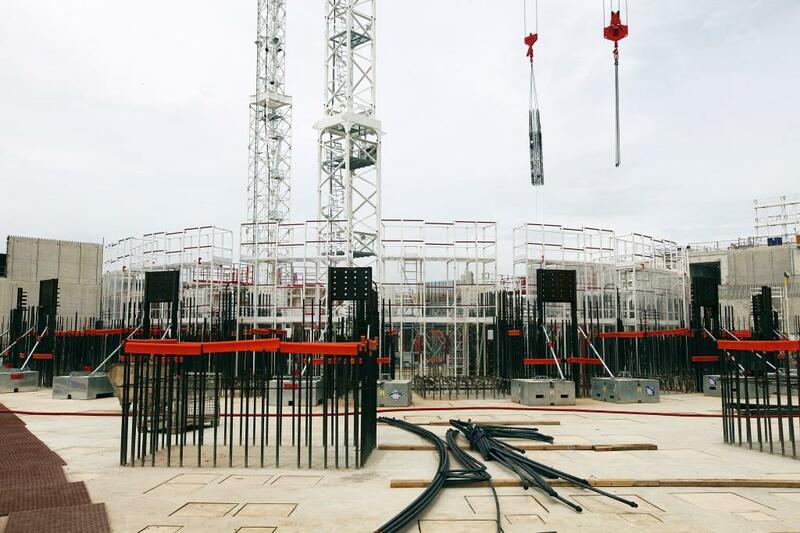 Two columns of rebar have been implemented at the L3 level and pouring is set to start on plot 13. 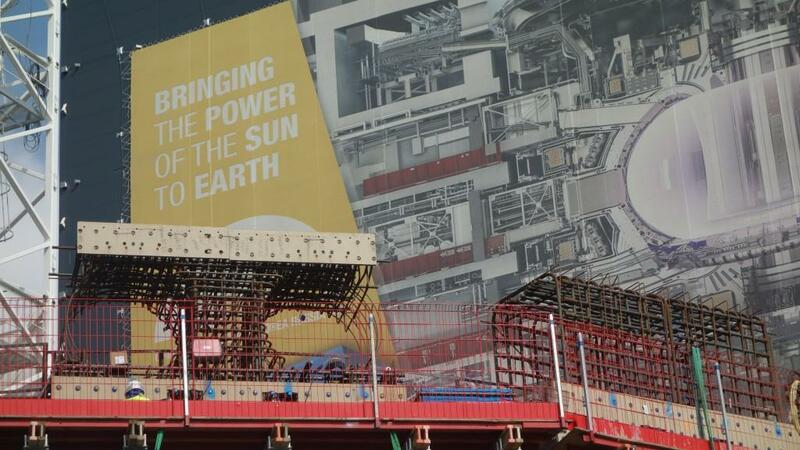 The early morning sun shines through one of the penetrations of the ITER bioshield, symbolizing the "star" that will be born when deuterium-tritium operations begin in 2035. 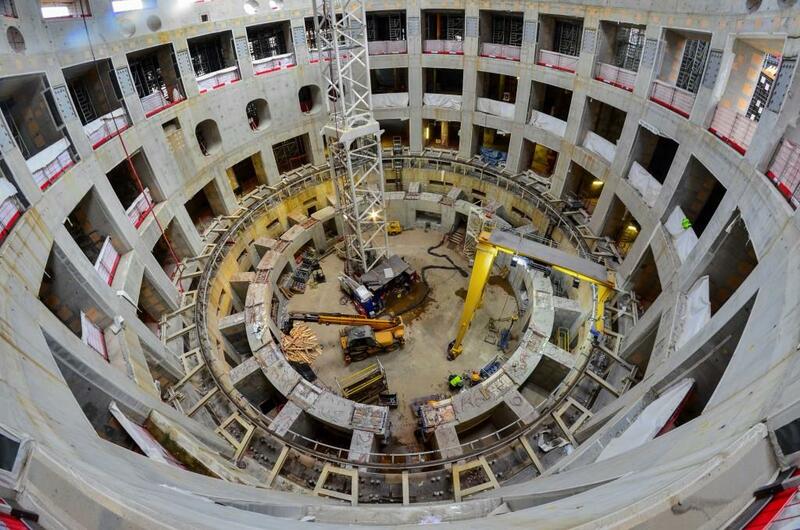 Of the 115,000 embedded plates to be installed in the floors, walls and ceilings in the Tokamak Complex, this set of five (in beige, including one large circular plate) is unique. 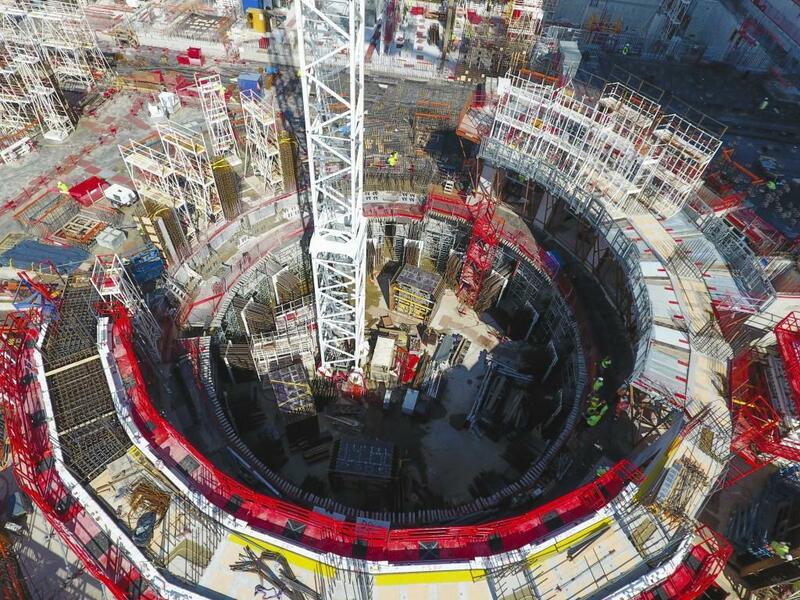 Located in the very centre of the machine assembly pit, with 48-millimetre-thick studs reaching more than one metre deep into the basemat slab, the set will anchor the main tool of Tokamak Pit assembly. 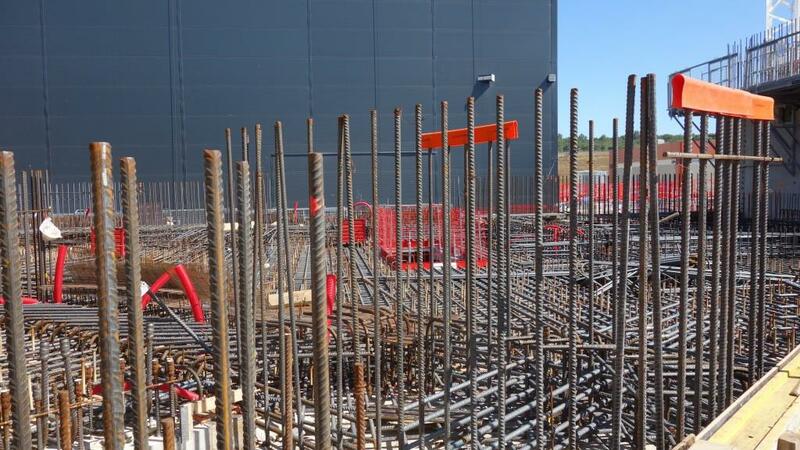 Rebar reinforcement is in place for the platform level slab (L1) of the Tokamak Building. 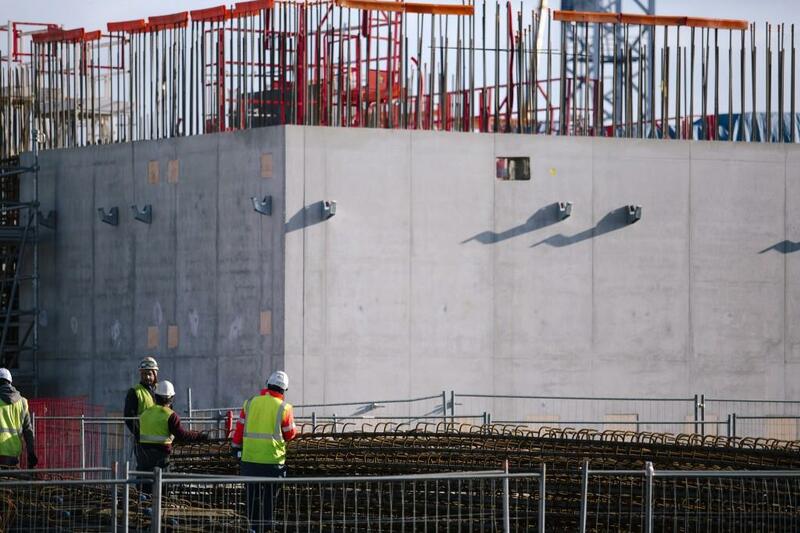 The second above-ground level of the bioshield is emerging from its formwork. 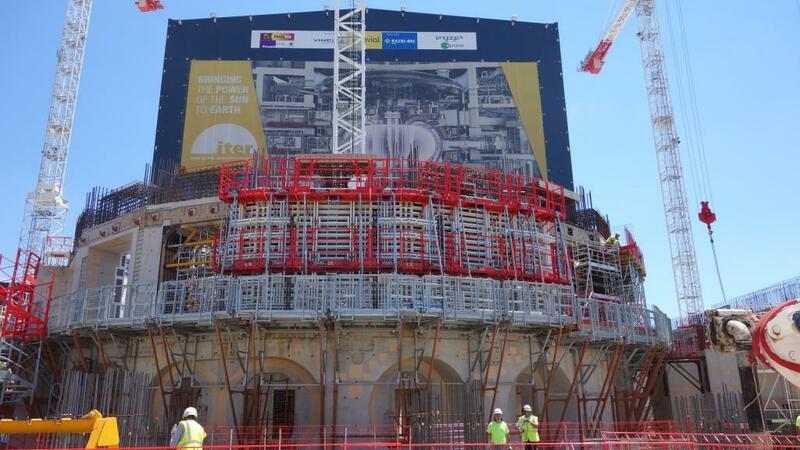 A large poster adorns the temporary wall of the Assembly Hall. 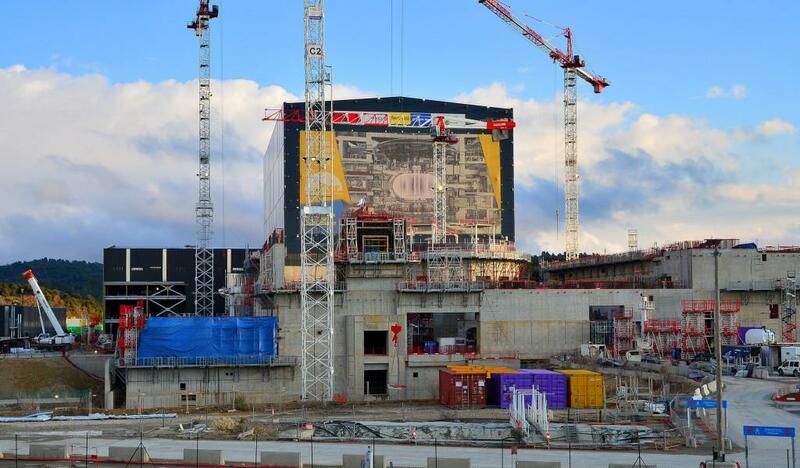 Against this spectacular backdrop, workers are advancing the L3 level of the bioshield. 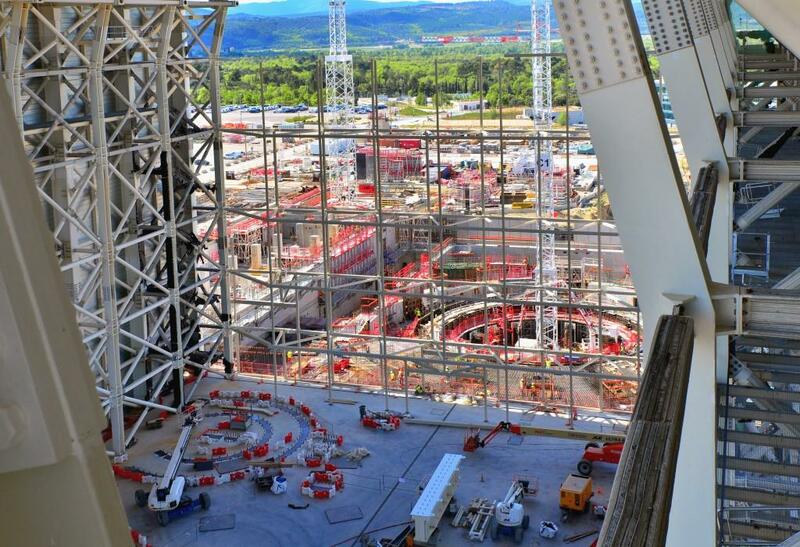 Close to five levels high (B2, B1, L1, L2 and L3 underway), the ITER bioshield forms the "pit" for Tokamak assembly activities. 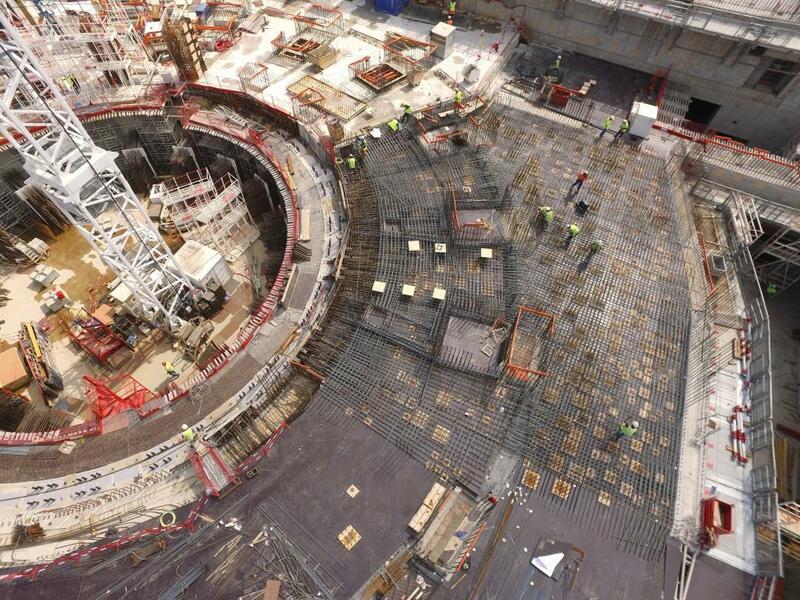 Workers are finalizing the installation of embedded plates on this part of the L1 Tokamak Building slab. 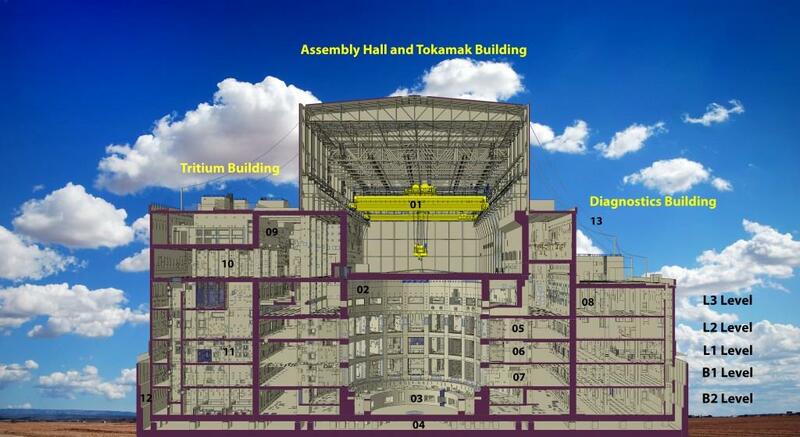 Note the gap that exists for the moment between the L1 floor and the bioshield (at left). 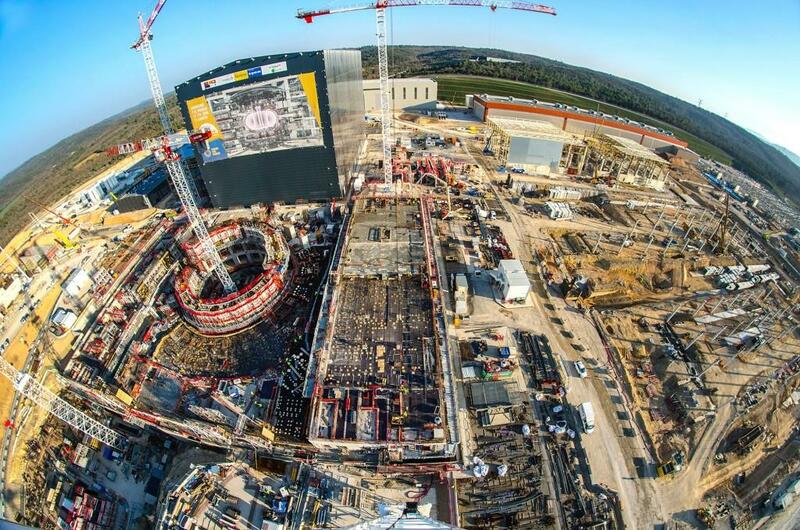 An estimated 110,000 steel plates will be embedded in the Tokamak Complex floors, walls and ceilings to anchor equipment. 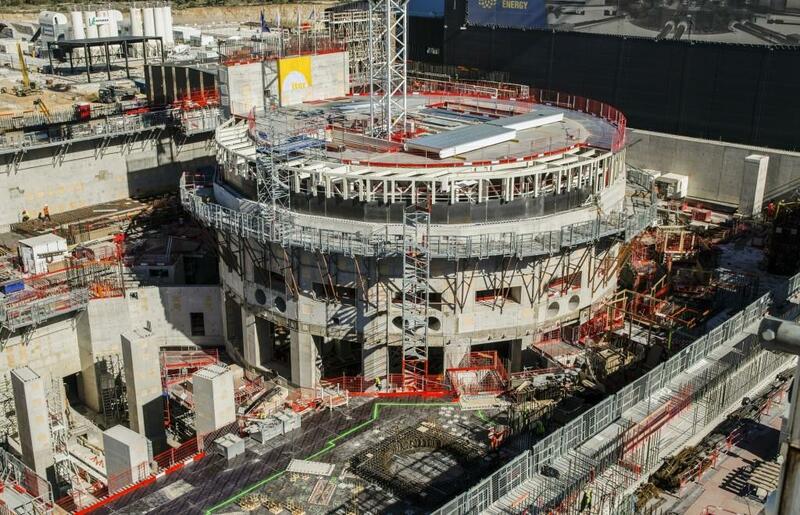 Looking more and more like a coliseum, the ITER bioshield rises from the centre of the Tokamak Building. 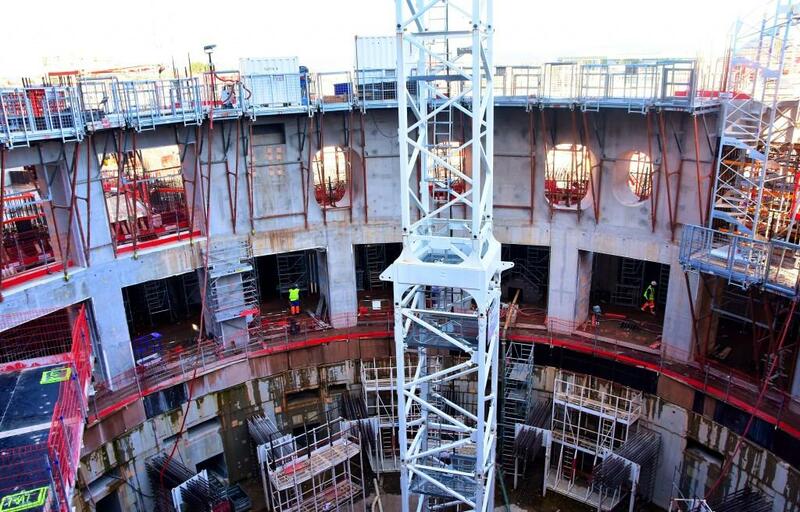 The circle of concrete is closing in at L2 level and work is already underway on the next. 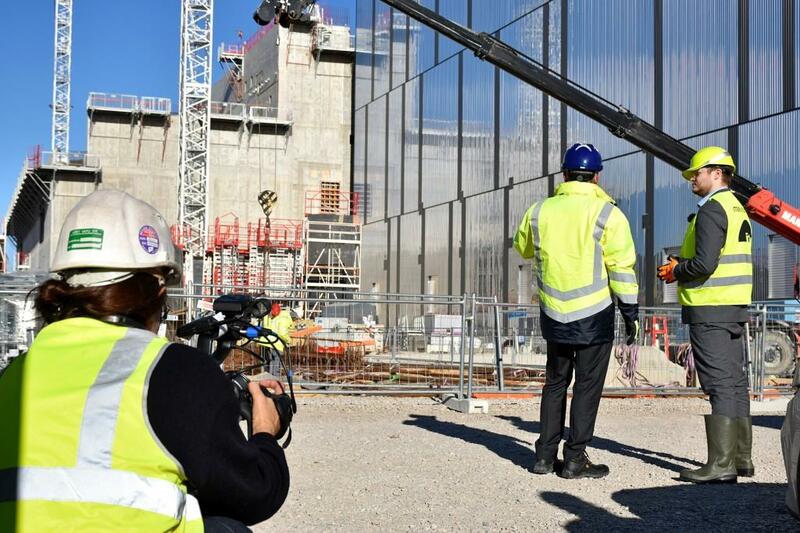 The ITER bioshield wall is 3.2 metres at its thickest. 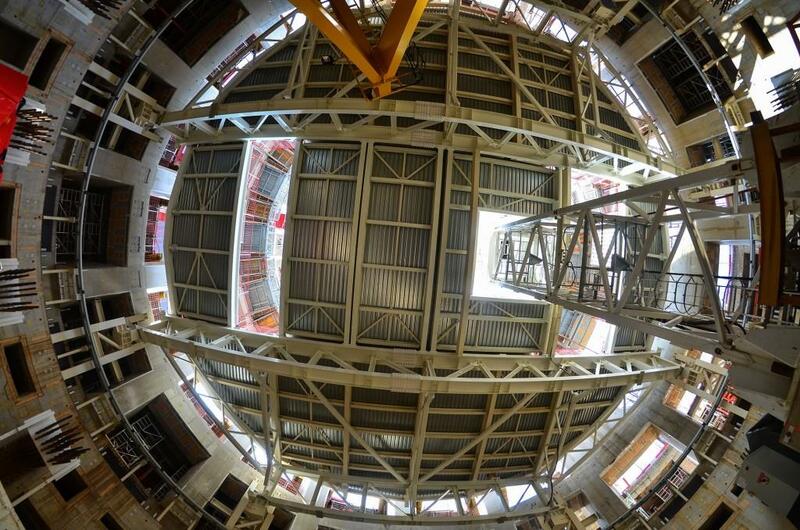 Inside of the Tokamak Pit, looking up. 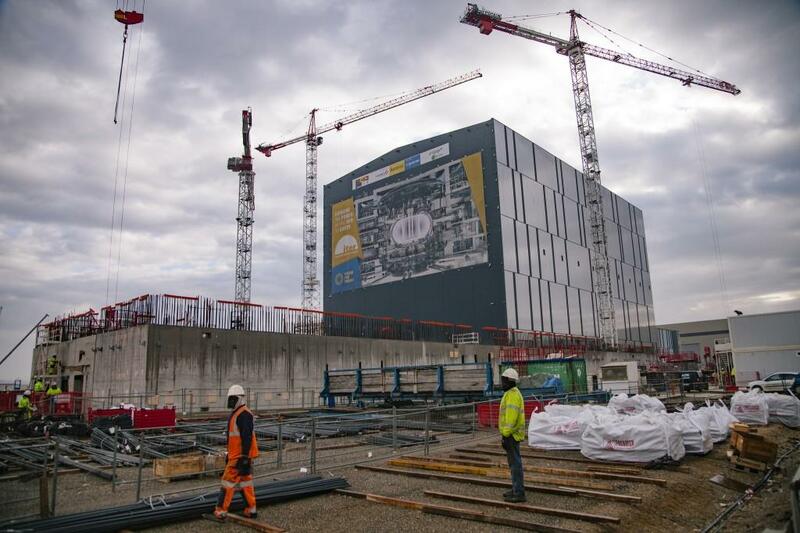 Unlike the lower levels, the top level of the bioshield (L4) will be an unbroken wall (with zero openings). 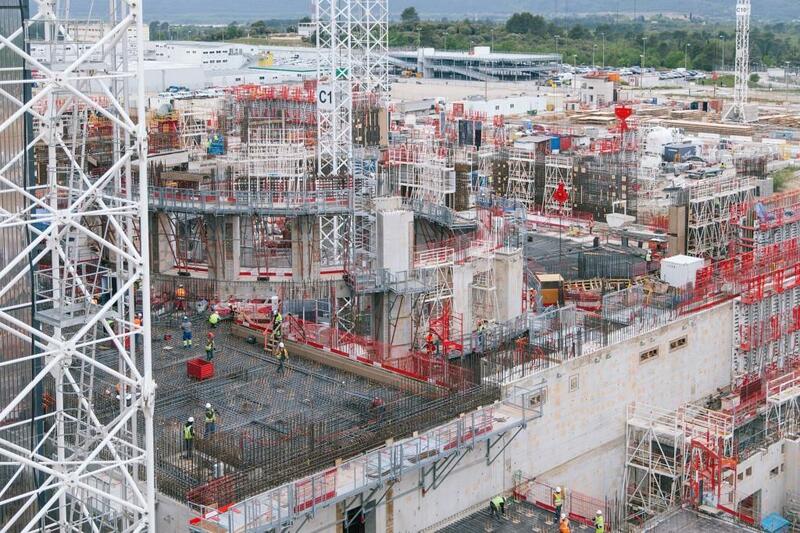 Construction of the Tritium Building (foreground) progresses at ground level. 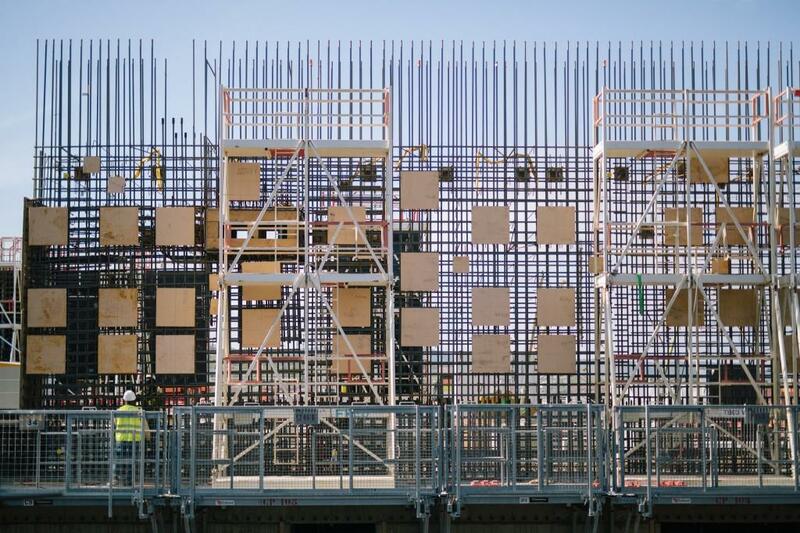 In the background, multiple levels of cladding are installed on the Radio Frequency Heating Building. 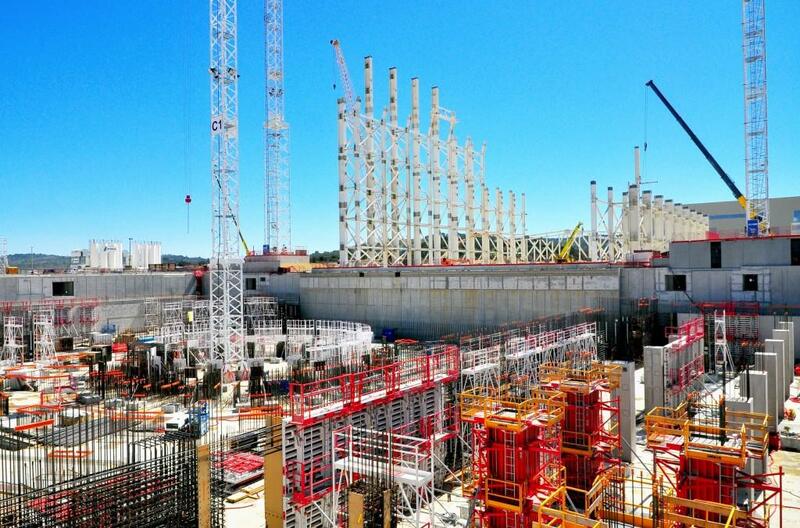 Scaffolding surrounds the ITER bioshield as workers advance on the L2 level (note the concrete pump at left). 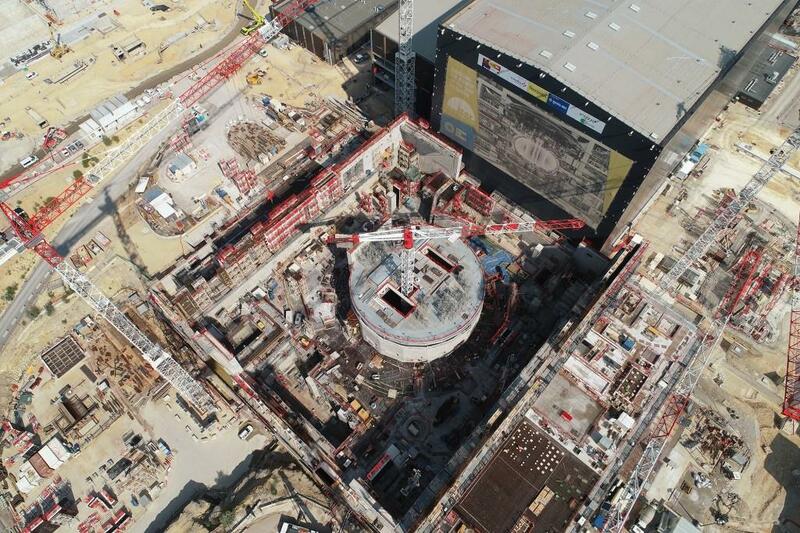 The Tokamak Complex worksite, seen from the C2 crane on the northern corner. 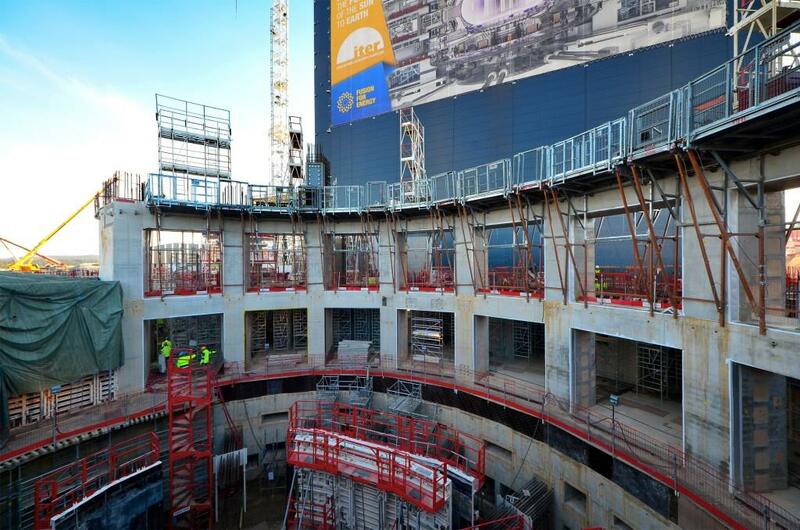 The basement levels of the Tokamak Complex are framed out; work is under way on the first ground floor (L1) of the Tokamak Building at centre and L2 of the Diagnostics Building at right. 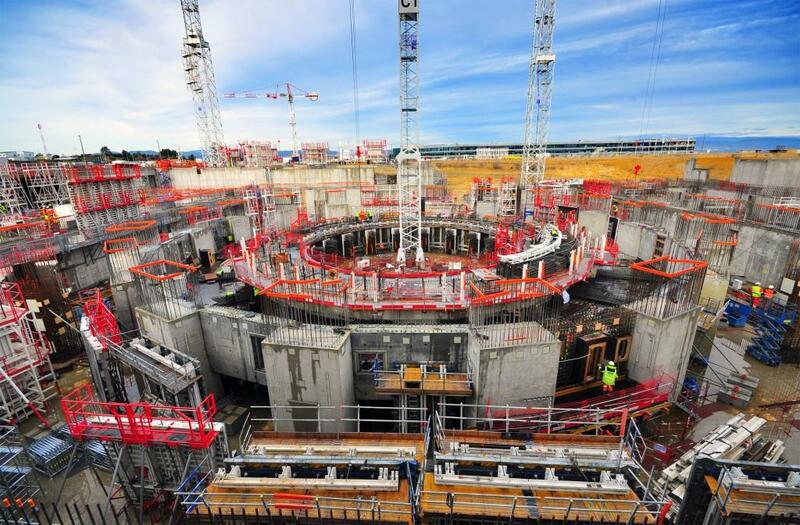 All around the Tokamak Complex a gap of approximately two metres allows the three-building complex on a single foundation to "move" on its seismic pads and absorb—in case of need—the accelerations linked to earthquake-induced ground motion. 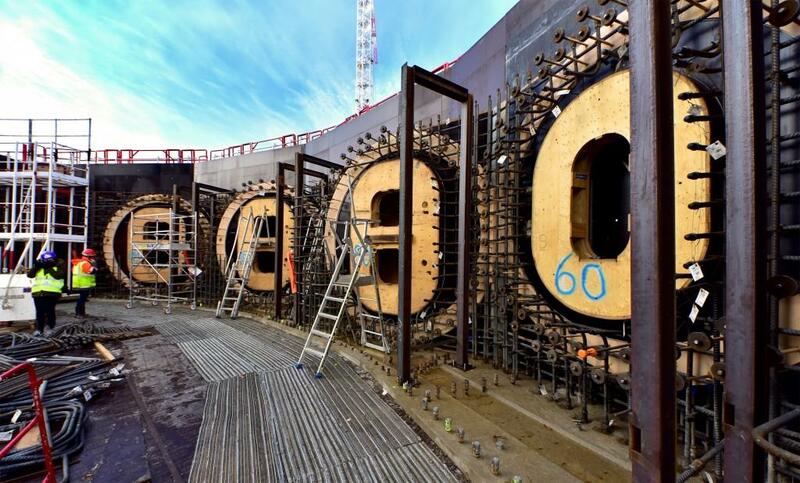 © Les Nouveaux Médias/SNC ENGAGE. 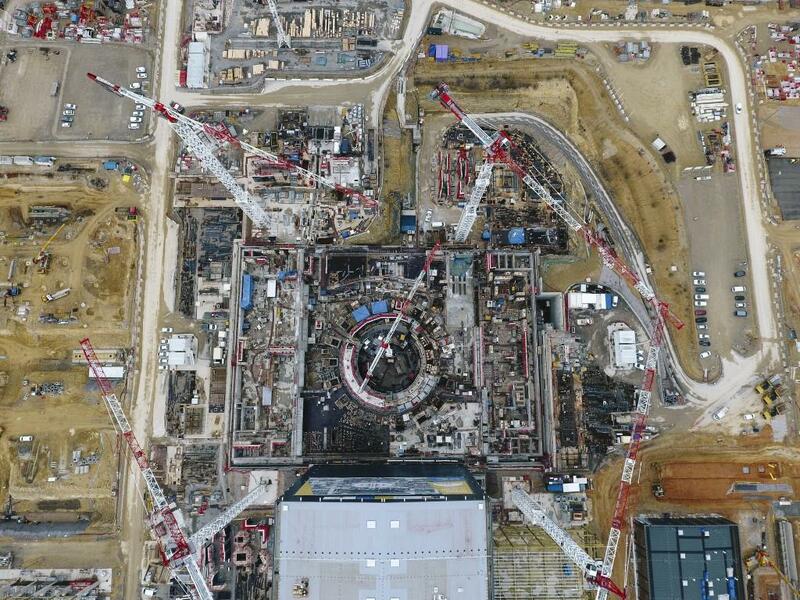 The C1 crane marks the centre, where Tokamak assembly will begin next year. 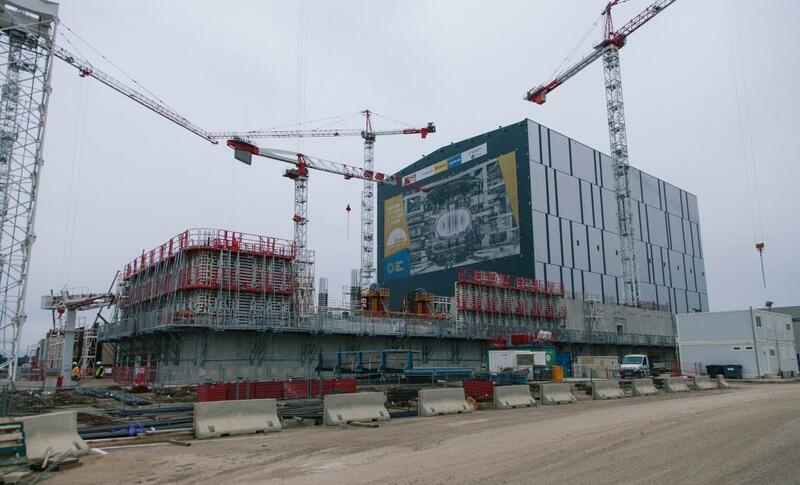 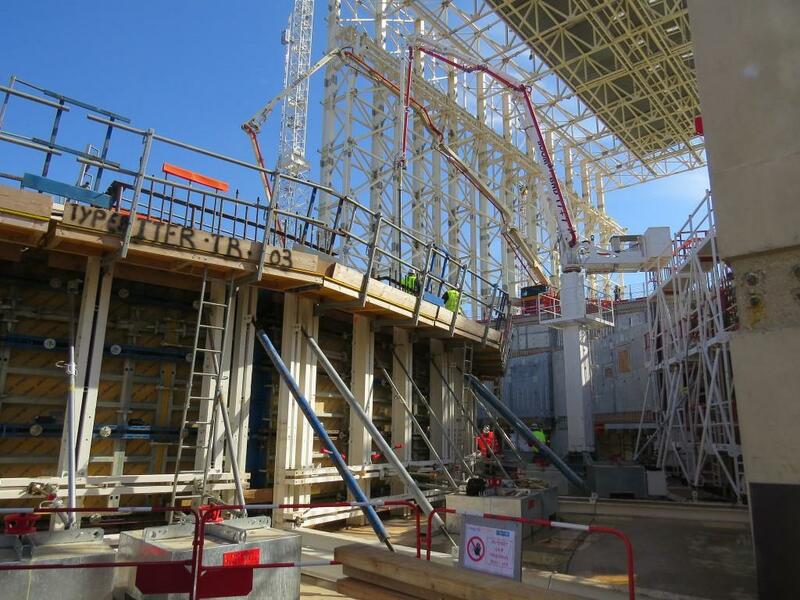 Work was halted on the Tokamak Building worksite on Saturday 20 May, in order to allow ITER Open Doors day participants to get as close as possible to the bioshield. 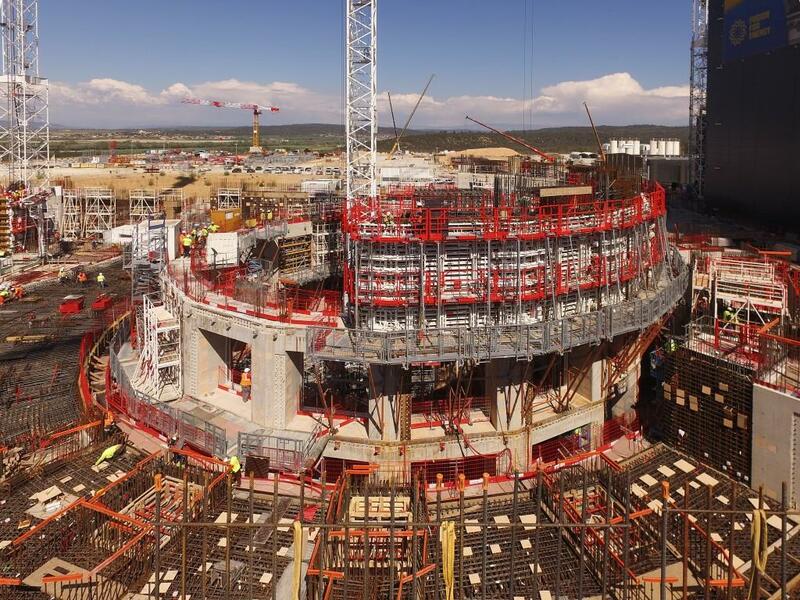 One of the most spectacular features of the ITER site is the perfectly circular bioshield, which will rise up to the L4 level and then be capped. 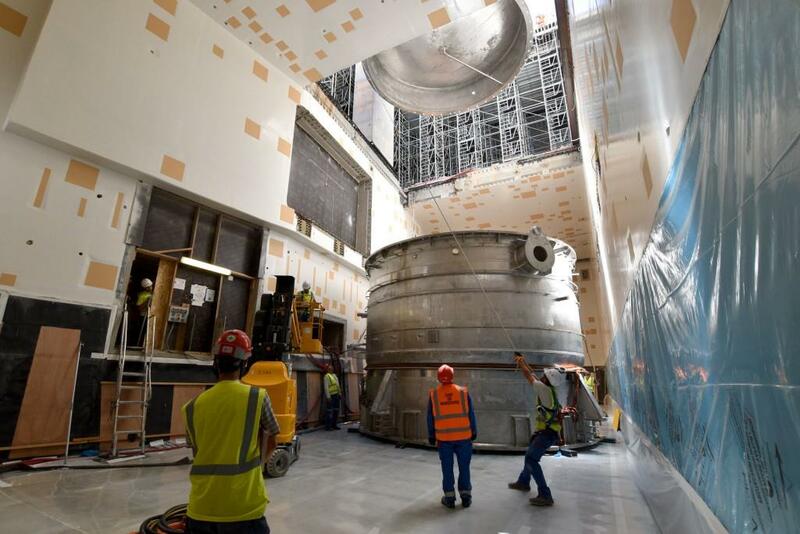 The bioshield will surround the cryostat, which in turn surrounds the steel vacuum vessel. 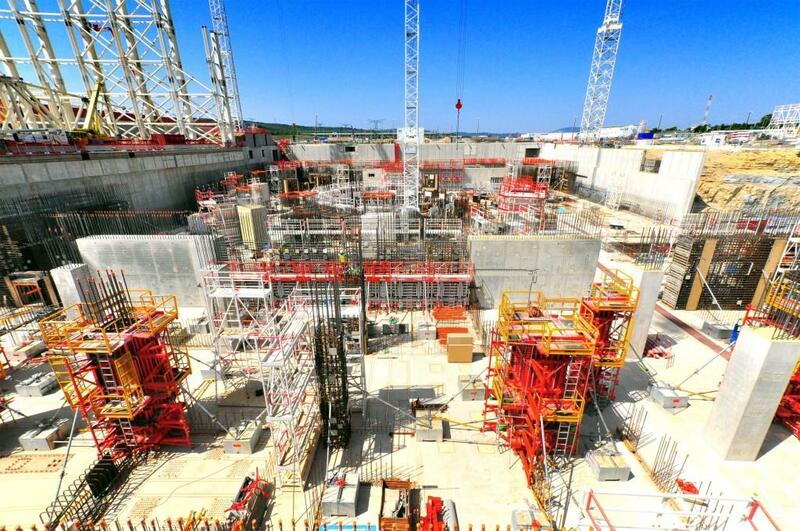 A peek into the deep "well" where the ITER Tokamak assembly will begin next year. 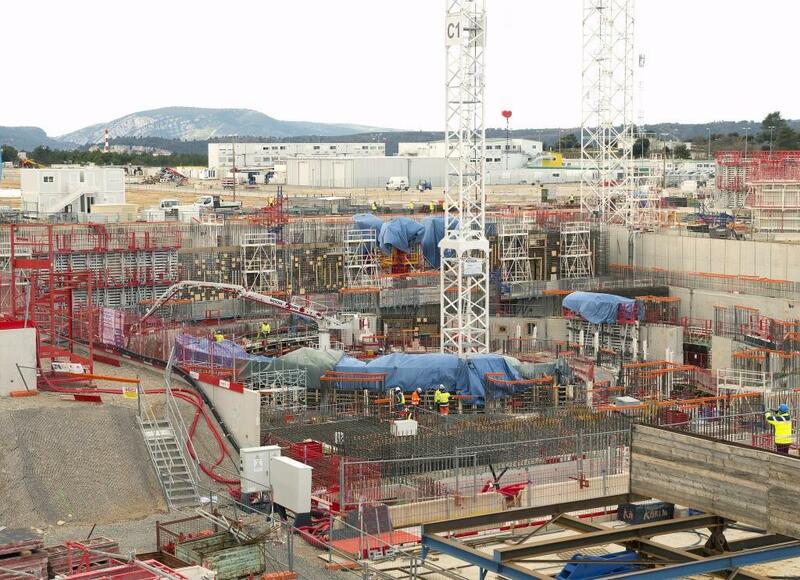 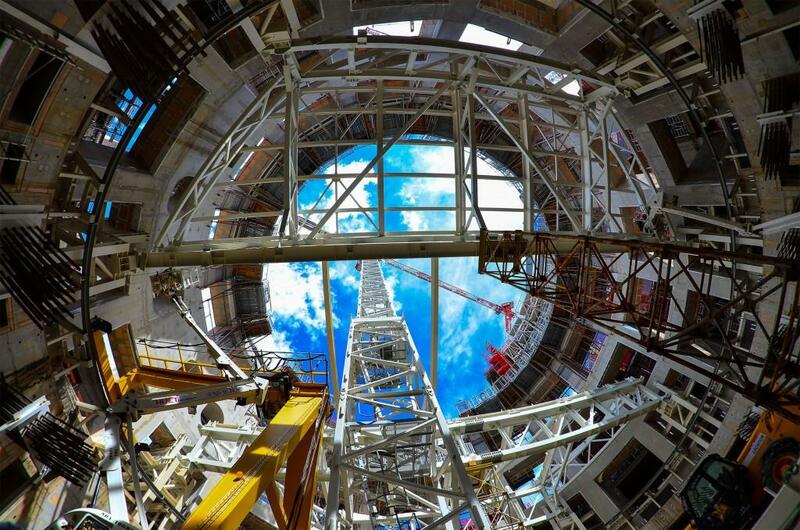 Inside the huge well of the ITER bioshield, teams are working on different levels simultaneously. 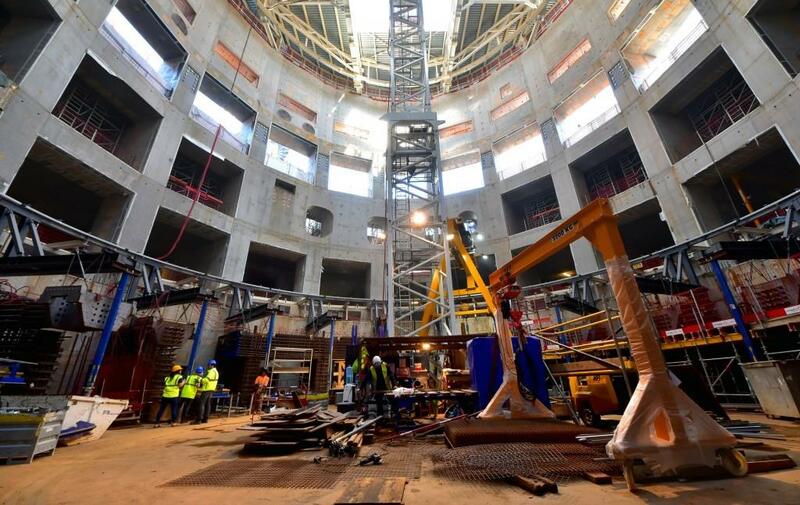 The worker in yellow stands at B1 level, where the base of the cryostat will one day be supported on a concrete crown. 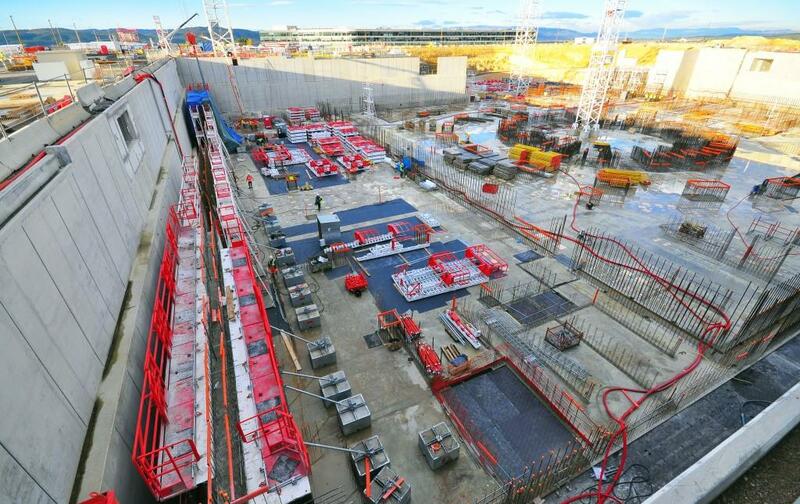 At L1 level a temporary structure has been erected to support some of the tools and equipment needed for concrete pouring and, just above, work continues to finalize the L2 level which hosts the multi-tonne steel plates that will anchor the main assembly tool in the Tokamak Pit. 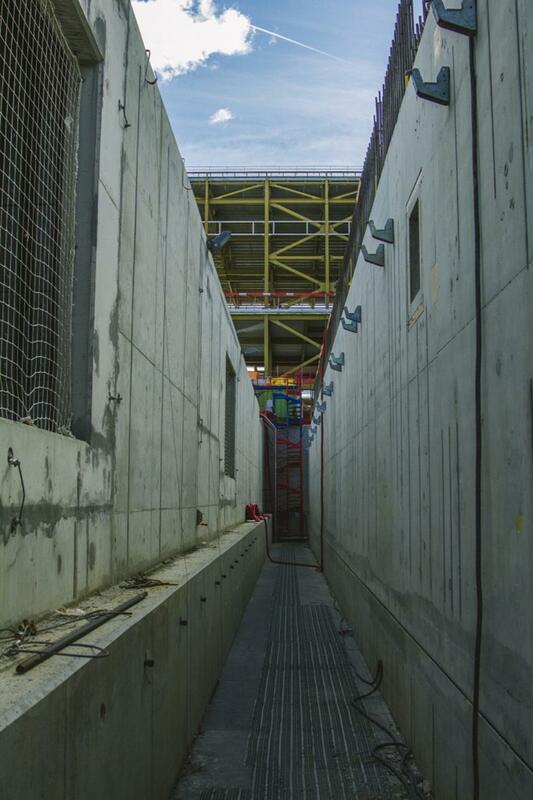 A temporary cap will soon be installed at B1 level, where you see the red line in this picture. 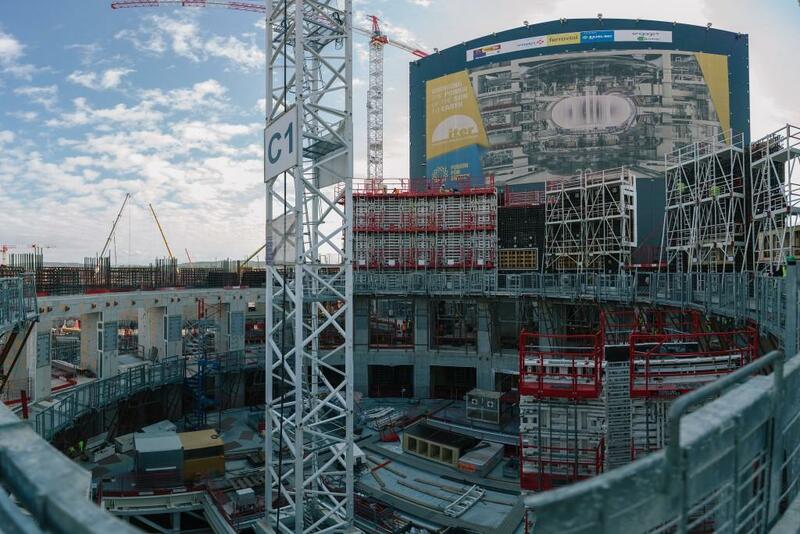 The cap will allow workers to work safely below, while work on the bioshield continues above up to the final level: L4. 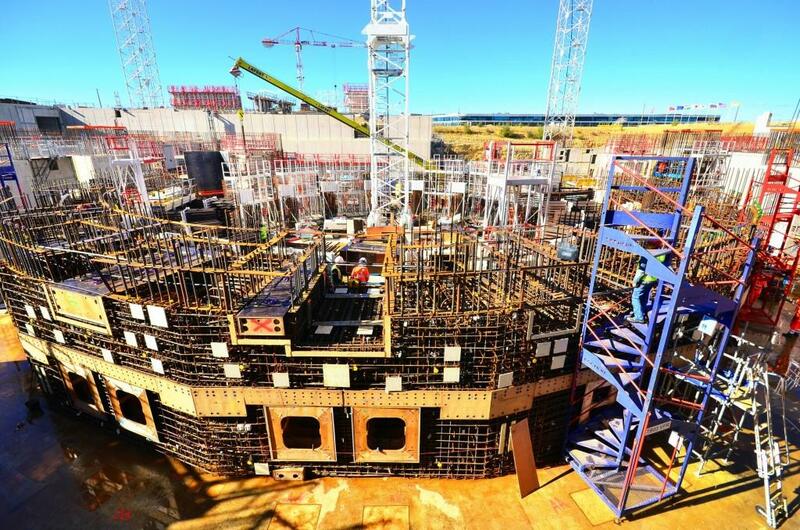 Workers are preparing to pour the last segments of the Tokamak Building L1 slab ... laying rebar, positioning anchor plates, setting up scaffolding. 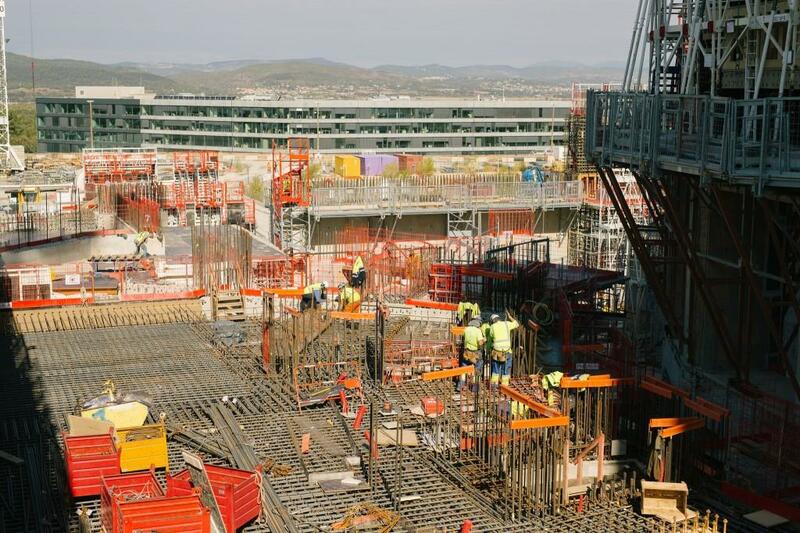 Visitors to ITER's Open Doors Day in May will be able to walk out over the finished concrete (L1 is the equivalent of ground level). 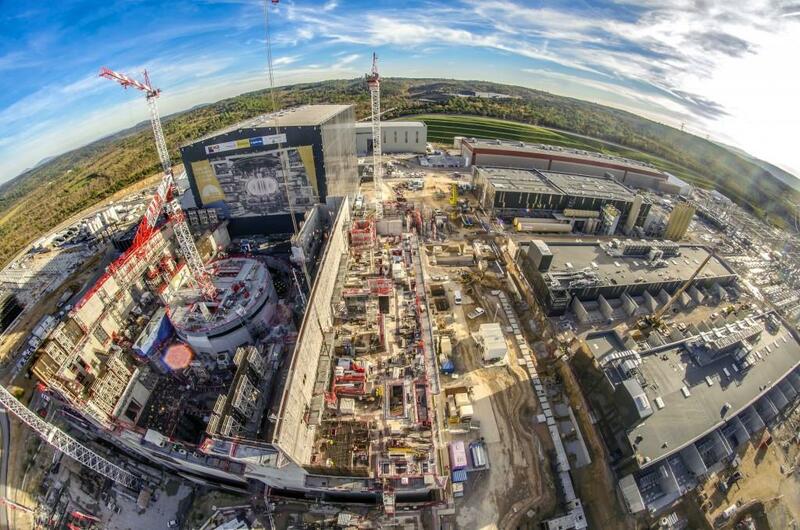 The Tritium, Tokamak and Diagnostic buildings, seen from the top of a crane. 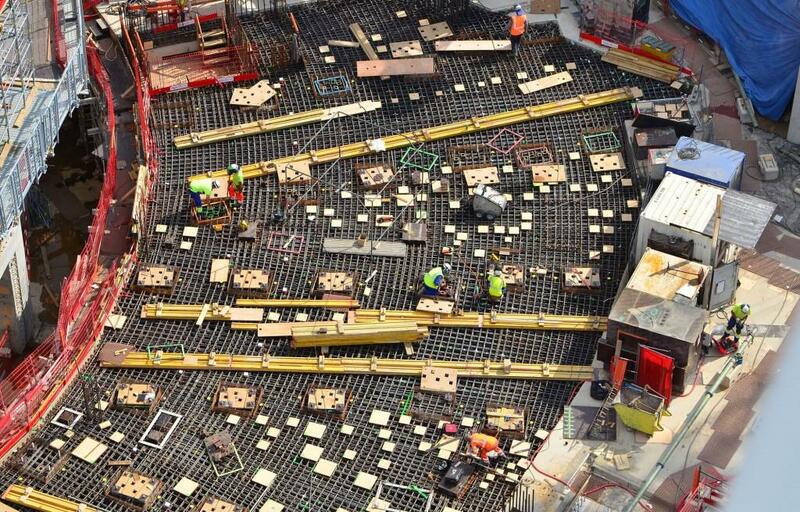 A maze of concrete and rebar. 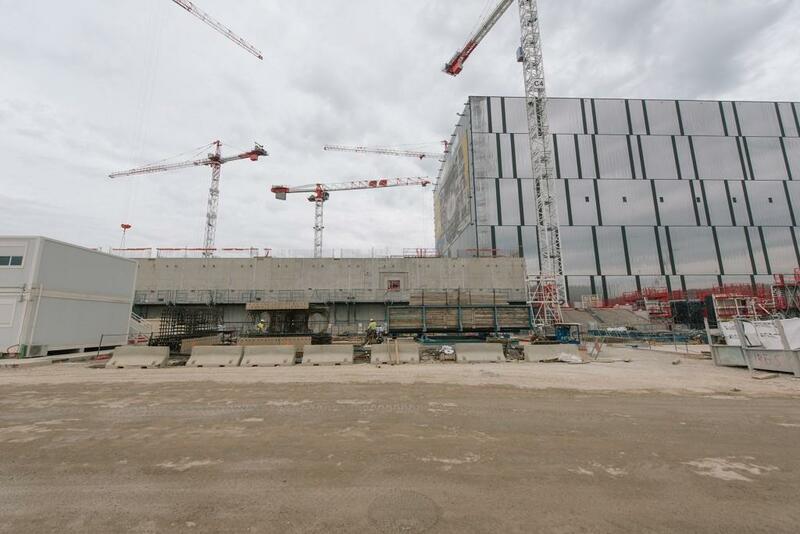 On 6 April, the massive formwork is removed— or rather ''gouged out''—from openings in the bioshield wall. 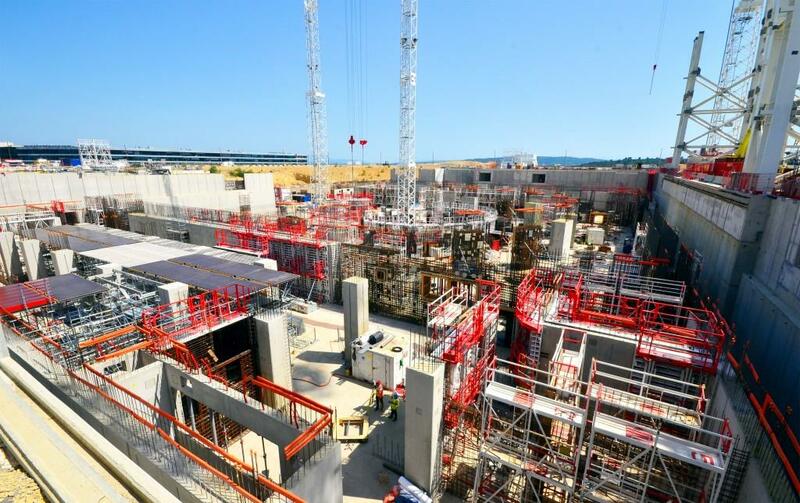 Connected to mixer trucks by pipes running through the basement of the Tokamak Complex, the two pumps can deliver some 30 cubic metres of concrete per hour. 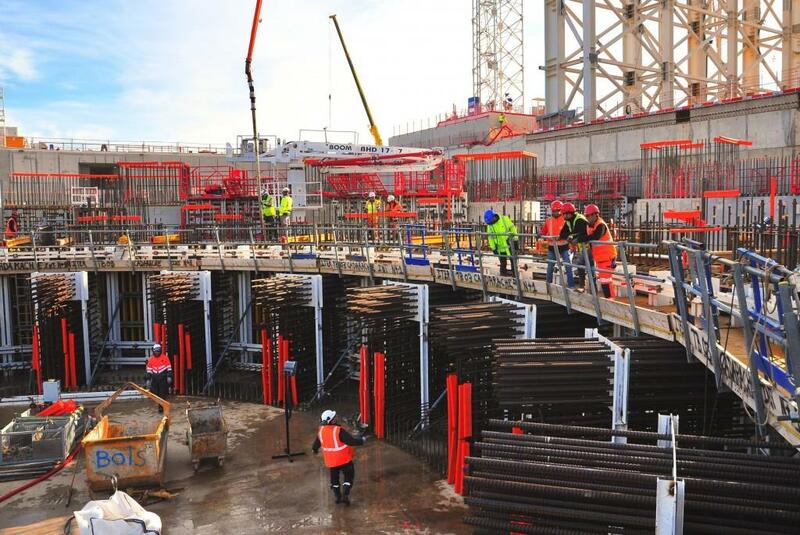 As concrete pouring proceeds in the background, workers on the L1 level of the building are busy handling a bundle of 12-metre-long bars for the steel reinforcement of the neutral beam cell slab. 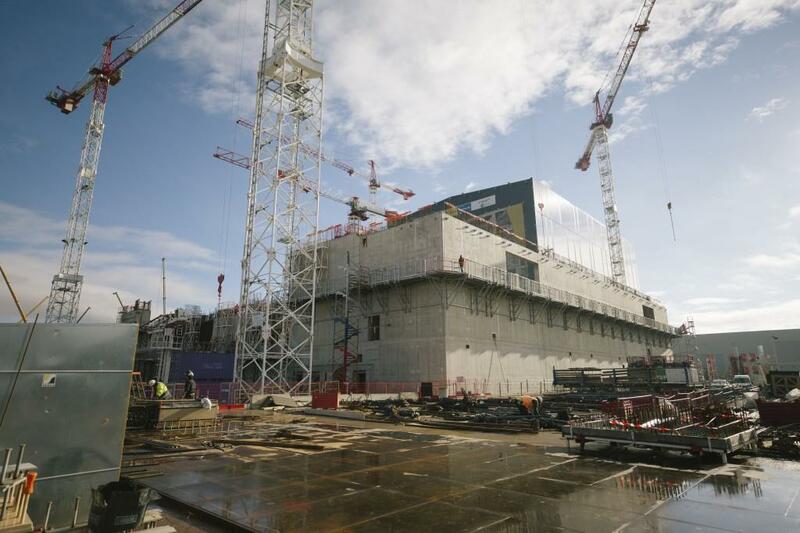 Work is underway on three levels of the bioshield at the same time (L1, L2, L3). 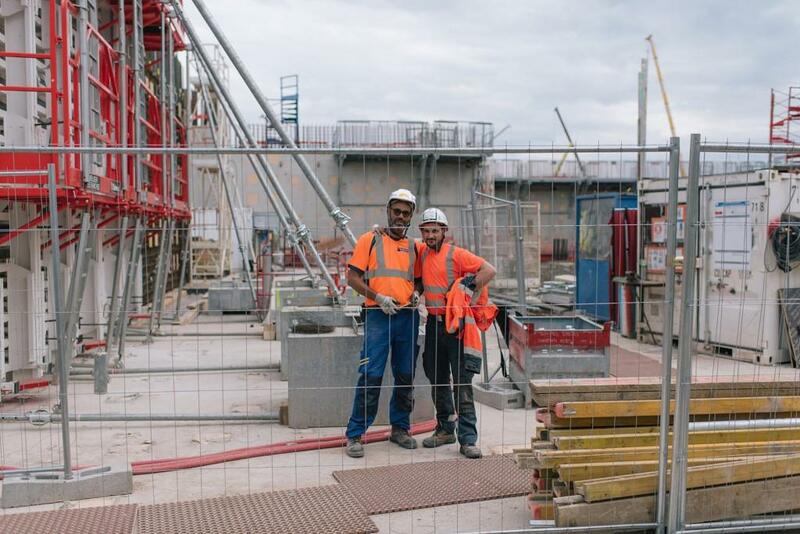 Three hundred workers, in two shifts, are participating. 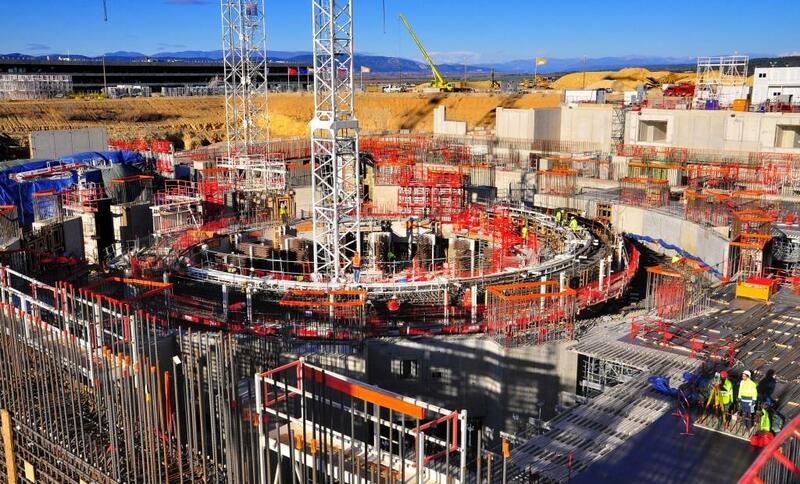 Exploiting the most reliable (i.e., unmovable) surface available—the concrete bioshield—the metrology team at ITER will establish a matrix of reference "targets," or fixed points, for use in measuring and aligning tokamak components during the assembly phase. 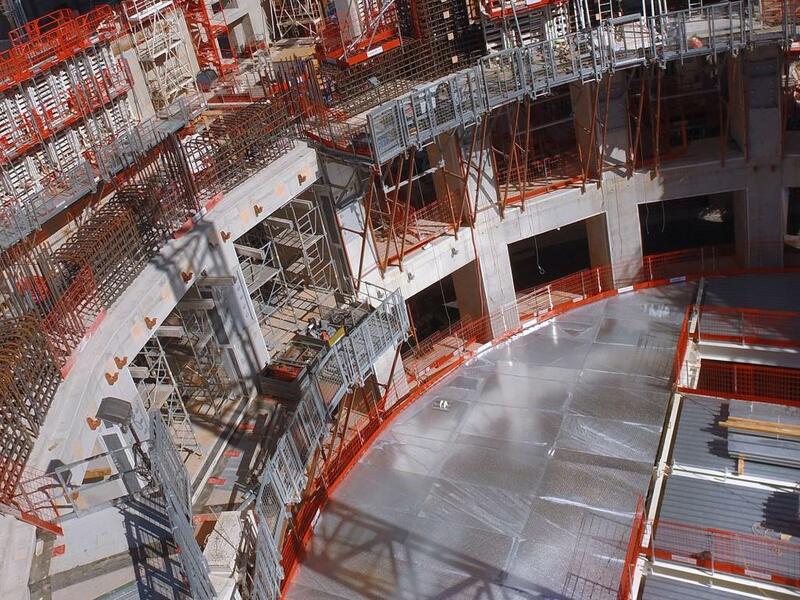 Looking down from the L2 level of the bioshield into the Tokamak Pit ... where the ITER machine will be assembled from bottom up beginning in 2018. 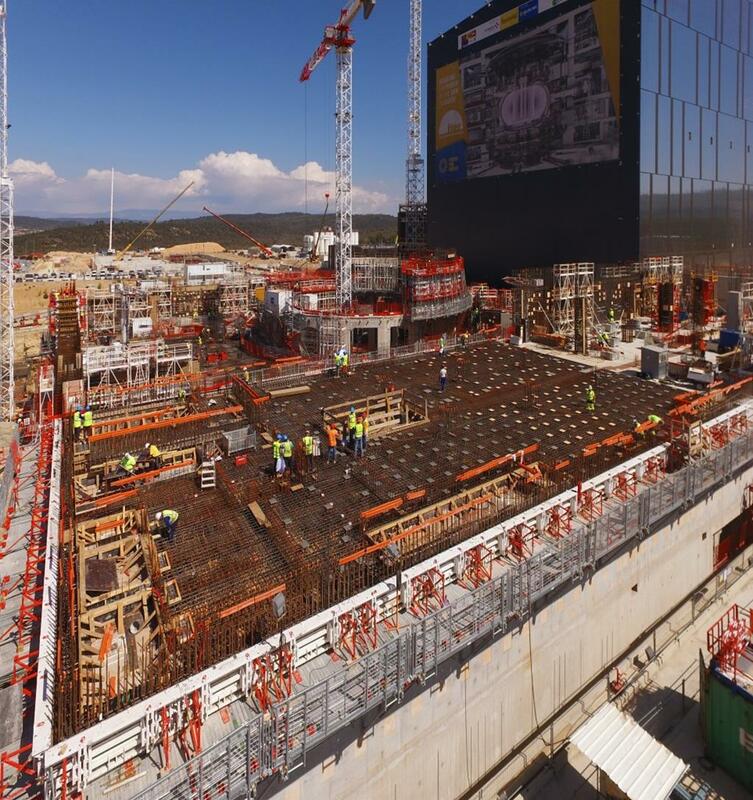 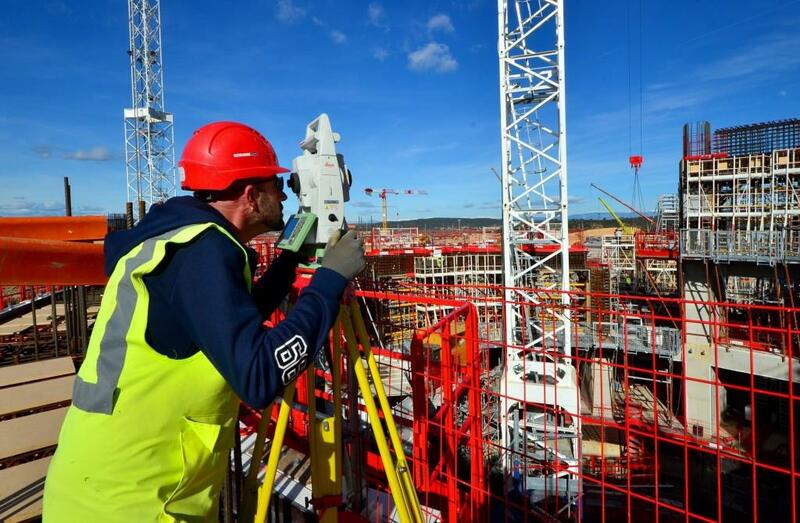 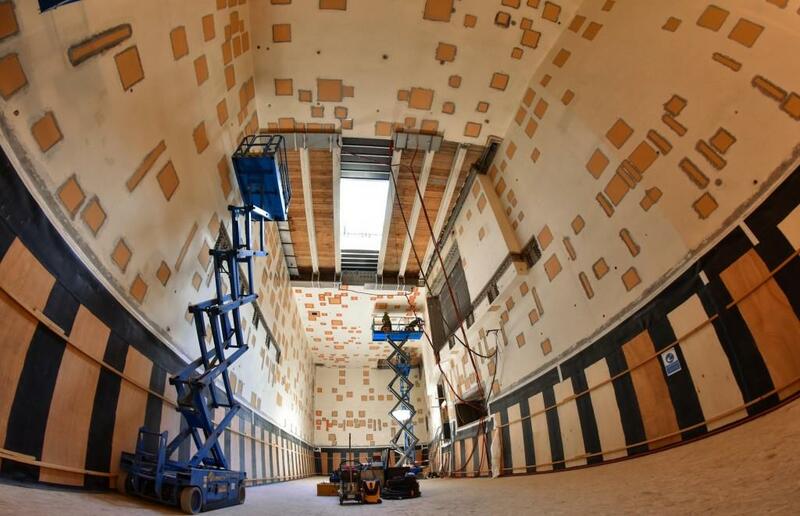 As the ITER bioshield rises, metrologists are on site to measure the as-built construction ... including the precise position of openings and embedded plates. 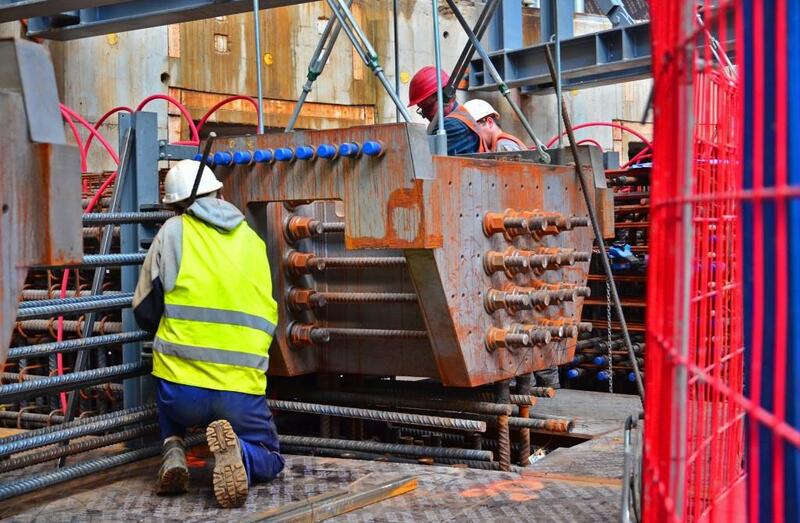 These embedded plates will one day support equipment for the neutral beam injection system. 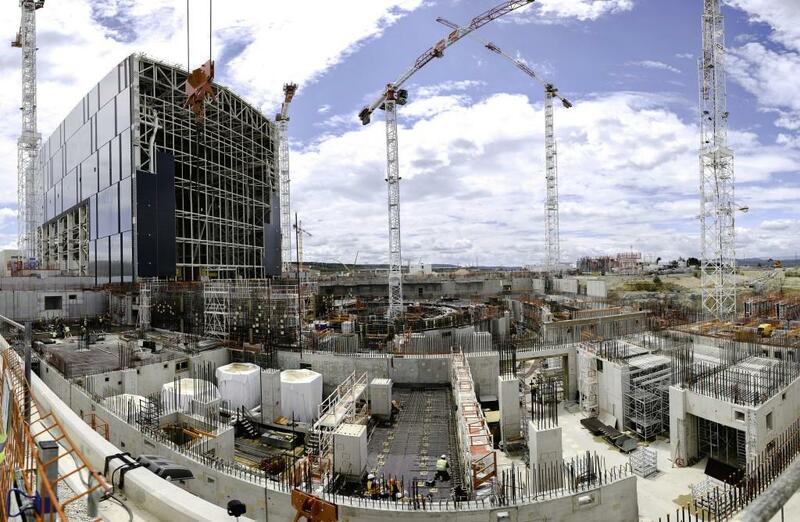 In the distance, the towers are part of the cargo lift system that will transfer components between the Tokamak Building and the Hot Cell Facility. 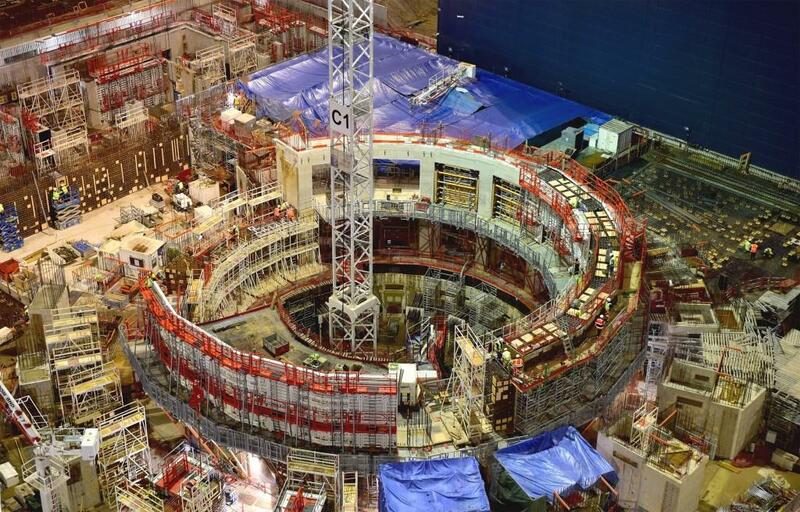 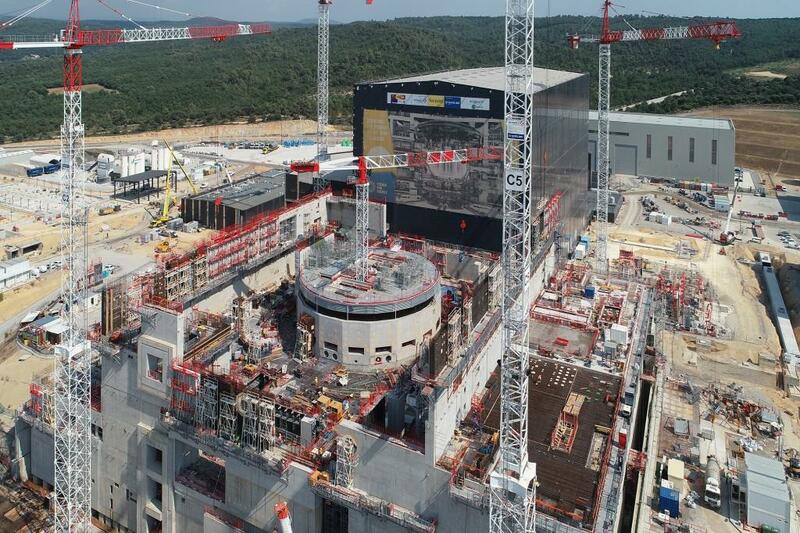 Look closely at the worker in orange to get a real idea of the size of the ITER bioshield. 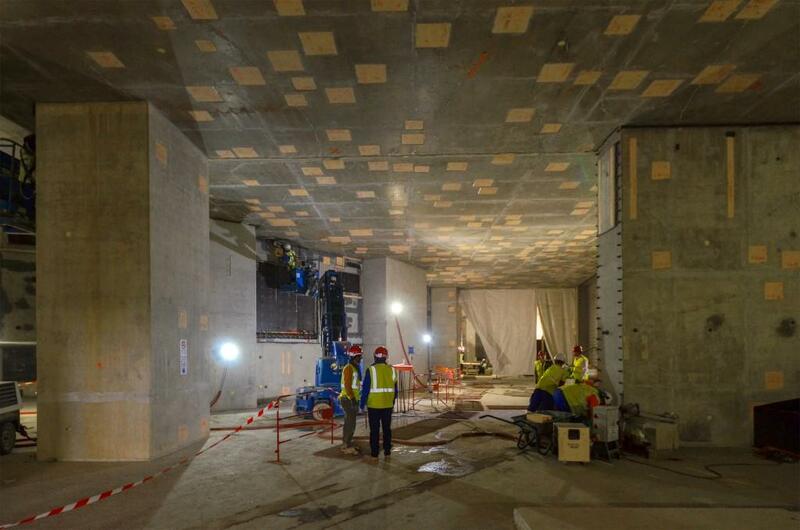 Having completed the bioshield basement levels B2 and B1, workers are now advancing on the "L" levels above-ground. 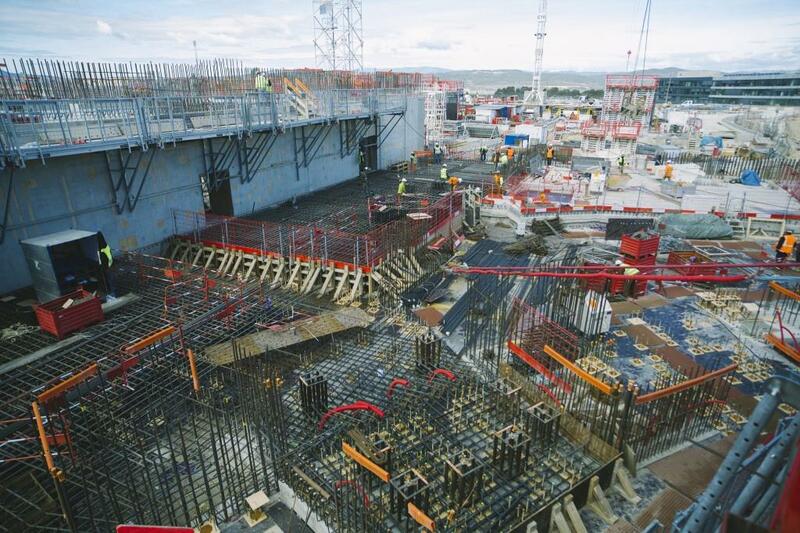 L1 has been poured and is seen still surrounded by scaffolding in this picture; L2 is half framed out; and the first reinforcement bars are visible at the L3 level. 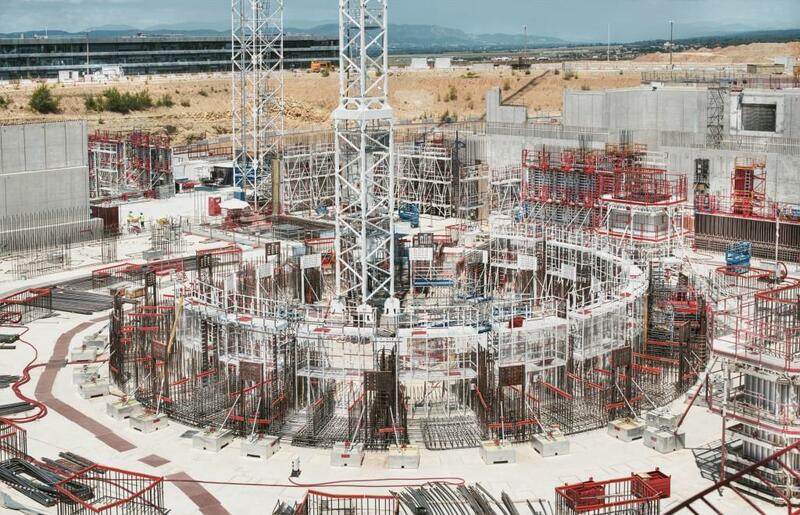 Circular areas are reserved in the rebar at the L3 level of the ITER bioshield for future magnet feeders. 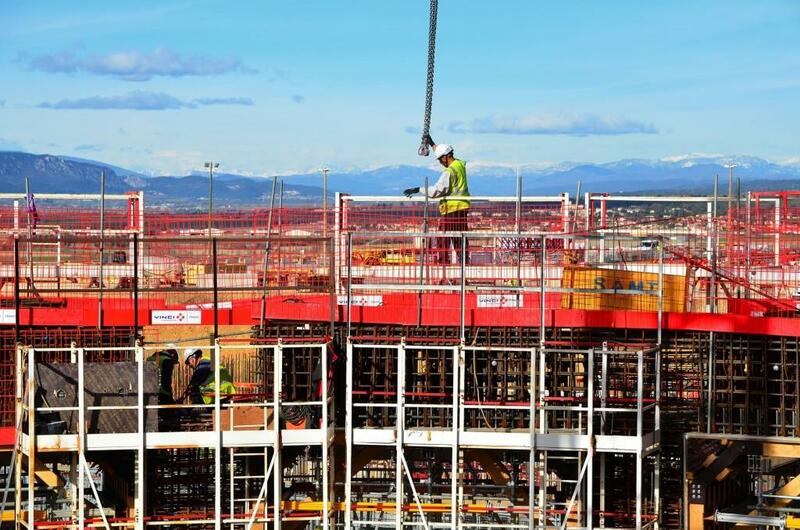 Snow-peaked mountains provide a spectacular backdrop to this worker preparing for a lift operation. 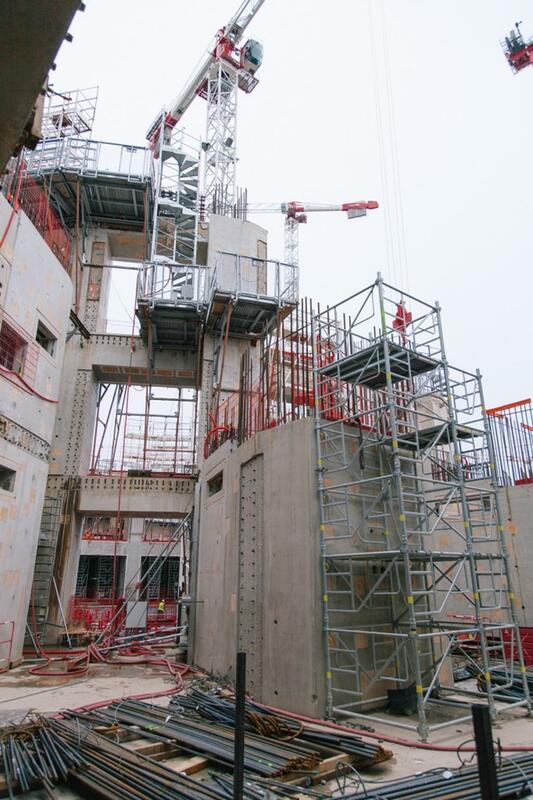 Scaffolding is transported by crane to the L2 level of the bioshield, where concrete pouring continues. 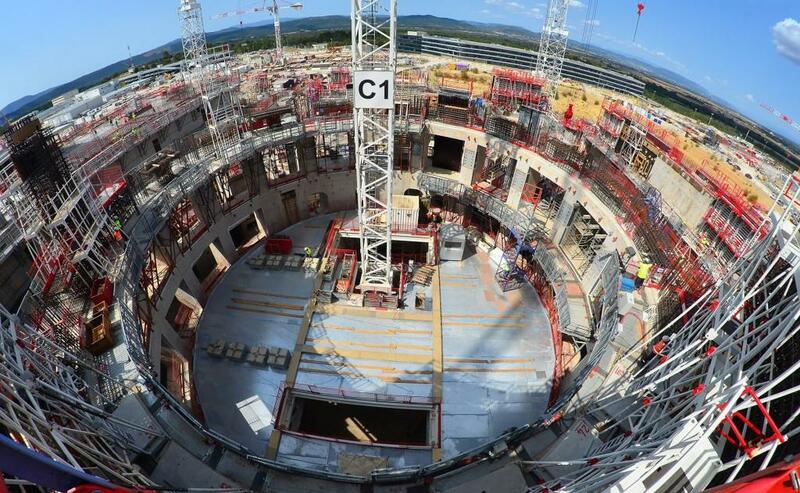 Looking into the circle of the ITER bioshield, where the first ground level L1 (seen as the top level in this photo) is framed out for final concrete pouring. 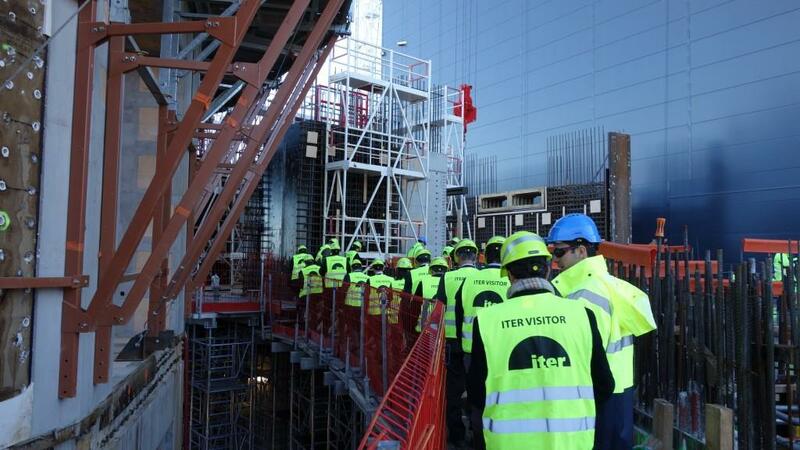 Visitors are a daily feature on the ITER worksite. 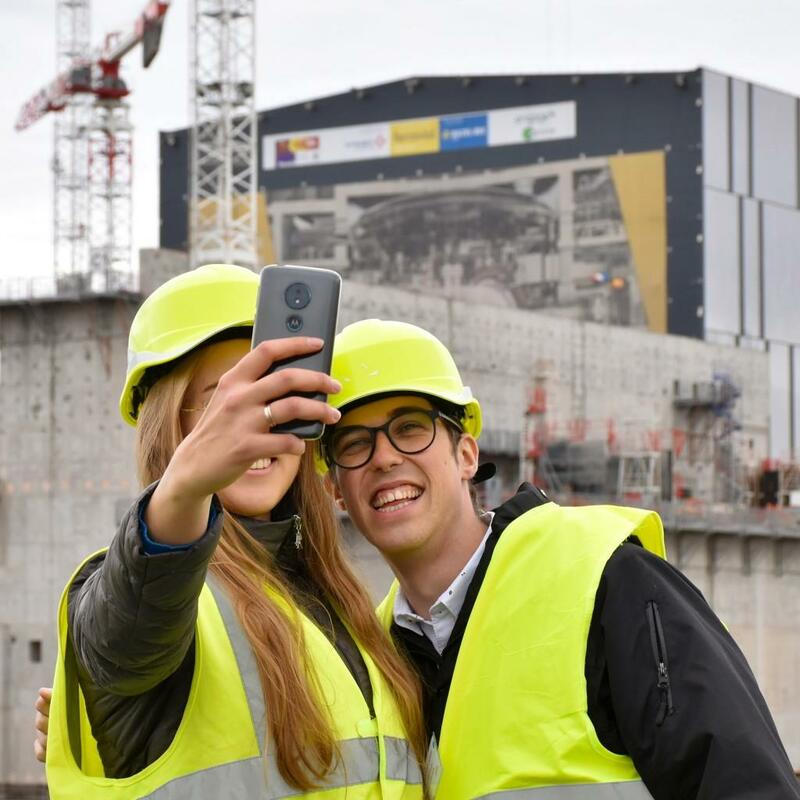 In 2016 the project welcomed nearly 15,000 people and organized 600 visits. 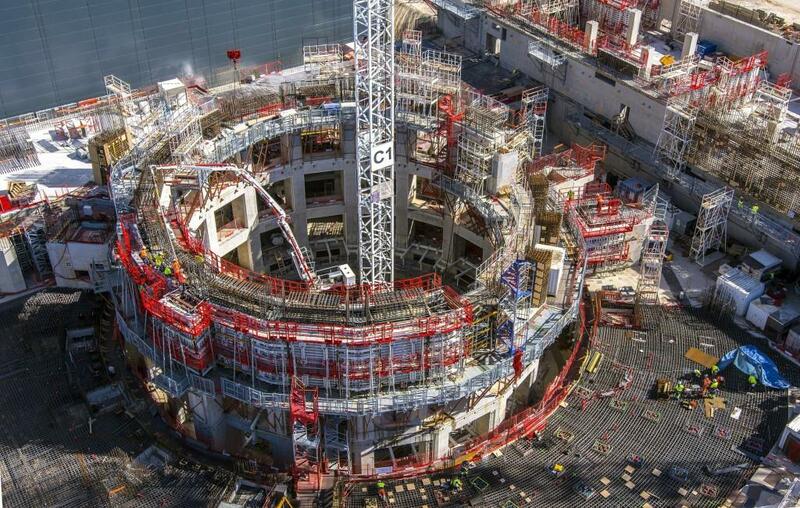 The bioshield structure is rising at the heart of the Tokamak Building. 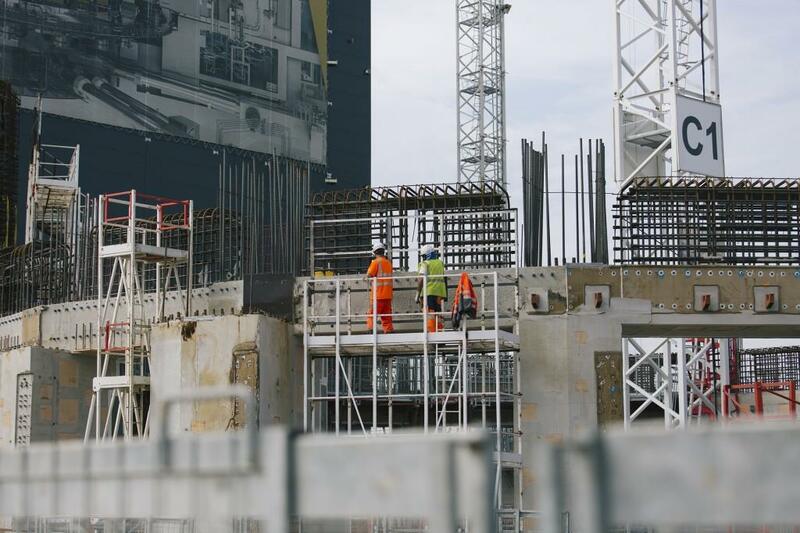 The last plot of the B1 level was poured last week (the workers in yellow are at B1 level); about half of the first ground level (L1) is now complete (level above the workers); and the first elements of L2 are in place (see scaffolding). 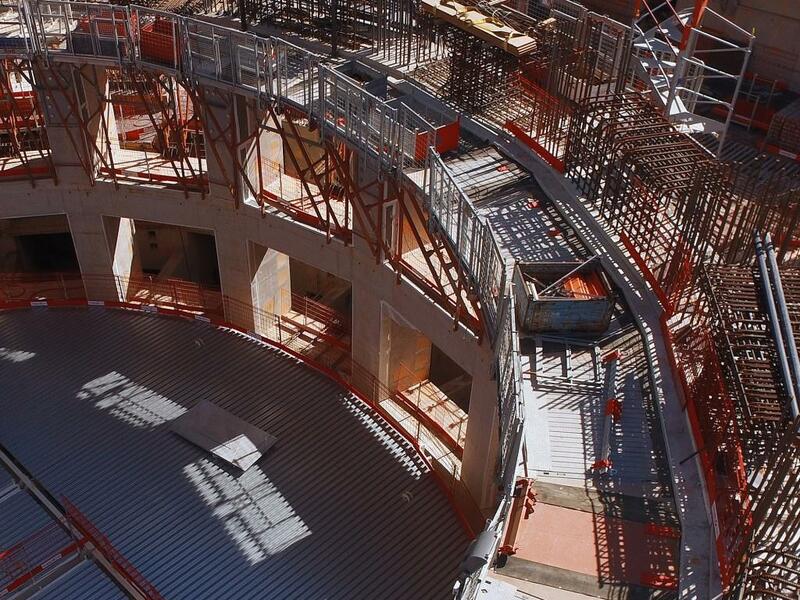 Four circular openings, in all, are reserved in the bioshield for ITER's neutral beam injectors: three for the heating neutral beams (first three in the photo, from left) and one for the diagnostic neutral beam (foreground, smaller). 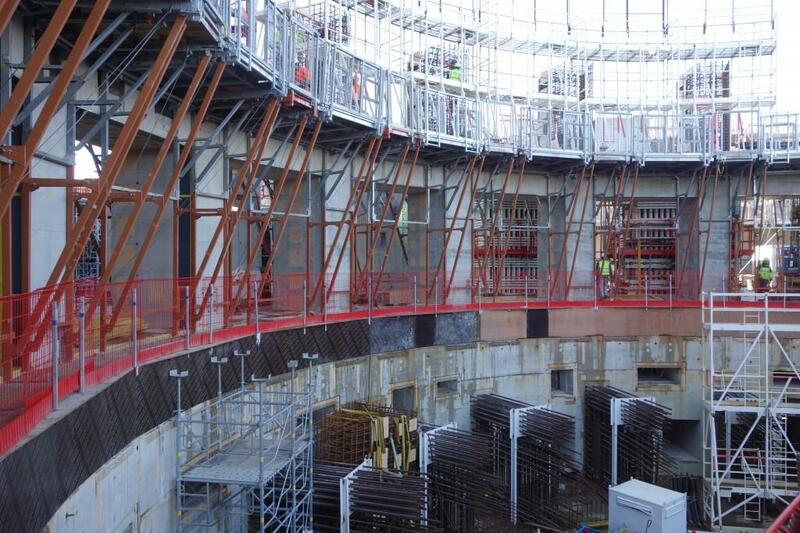 These large circular openings in the bioshield are reserved for the neutral beam injection system that will feed some 30 MW of heating power into the plasma. 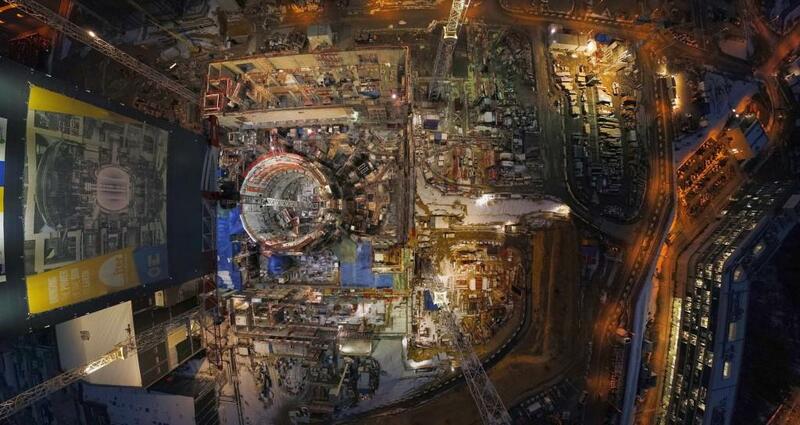 The Tokamak Complex worksite is photographed one evening in December from one of the tallest cranes. 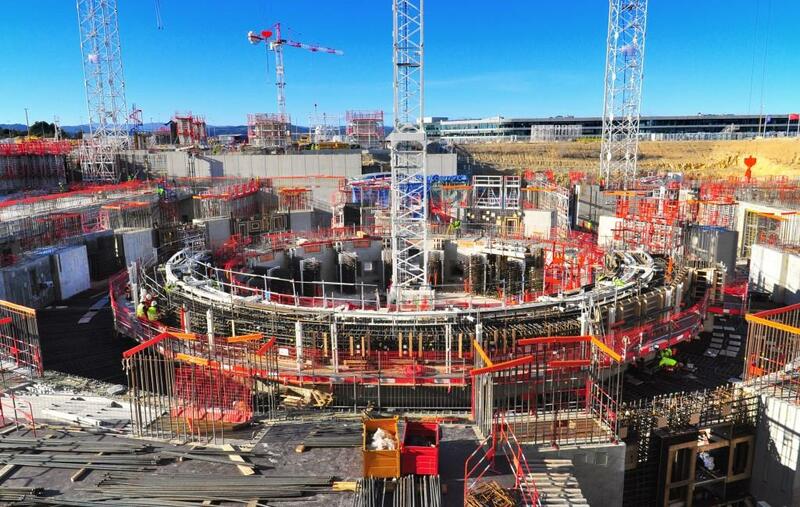 The perfectly circular ITER bioshield is rising in the centre of the Tokamak Complex. 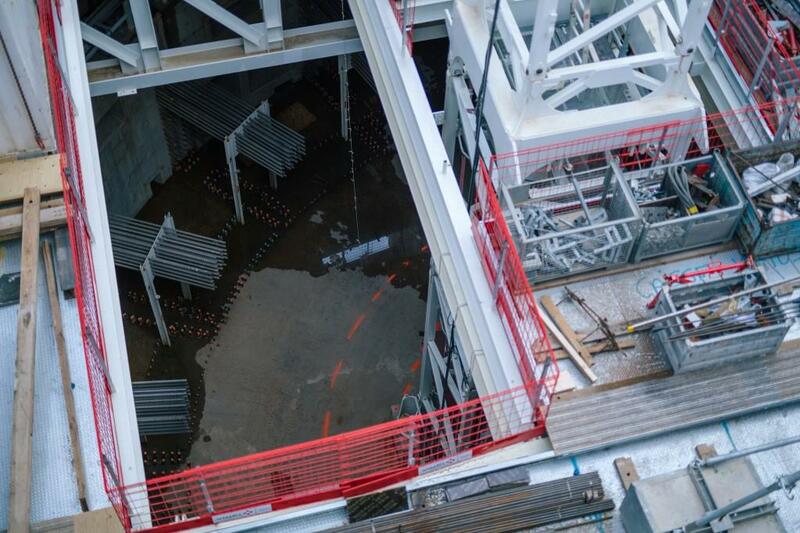 In this photo, we see progress advancing on Level L1 (the first "aboveground" level). 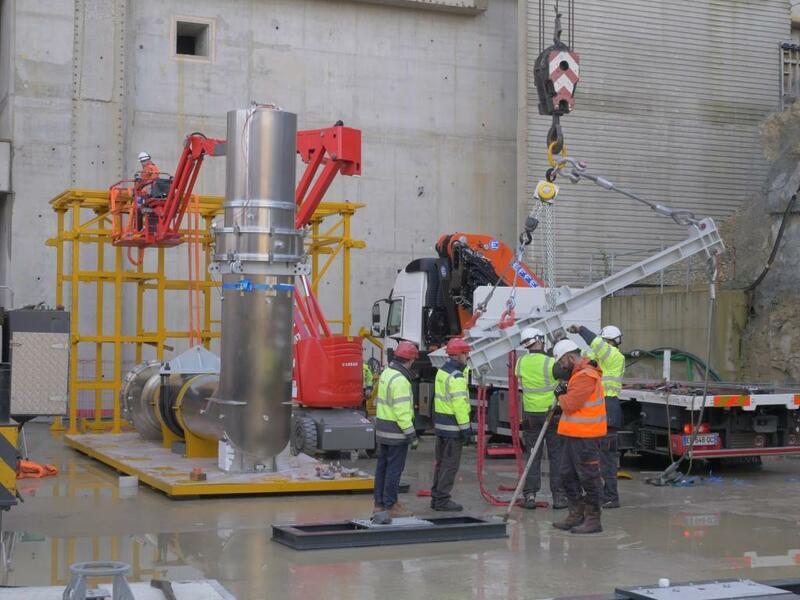 Forty-four openings, or ports, in the vacuum vessel will allow access for remote handling, diagnostic, heating, fuelling and vacuum systems. 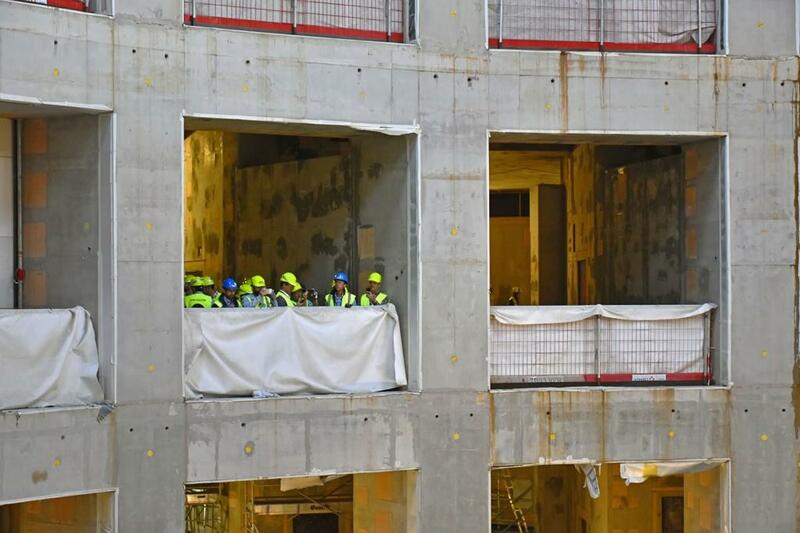 These openings are reflected in the bioshield (photo) that is under construction now. 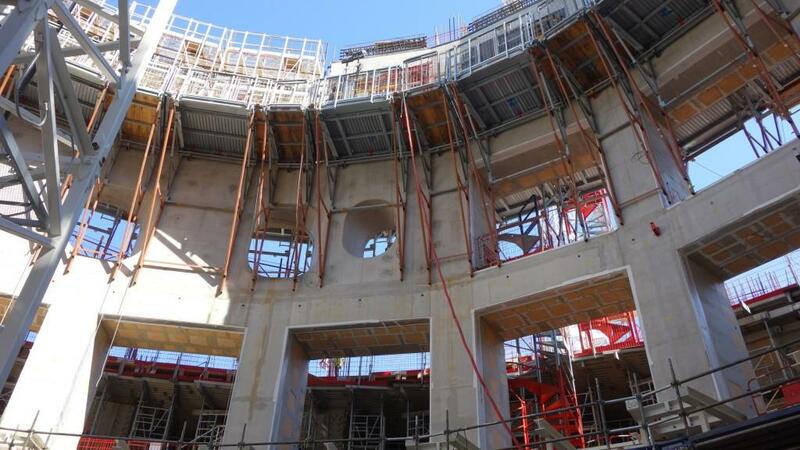 The B1 level (first basement level) of the concrete bioshield is pierced by regular openings for the access of plant systems to the cryostat and tokamak. 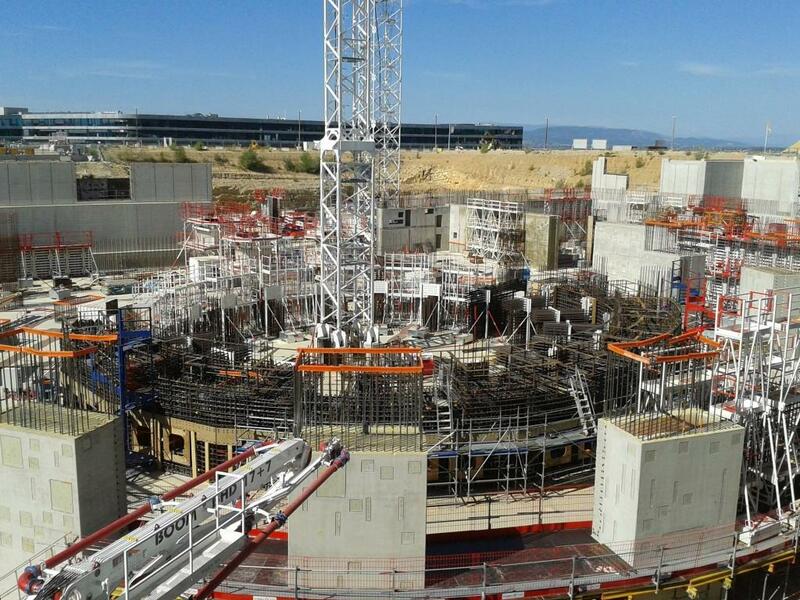 The building is rising all around, but the central well for the Tokamak remains. 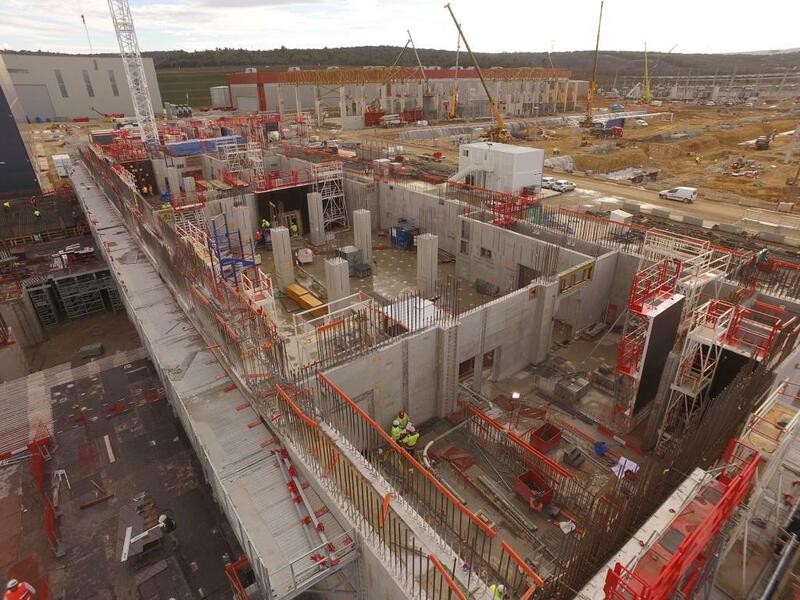 Tokamak assembly can start here as soon as the building is ready for occupation. 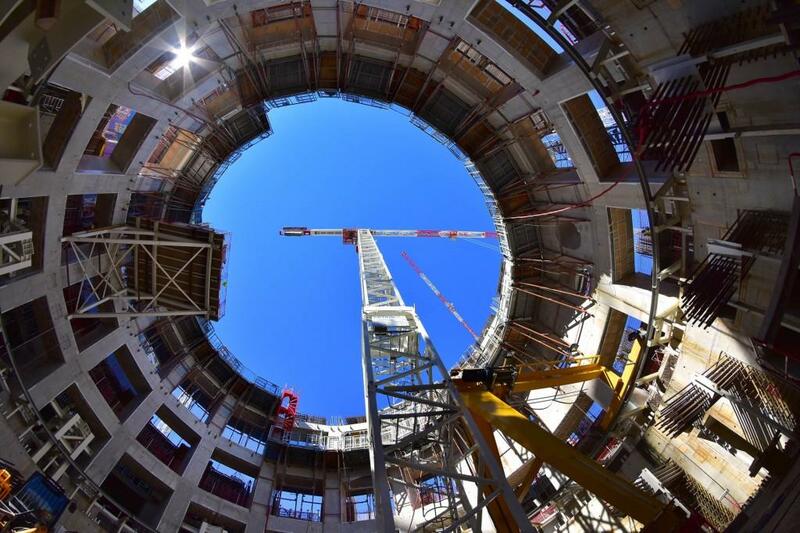 Looking up towards the top of the 60-metre-tall Assembly Building, from the Tokamak Complex worksite. 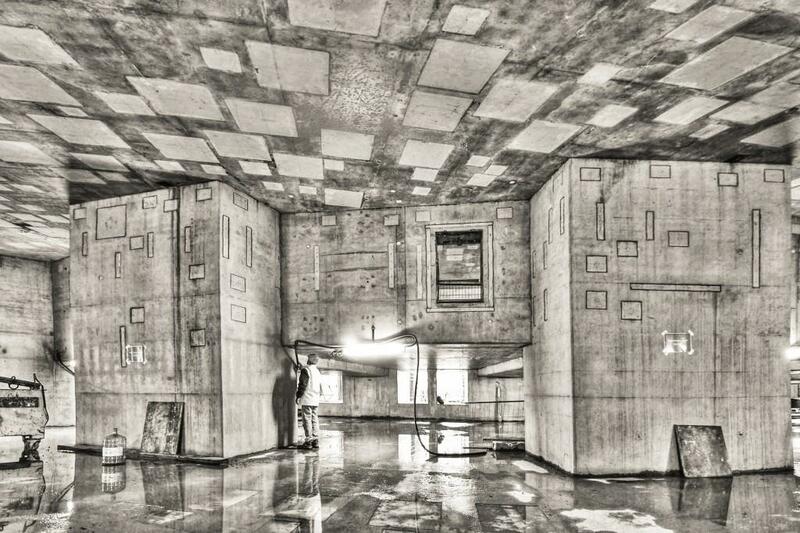 A cathedral-like space, massive columns, a "sky" speckled with "stars" ... here is the fascinating atmosphere of the basement of the Tokamak Complex, captured by ITER's photographer and interpreted by Christian Lünig (Christian Lünig/VG Bild und Kunst). 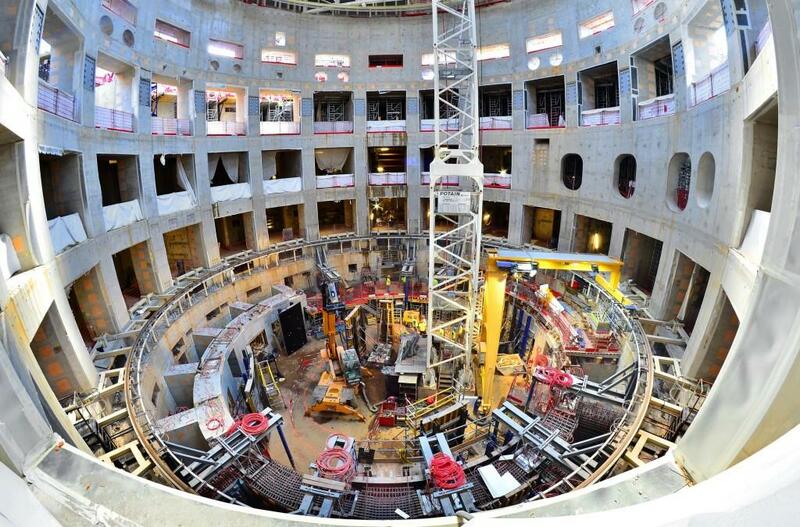 In the belly of the Tokamak Building, between the B2 and B1 levels. 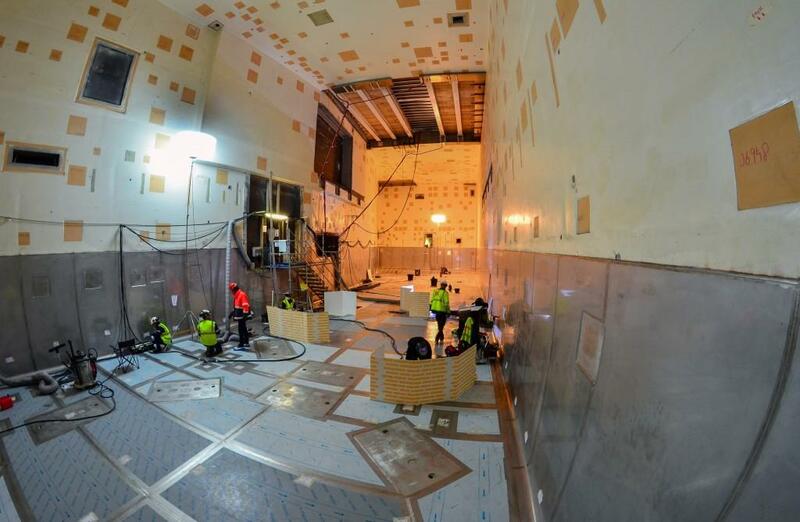 During the lead-up to Tokamak operation, the space will be completed filled with pipes, cables, feeders and busbars, all secured to the embedded plates visible in the floors, walls and ceilings. 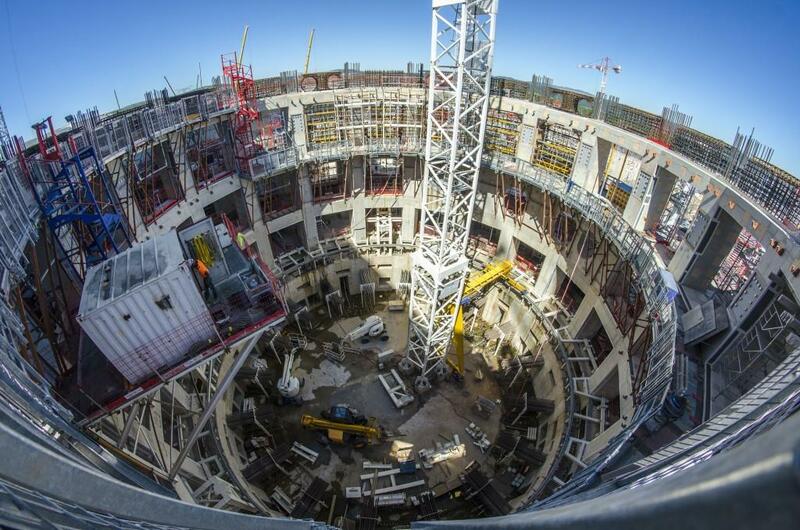 As the Tokamak Building rises, the Tokamak "pit" in the centre becomes more distinct. 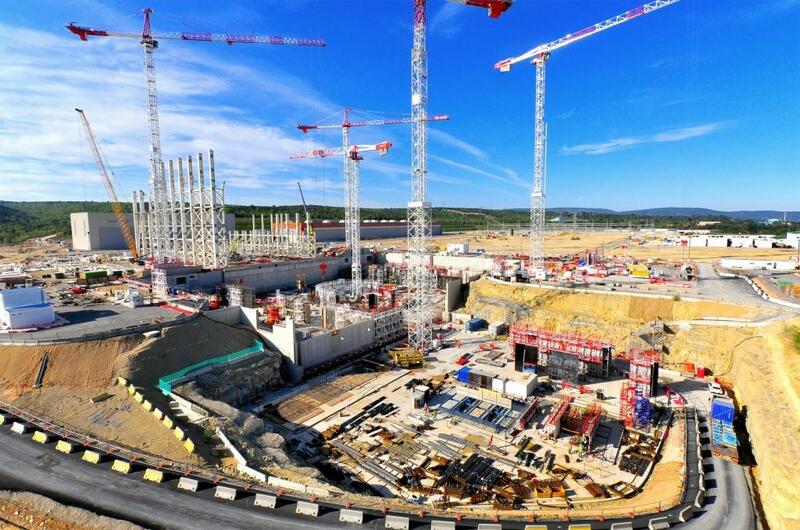 Here, over one million components will be assembled into the ITER machine. 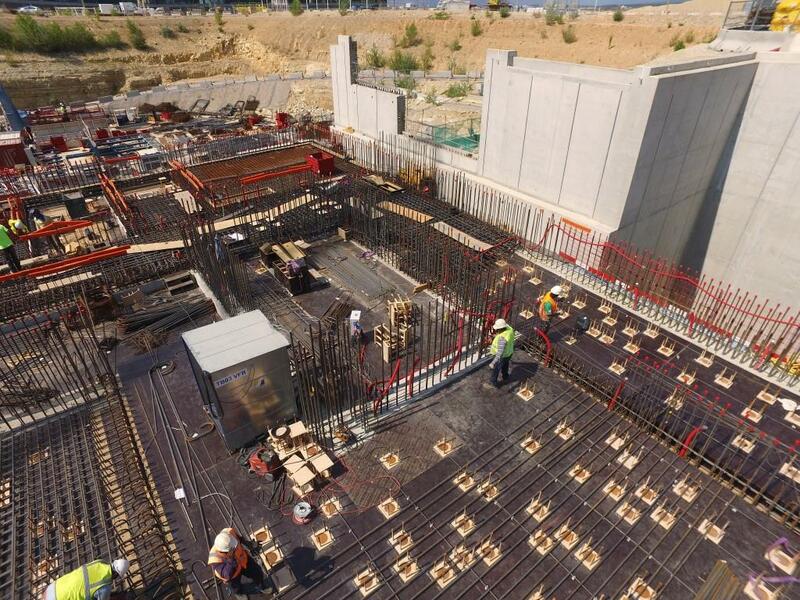 In early August, work progresses on the B1 level (upper basement level) floor slab of the Tritium Building. 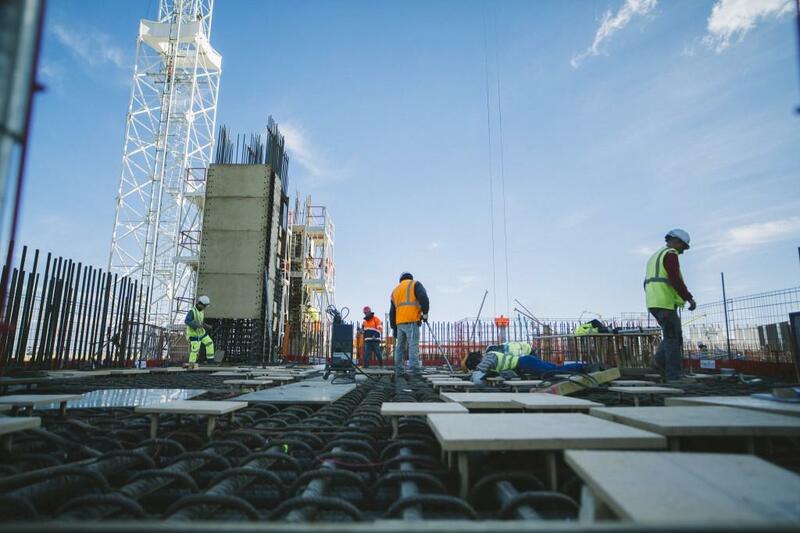 Workers are carefully positioning hundreds of embedded plates in the dense rebar lattice before pouring the concrete for the B1 basement of the Tritium Building. 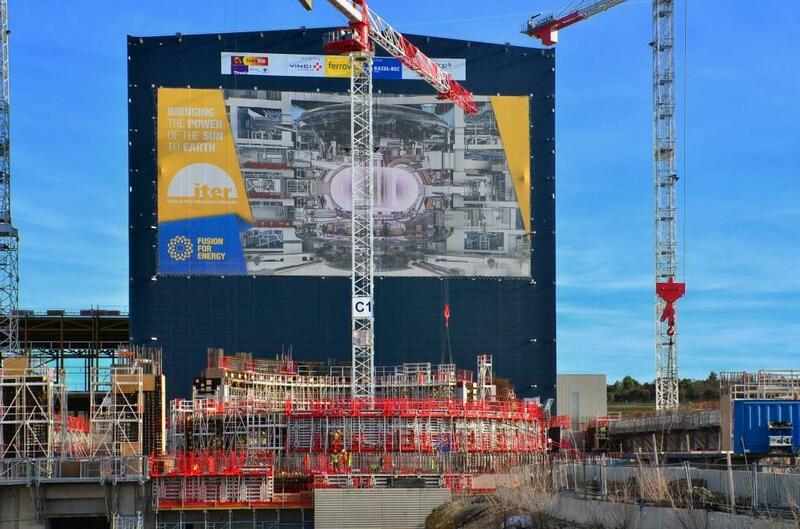 The Assembly Building, now adorned with a giant poster of the ITER machine, dominates the ITER landscape. 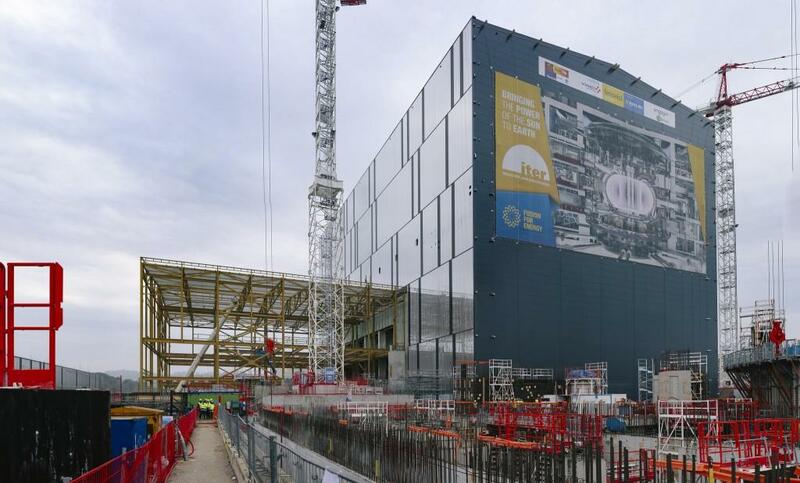 Eventually, as the Tokamak Building rises, the temporary cladding on the northwest facade will be removed and the two buildings will be joined into one. 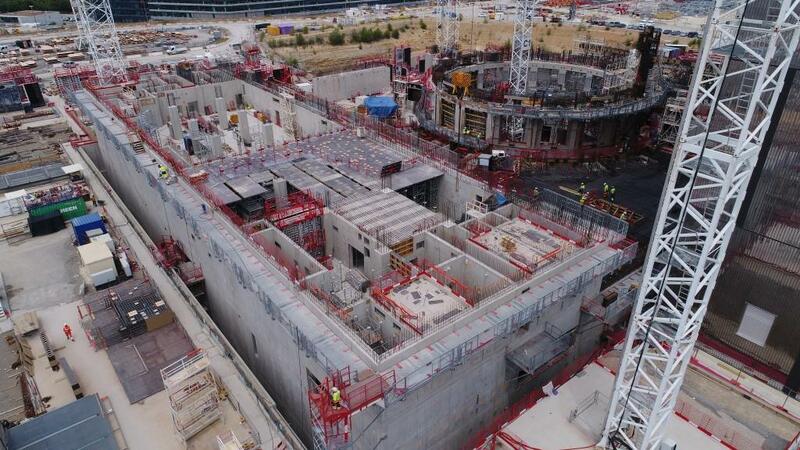 Half of the B1 basemat (the upper basement level slab) has now been poured for the Tokamak Building, in the centre of the image. 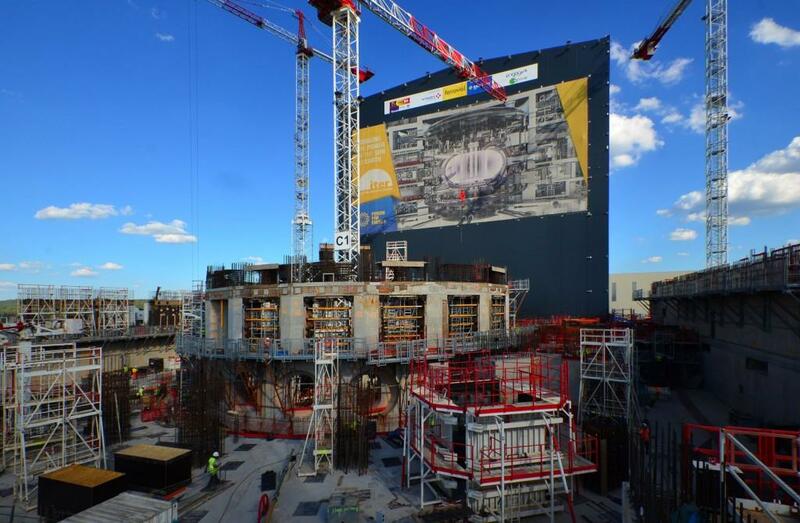 When the seven stories of the Tokamak Building are completed, the two buildings will match in height (60 m above platform level). 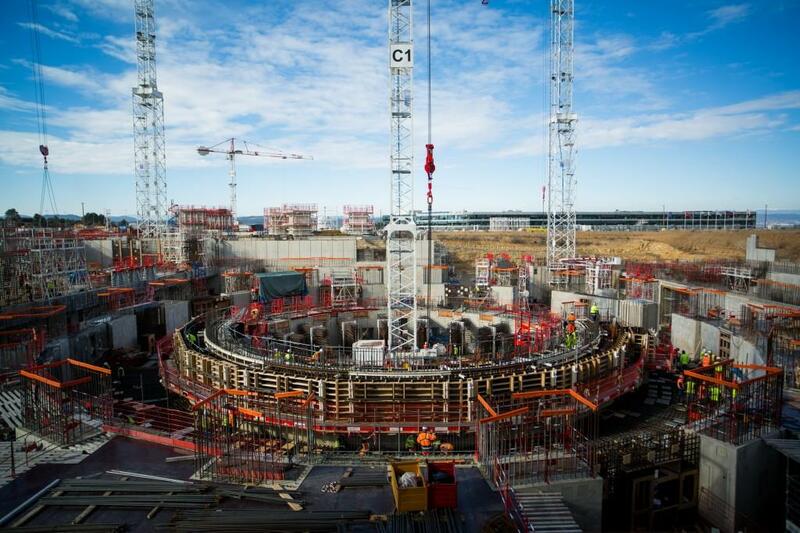 Tens of thousands of embedded plates will be installed throughout the seven levels of the Tokamak Complex to provide anchorage for equipment such as cable trays, cooling water system tanks and diagnostics. 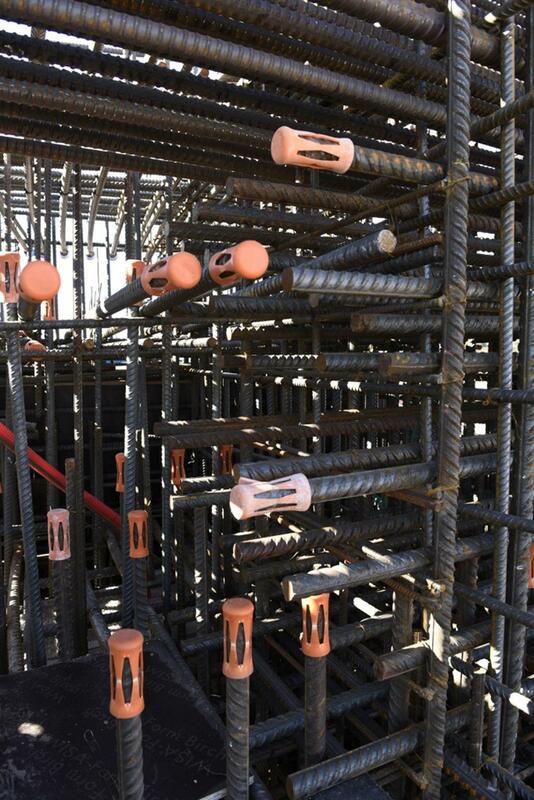 These plates must be inserted into the rebar lattice prior to concrete pouring. 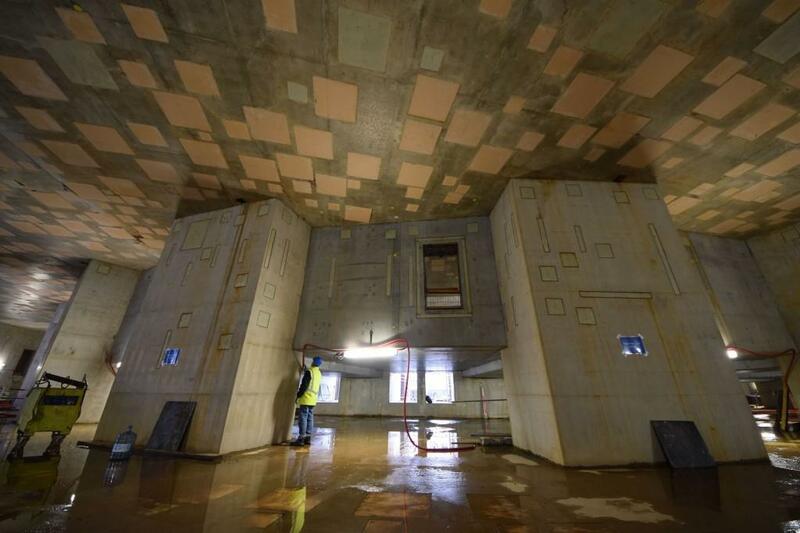 On the subject of embedded plates, this photo allows us to see the plates that have been positioned on the underside of the basemat (the ceiling of one level), as well the ones on the floor of another. 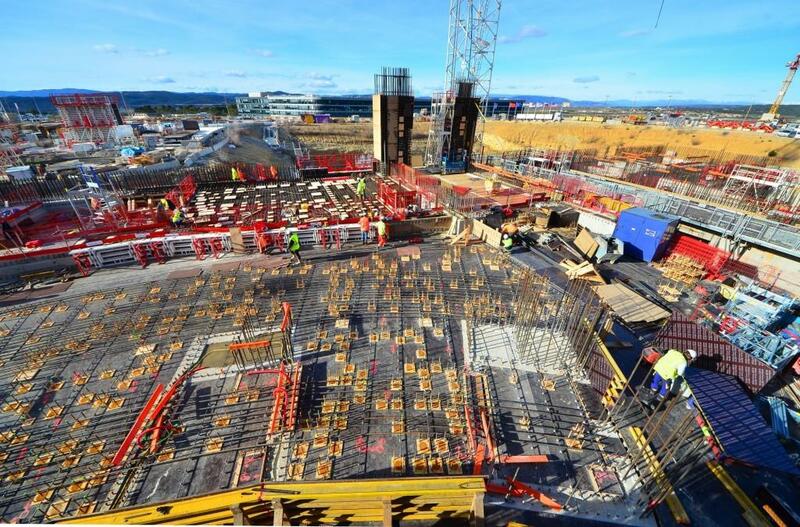 From the Diagnostics Building, where formwork is underway for the Level L1 basemat (which will bring the building flush with the platform), we look across the complex scape of the Tokamak Building, with its multitude of steel bars, embedded plates, and equipment. 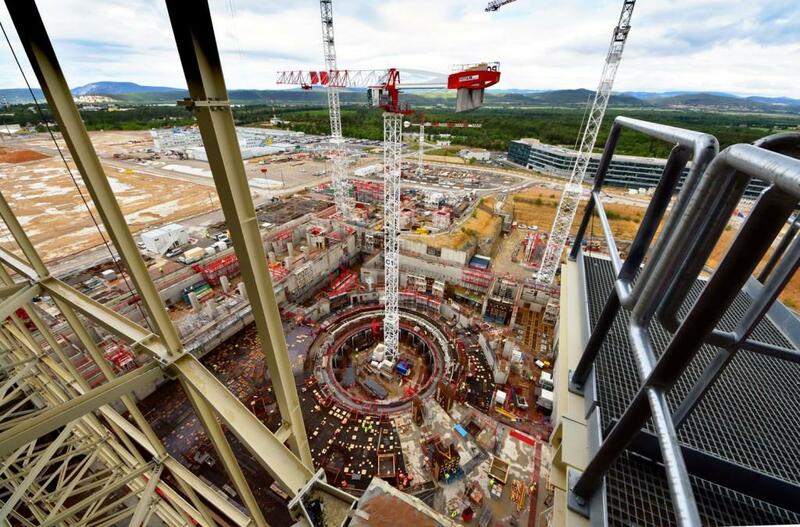 As the building rises on all sides, the circular Tokamak assembly area—called the "pit"—becomes more and more pronounced. 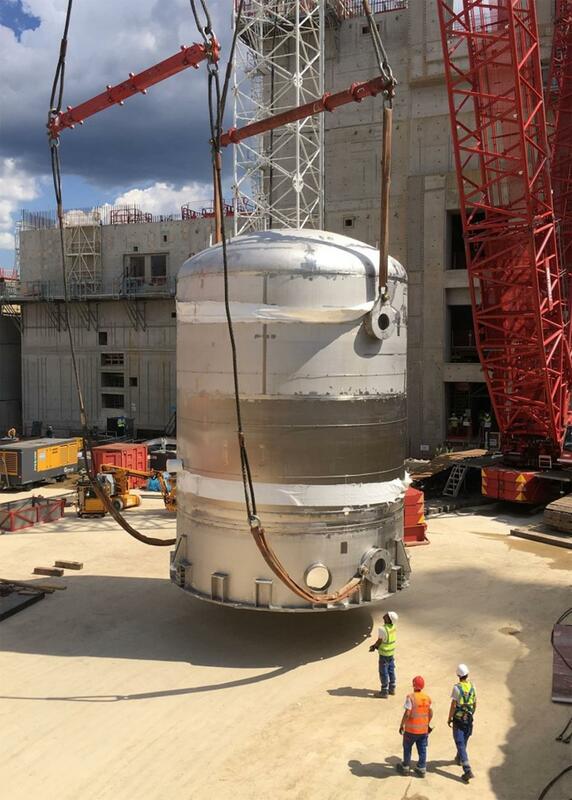 Part of the nuclear effluent drainage system, this 18 m³ tank is the first mechanical equipment to be lowered into the Tokamak Building. 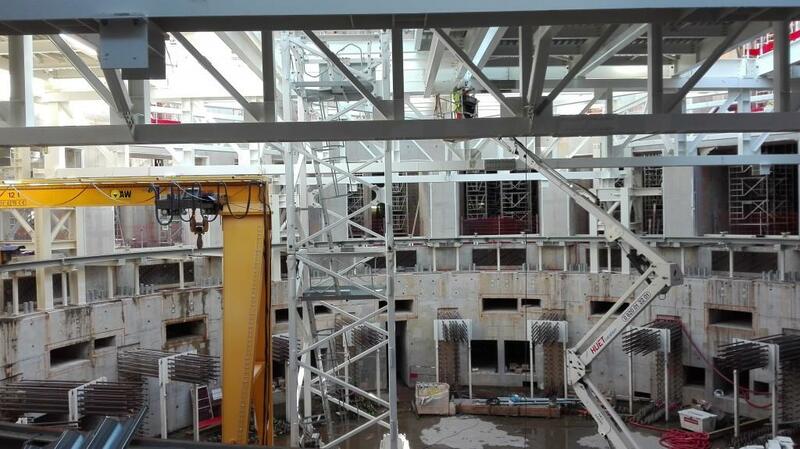 On the left, the B1 level basemat for the Diagnostics Building is in place and work has started on the inner partitions. 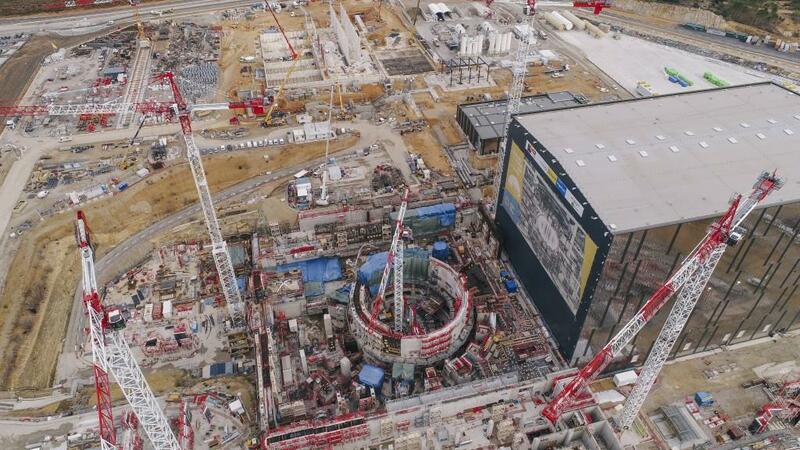 The part of the Tokamak Building B1 basemat that was realized on 26 April can be seen in the lower right of the frame. 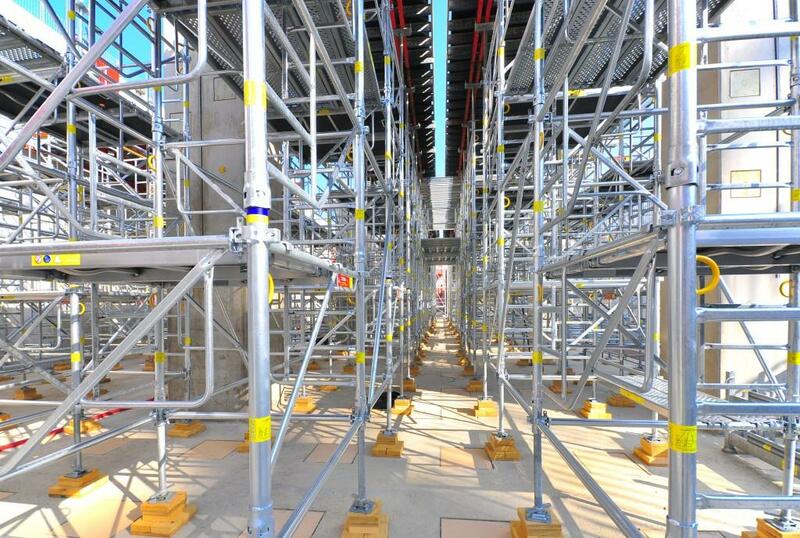 The B1-level walls of the Diagnostic Building reach the level of the platform. 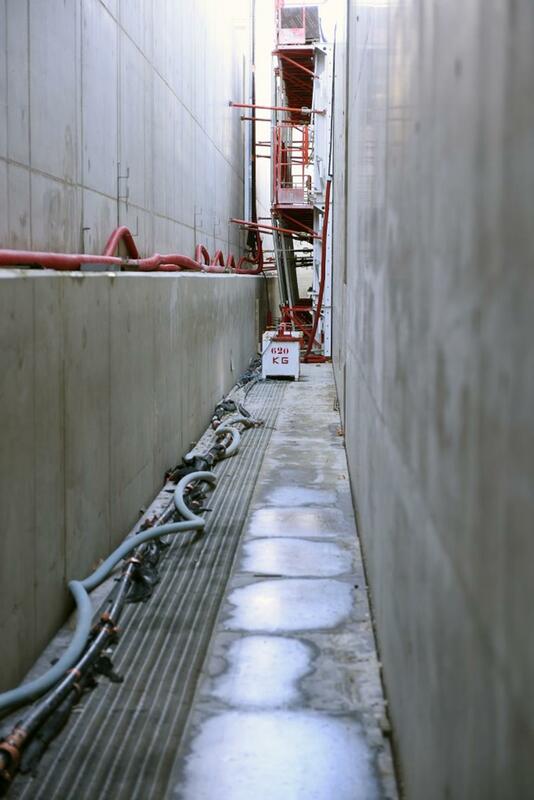 Visible to the right, the gap of approximately two metres that completely surrounds the buildings—a space that allows the buildings, on their basemat, to absorb ground motion in the case of an earthquake. 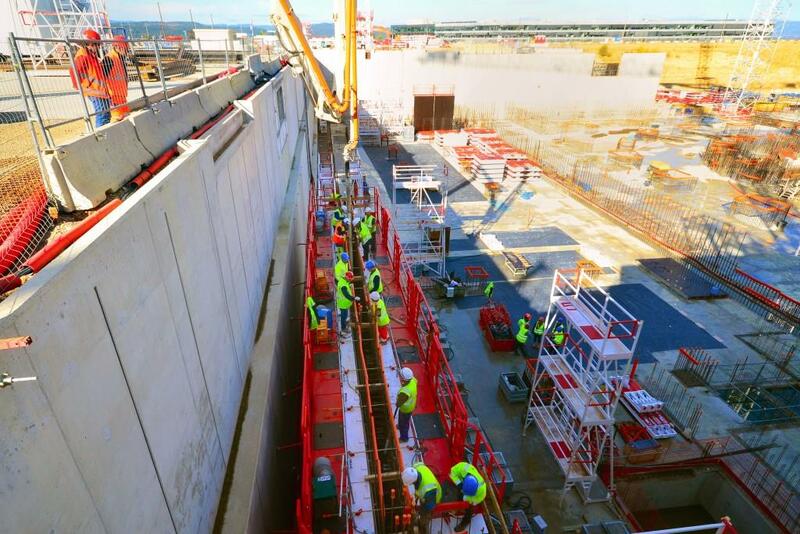 This spectacular angle for photography is about to be closed off as a temporary wall is progressively built between the Assembly Building and the Tokamak Pit. 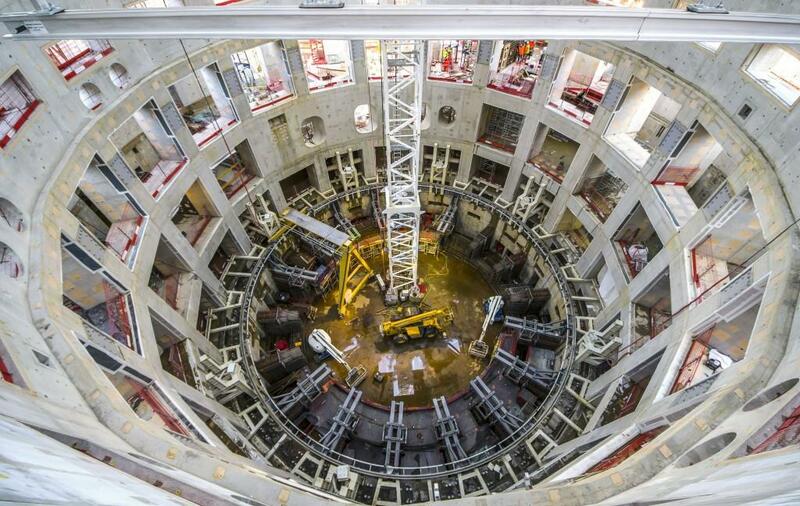 From the Assembly Hall, the view of the Tokamak Pit is exceptional. 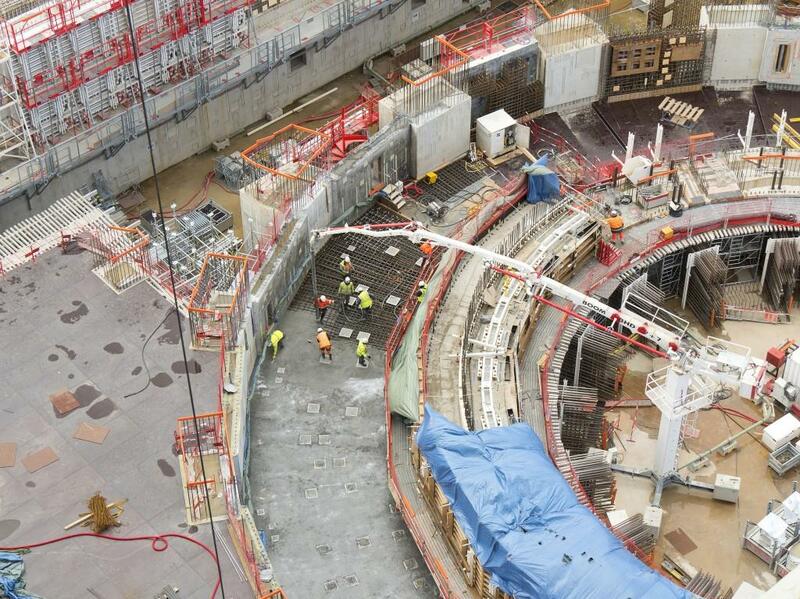 Workers are advancing on the B1 level (basement 1) of the Tokamak Complex. 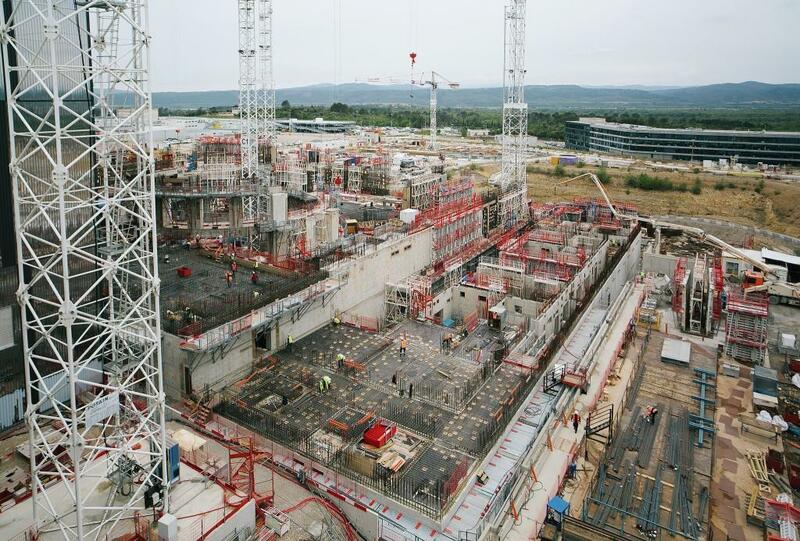 As the B2 basement level of the Tokamak Complex disappears under the reinforcement of the B1-level basemat, the central assembly area for the ITER machine (called the "Pit") becomes more and more visible—especially from a certain height. 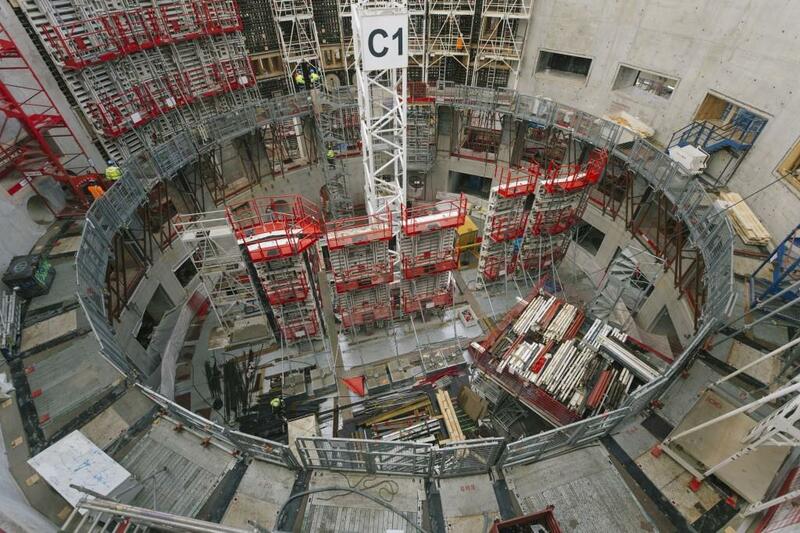 Concrete pouring for the B1 basement level of the Tokamak Building begins on Tuesday 26 April. 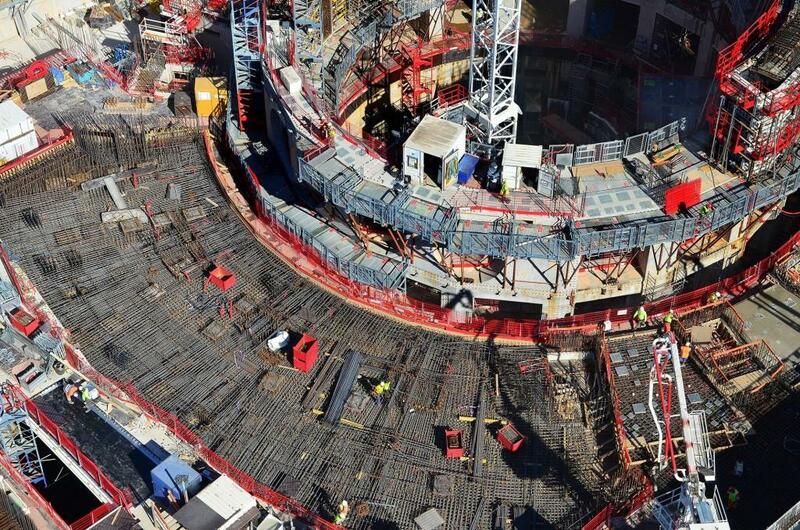 When the B1 floor (basemat) is in place, the construction of B1 walls will bring the Tokamak Complex flush with the level of the platform. 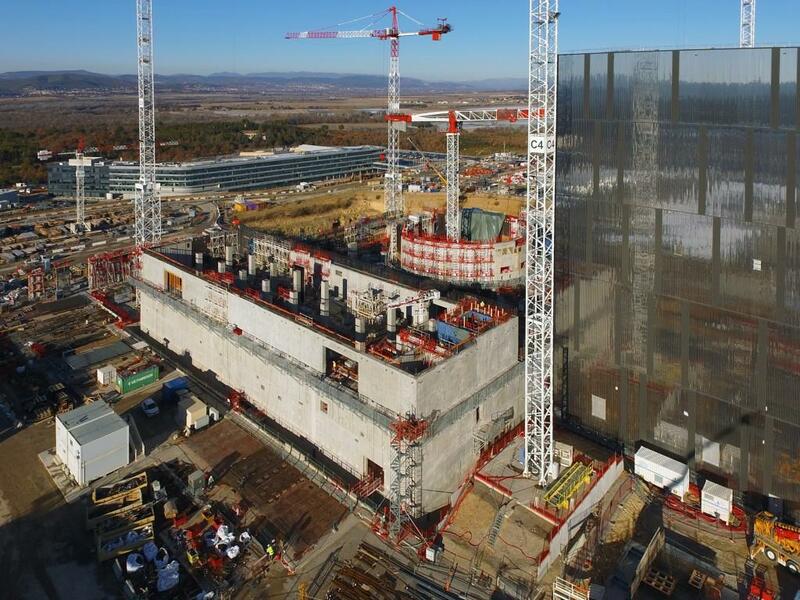 Some 540 cubic meters of concrete are employed in filling a 750 square-metre area (plots 4 and 5) for the B1 basemat of the Tokamak Building. 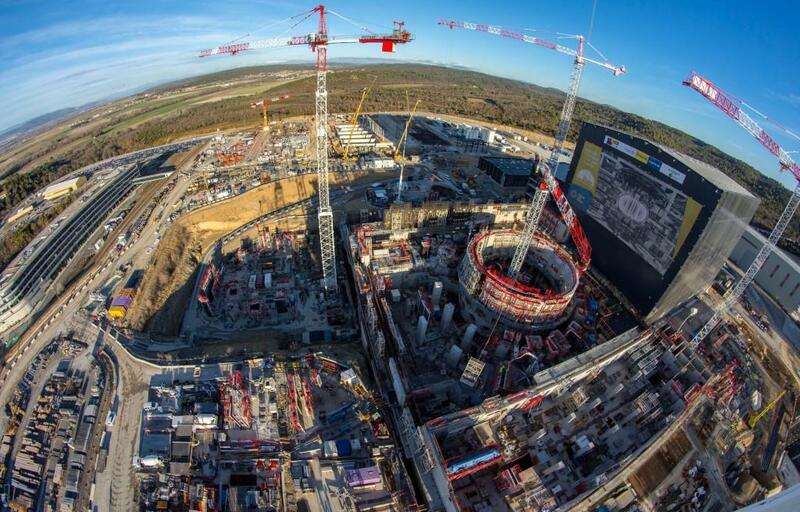 Metrology activities are contributing significantly to the success of Tokamak Complex construction operations. 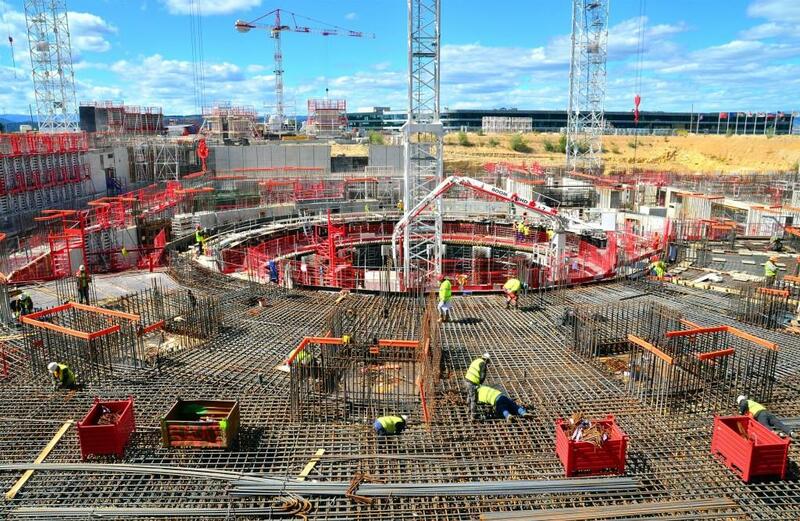 While just outside the frame to the right workers are starting on the first concrete pour of the Tokamak Building, another team puts the finishing touches on the rebar of the central segments. 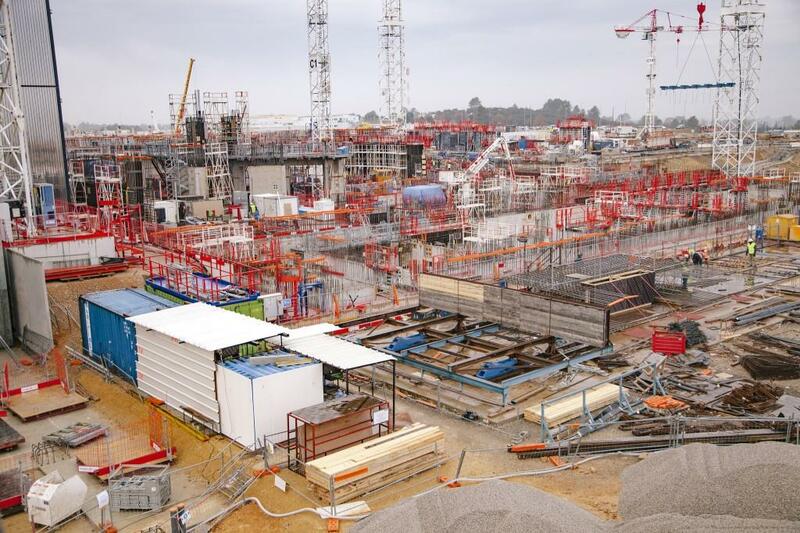 Pouring will resume in May. 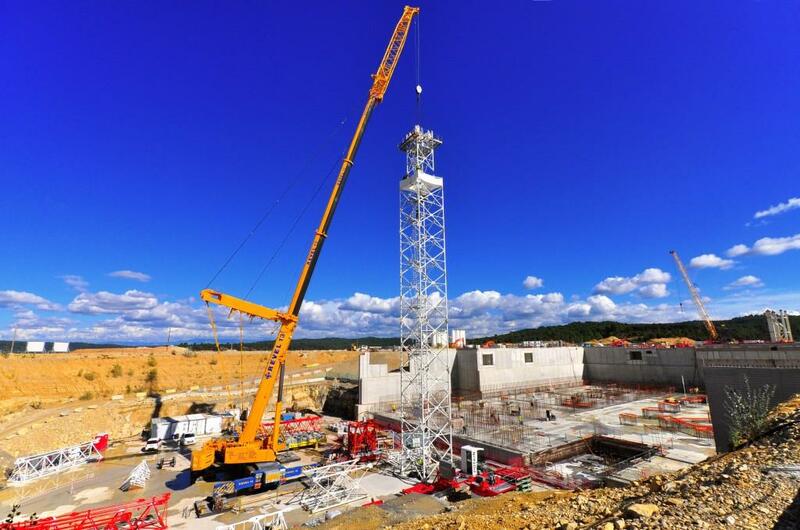 Progress on the ITER site relies on finely tuned logistics. 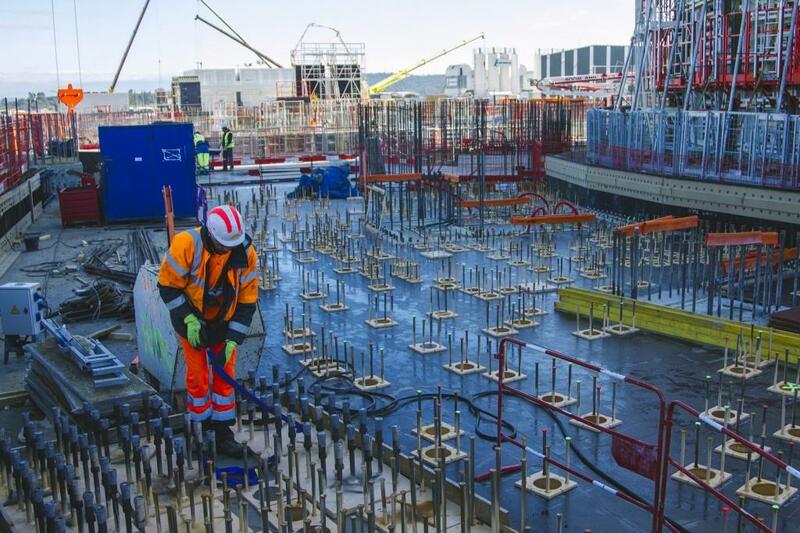 As concrete mixer trucks rush to the cryoplant worksite, every inch of ground surrounding the Tokamak Pit seems to be occupied by stacks of embedded plates, formwork equipment and steel rebar. 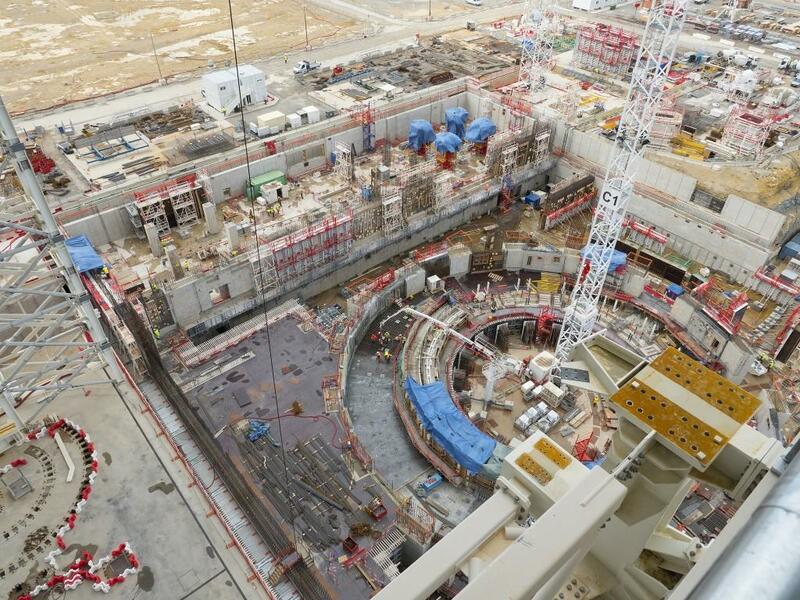 The installation of rebar installation is progressing on plot #2 of the Tokamak Complex (B1 level) at the right side of the photo. 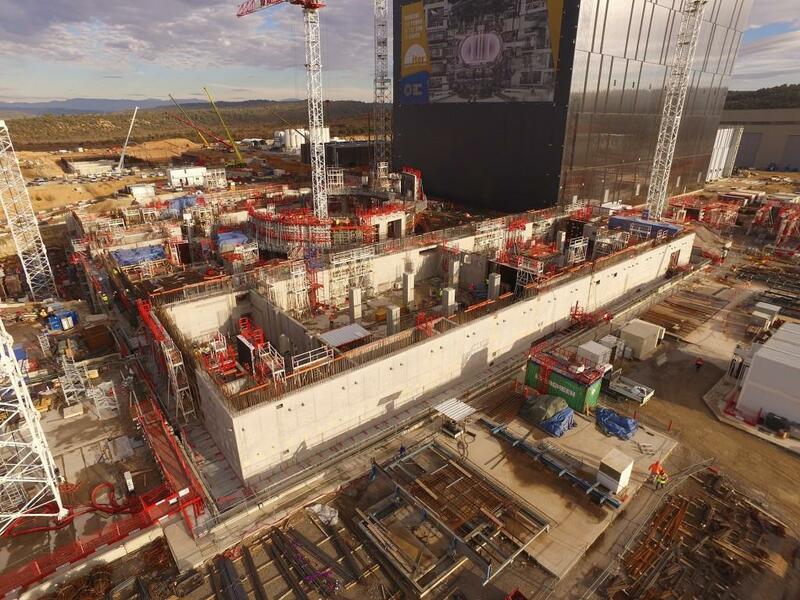 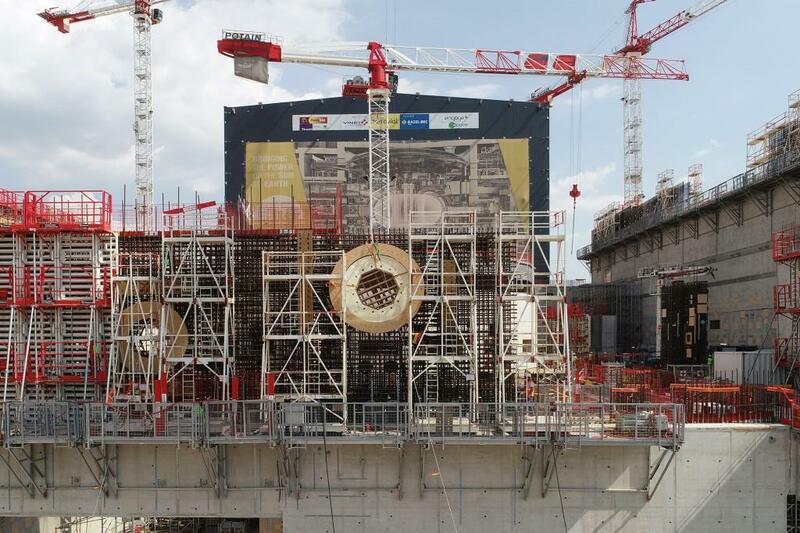 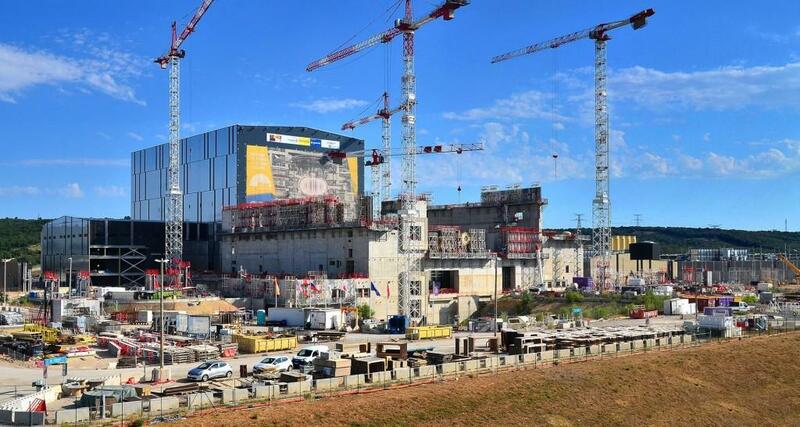 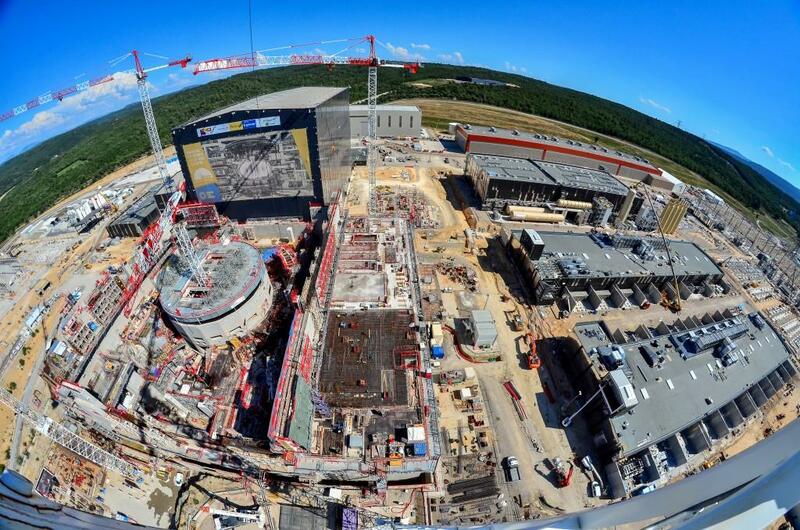 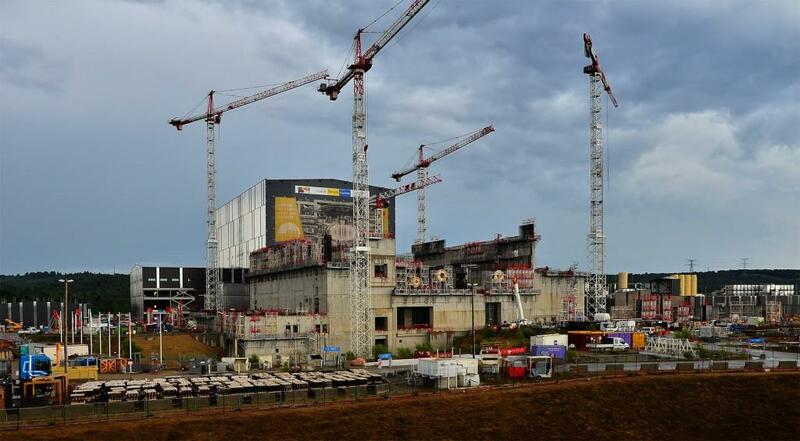 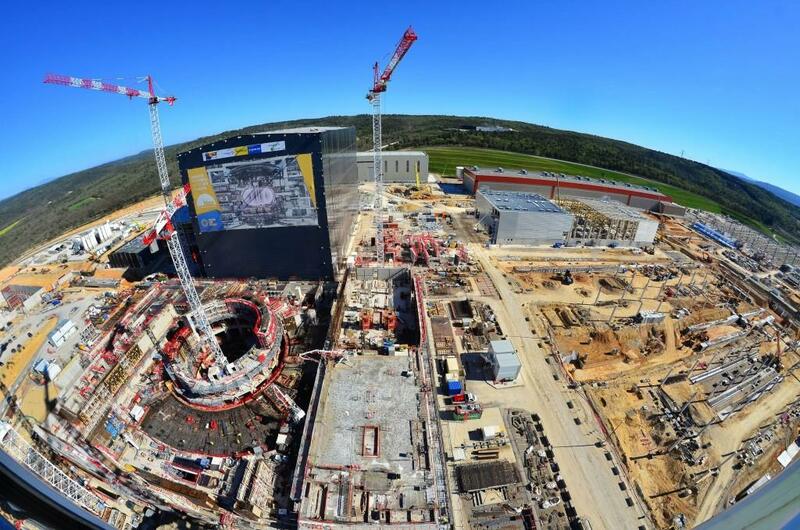 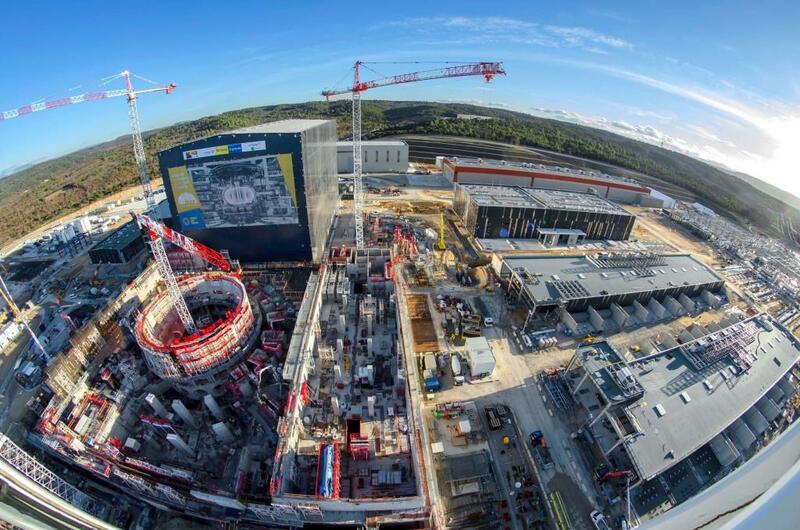 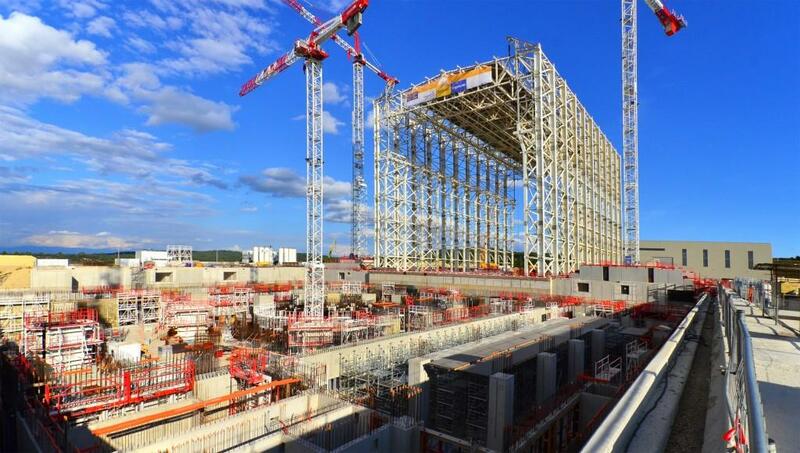 The completion of this second basement level will bring the Tokamak Complex flush with the ITER platform. 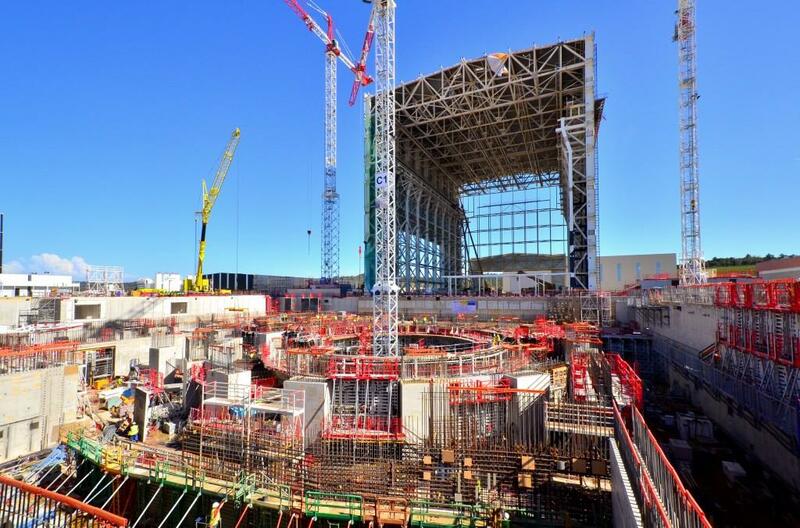 The workforce involved with Tokamak Complex construction is set to increase significantly in the next three months. 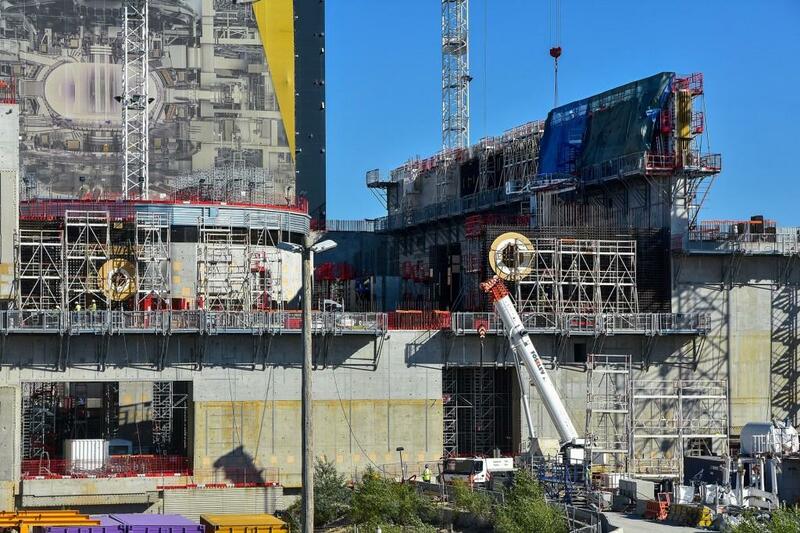 Some 40 formworkers and close to 100 rebar specialists will be added to the teams presently working on the bioshield and the B1 level. 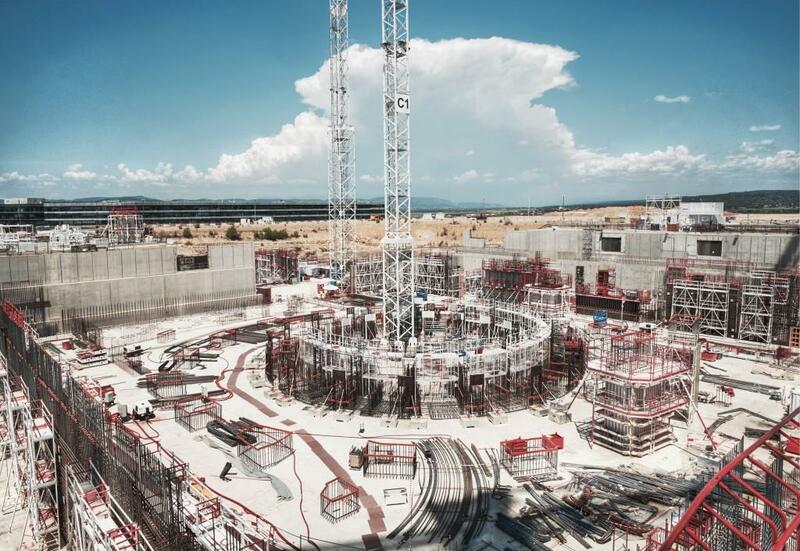 Concentric circles of metal and cement surround the space reserved for the ITER Tokamak where, for now, only the central crane stands. 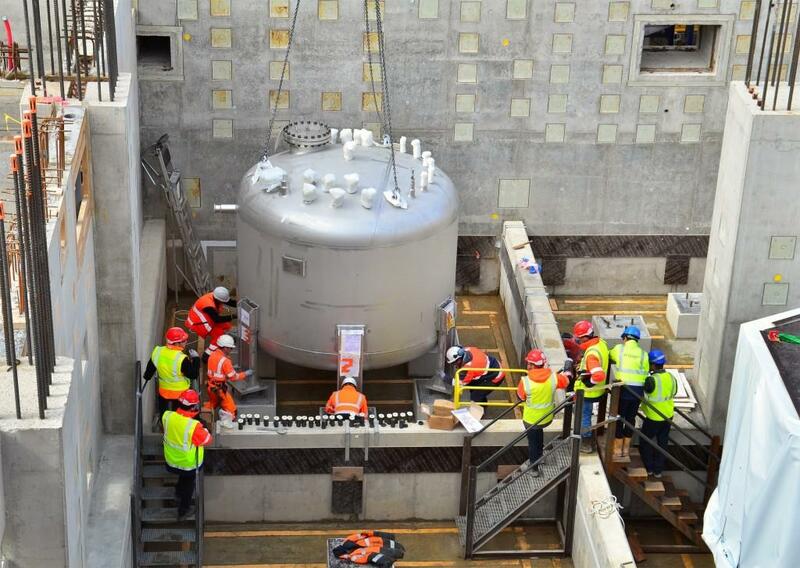 The first of six water detritiation tanks was installed on 29 March in the lowest basement level (B2) of the Tritium Building. 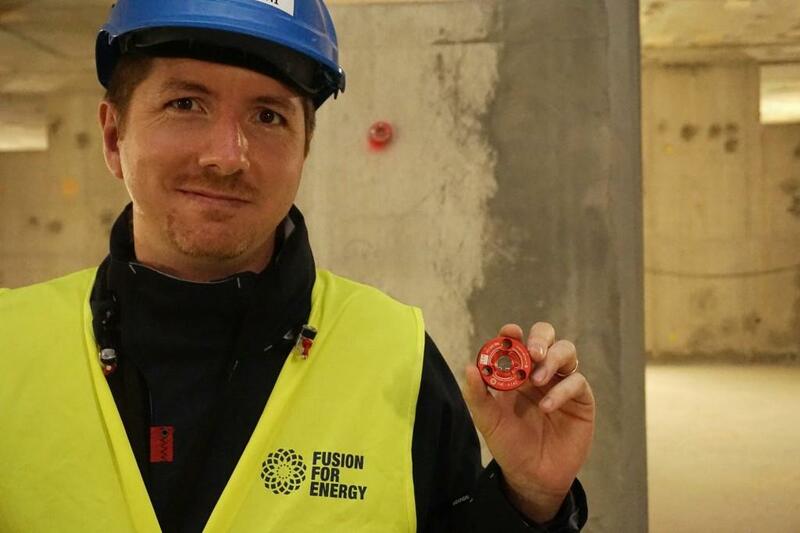 This is the very first component to be installed in the Tokamak Complex. 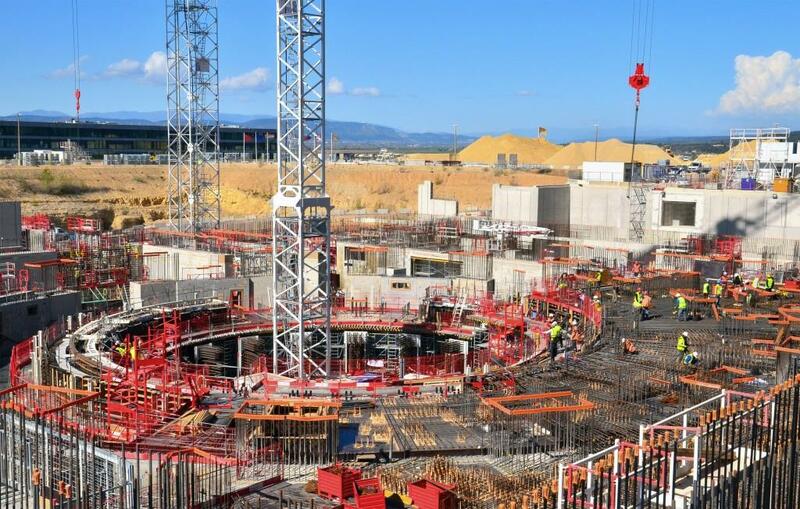 Six metal tanks supplied by Europe will be installed in the Tritium Building for ITER's water detritiation system. 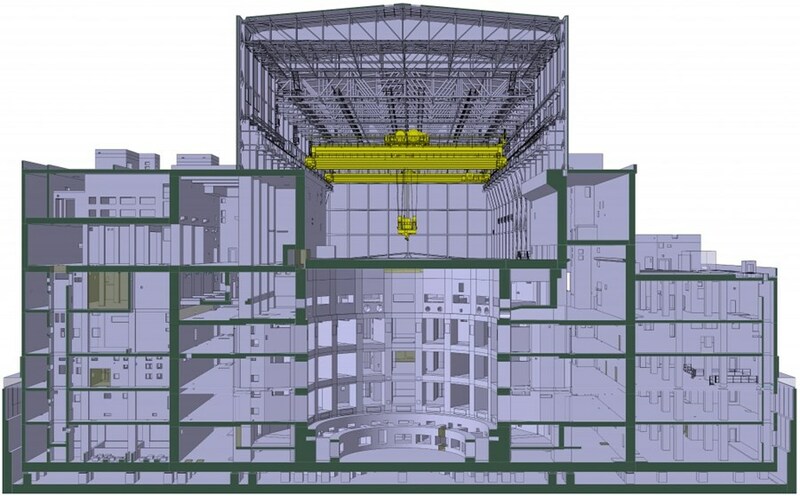 To the right of the photo, work on the B1 basement level of the Diagnostics Building advances, bringing the structure flush with the ITER platform. 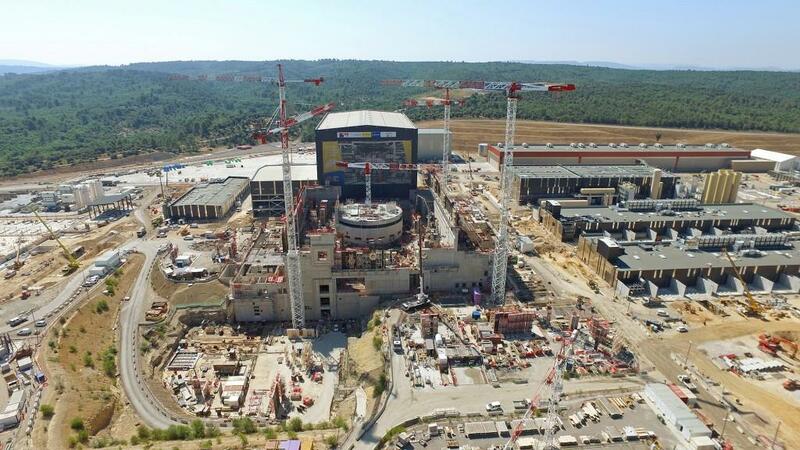 When all Tokamak Complex civil work is done, only the centre of the area will remain accessible for the assembly and installation operations of the ITER Tokamak. 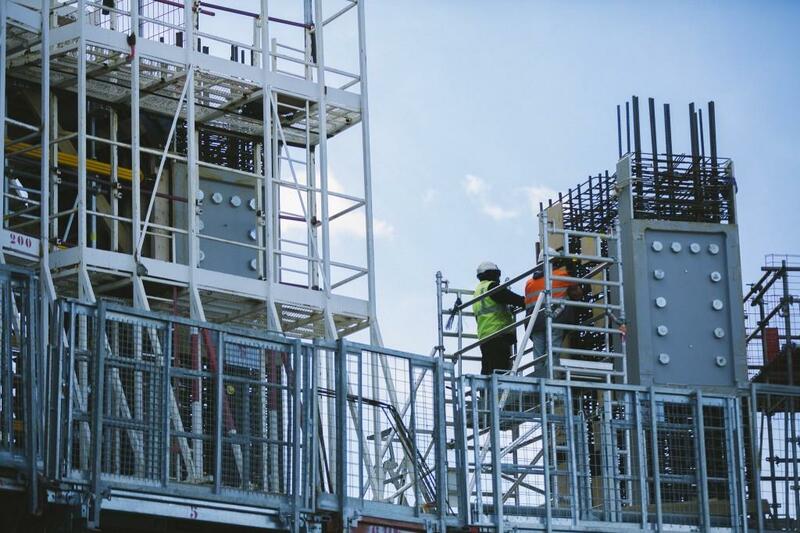 The pre-installed squares that are noticeable on the vertical reinforcement are embedded plates, designed to provide robust anchorage for Diagnostic Building equipment. 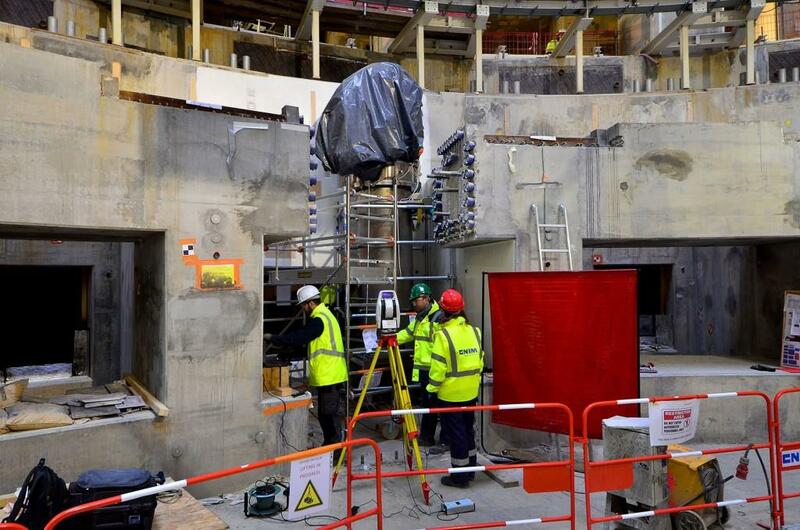 In the Diagnostics Building, basement level one (B1) now has a floor and work is underway on the propping for the walls. 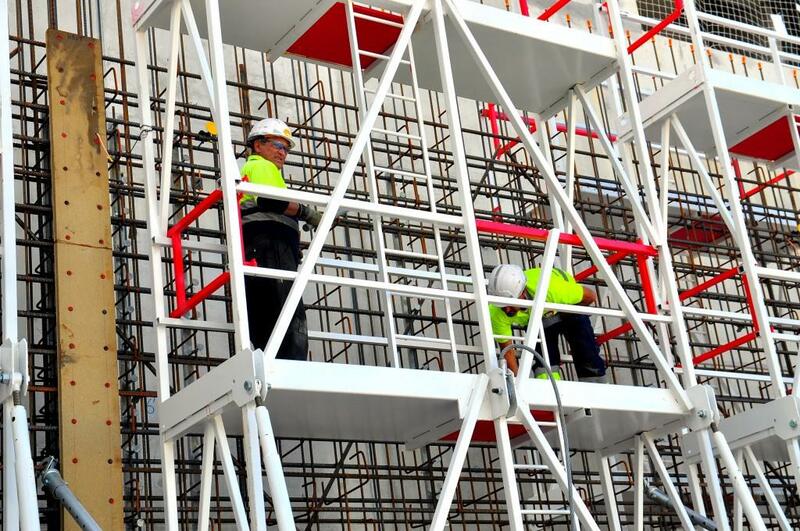 On top of the first circle of bioshield, work is now underway on the skirts and plates of the next level. 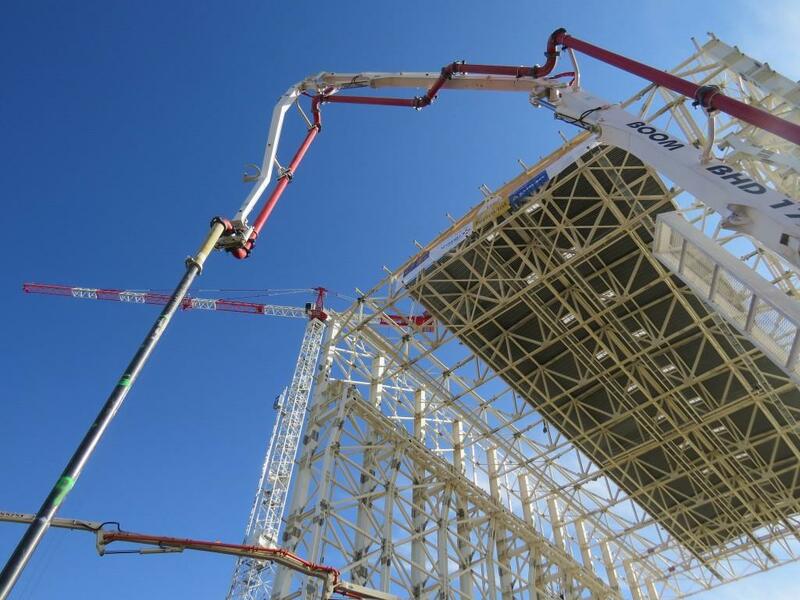 A mockup has been created on site to validate the procedures of this second-step pour. 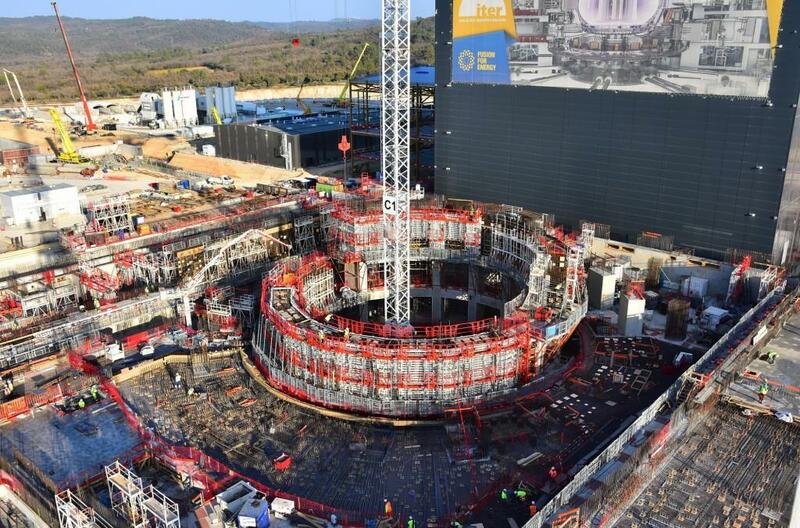 The second pour for the ITER bioshield took place on 20 January—now the full ring is in place at the lower level. 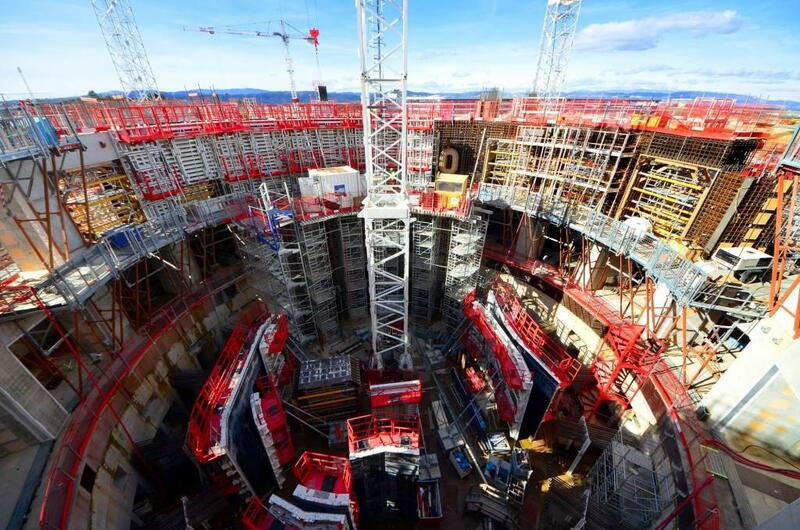 In the centre of the Tokamak Pit, the walls of the Tokamak Building are rising—the east, west and south sides have been poured at the B2 (lower basement) level and 70 percent of columns are in place. 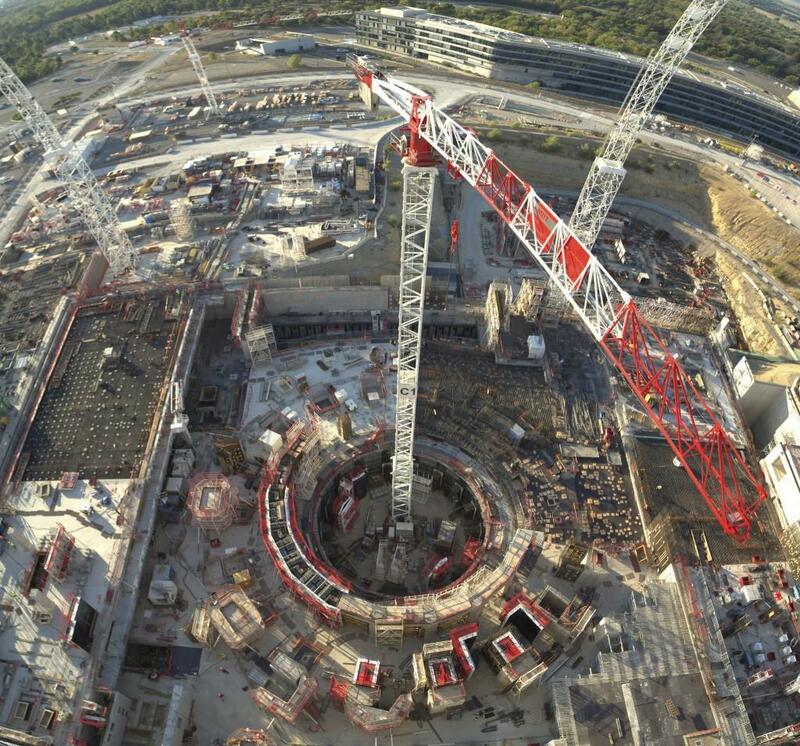 B1-level civil works will start in the Tokamak Building during the first quarter of 2016. 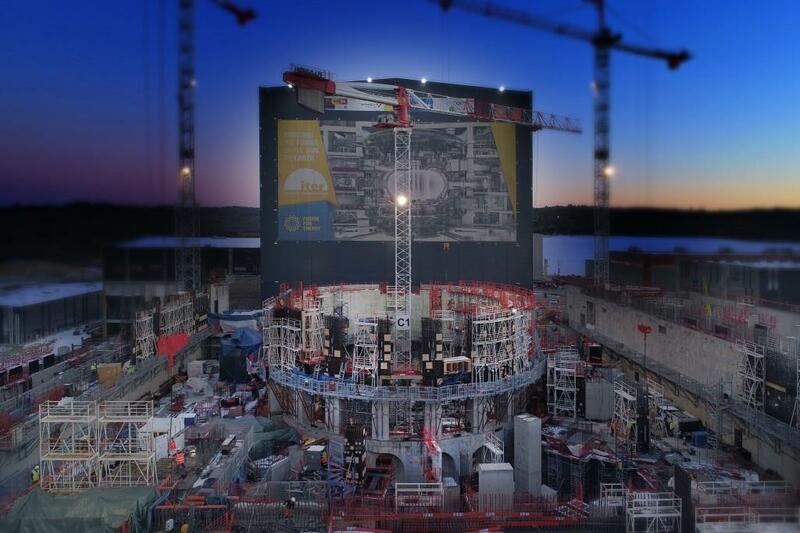 In December lights stay on late in the Tokamak Pit, where the last shift leaves off at 10:00 p.m. 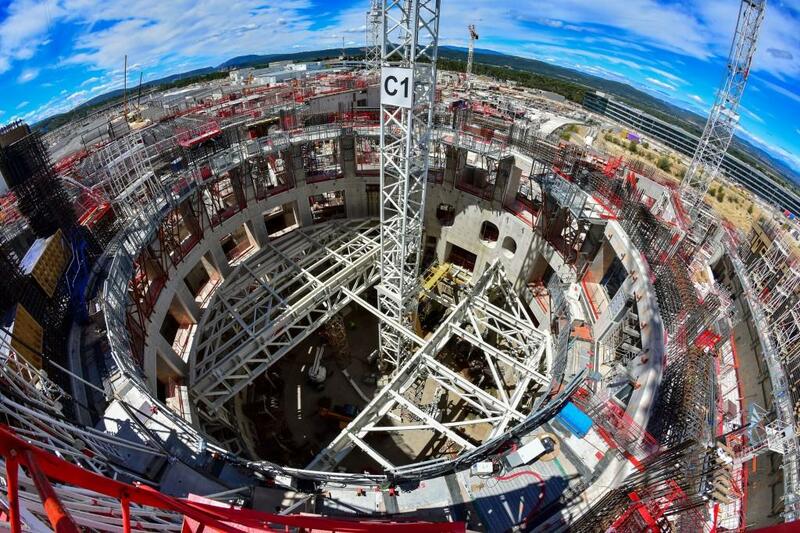 Concrete pouring on the second level of the Tokamak Complex will begin in early 2016. 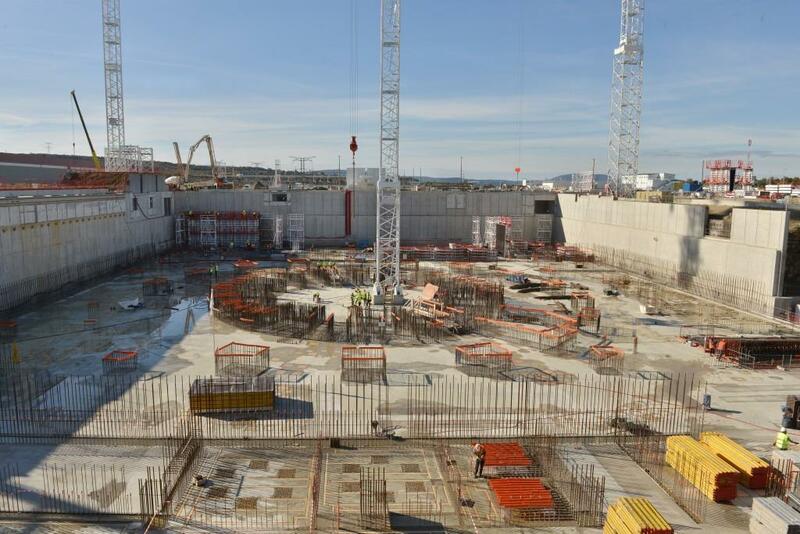 Reinforcement activities on basement level 1 (B1) of the Tokamak Complex get underway in November. 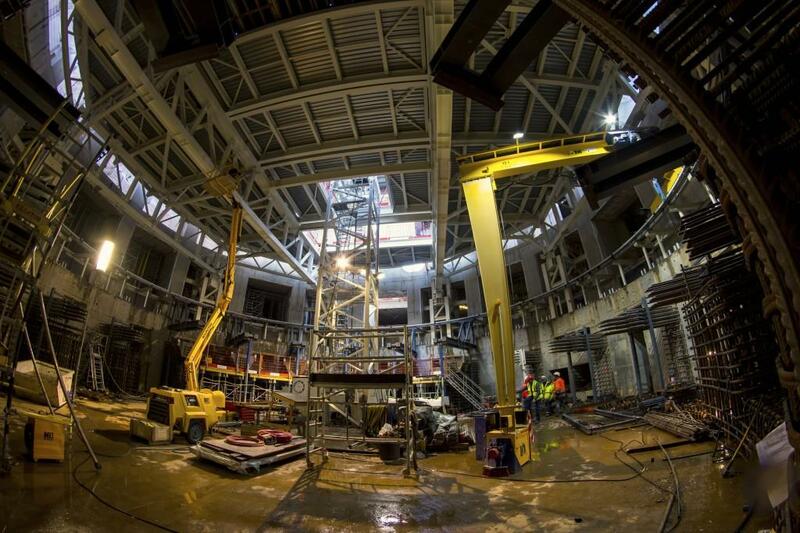 Work is advancing on the Tokamak Complex in two 8-hour shifts. 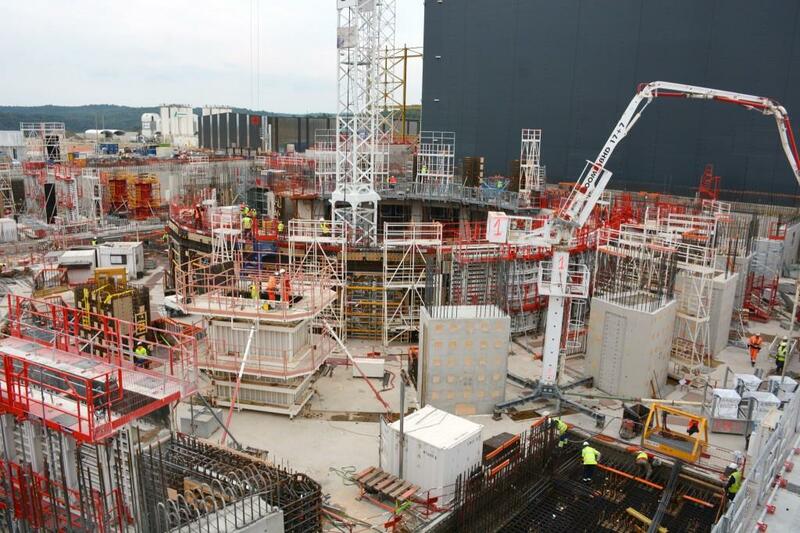 On the northernmost end of the Tokamak Pit, the final walls and pillars are being poured for the Tritium Building. 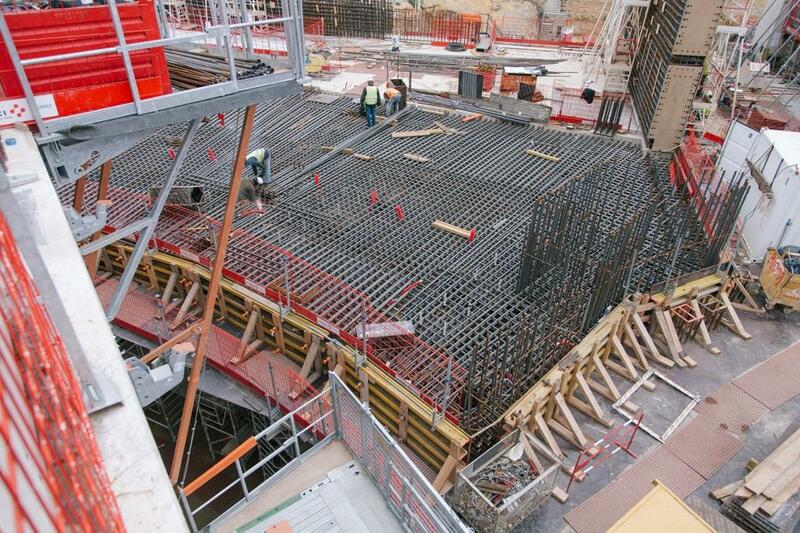 Wooden formwork and rebar lattices now completely cover the lower level of the Diagnostic Building. 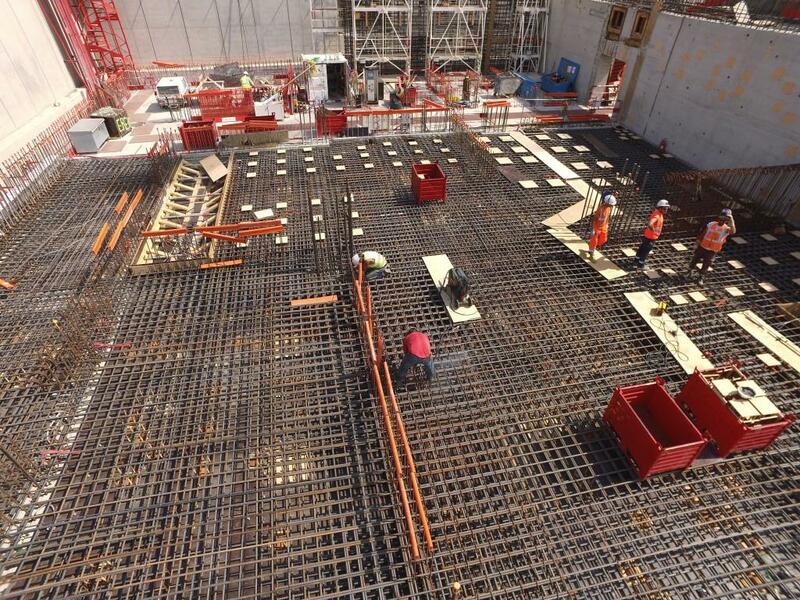 The first concrete slab for the B1 level of the Diagnostics Building has been poured. 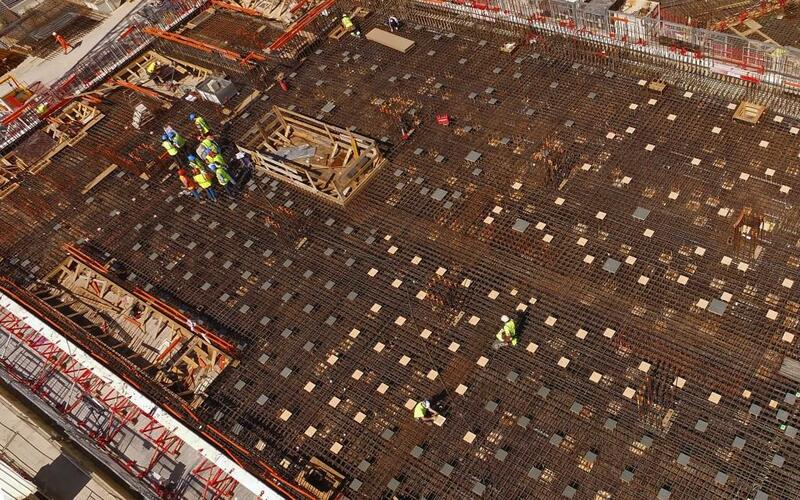 In light grey, we can see the poured bioshield concrete—a segment of 200 degrees. 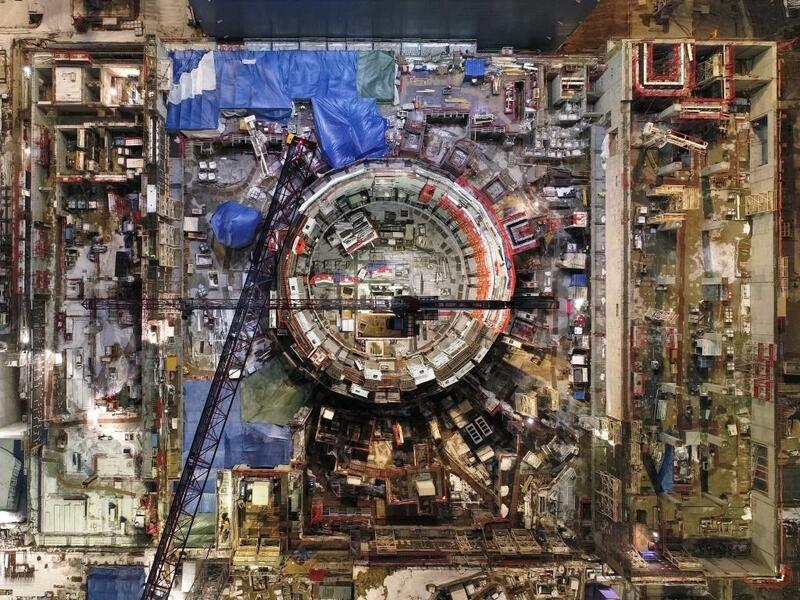 It will take 28 days to dry completely. 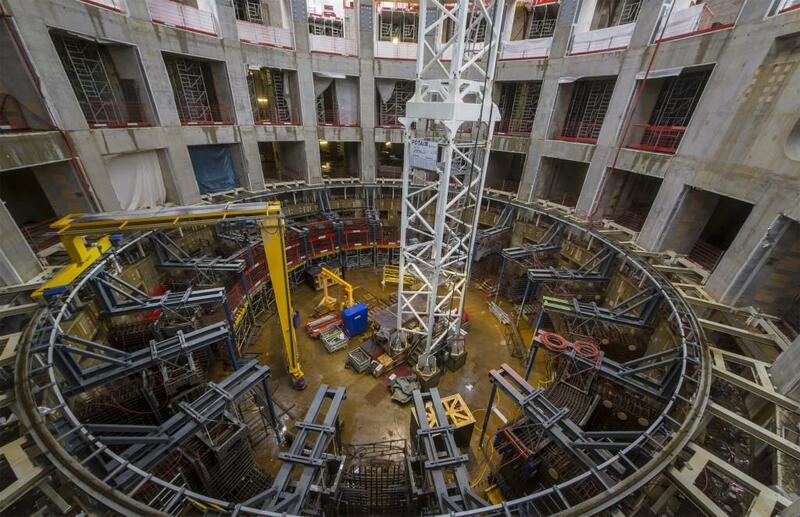 Work is underway on the second basement level of the Tokamak Complex (B1). 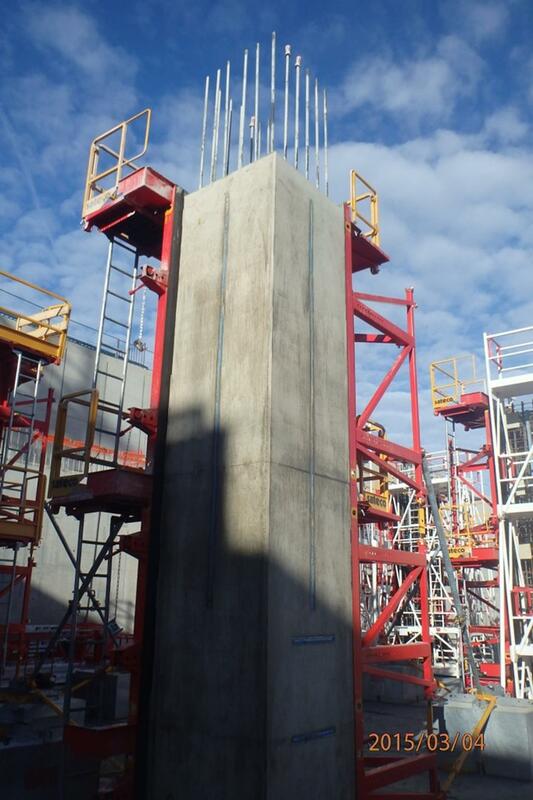 Pictured, the installation of propping and formwork for the Diagnostics Building. 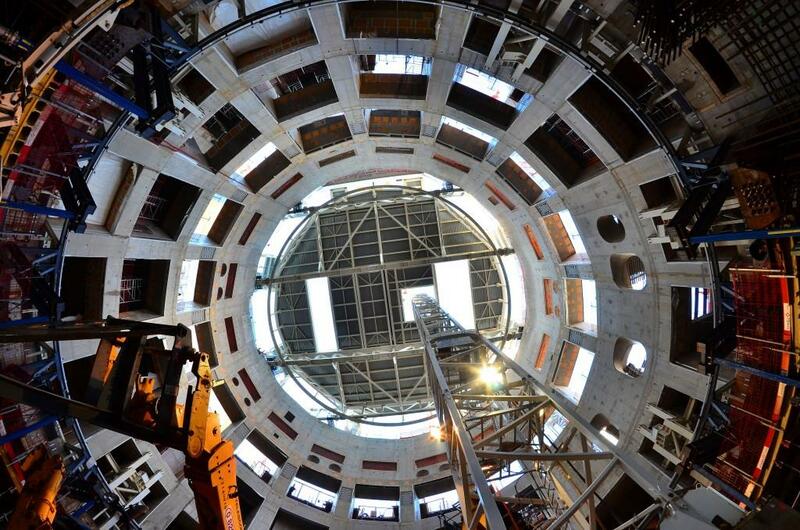 Under the vast structure of the Assembly Building the visitors seem ... very small. 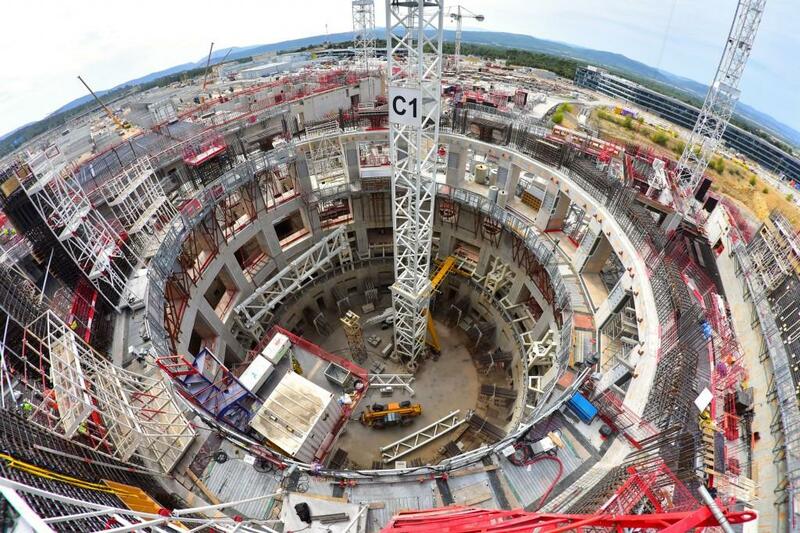 They stand on the edge of the Tokamak Pit, where pouring activities are underway on the lowest basement level of the Tokamak Complex. 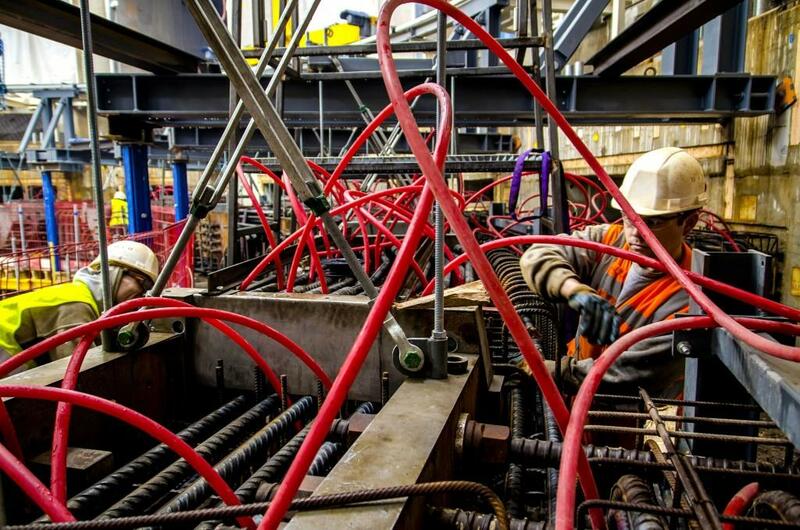 Plastic caps of many colours protect the couplers that ensure the vertical continuity of the bioshield's steel reinforcement. 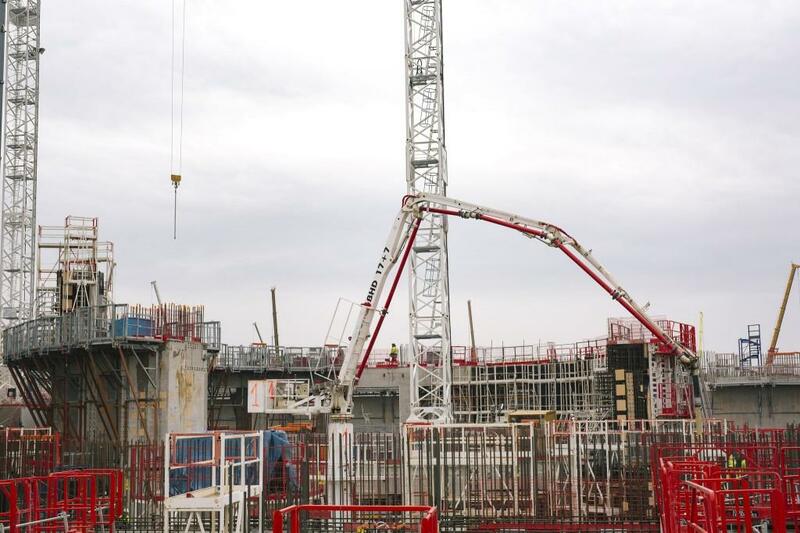 Pouring will take place in two phases: first a lower segement, then an upper segment (propping is visible between the two). 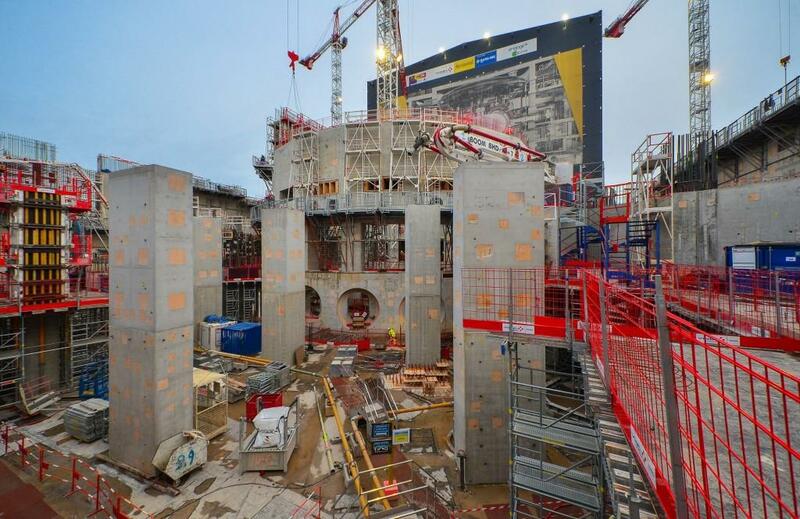 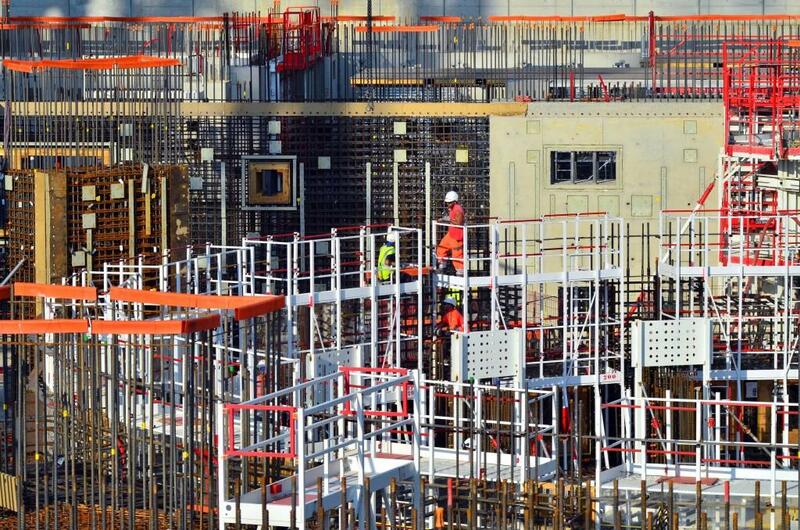 Between the 18 massive columns that provide structural support to the different levels of the Tokamak Complex, walls will be made of a special, high-density concrete (3.9 tonnes per cubic metre as compared to 2.5 tonnes for regular concrete). 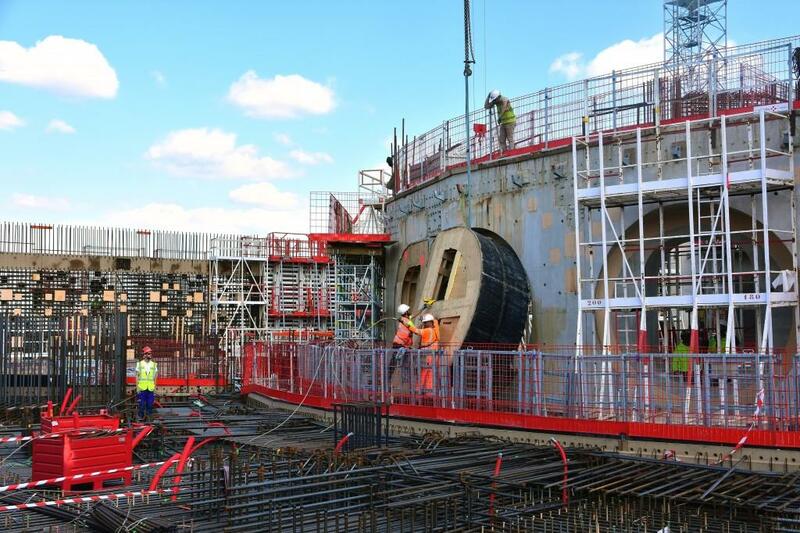 Work to install the rebar of the 3.2-metre-thick bioshield was carried out from April to September 2015. 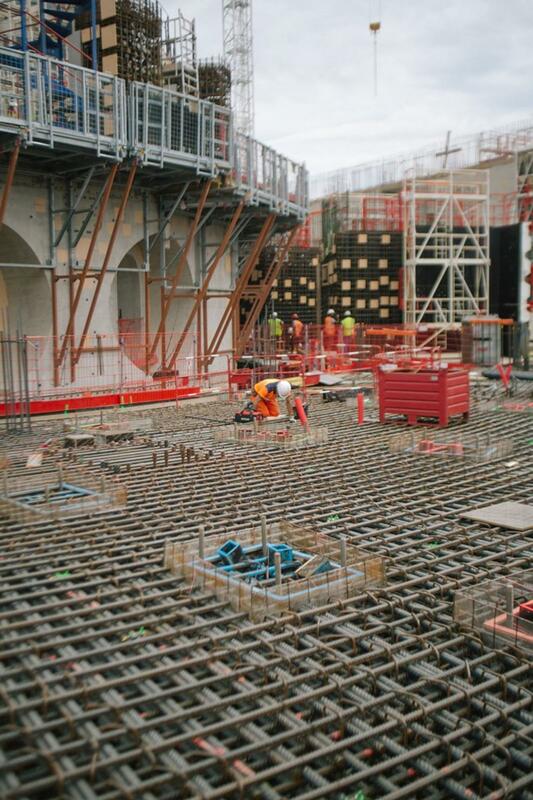 Pouring activities are about to begin. 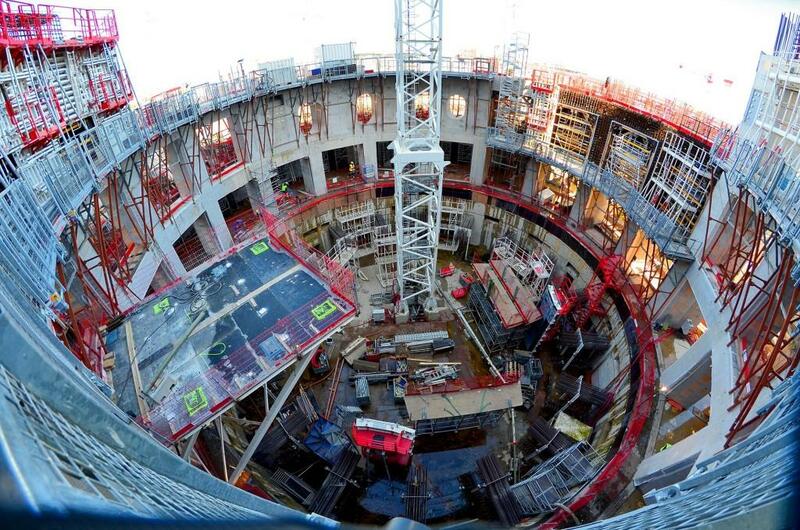 In the centre of the Tokamak Pit, concrete pouring for the columns has ended. 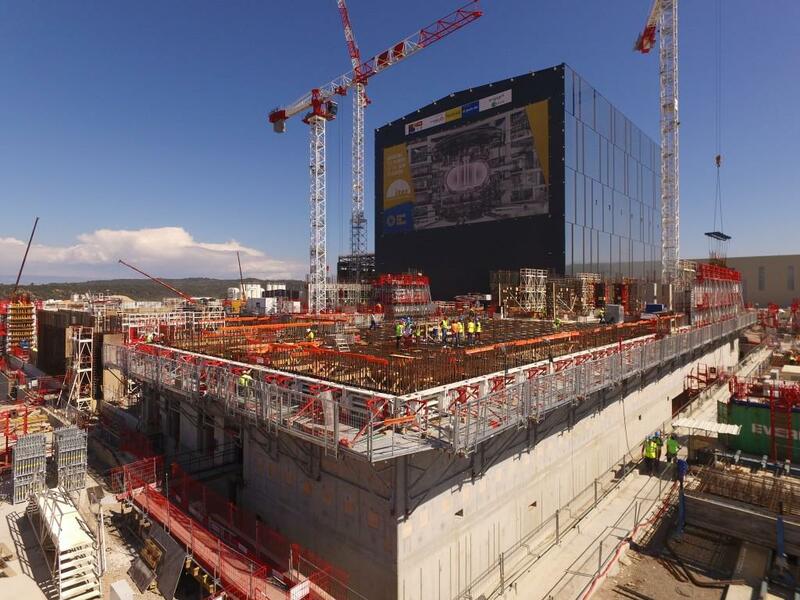 Work to pour the ITER bioshield begins in October. 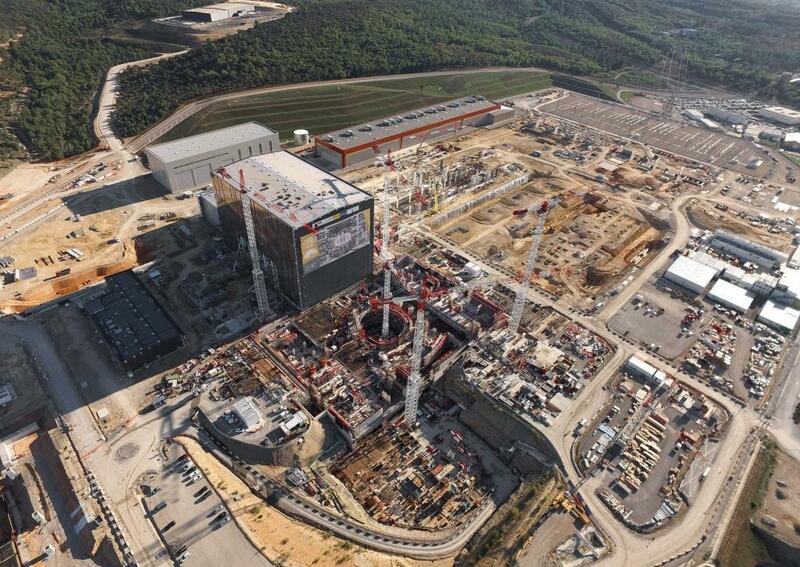 One day, the Tokamak Building (under construction, foreground) will be as high as the just-topped Assembly Building. 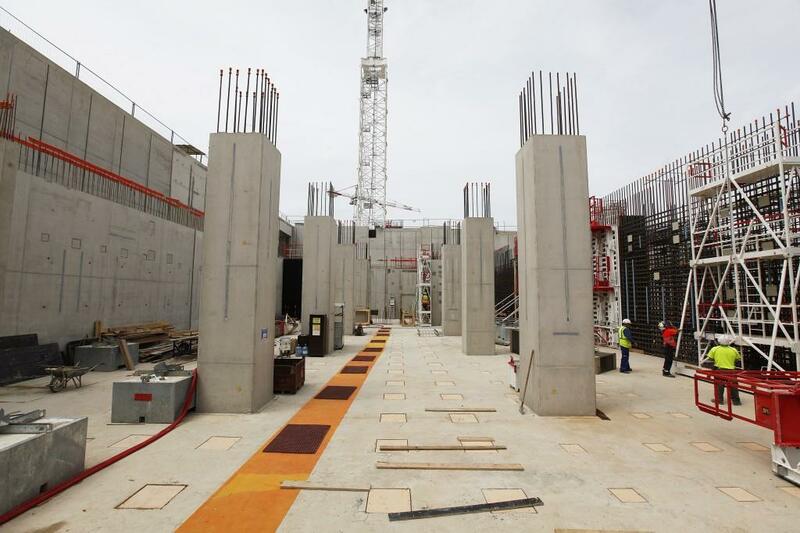 These massive columns will support the B1 (basement 1) level of the Diagnostic Building. 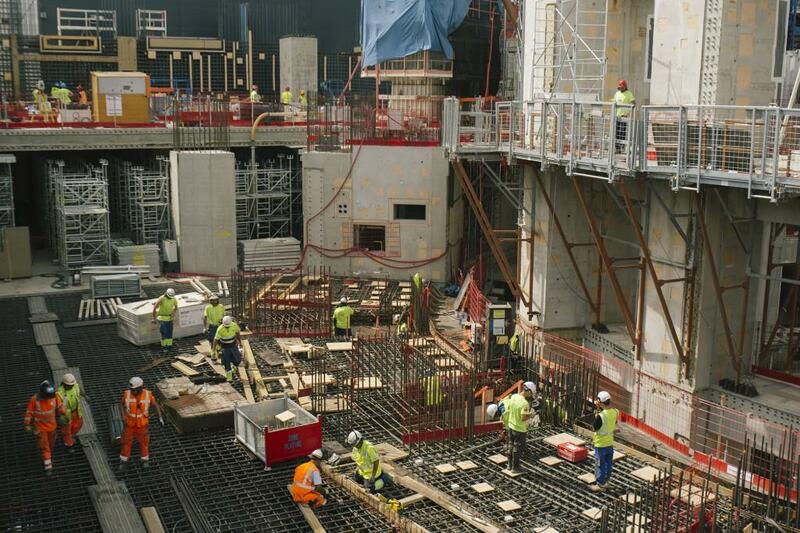 On the Tritium Building site of the worksite, workers have completed the concrete pouring for the external wall. 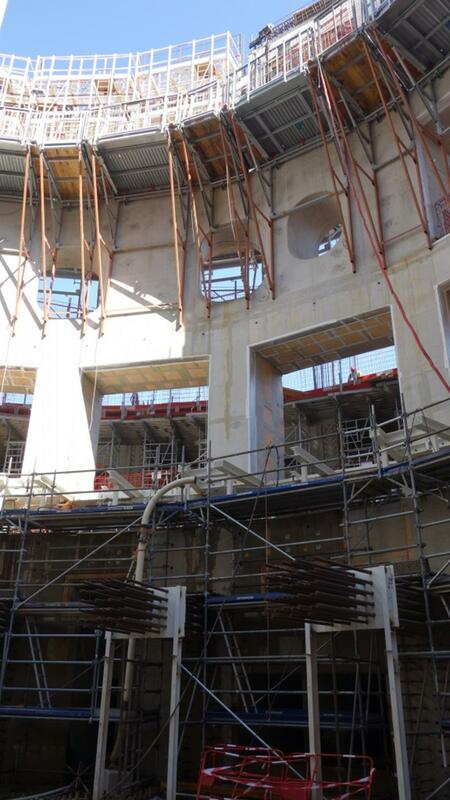 Work continues on interior walls and columns. 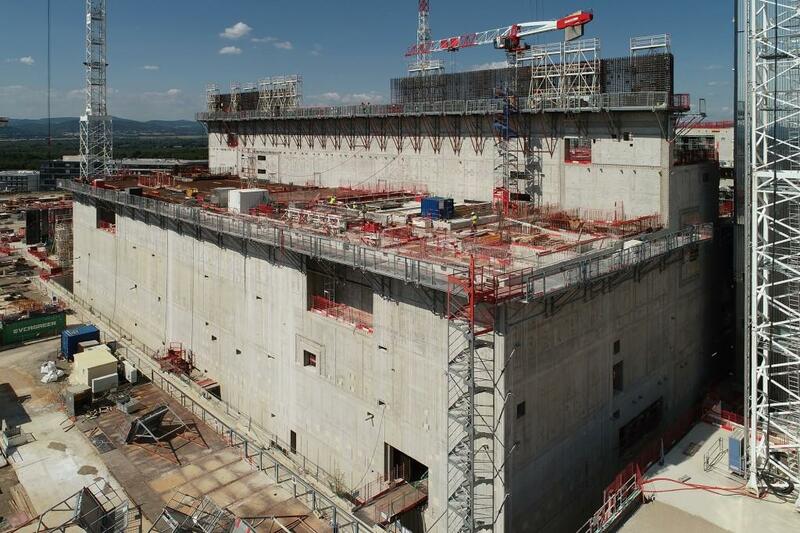 The white scaffolding marks out the ITER bioshield, a three-metre-thick concrete wall that will surround the tokamak and cryostat. 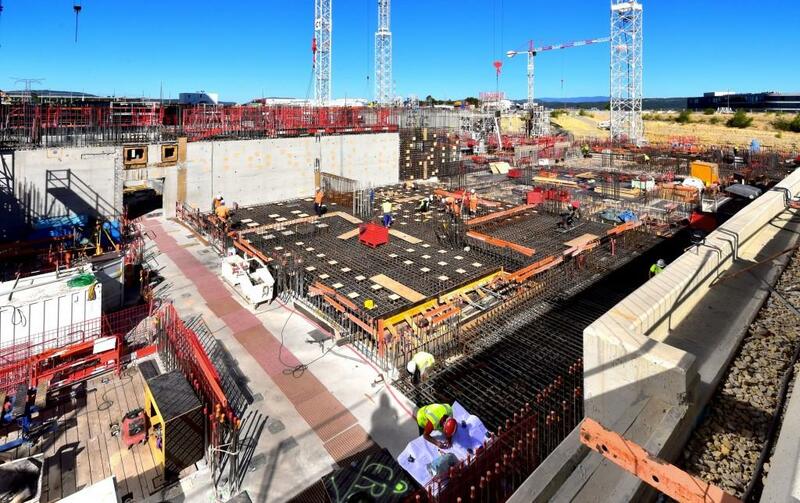 A milestone was met in July when propping and formwork operations got underway for the next basement level of the Tokamak Complex. 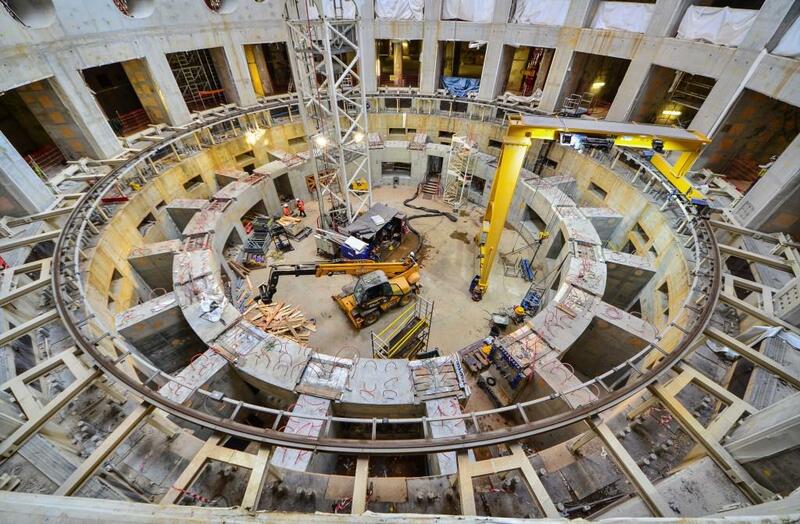 Looking into the Tokamak Pit from the south rim. 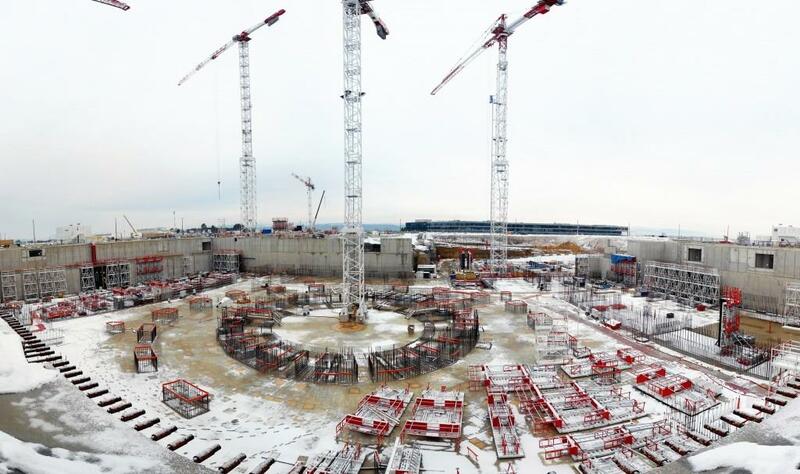 It's easy to see where Tokamak assembly will take place in a few years. 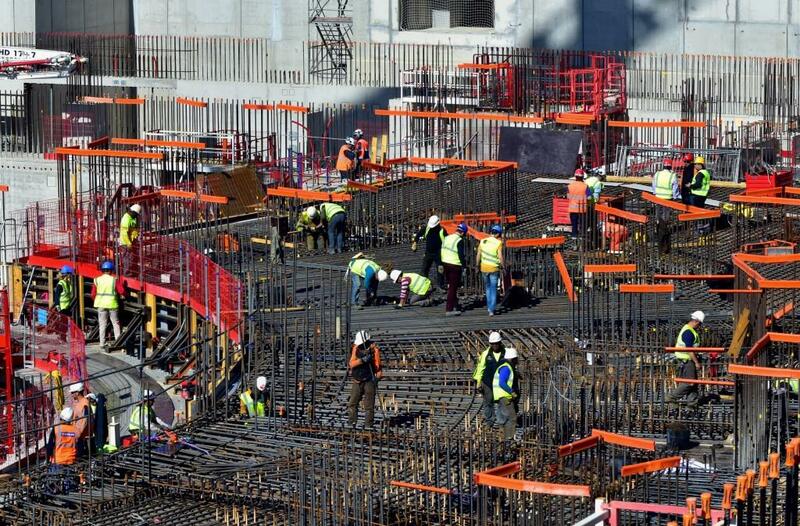 In the Diagnostic Building area, workers have started to install formwork for the next-level floor. 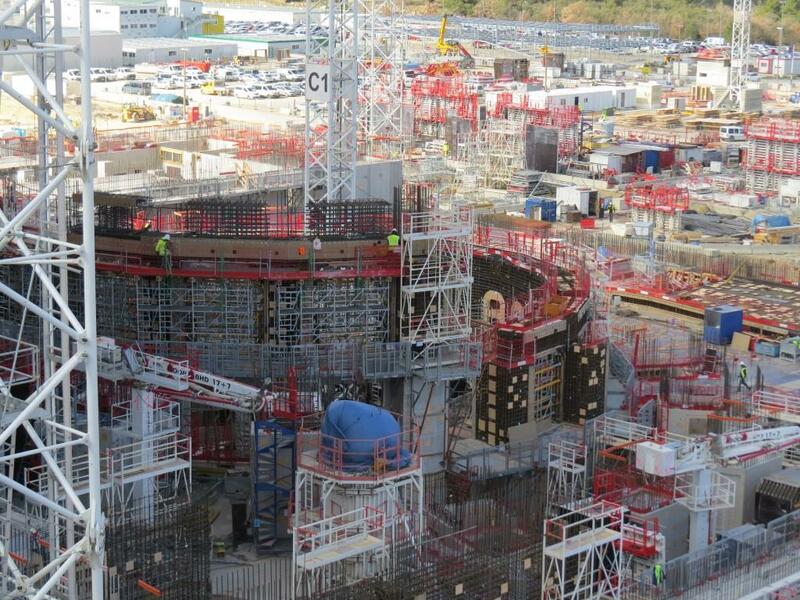 B2-level wall emerge on the Tritium Building side of the Tokamak Pit. 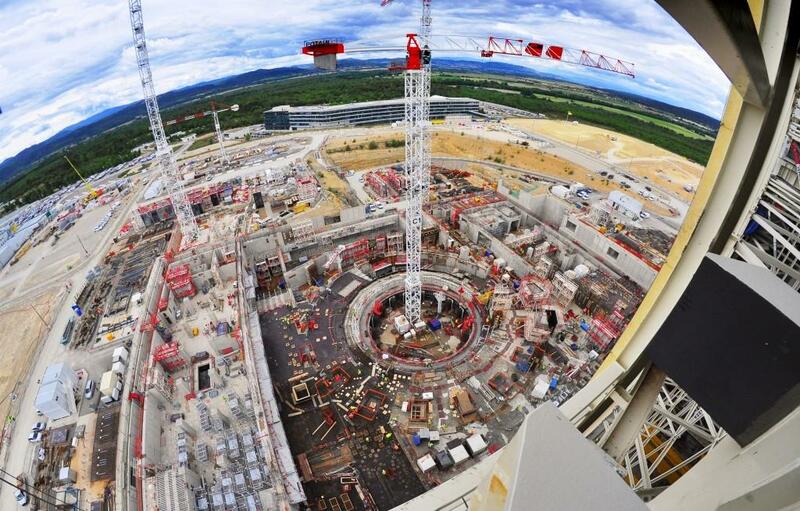 A fisheye lens allows the full breadth of the future Tritium Building (foreground) to be captured in a photo. 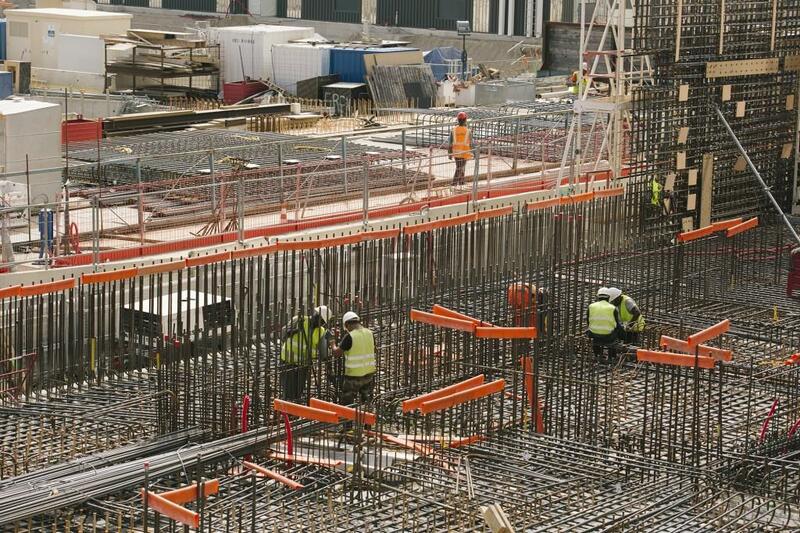 The construction of pillars and walls for the B2 basement level is advancing. 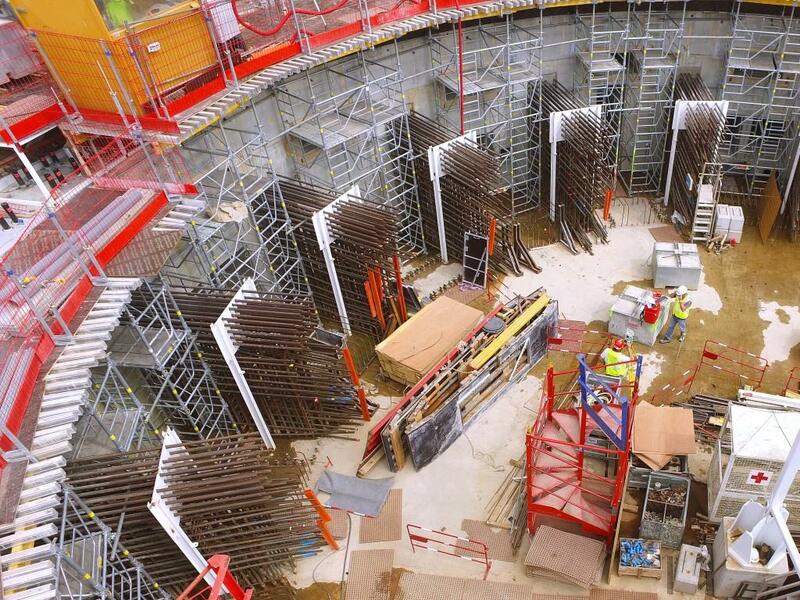 Looking down into the Tokamak Pit where the B2-level walls and columns are progressively taking shape. 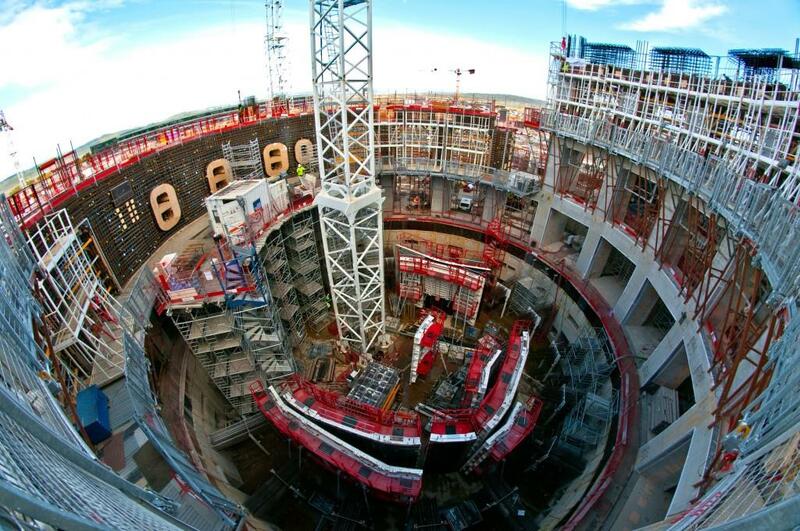 Each level of the Tokamak Complex civil structure should take about six months. 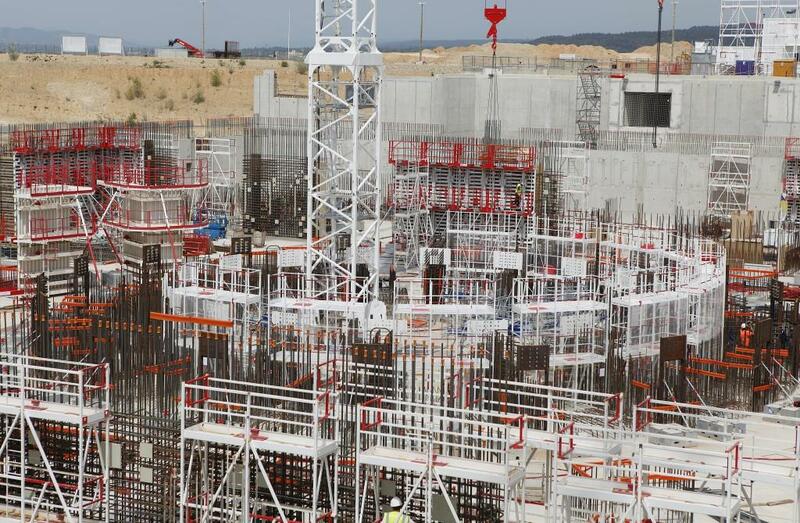 In the foreground, the area excavated for the future ITER Hot Cell is used to store, and pre-assemble, the materials used for wall construction. 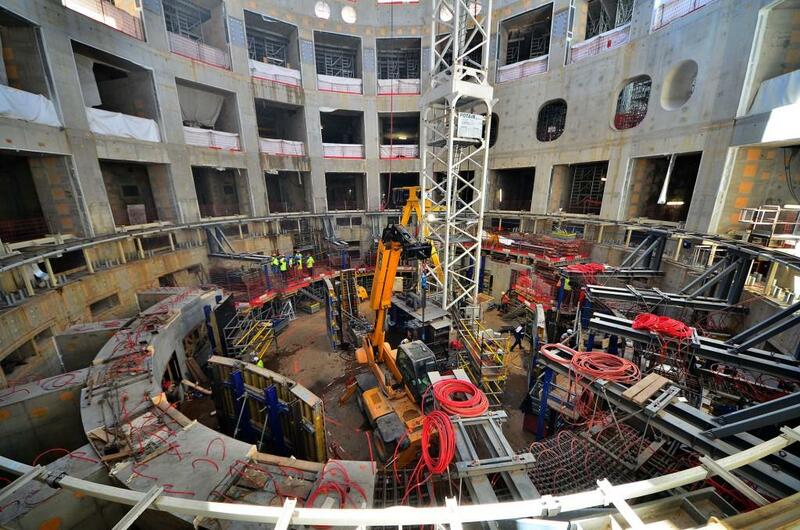 In the Tokamak Complex Seismic Pit, work on the lowest basement level (B2) progresses well. 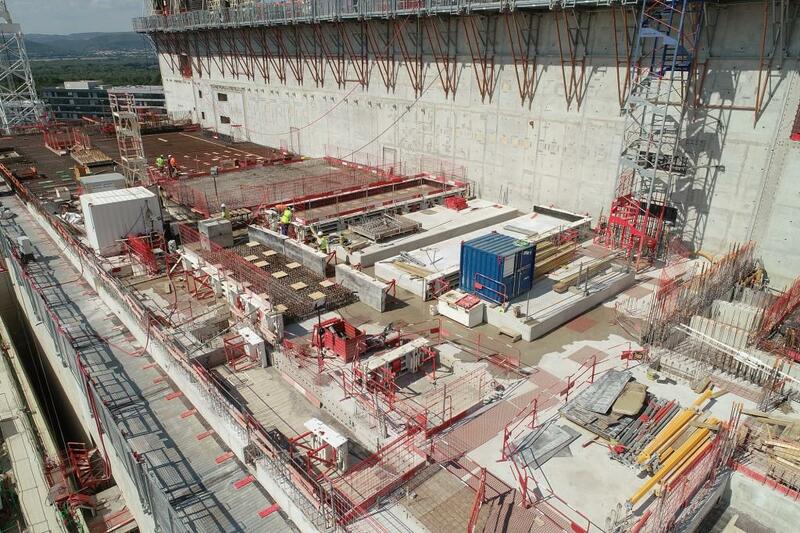 The pillars have all been poured for the Diagnostics Building (far end) and the external walls of the Tritium Building are in place (left). 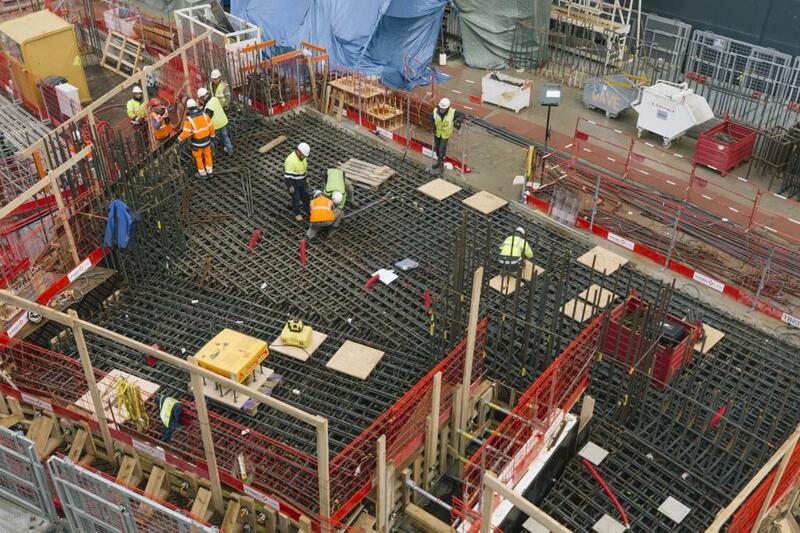 In the centre, preparatory work is underway in advance of concrete pouring for the bioshield. 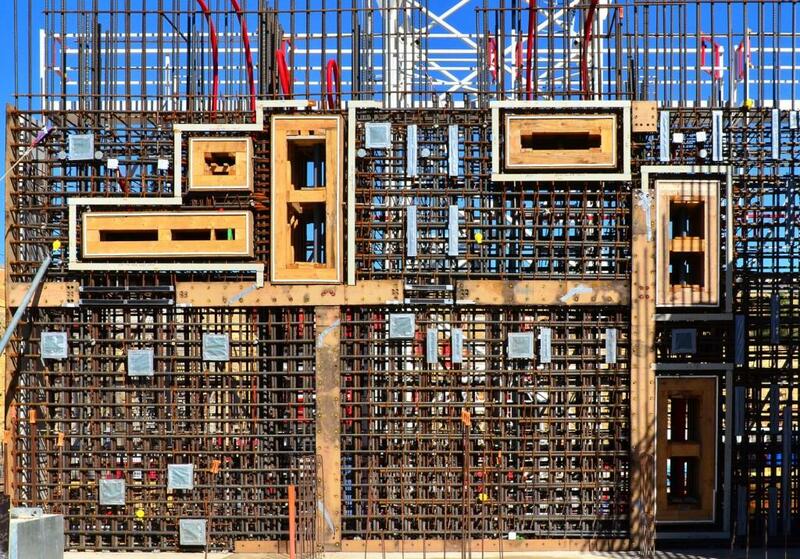 Vertical rebar marks out the internal walls of the Diagnostics Building and—in the centre—the bioshield. 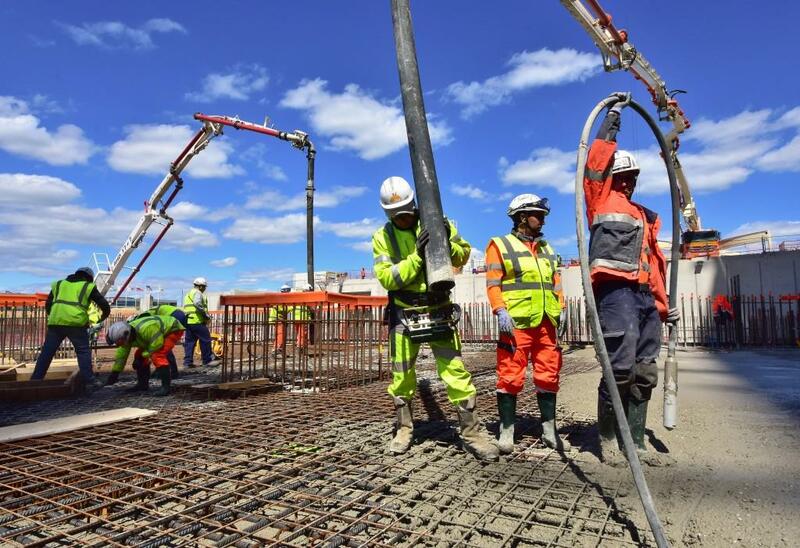 The last pillars of the Diagnostics Building were poured late April. 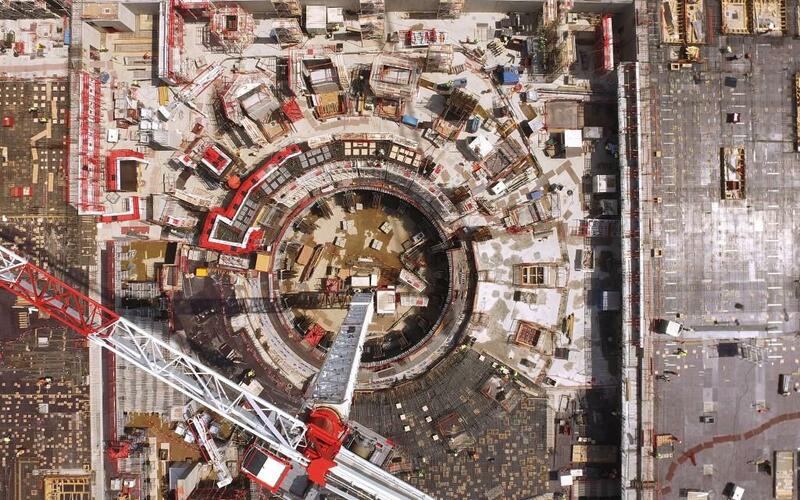 Beginning mid-2015, work will begin on the second Tokamak Complex level (B1). 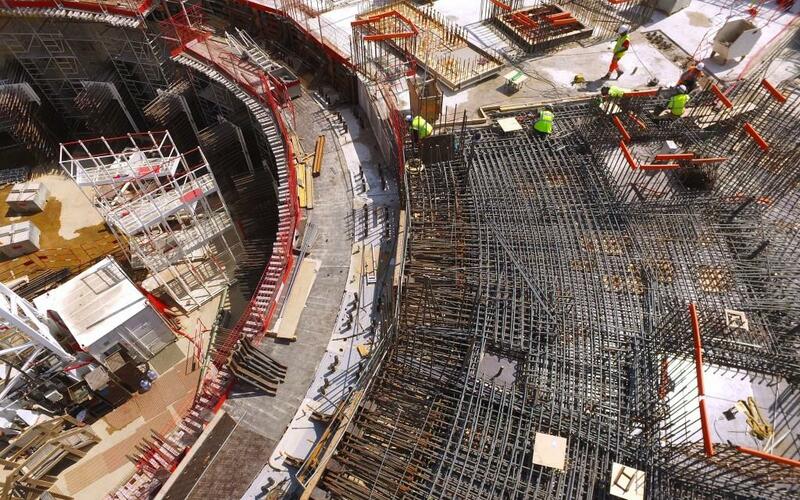 In April, Plexiglas formwork is installed along the circle of rebar that marks out the ITER bioshield. 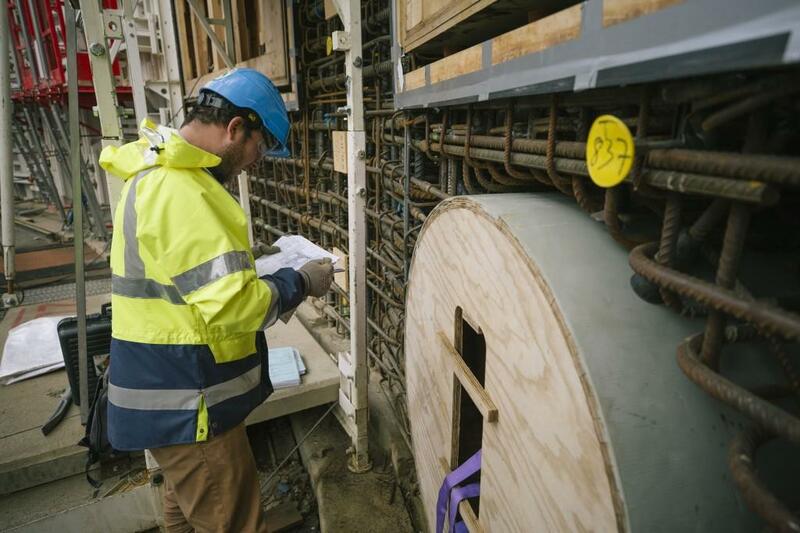 The transparent material allows workers to verify the position of the bioshield's future embedded plates and studs (drawn onto the formwork) during the installation of the reinforcement rods. 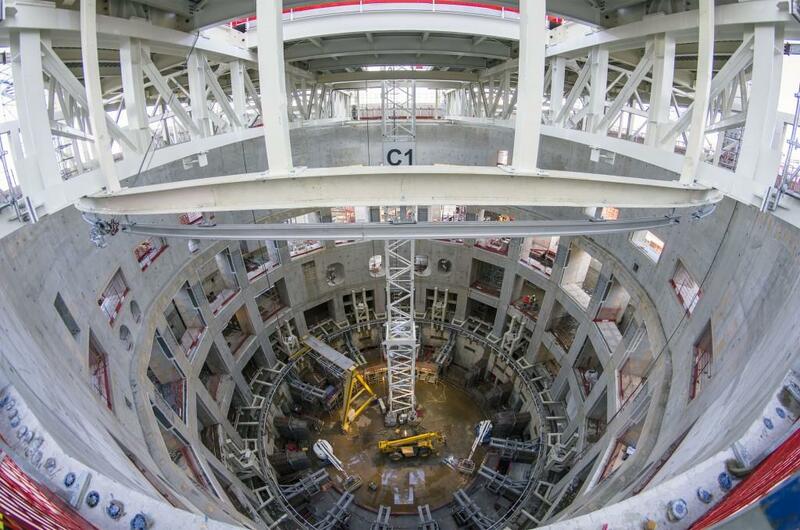 These graphic shapes mark the spots reserved for embedded plates in this section of Tokamak Complex wall. 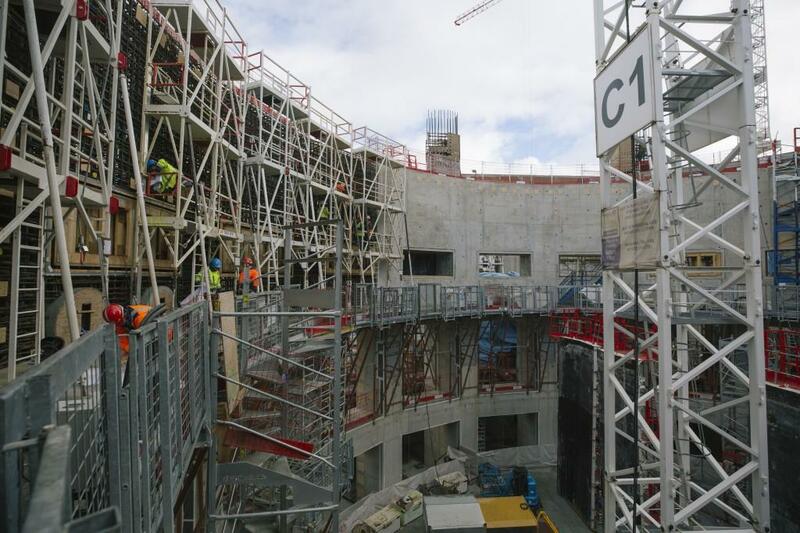 In the 80 x 120 metre Tokamak Pit, where scaffolding is up for the first basement-level walls, a few flurries in February complicated works. 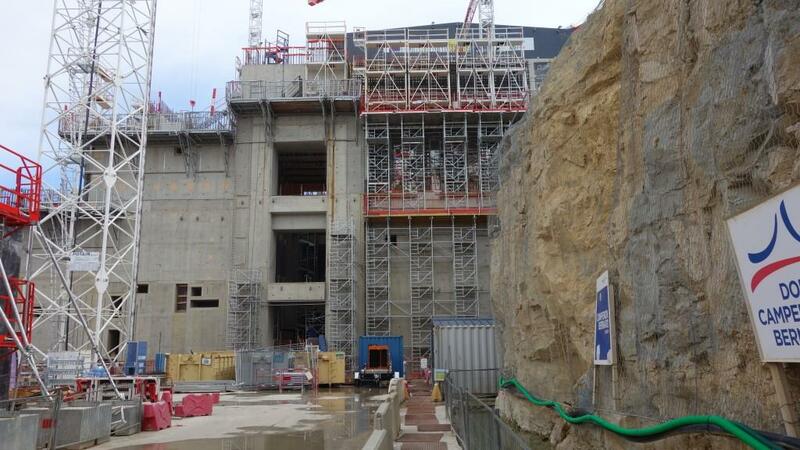 The first B2-level wall is now in place on the Diagnostic Building side of the basemat. 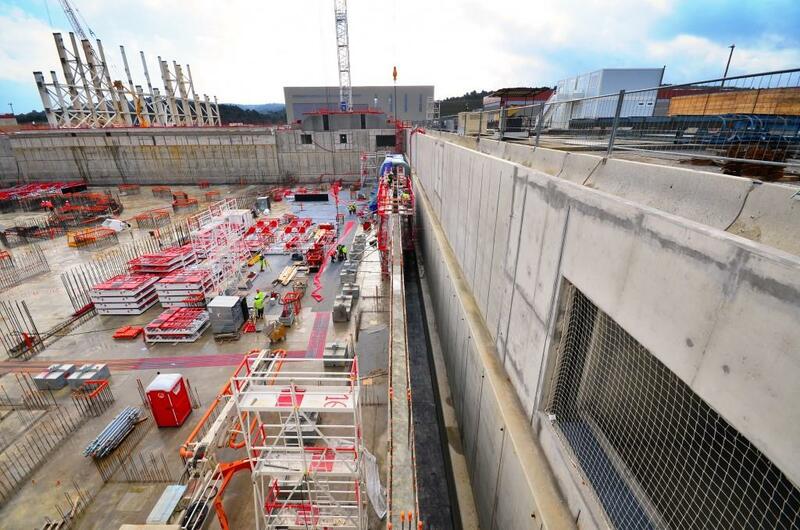 A gap of approximately 2 metres will separate the Tokamak Complex from the retaining walls; this gap will permit the Complex to move on its seismic pads as one block in the case of earthquake. 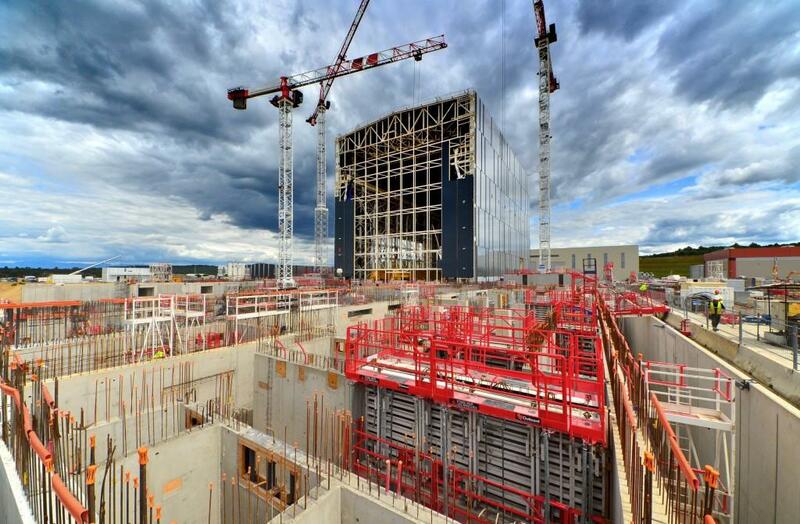 In January, workers complete the first wall of the Diagnostics Building, on the south side of the Tokamak Complex. 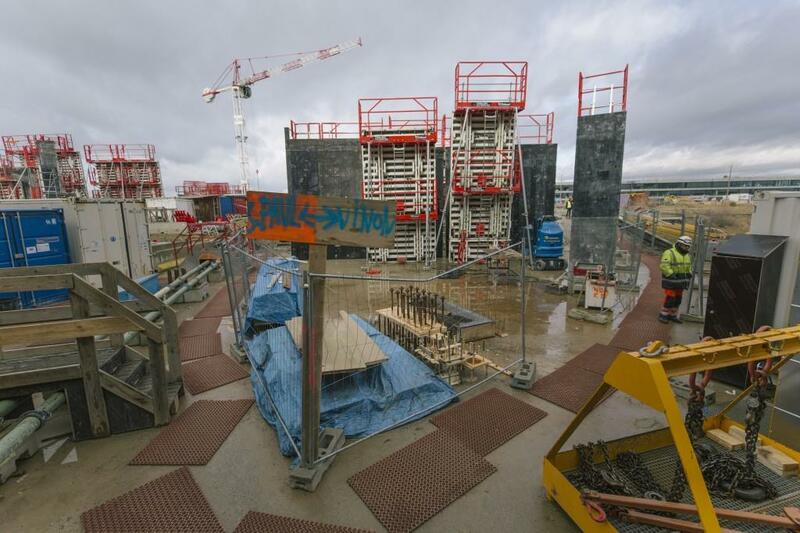 Three wall sections have been poured for the basement level walls of the Tokamak Complex. 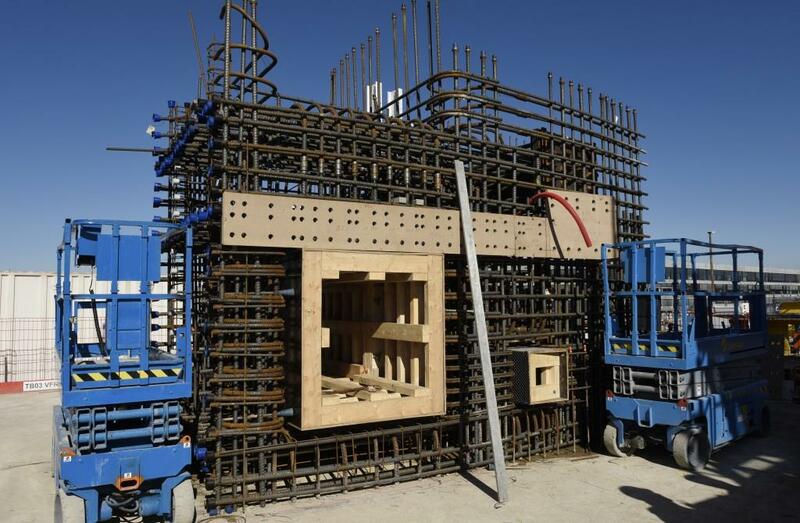 The formwork panels used to frame out the sections are assembled by fours before being transported by crane to the work area. 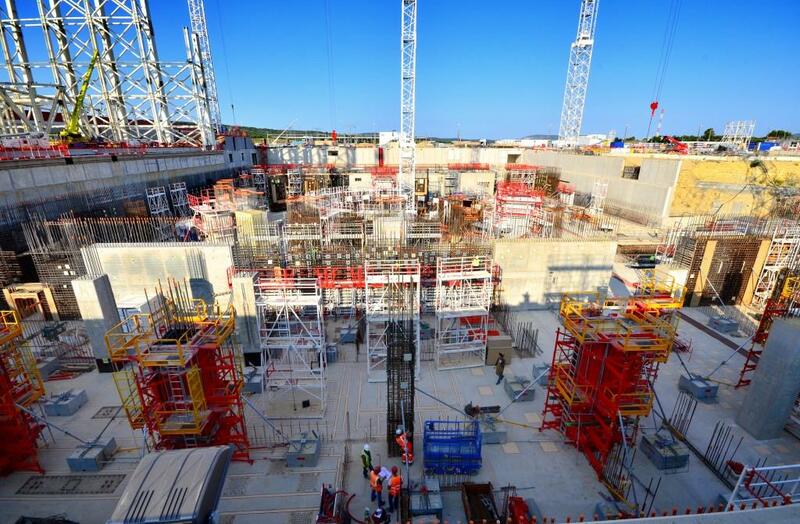 The Tokamak Complex will be a seven-storey structure: two basement levels and five storeys. 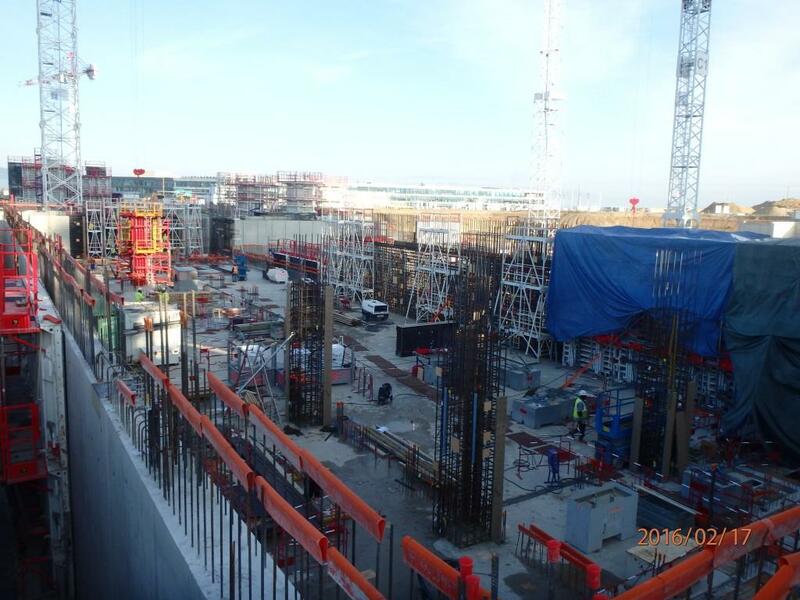 On 20 November 2014, pouring began for basement level B2. 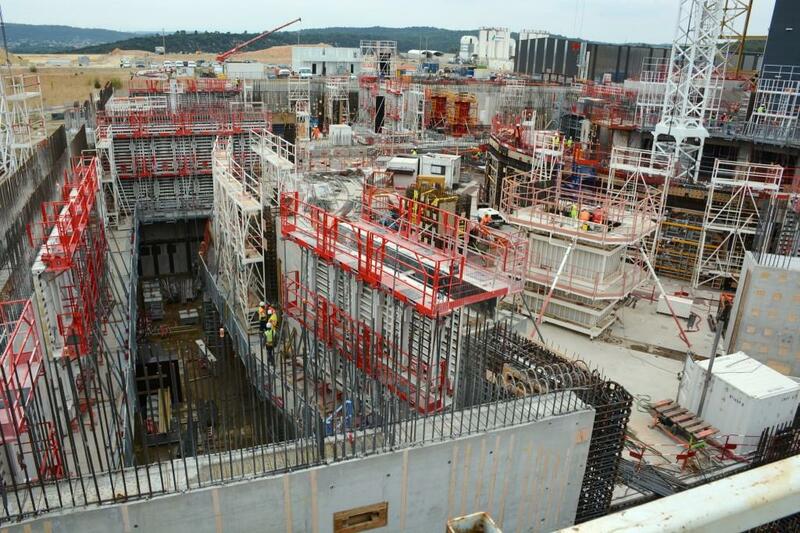 Work on the first level walls of the Tokamak Complex (basement level B2) is expected to last until mid-2015. 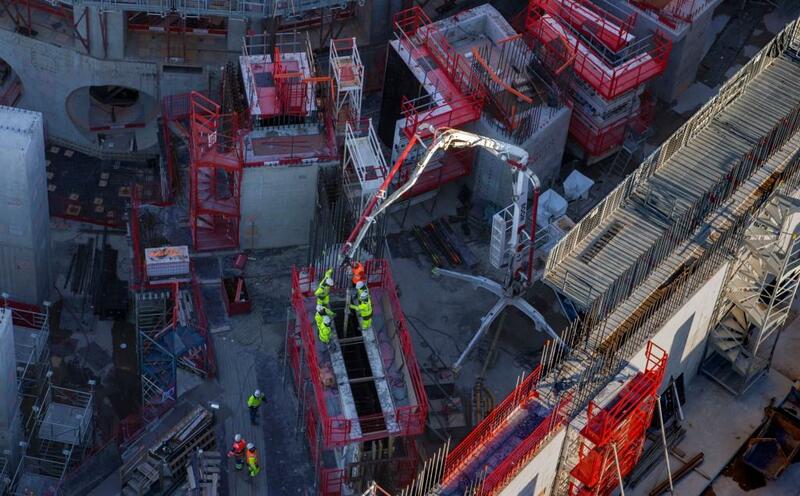 Concrete pouring for the first wall of the Diagnostics Building takes place on 20 November. 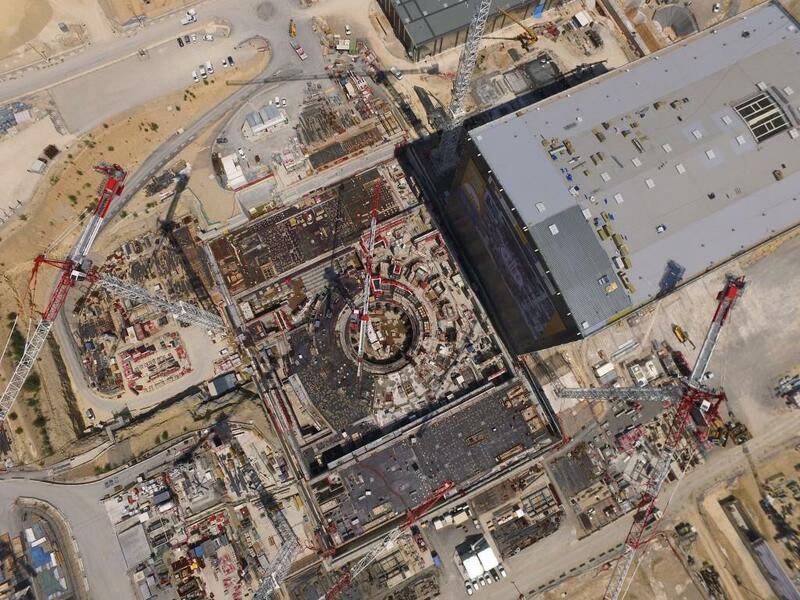 The ITER Tokamak Complex Seismic Pit: 120 metres long, 80 metres wide. 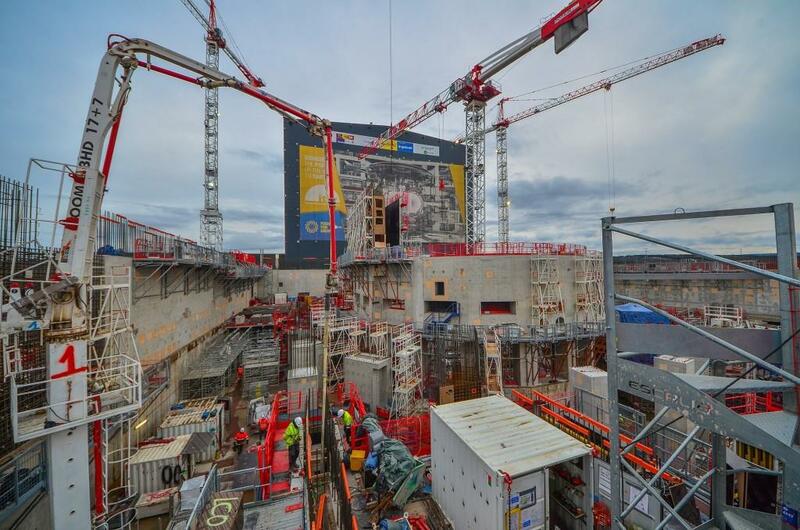 A third crane is now in place in the centre of the basemat. 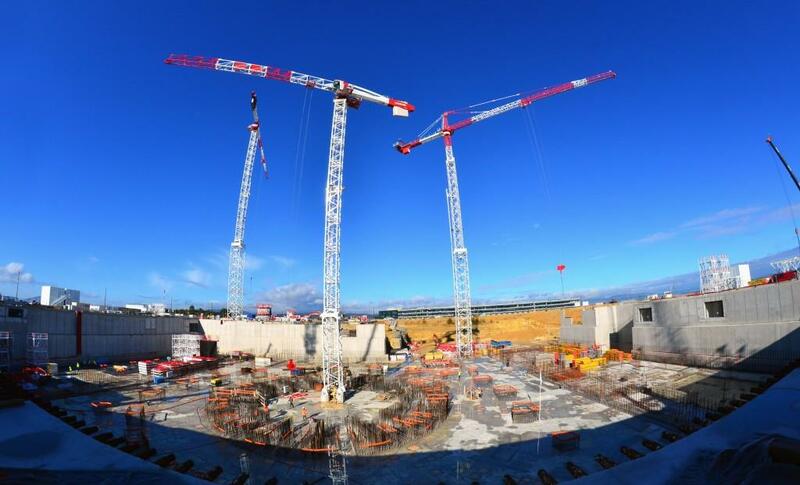 Five tall cranes—one on every corner and one in the centre—will soon be in place for the construction of the Tokamak Complex. 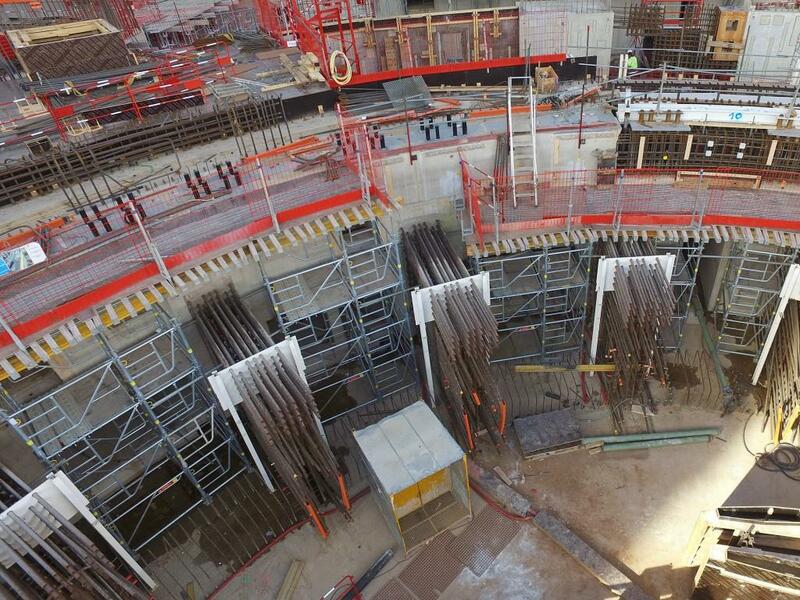 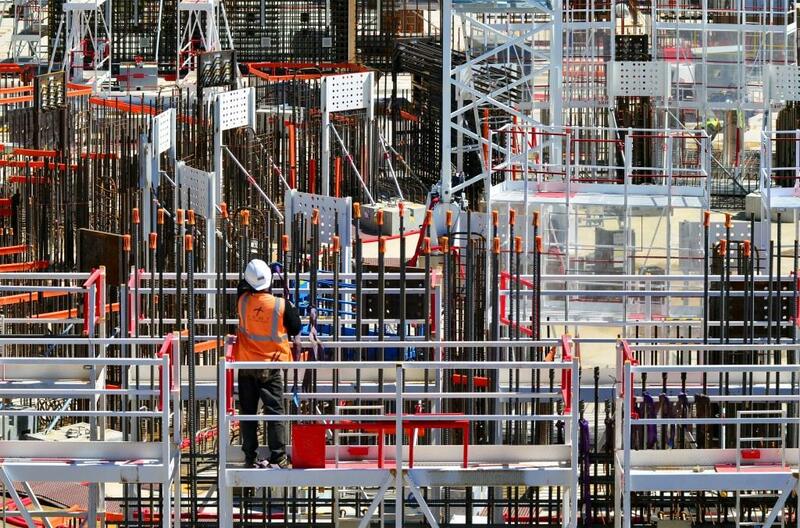 Scaffolding, reinforcement bars - everything is ready for the first Tokamak Complex walls to be poured in November. 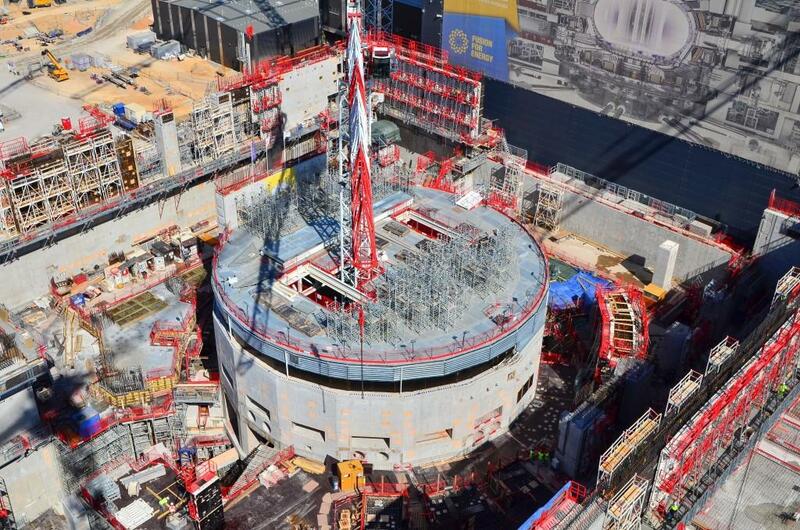 At its final height, the Tokamak Complex will be nearly as tall as the crane at left—60 metres above platform level. 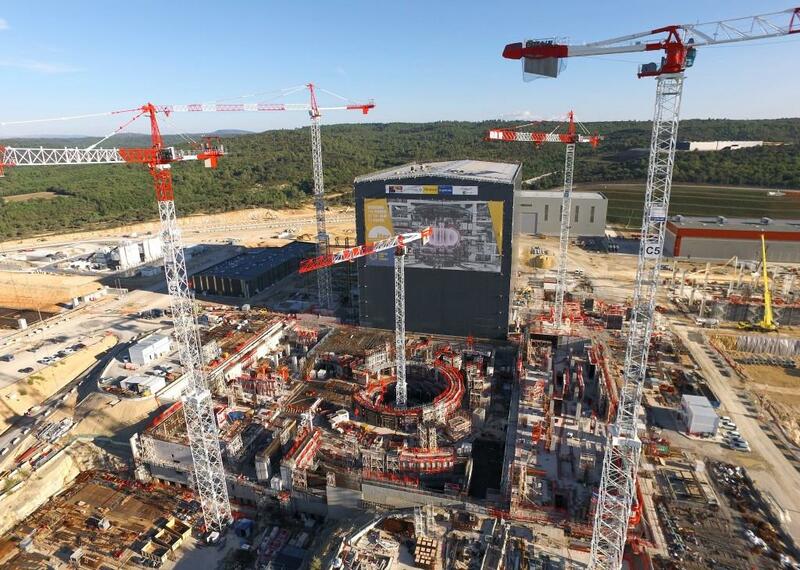 Three of the five cranes planned for Tokamak Complex construction activities will rise over 75 metres (76 m, 80 m and 82 m) and have lifting capacities of 6-8 tons at the tip of their 55- to 65-metre-long booms. 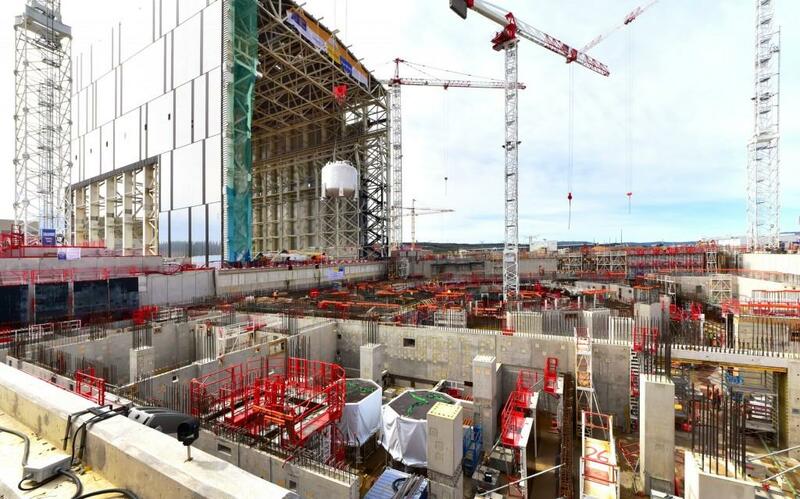 In one corner of the Seismic Pit, a tower crane is going up to prepare for the next phase of work: the pouring of the B2 slab that will act as a floor to the three buildings of the Tokamak Complex. 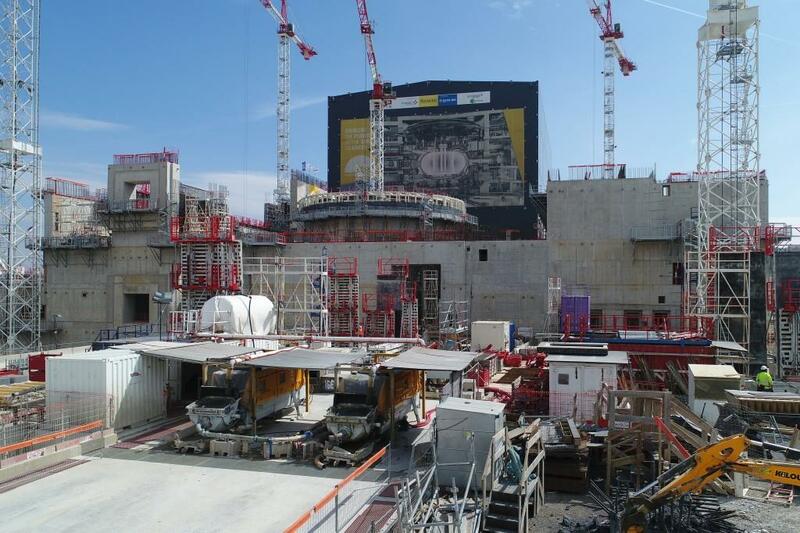 The 23,000-tonne ITER Tokamak will have a seven-storey home. 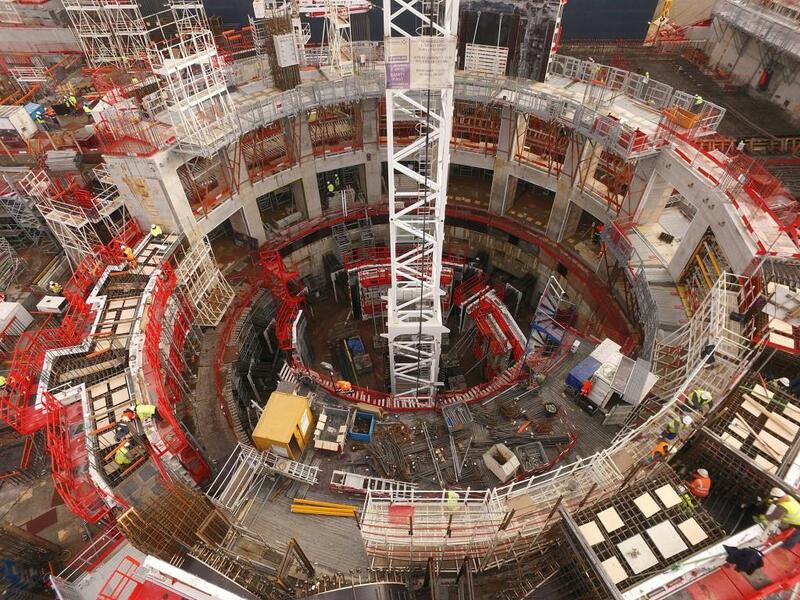 Machine assembly will begin two levels underground. 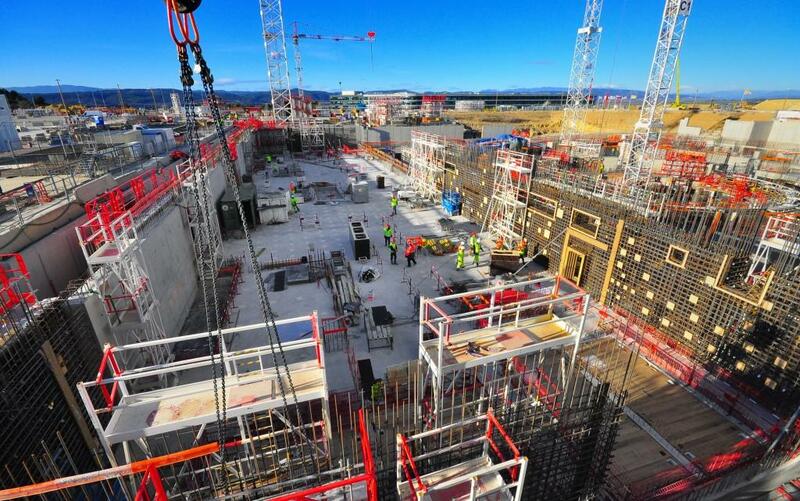 Seven storeys tall—including two basement levels—the ITER Tokamak Complex is in fact three buildings: the Tokamak Building (centre), the Tritium Building (left) and the Diagnostics Building (right). 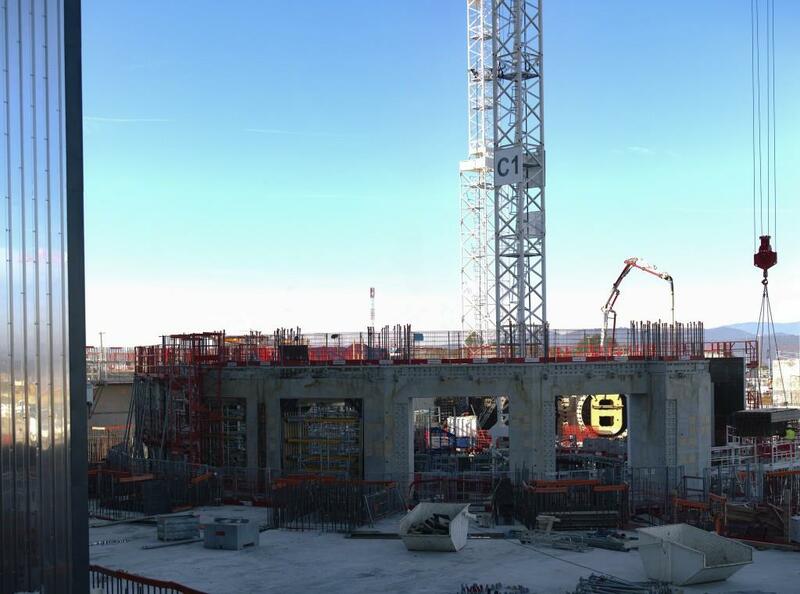 Construction began in October 2014. 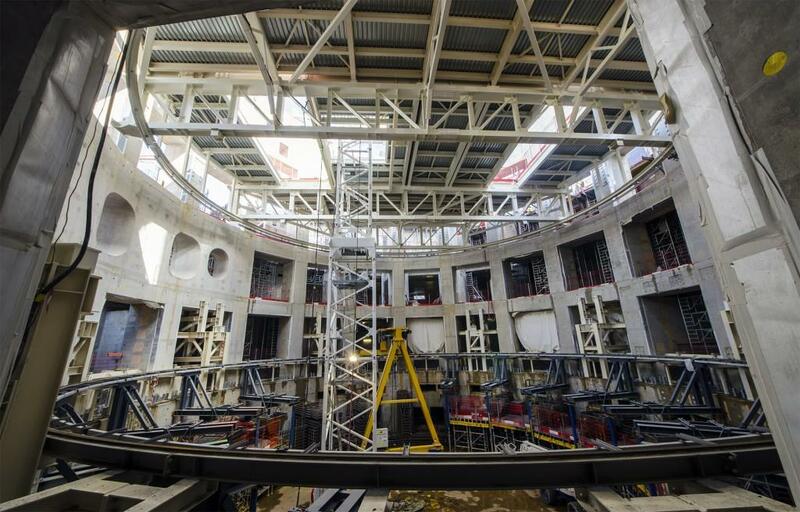 The basement levels of the Tokamak assembly area will soon be covered over by a temporary lid, installed to protect the workers involved in the construction of the cryostat support crown and radial walls. 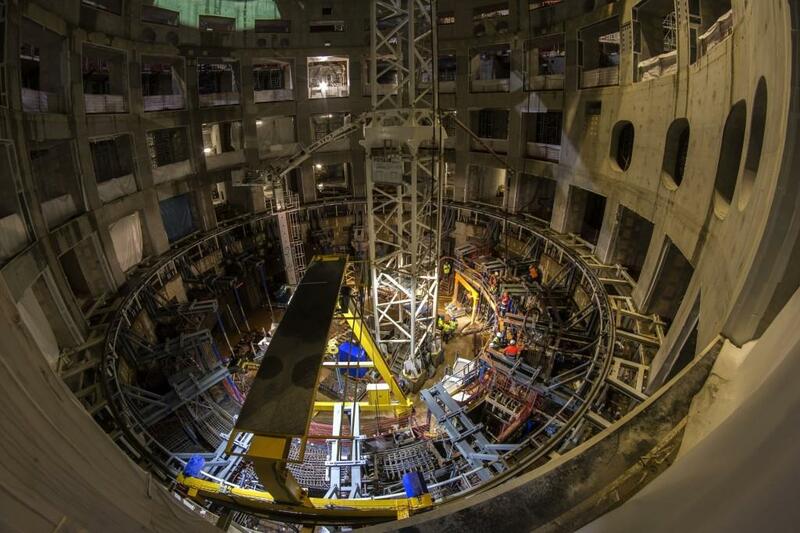 The first quarter of the cryostat crown is poured during the night on 22 May. 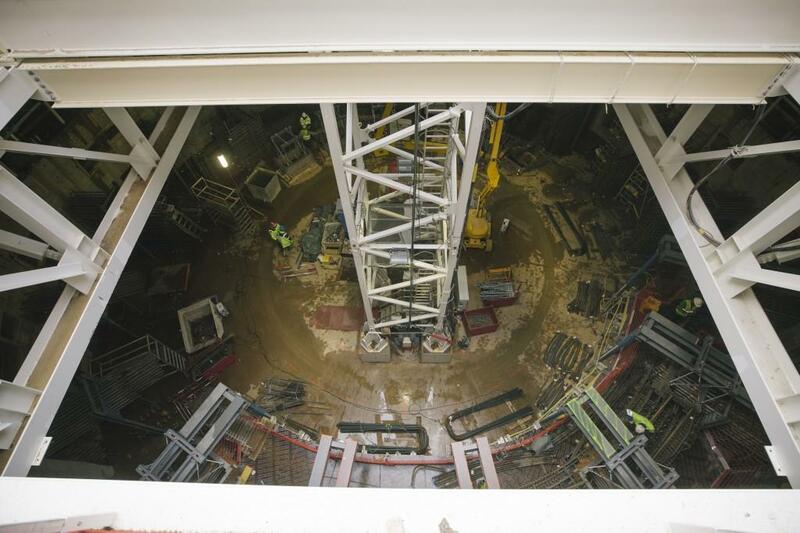 Three other pours will be necessary to complete the concrete ring that will support the cryostat from below. 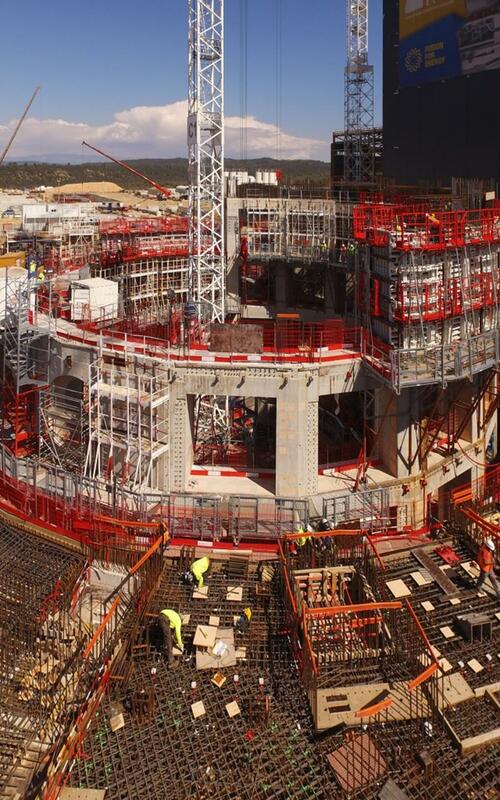 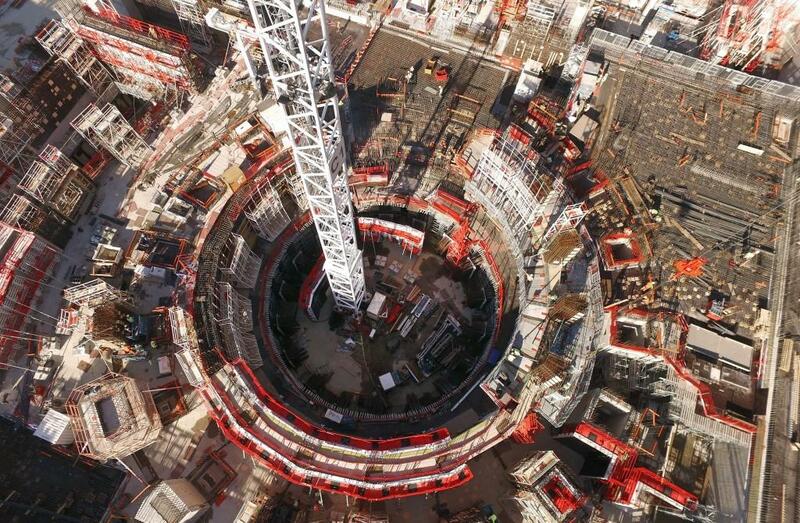 The construction of the seven-storey, 400,000-tonne Tokamak Complex is underway. 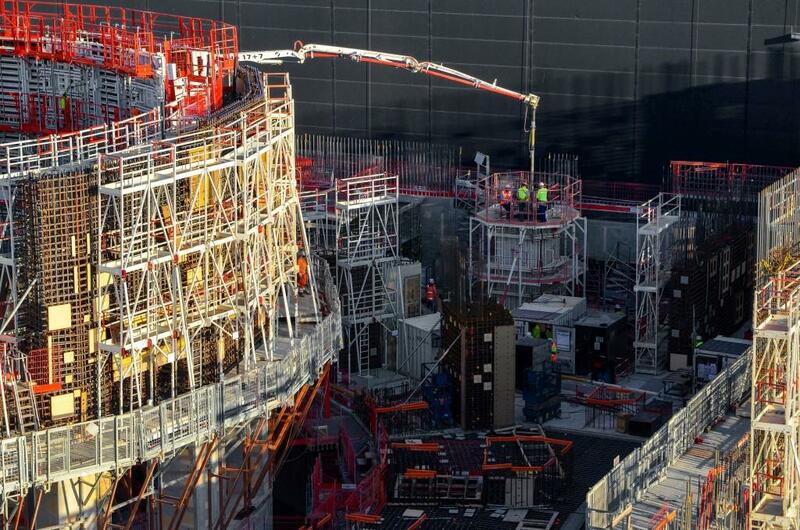 In the centre (curved) is the six-storey ITER bioshield that will completely surround the machine. 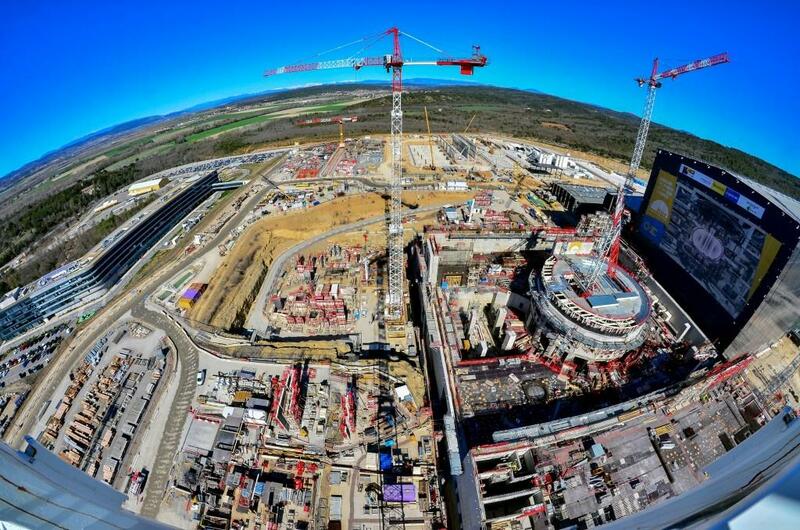 At the heart of the ITER scientific installation is the Tokamak Complex, a 400,000-tonne edifice composed of the Tokamak, Diagnostic and Tritium buildings. 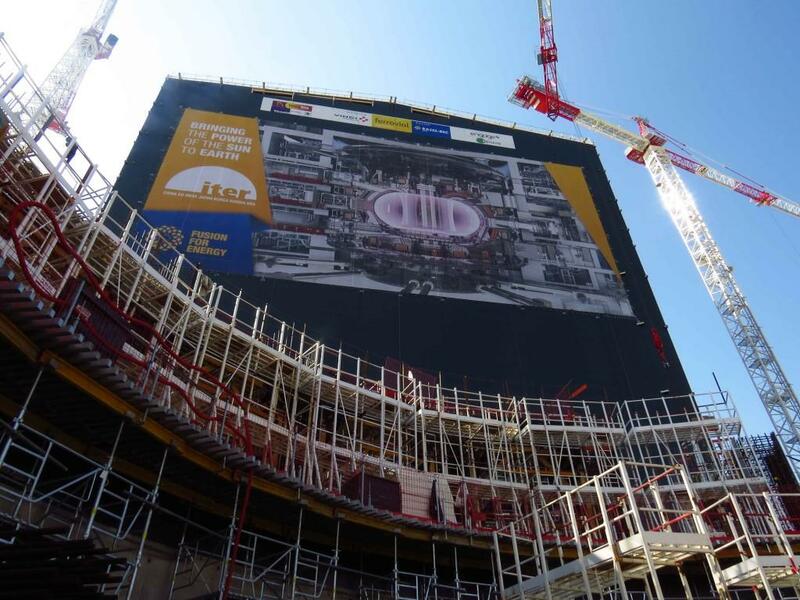 Eighty metres tall (including basement levels), 120 metres long and 80 metres wide, the Tokamak Complex will dominate the ITER platform when it is completed. 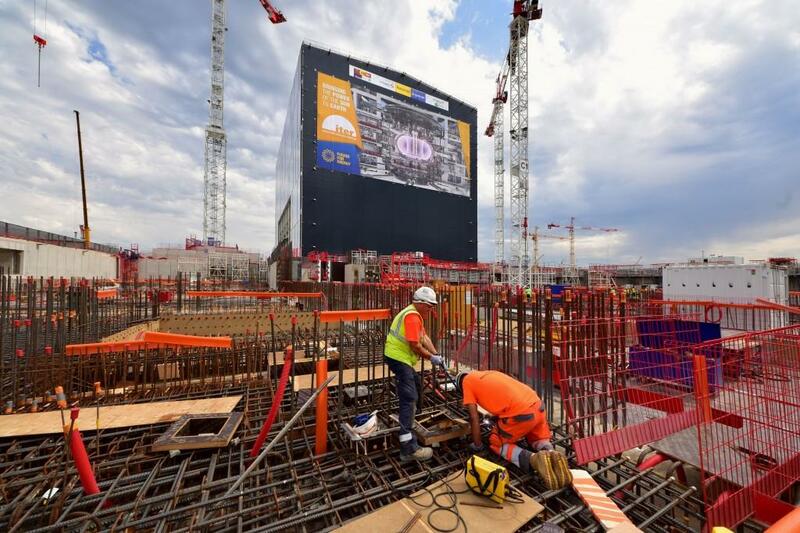 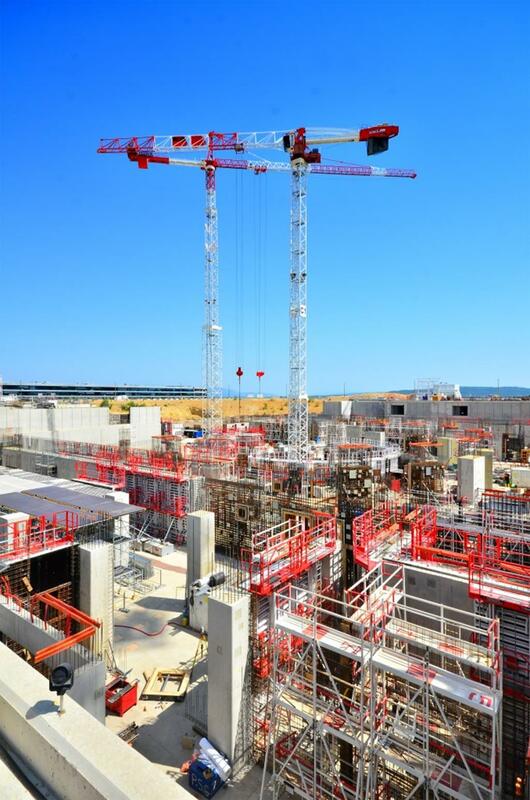 The seven-storey structure will house not only the ITER Tokamak, but also more than 30 different plant systems that are necessary for the machine's operation. 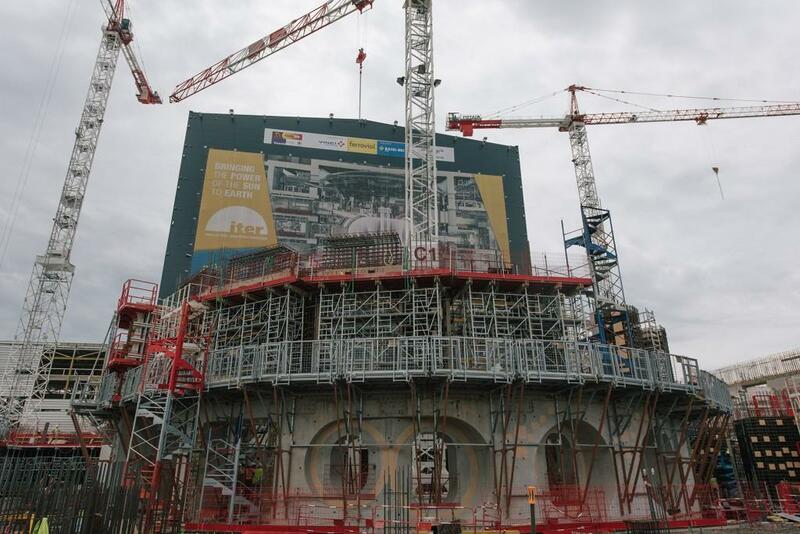 The Tokamak Complex is a nuclear-rated structure of reinforced concrete, supported on aseismic isolators. 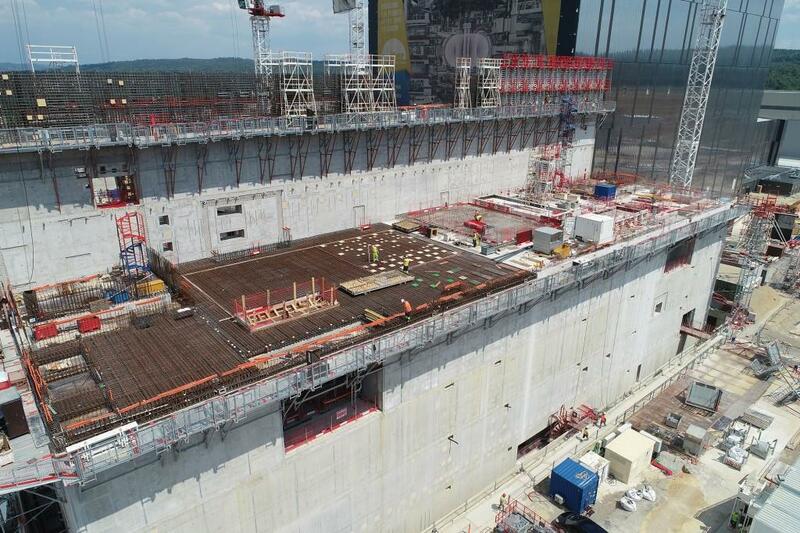 The roof is 60 metres above ground level; the basement floor is approximately 11 metres below. 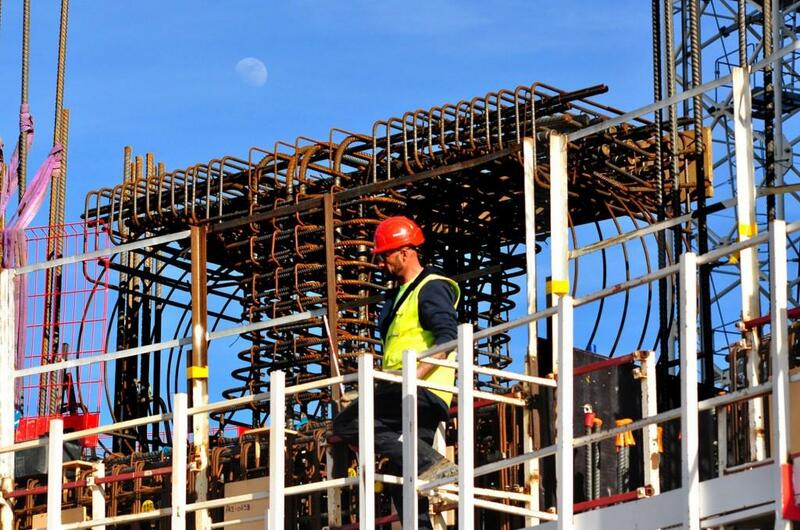 The mid-plane of the machine has been located approximately at the level of the platform. 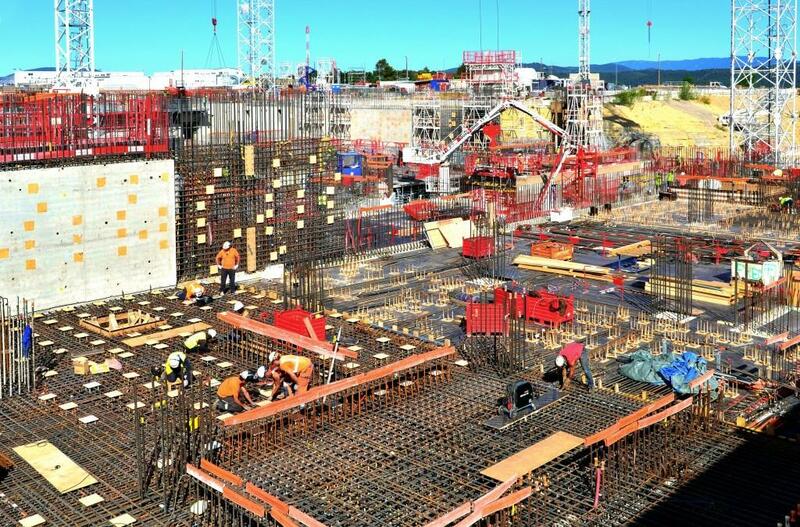 Construction will require 16,000 tonnes of rebar, 150,000 m³ of concrete, and 7,500 tonnes of steel for the building structures. 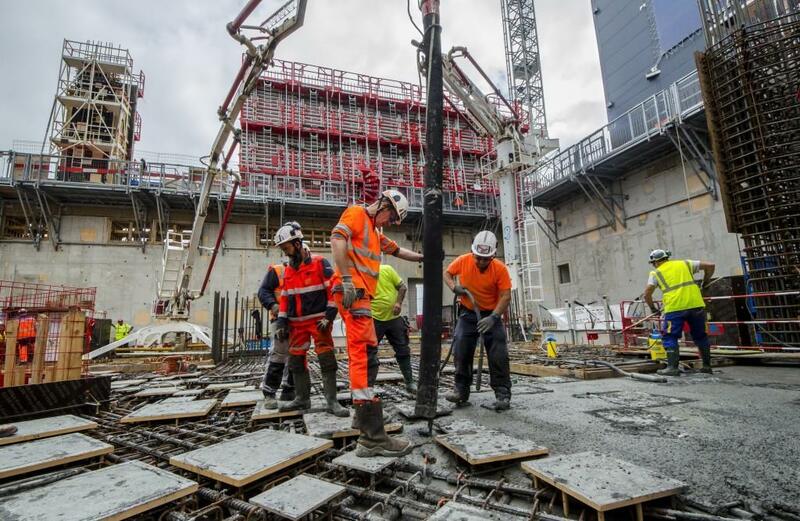 The European Domestic Agency awarded the civil works contract in December 2012 to the French-Spanish consortium VFR (comprising French companies VINCI Construction Grands Projets, Razel-Bec, Dodin Campenon Bernard, Campenon Bernard Sud-Est, GTM Sud and Chantiers Modernes Sud, and the Spanish firm Ferrovial Agroman). 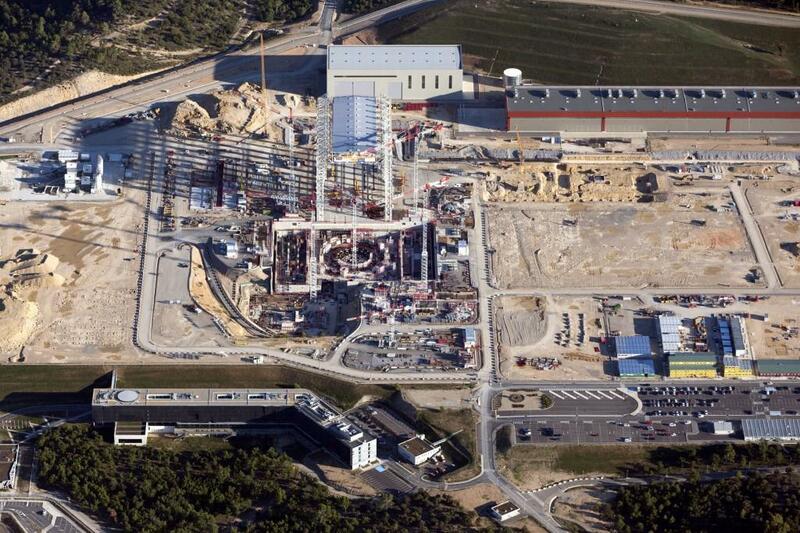 The construction contract signed for the Tokamak Complex also includes the construction of the ITER Assembly Building; the radio frequency heating building; areas for heating, ventilation and air conditioning; a cleaning facility and site services building; the cryoplant compressor and coldbox building; the control buildings; the fast discharge and switching network resistor building; and three bridges. 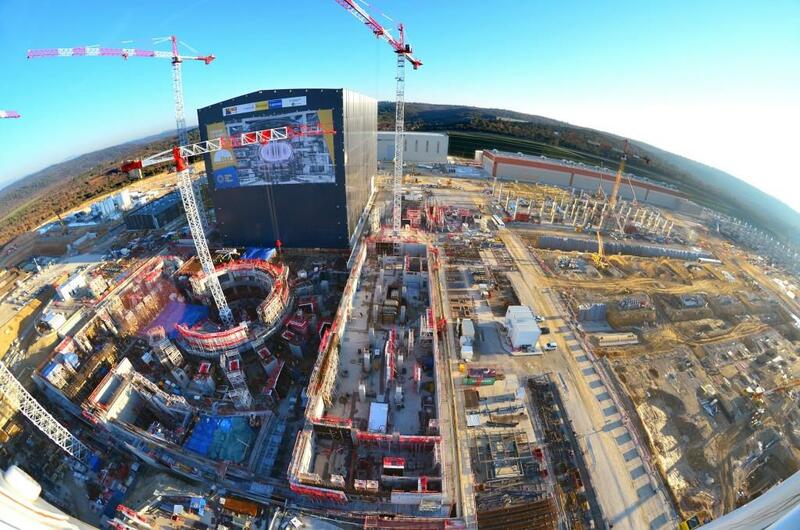 Following the completion of Tokamak Complex foundations in August 2014, a 1.5-metre-thick, 9,300 m² basemat is now in place and work on the walls and floors is underway. 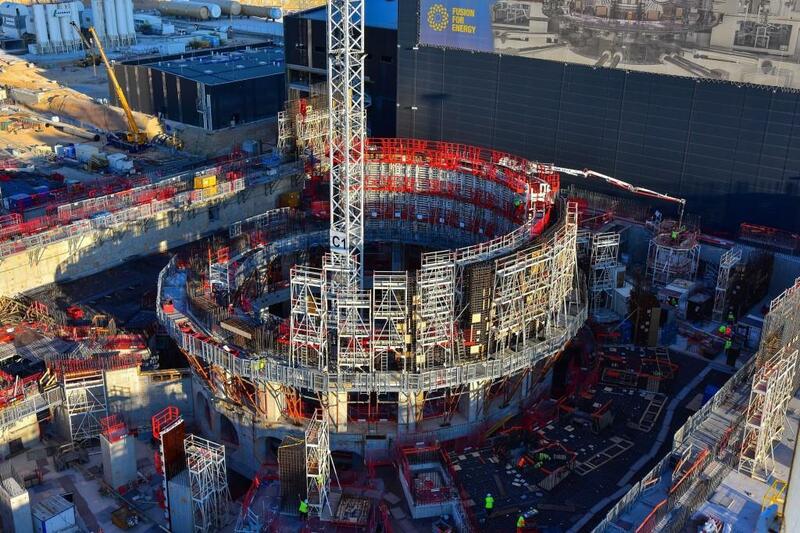 The basement levels have been filled in and the bioshield—a circular structure in the centre of the Tokamak Building that will completely surround the machine—has been completed. 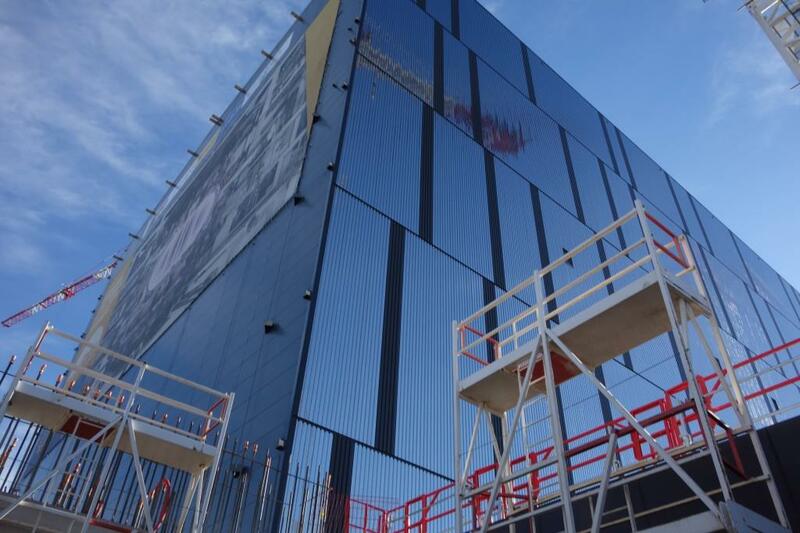 Six-storeys tall and pierced all around by openings for systems and equipment, the bioshield is 3.2 metres thick in its most solid areas. 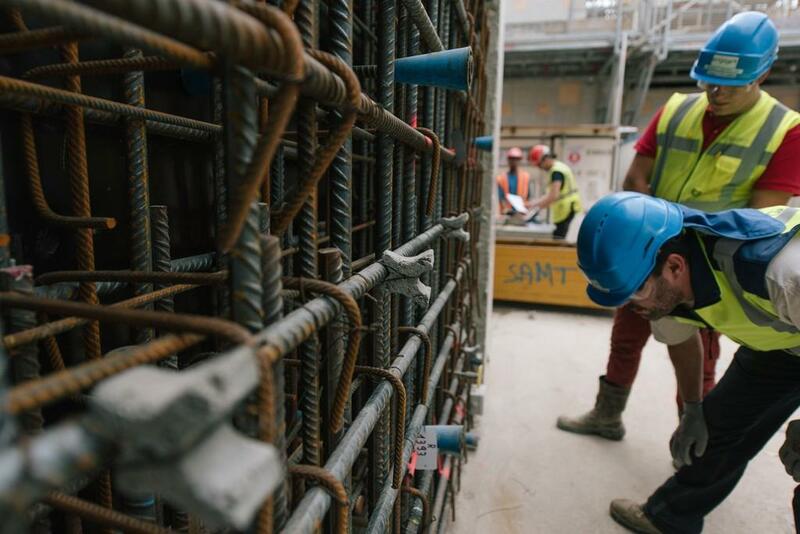 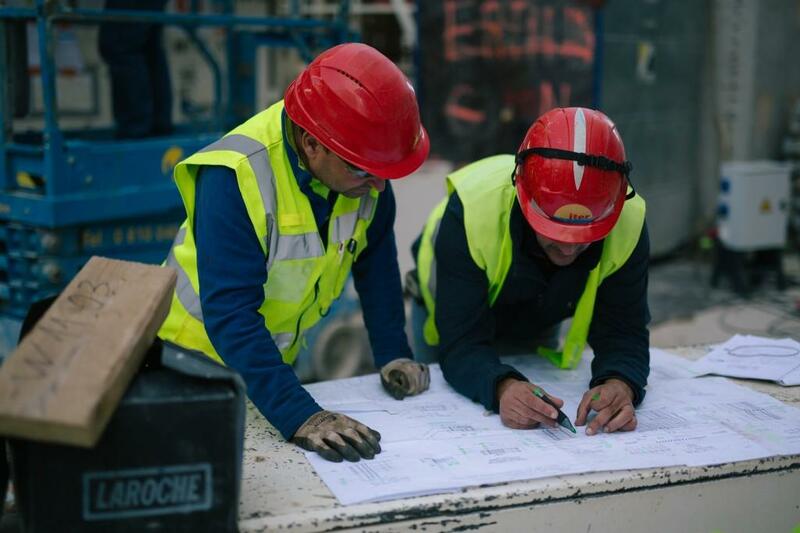 As construction proceeds, tens of thousands of embedded plates will be cast into the concrete of the floors, walls and ceilings of the different levels of the building and the bioshield to provide anchoring for the systems and equipment. 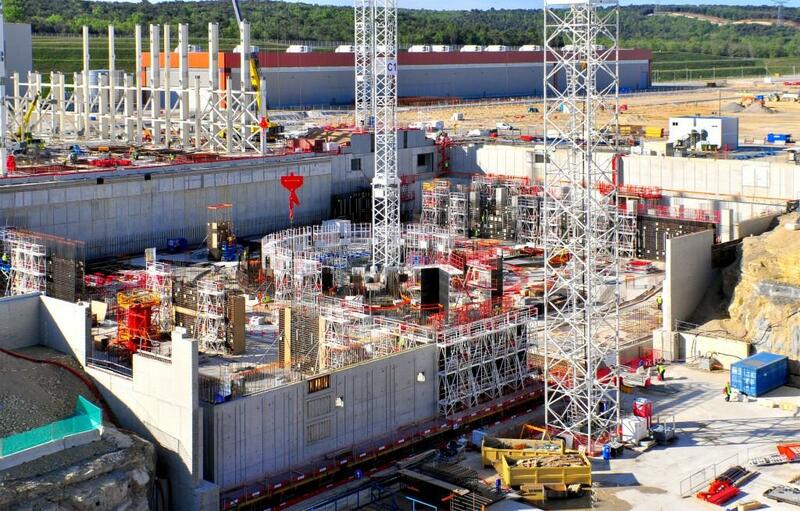 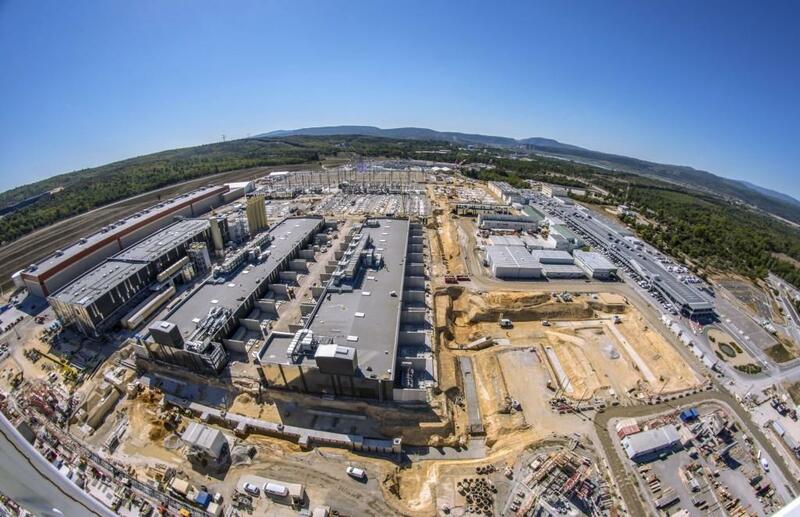 A second building consortium—comprising Cofely Axima, Cofely Ineo and Cofely Endel (part of the GDF Suez Group) and the M +W Group GmbH—has been awarded the contract for building services, covering the design, supply, installation and commissioning of the mechanical and electrical equipment for the Tokamak Complex and surrounding buildings (heating and ventilation, fire protection, power supply, lighting, handling equipment ...). 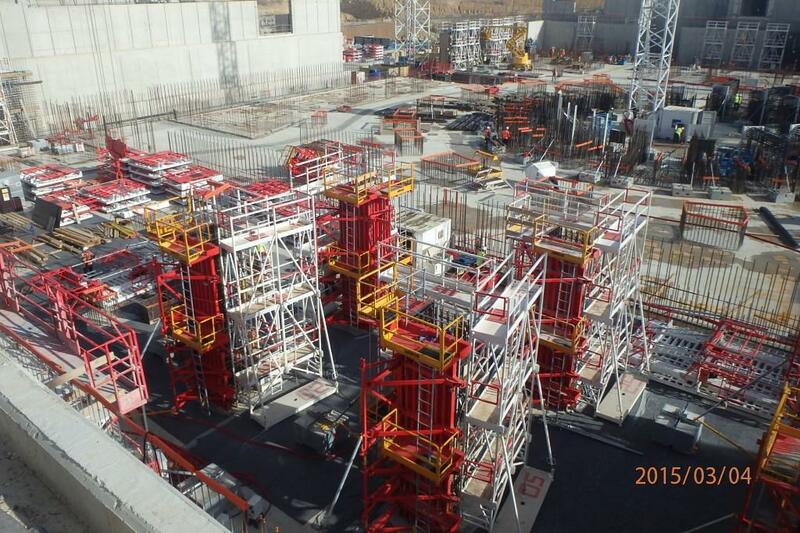 These works have begun in completed areas.